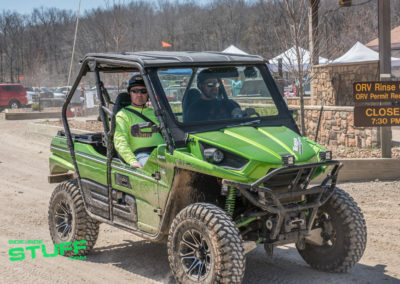 As Midwesterners, it seems like traveling far and long is the only way to attend a major UTV event. At first glance, most events seem to take place on either the west coast, east coast as well as in the southern states. 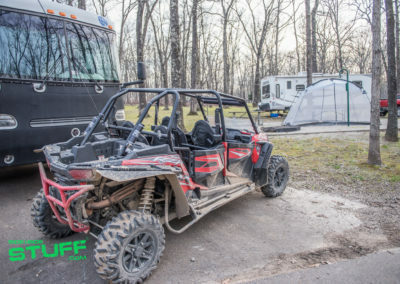 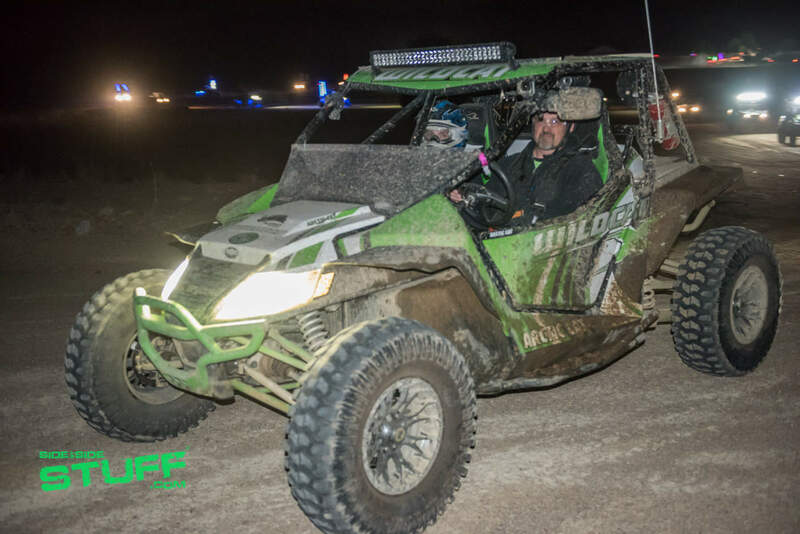 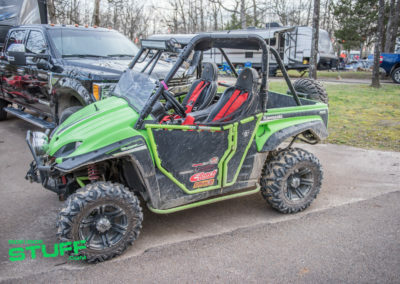 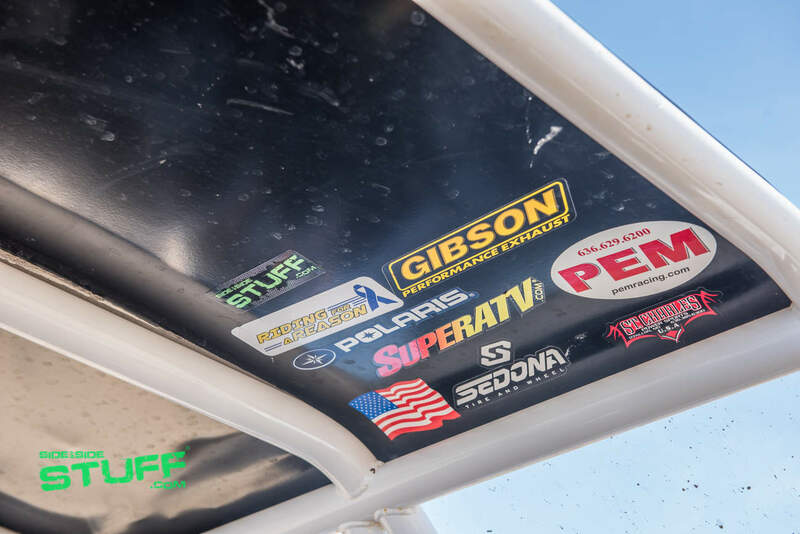 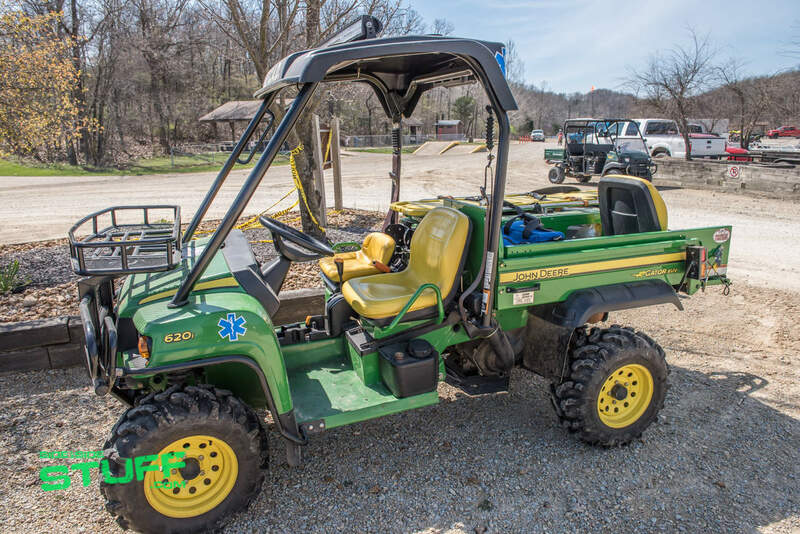 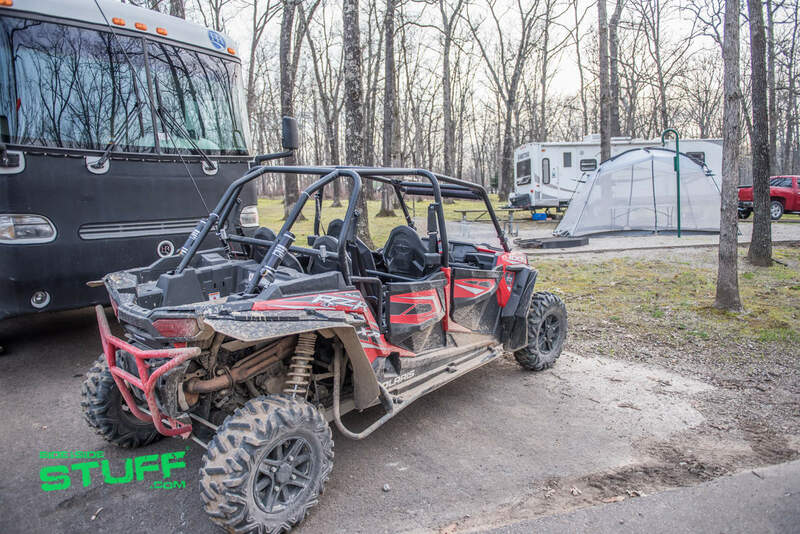 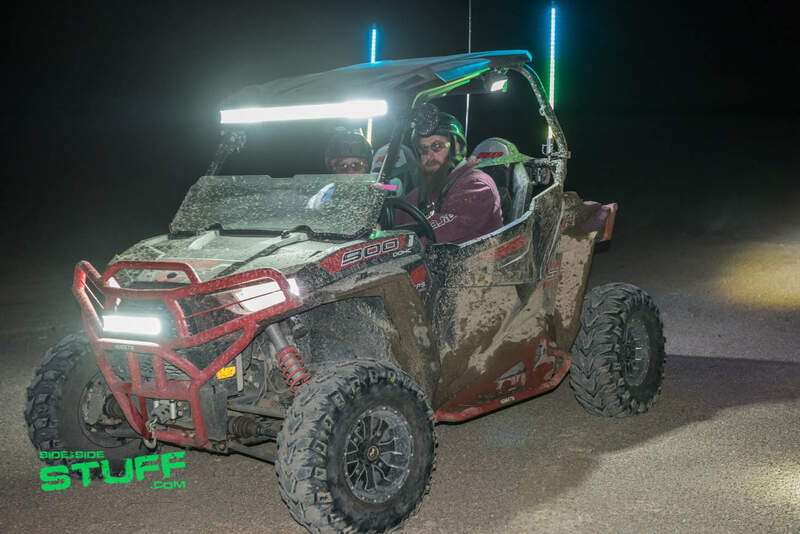 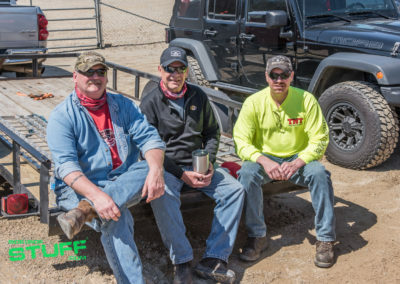 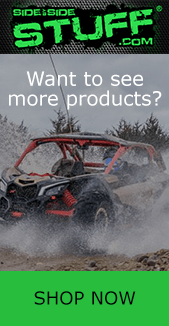 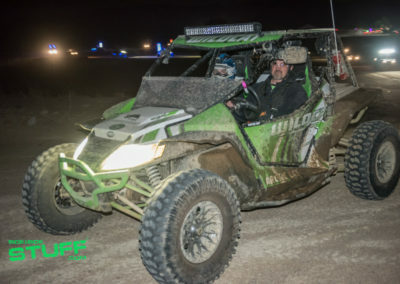 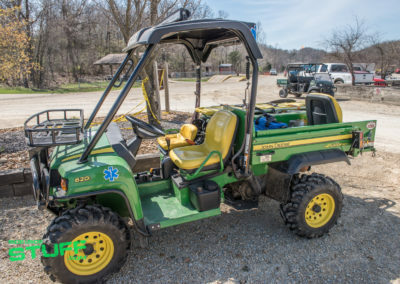 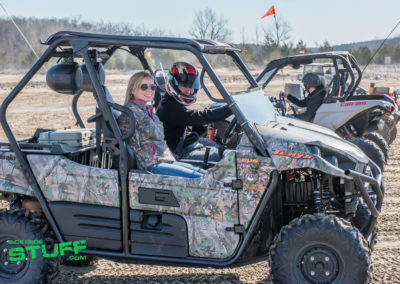 While some of us are capable of making long distance trips ( when we’re up for it ), many of us miss out completely as it is not practical for everyone to road trip to a far off UTV destination; in fact is seems like most Midwesterners typically ride close to home. 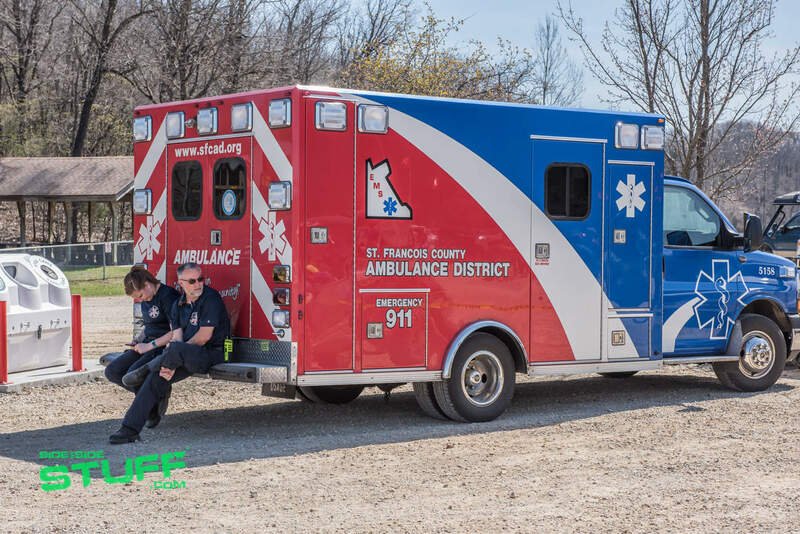 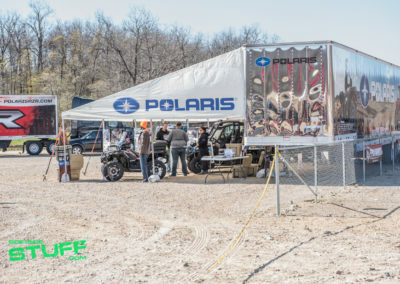 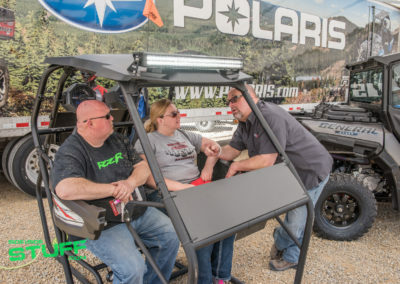 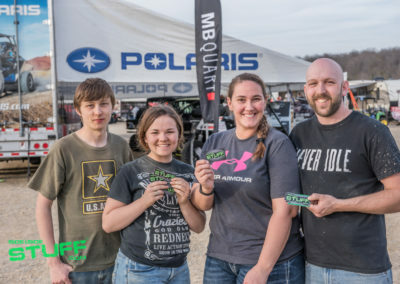 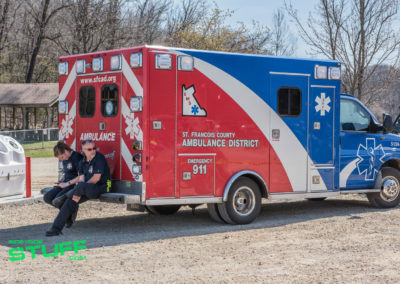 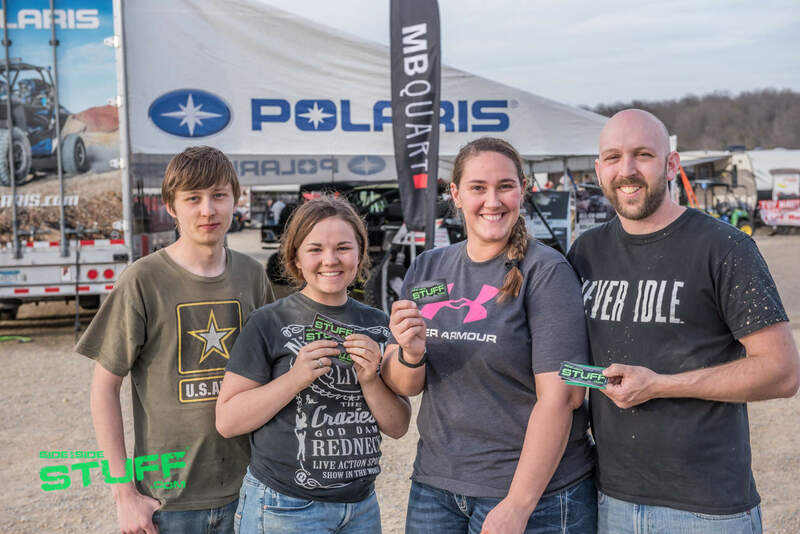 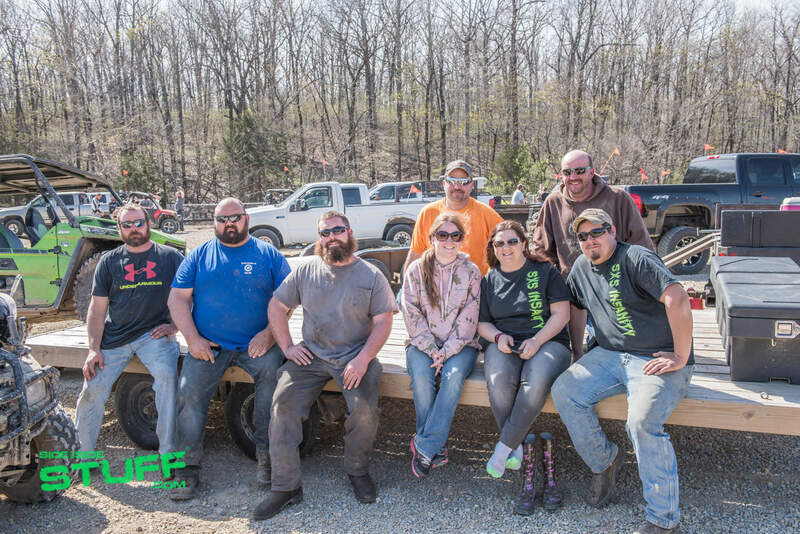 When we heard that Polaris was attending an event in Missouri we knew we had to check it out. 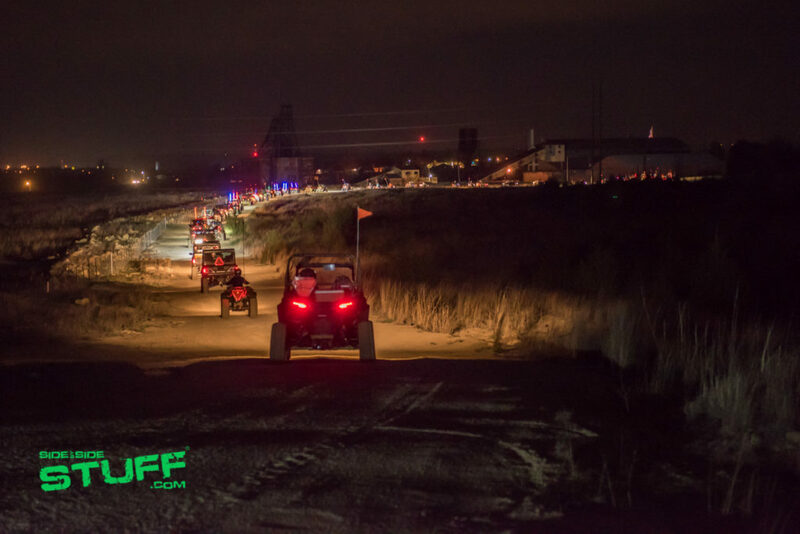 The 2017 Rally at the Mines was truly a fantastic event. 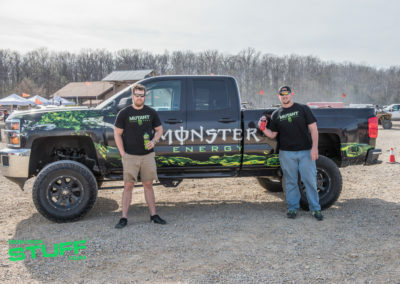 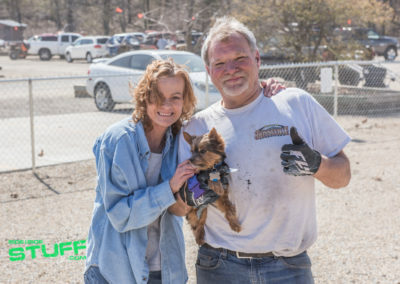 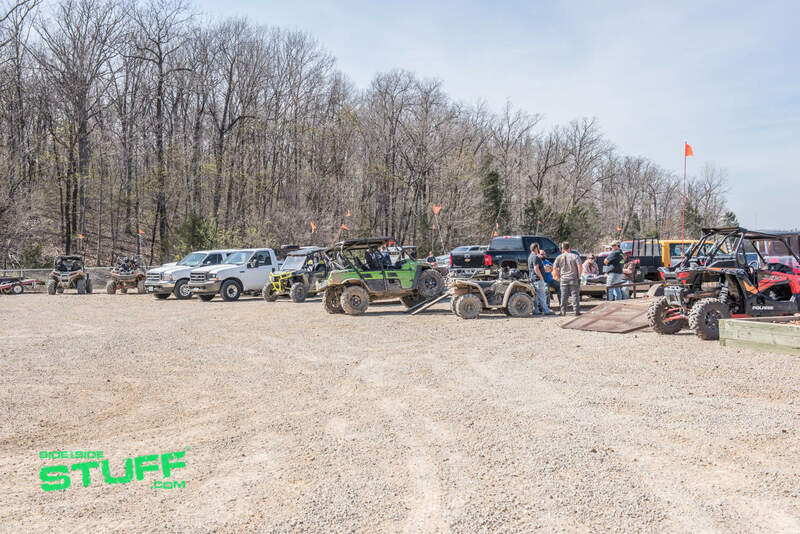 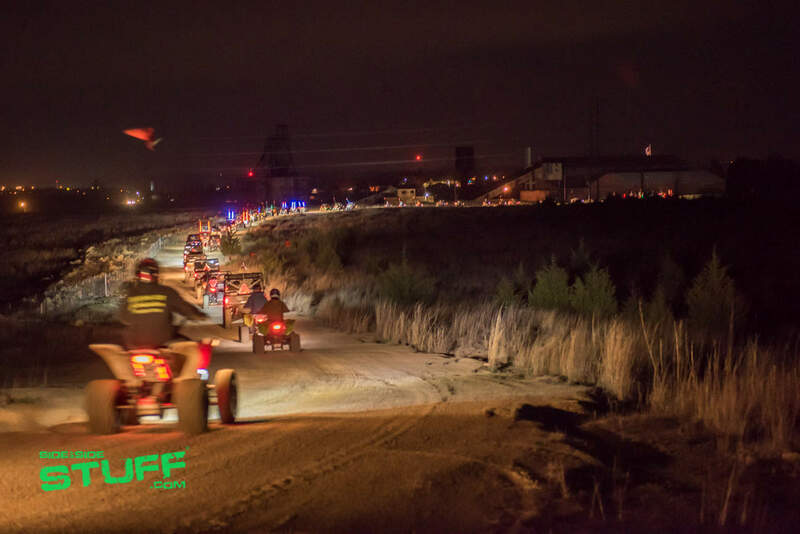 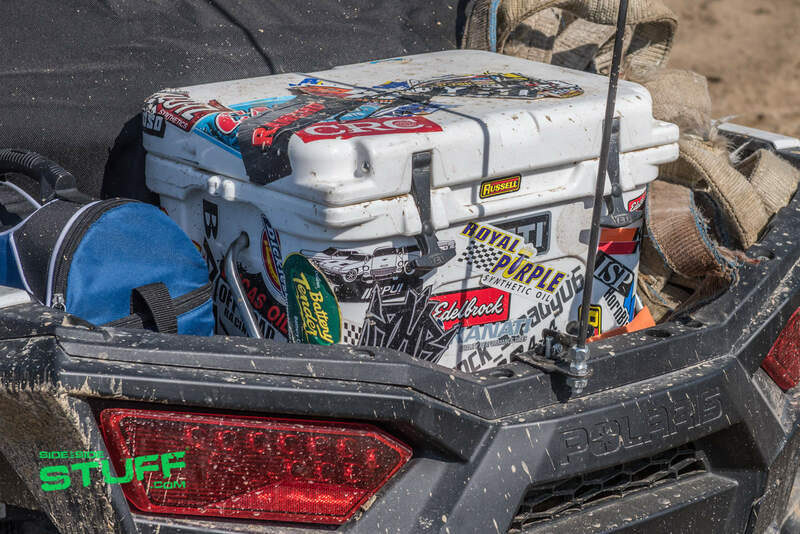 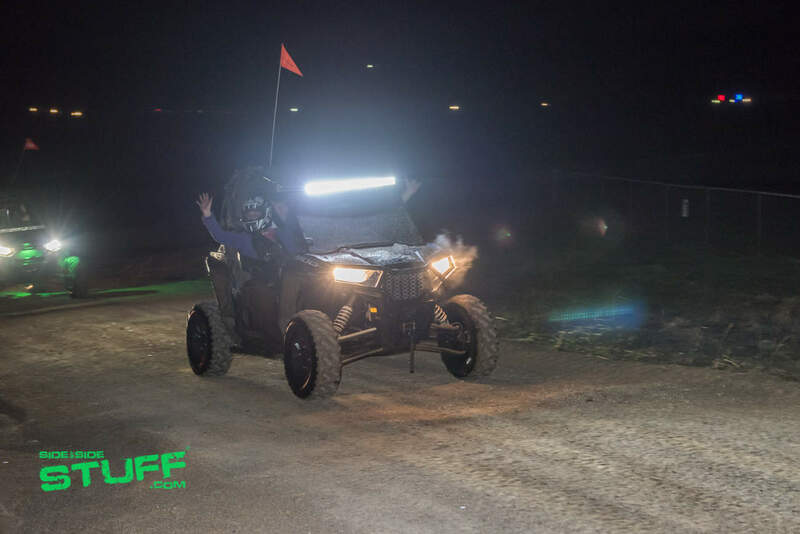 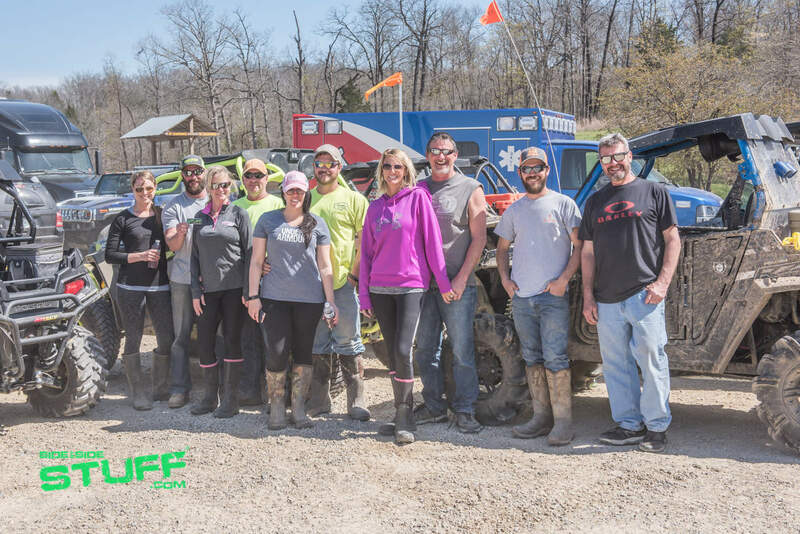 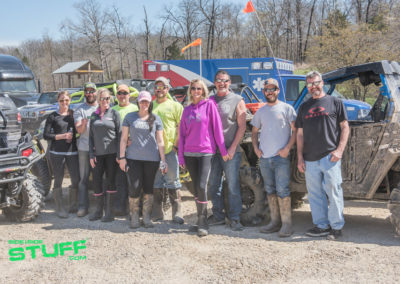 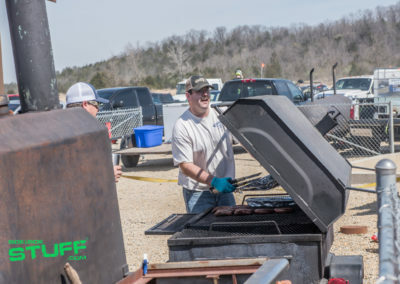 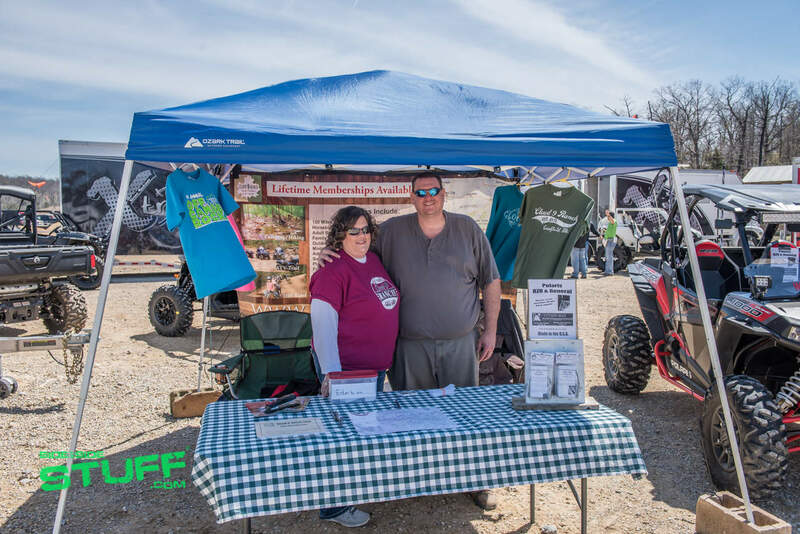 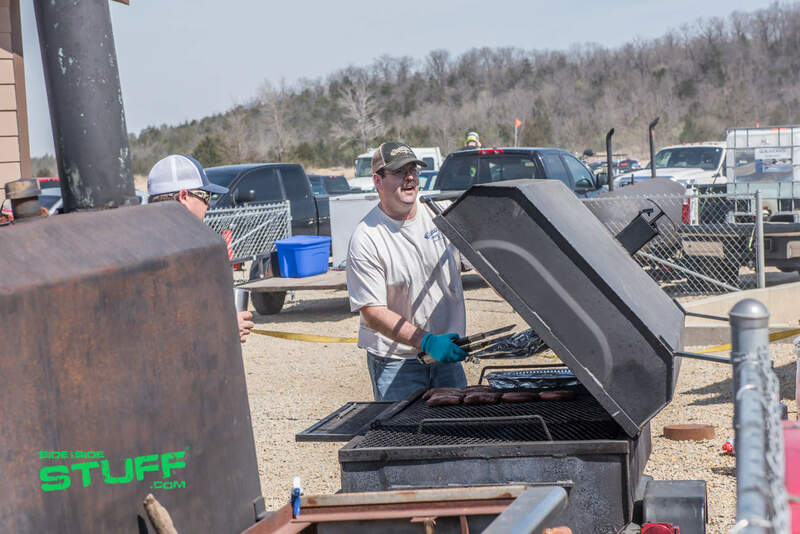 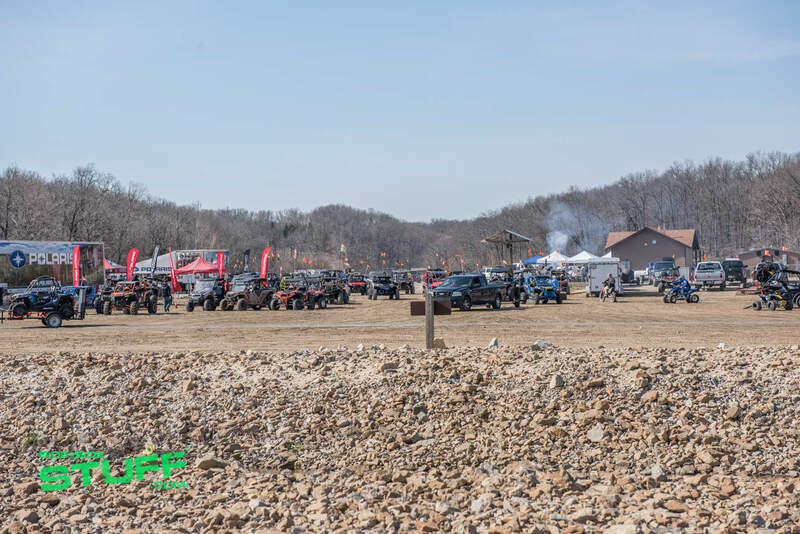 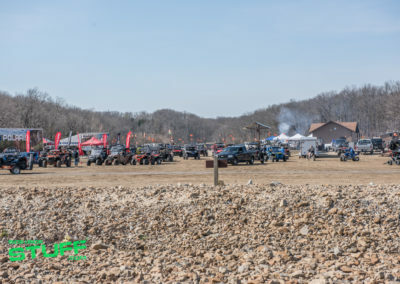 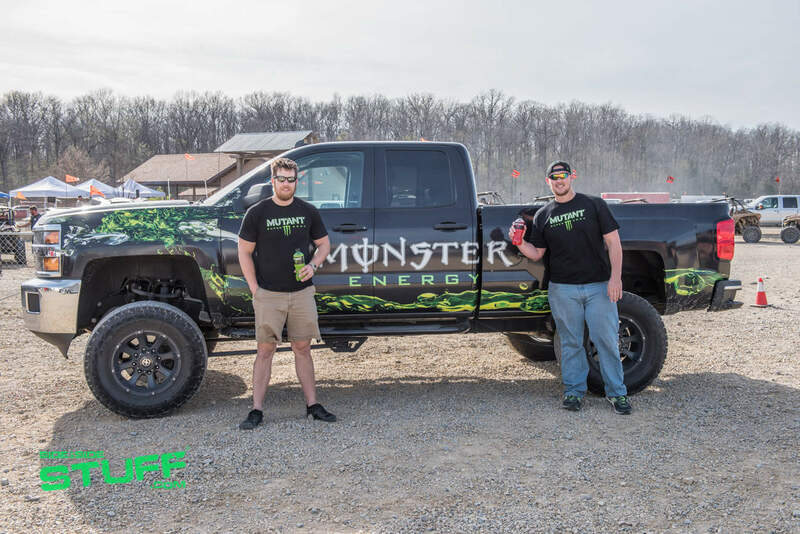 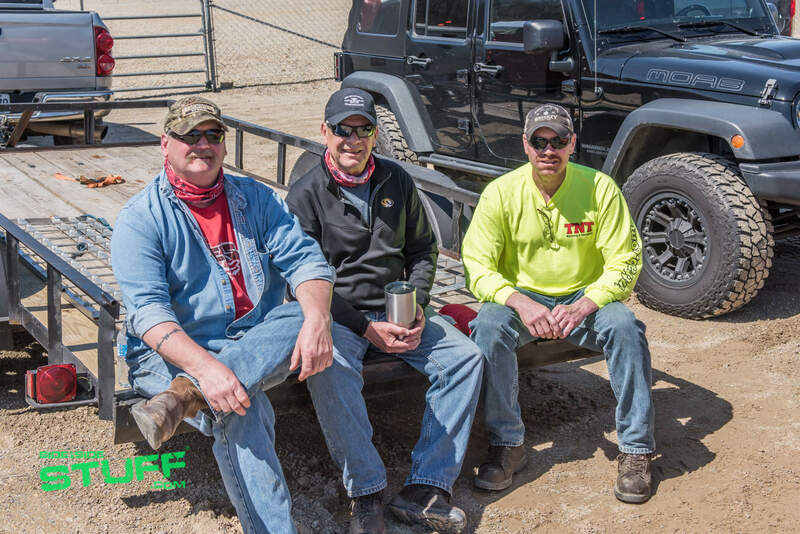 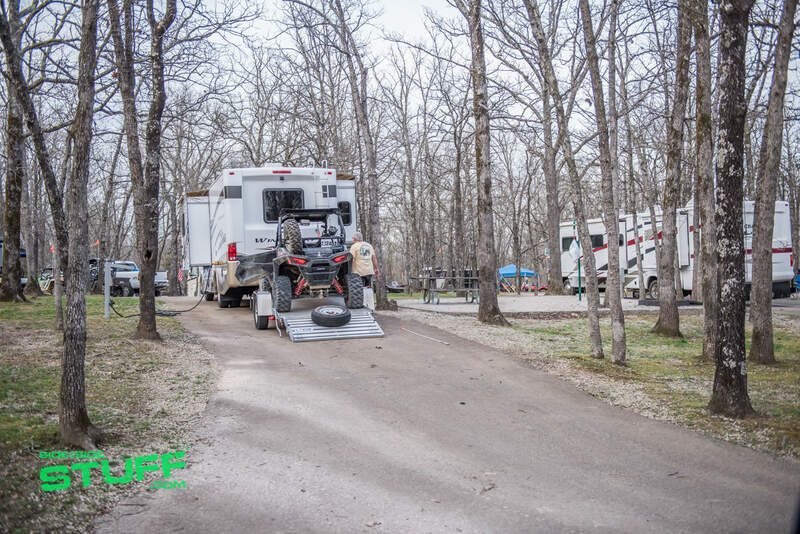 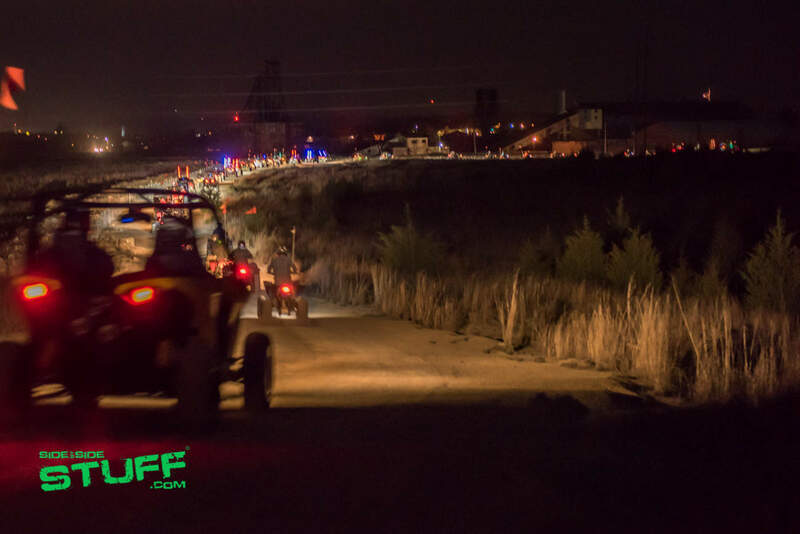 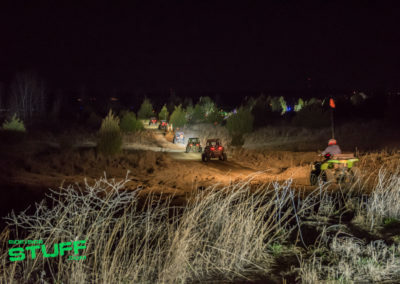 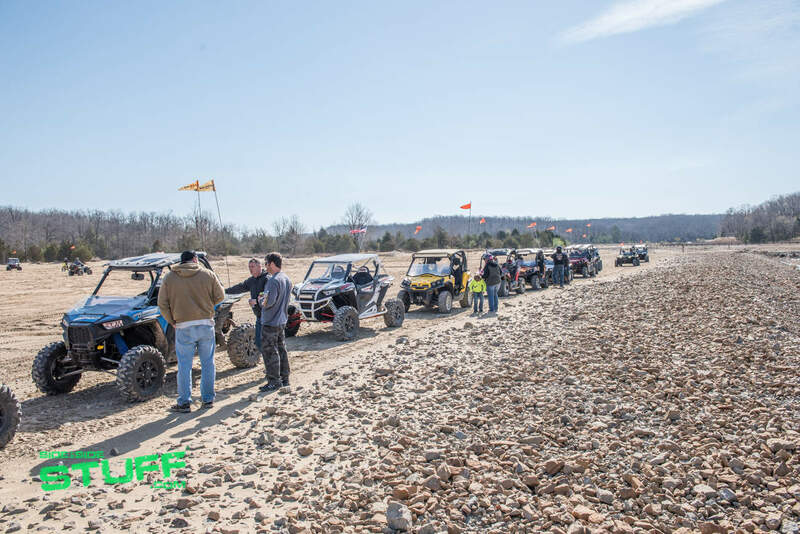 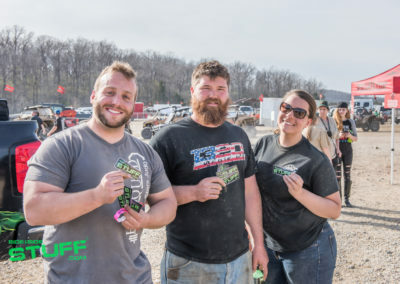 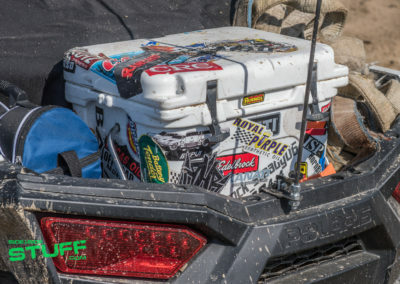 Thousands of off-road enthusiasts from all over the Midwest and beyond traveled to St. Joe State Park in Missouri for an epic weekend of riding, non-stop excitement and family oriented fun. 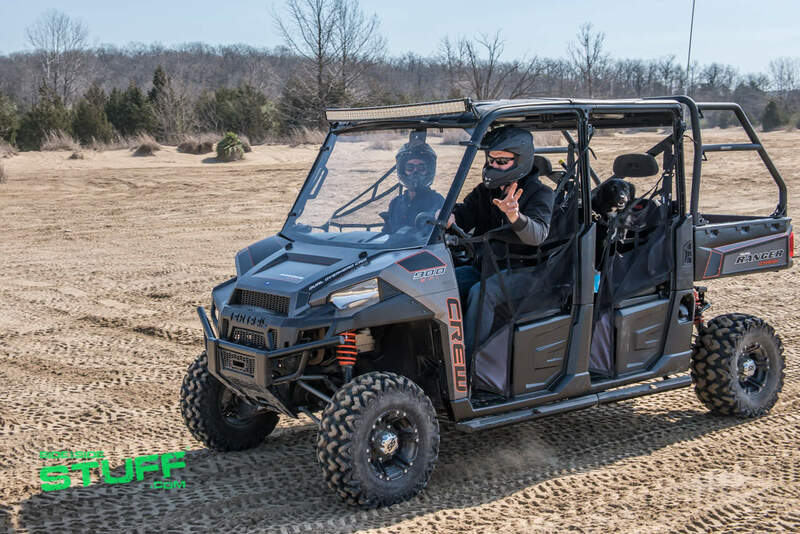 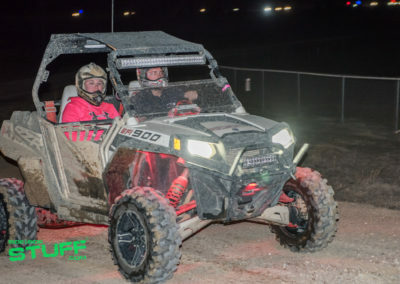 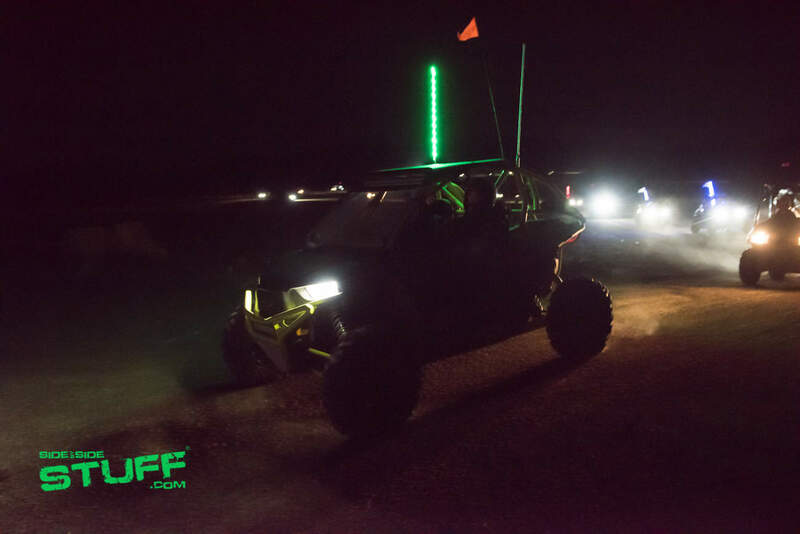 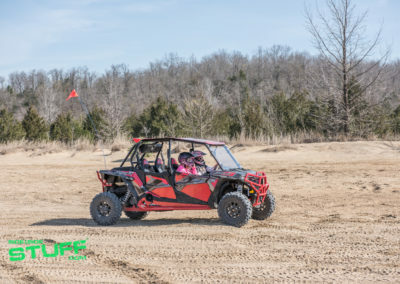 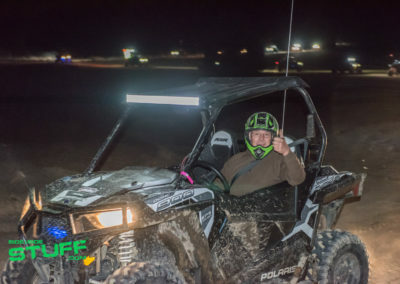 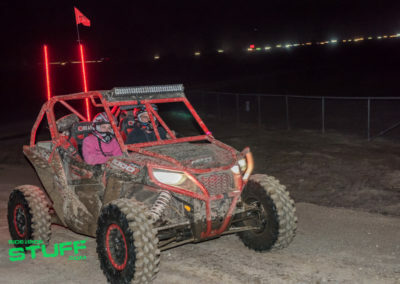 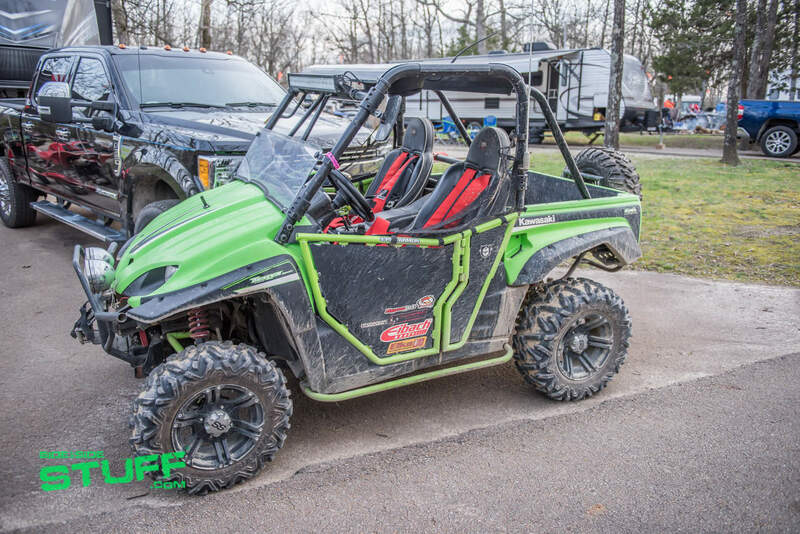 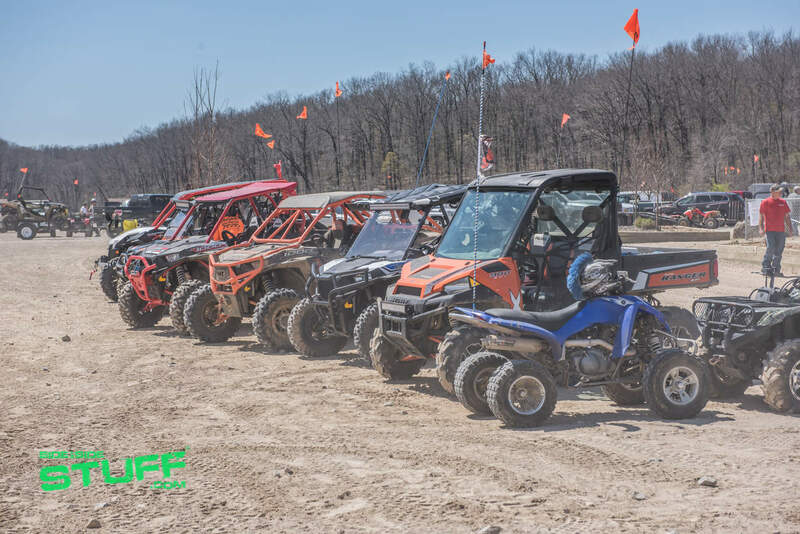 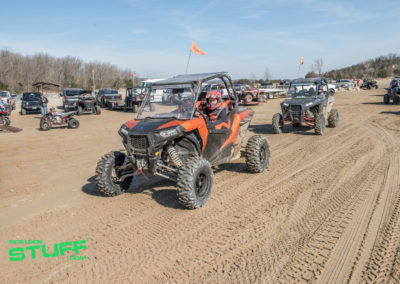 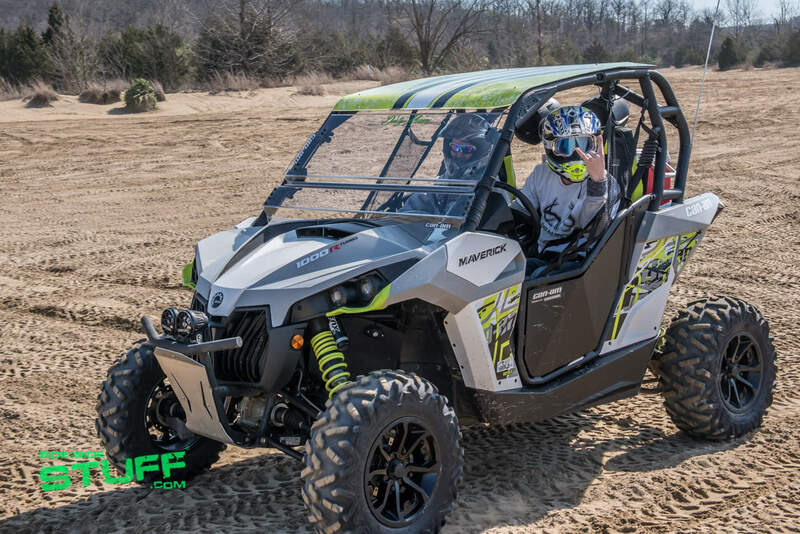 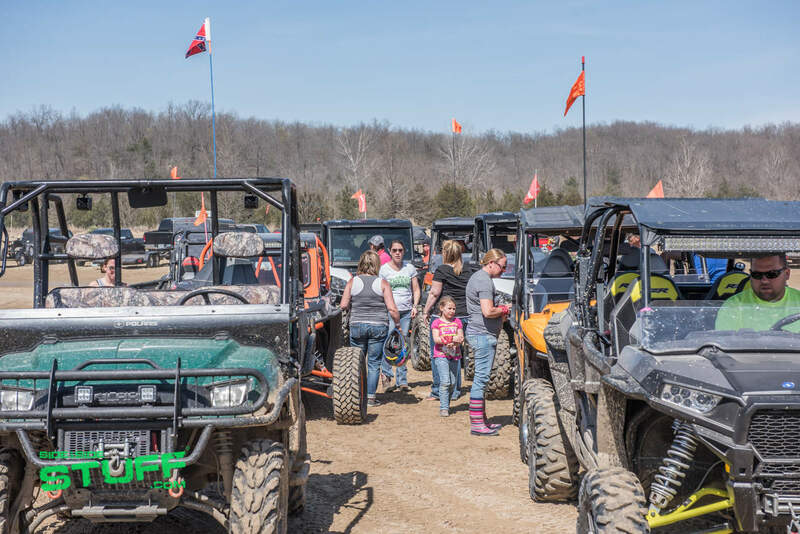 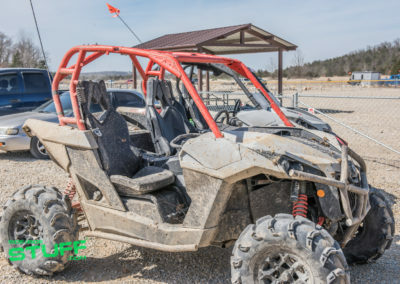 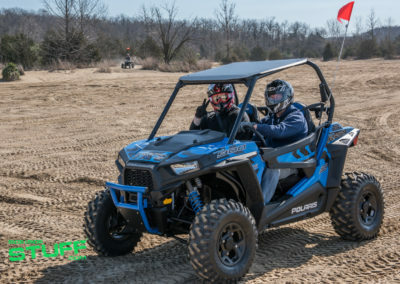 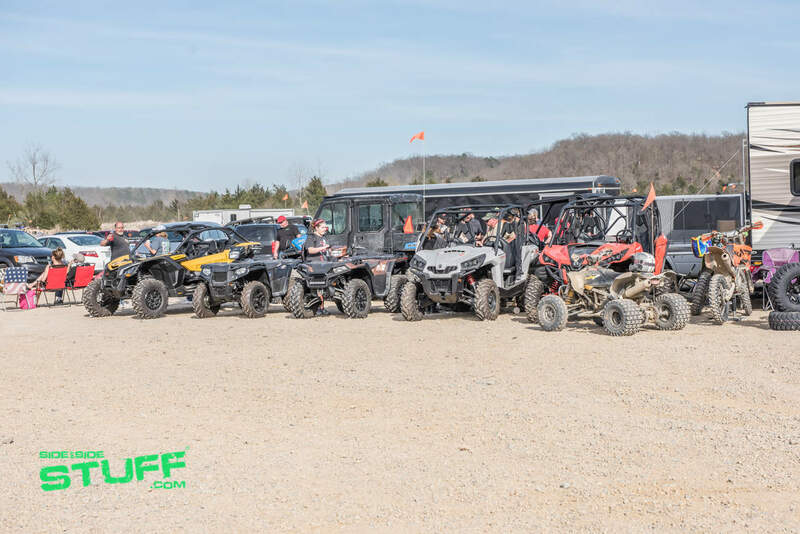 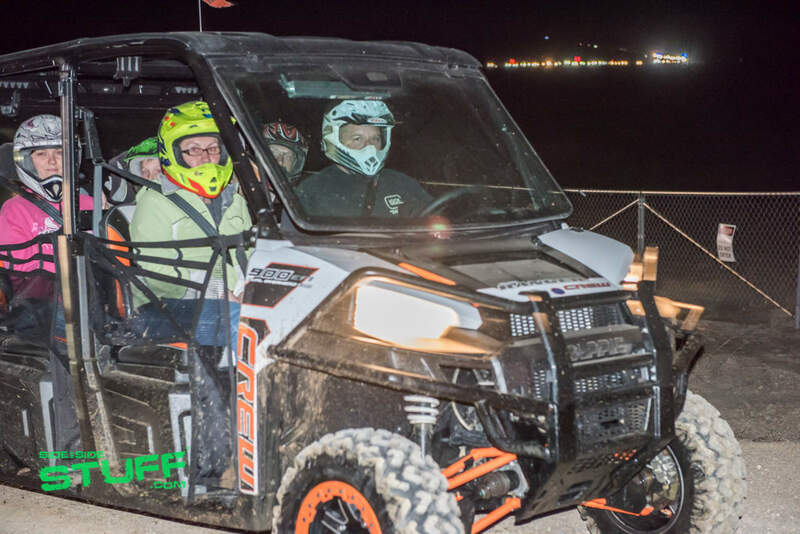 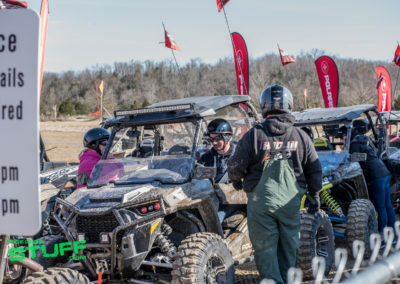 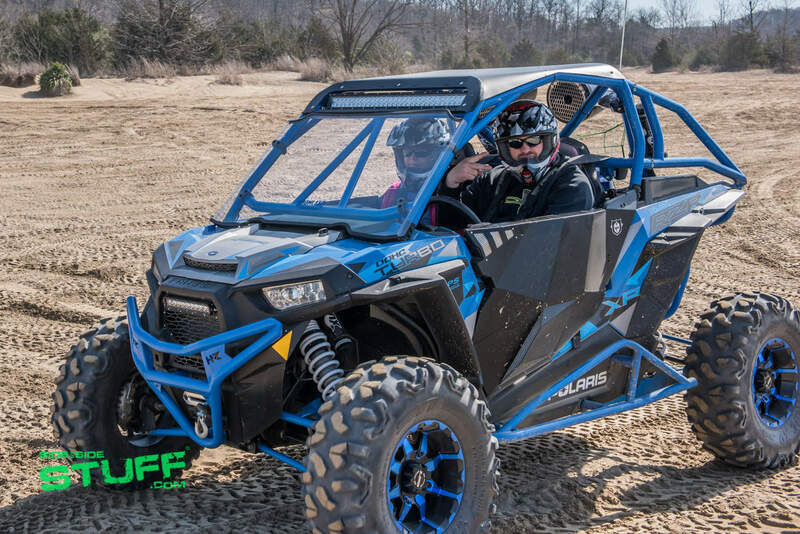 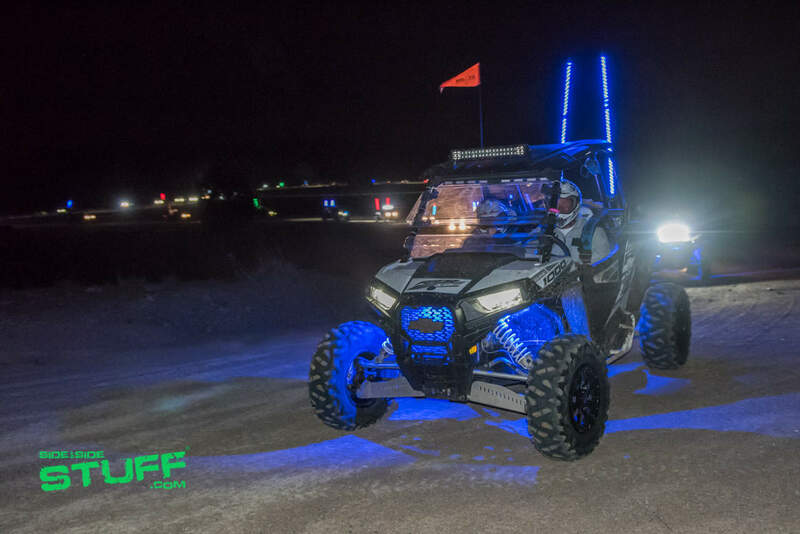 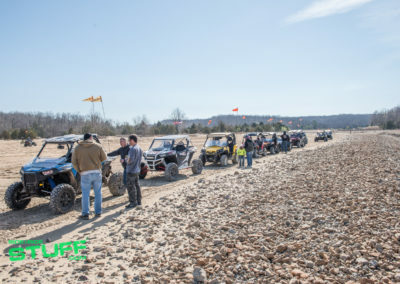 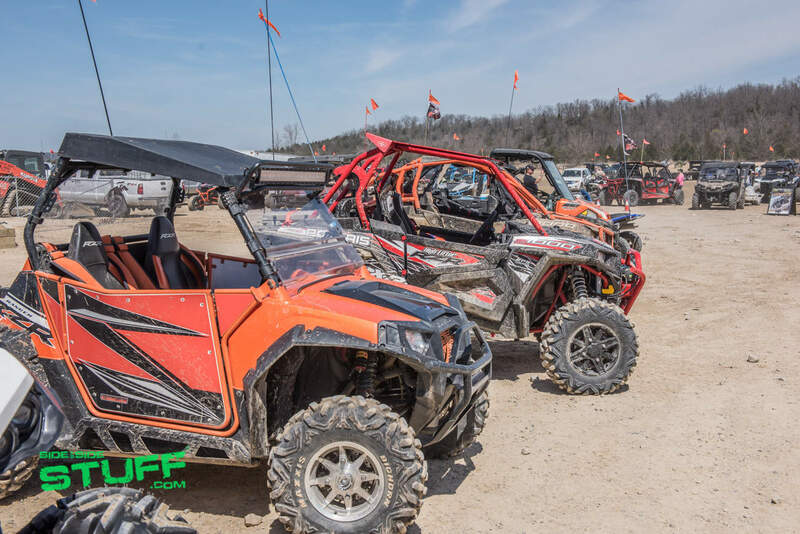 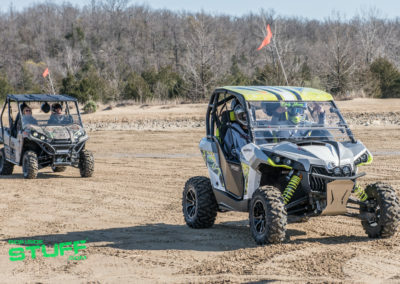 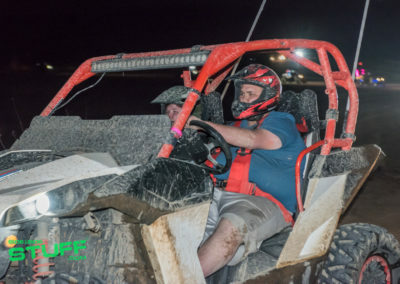 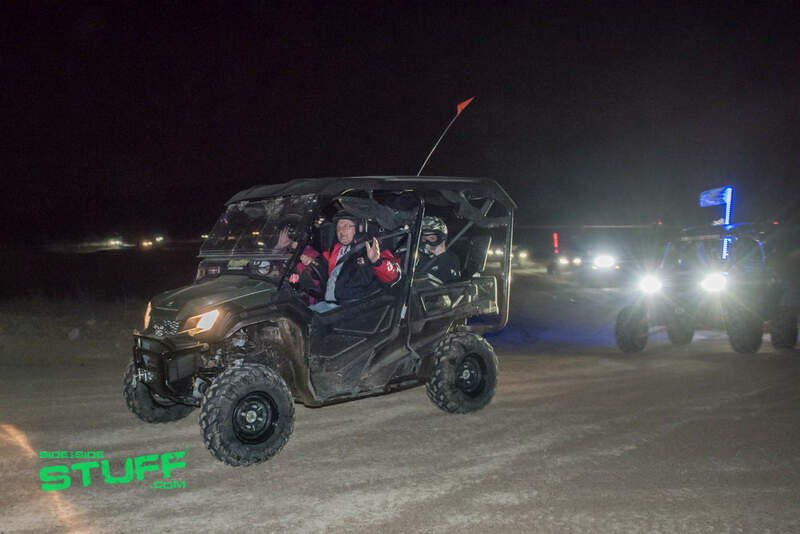 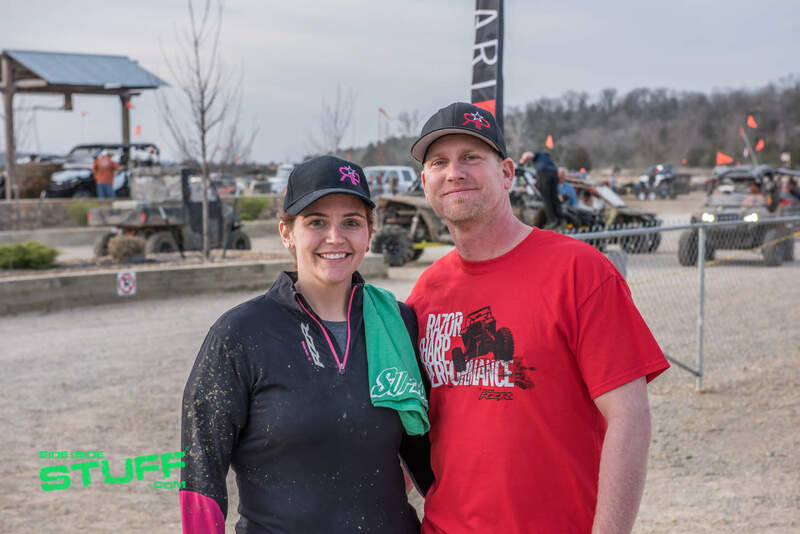 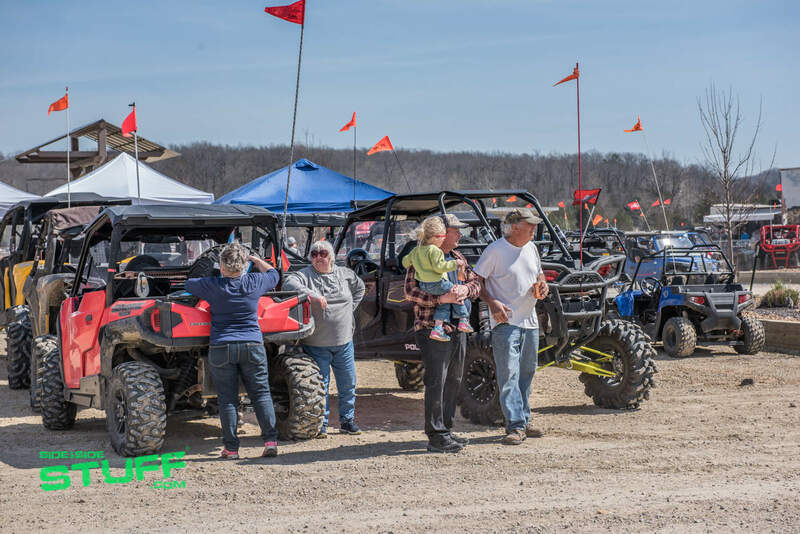 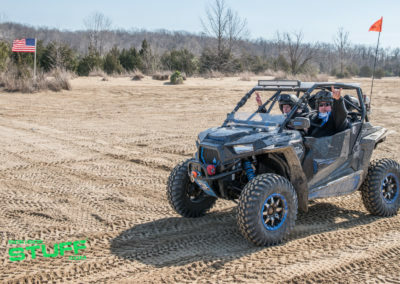 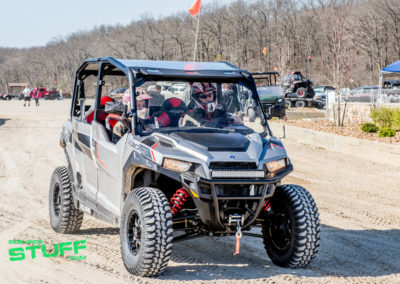 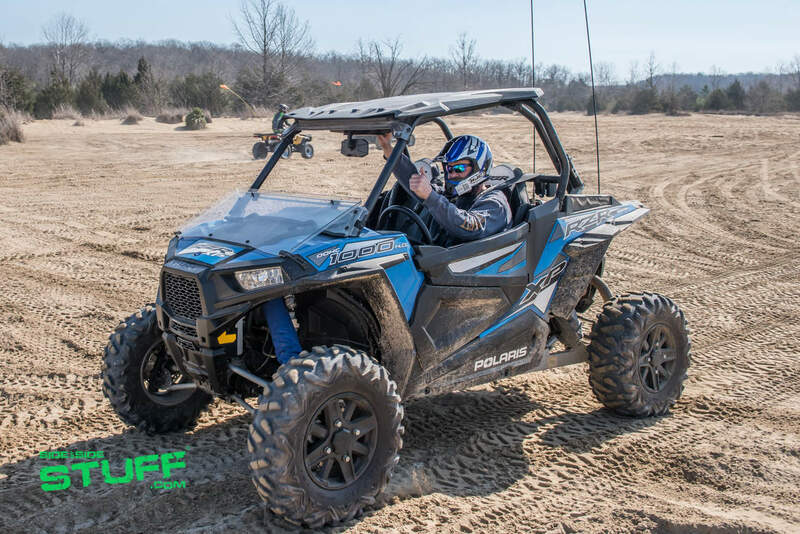 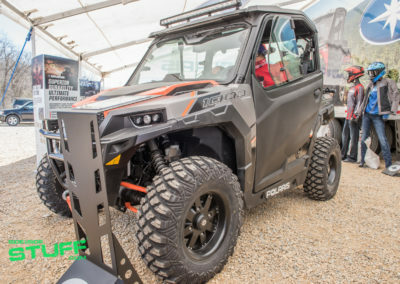 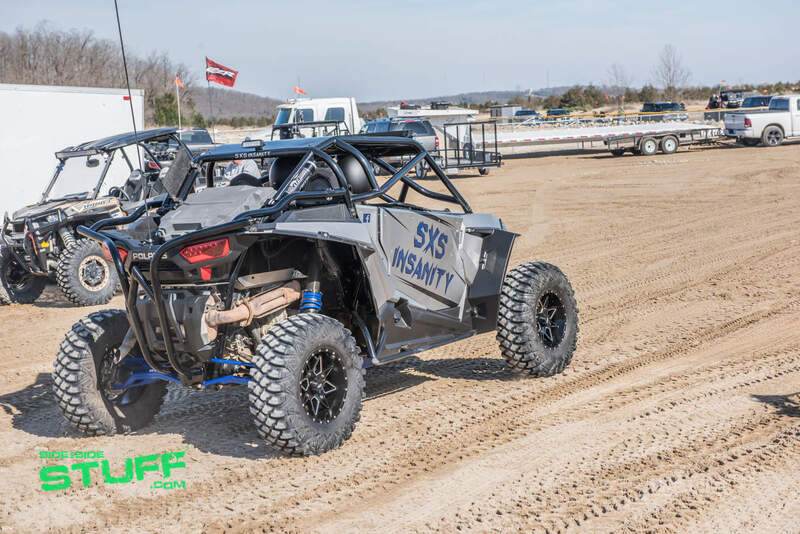 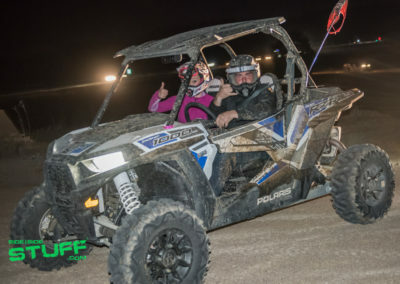 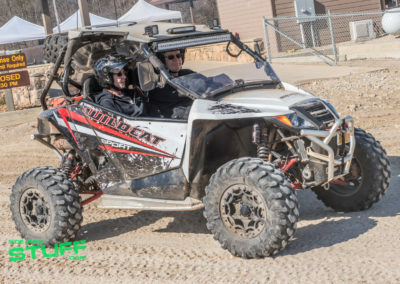 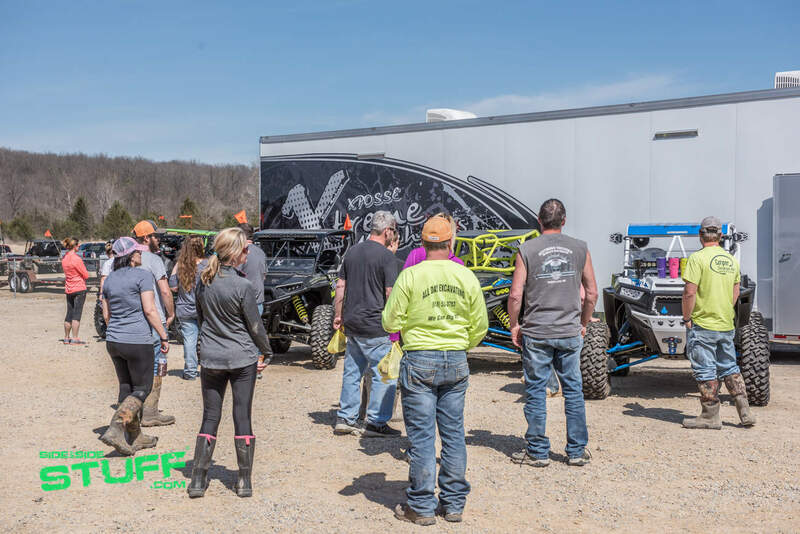 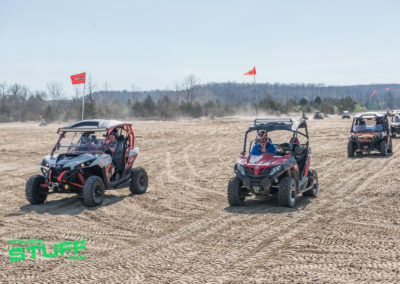 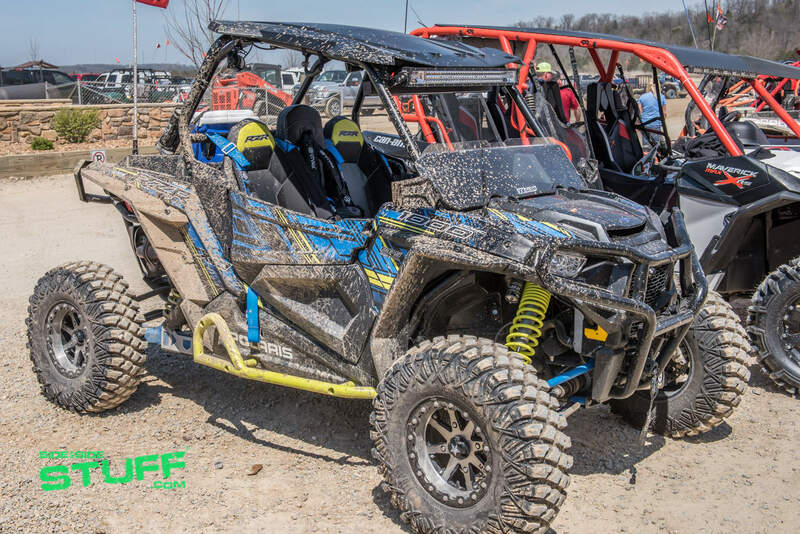 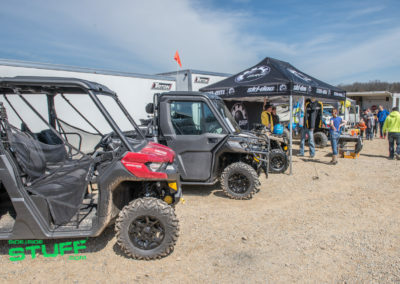 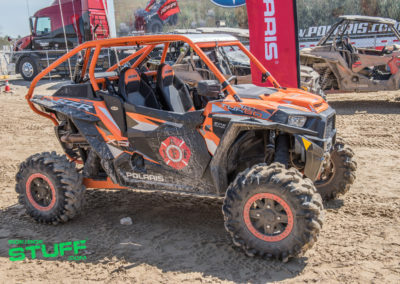 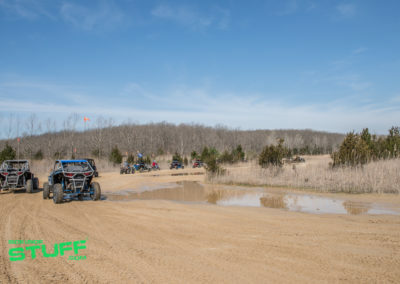 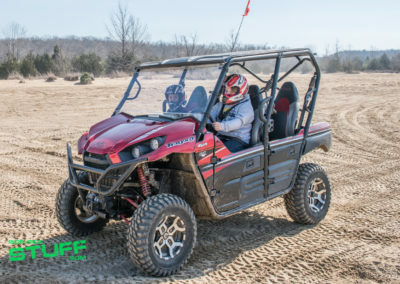 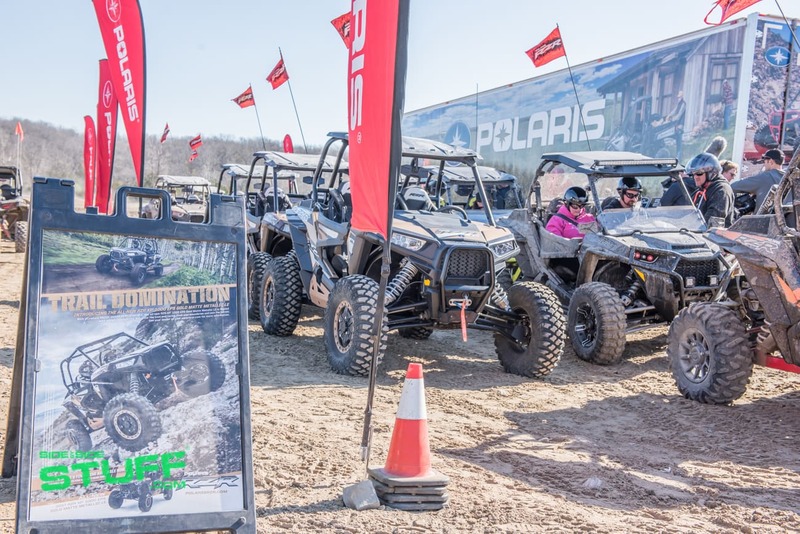 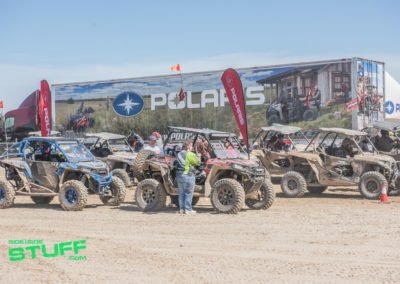 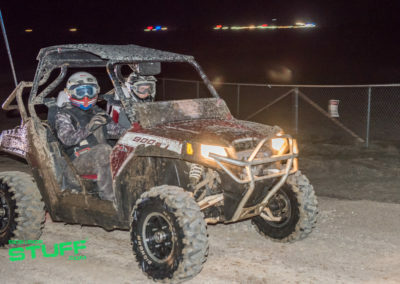 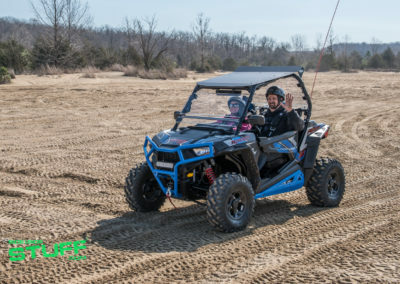 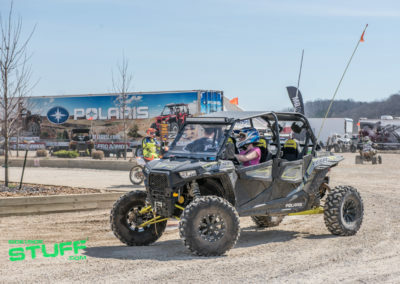 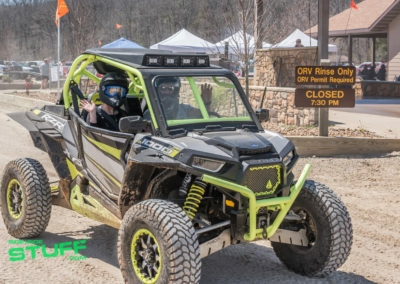 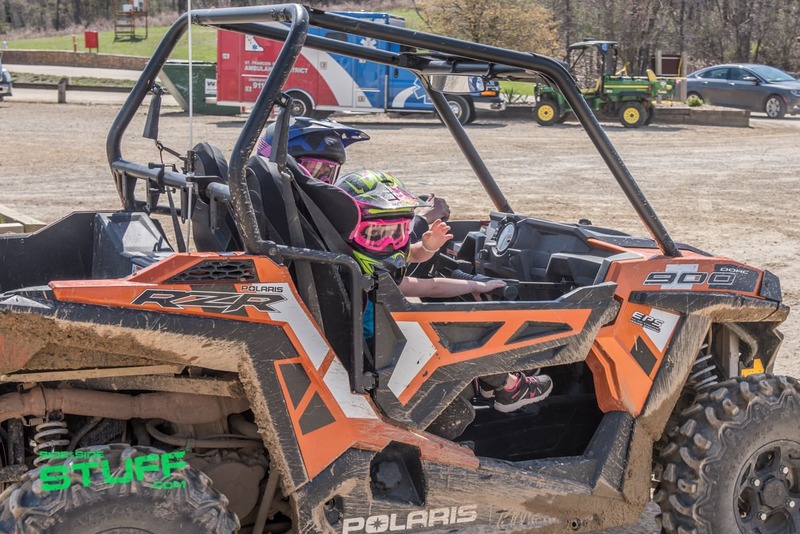 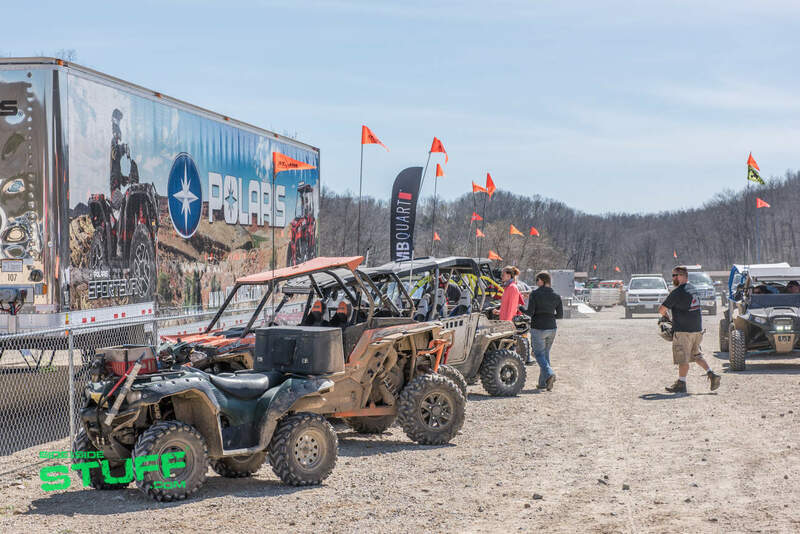 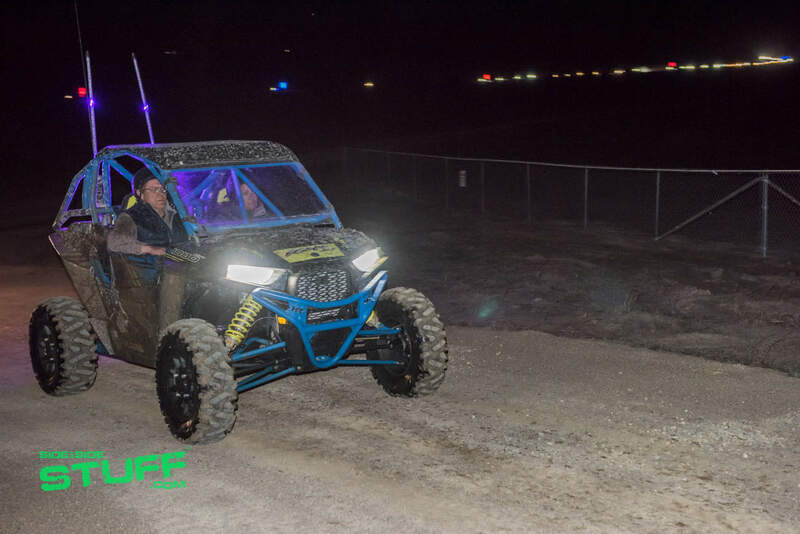 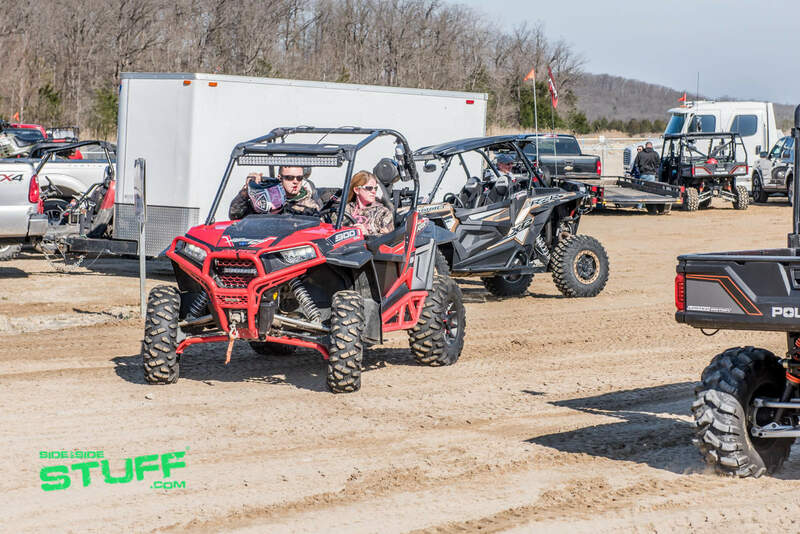 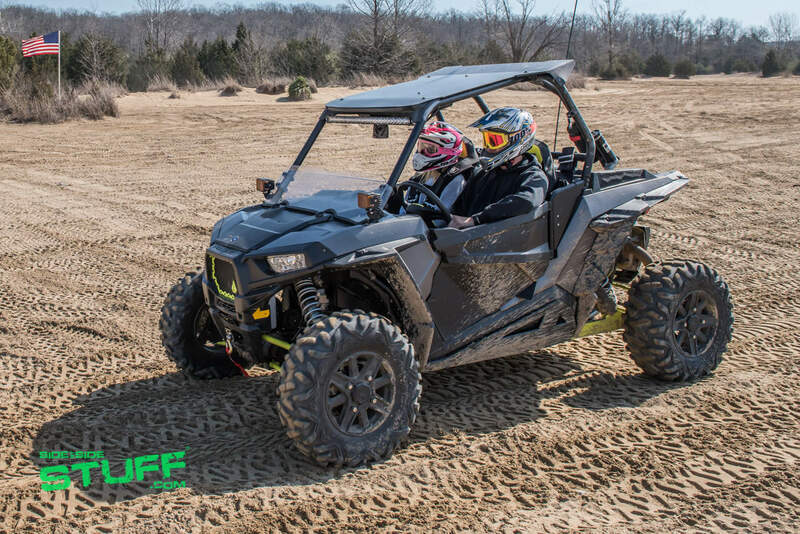 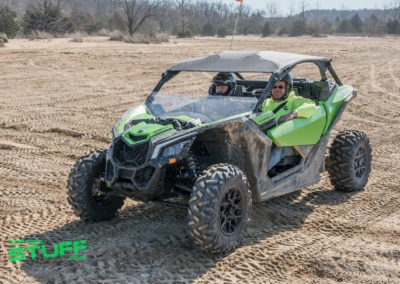 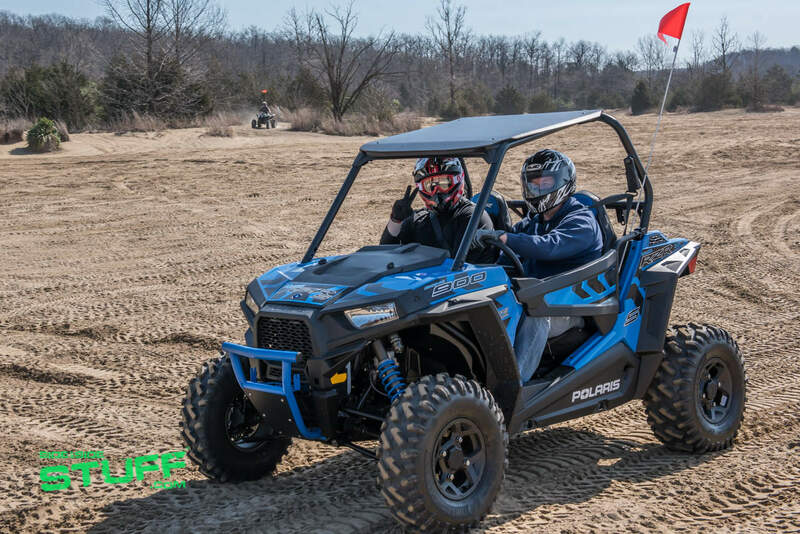 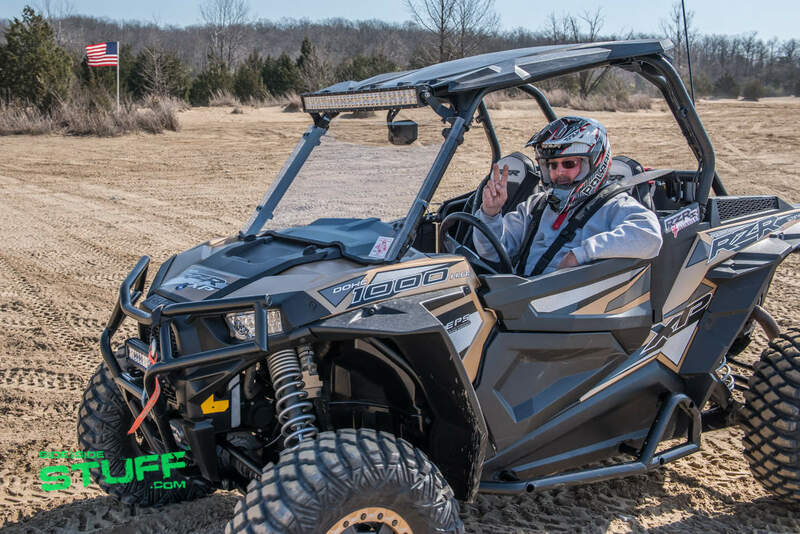 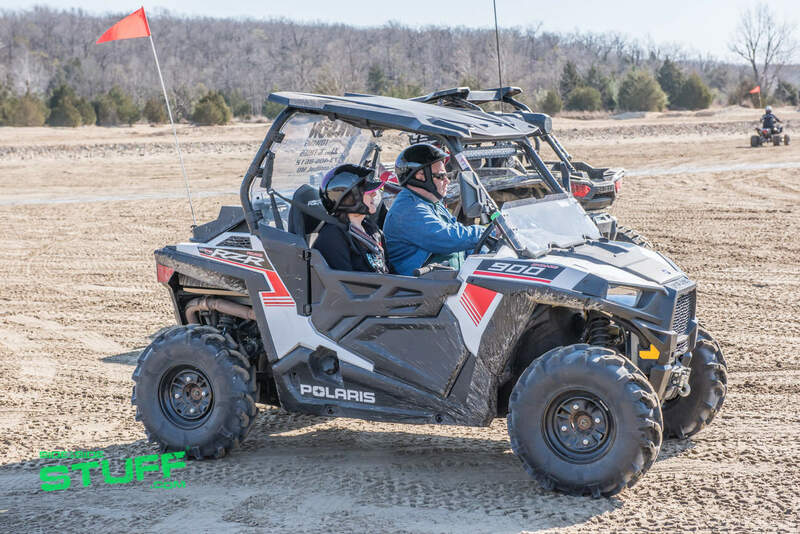 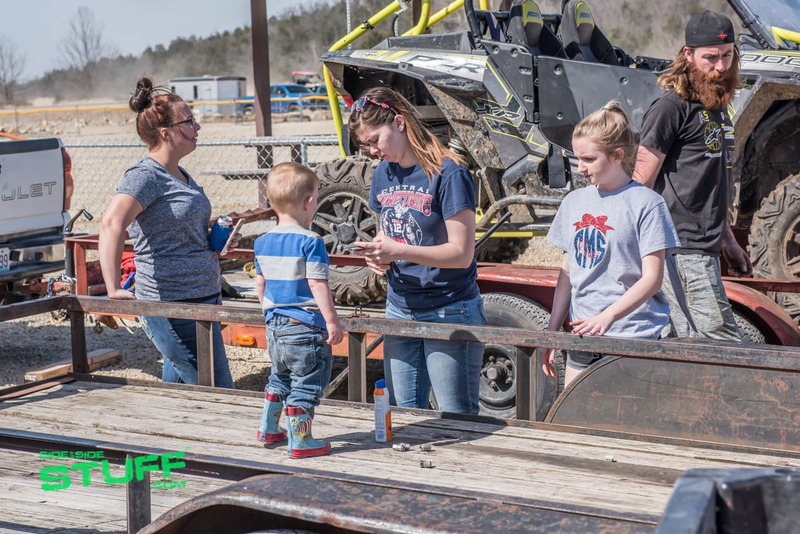 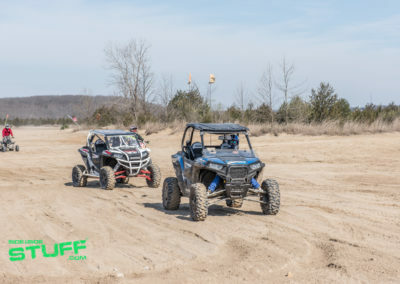 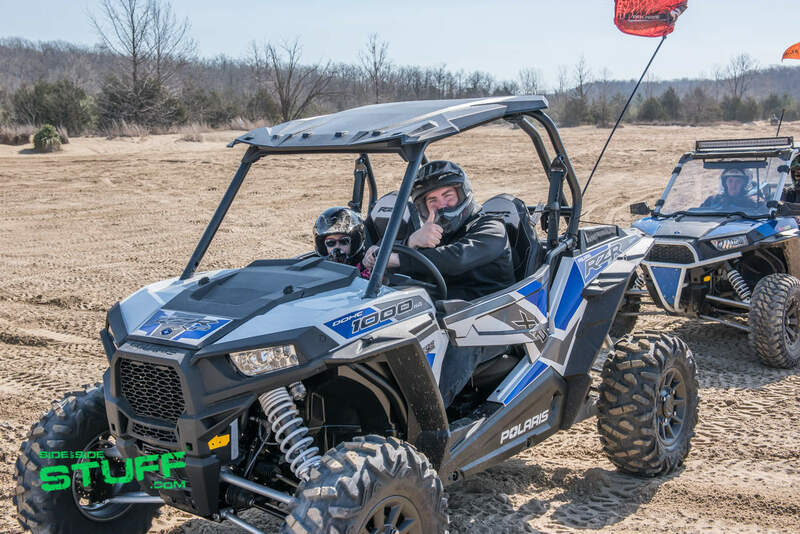 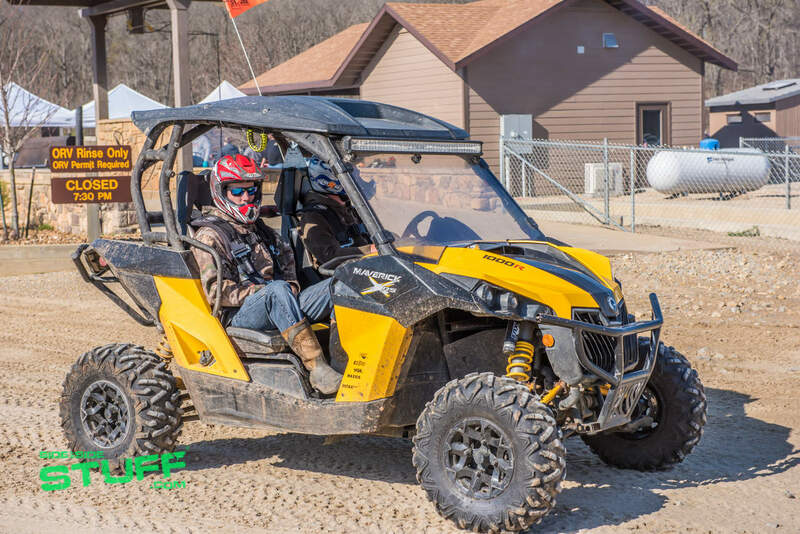 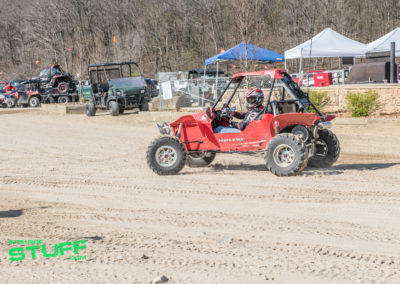 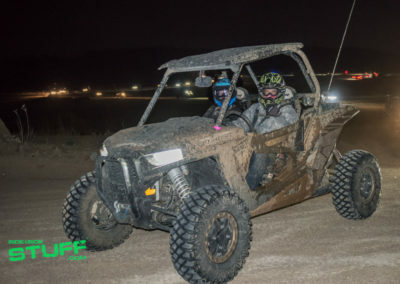 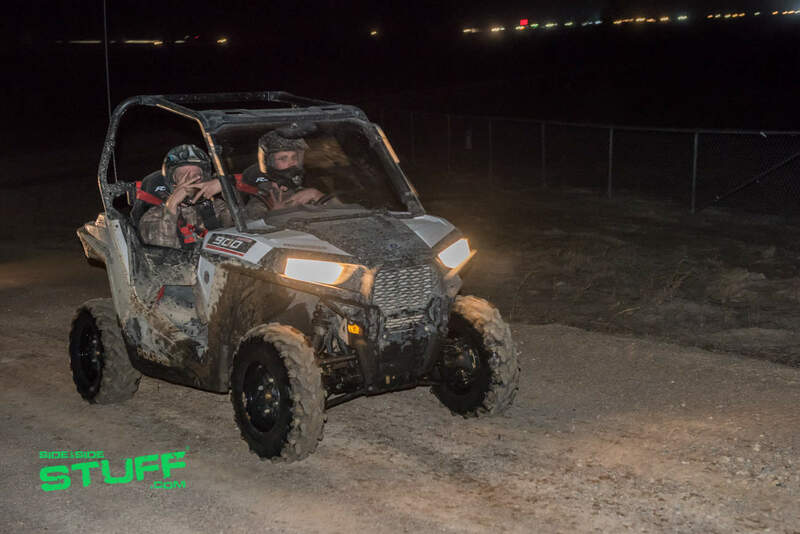 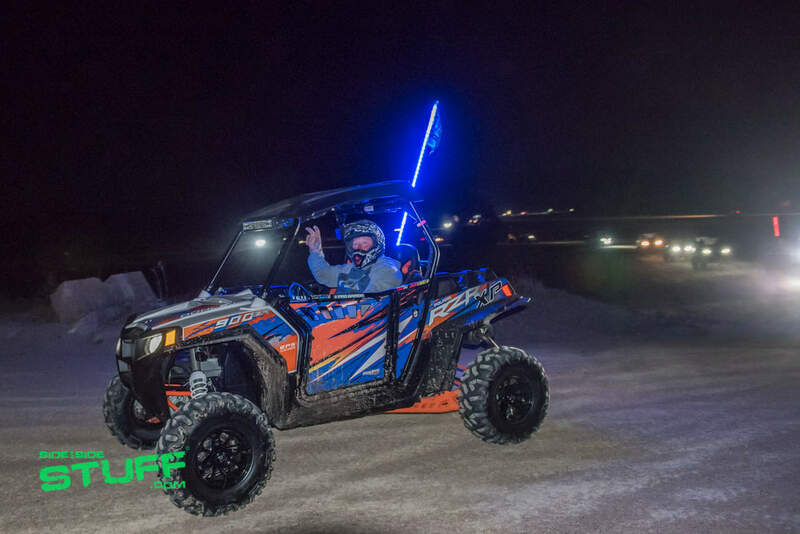 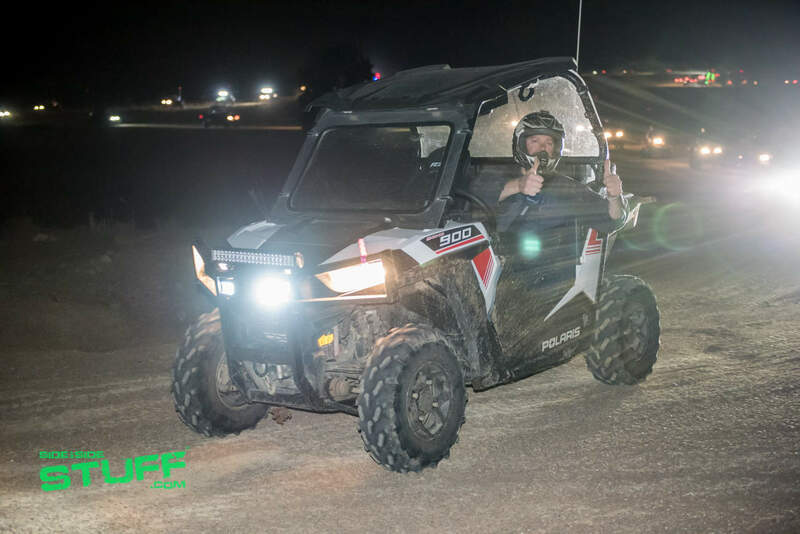 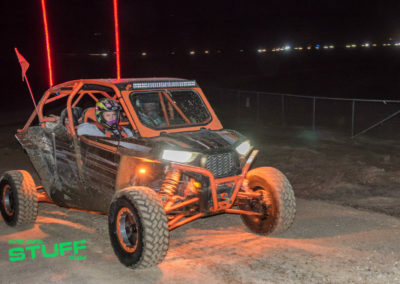 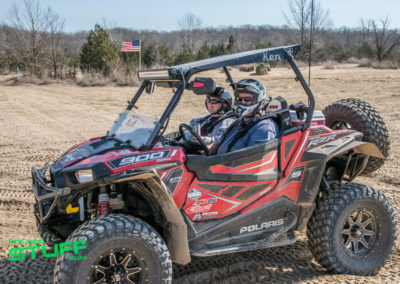 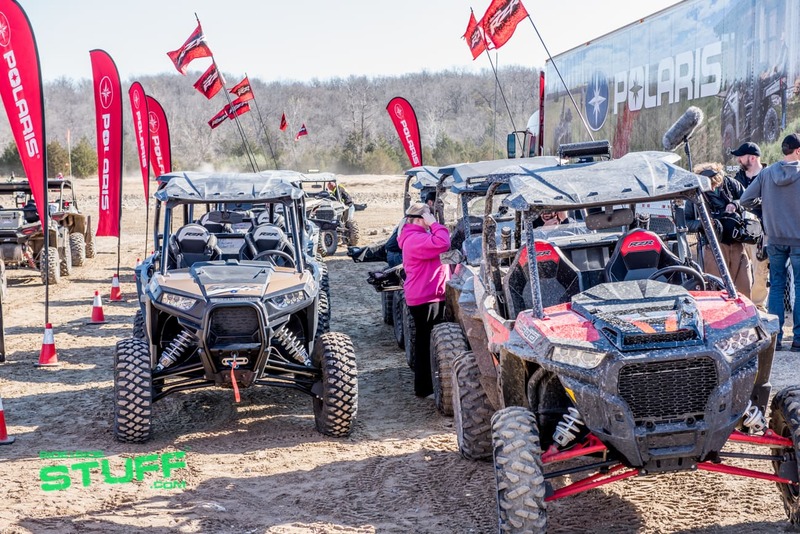 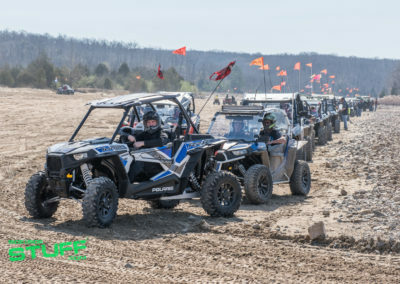 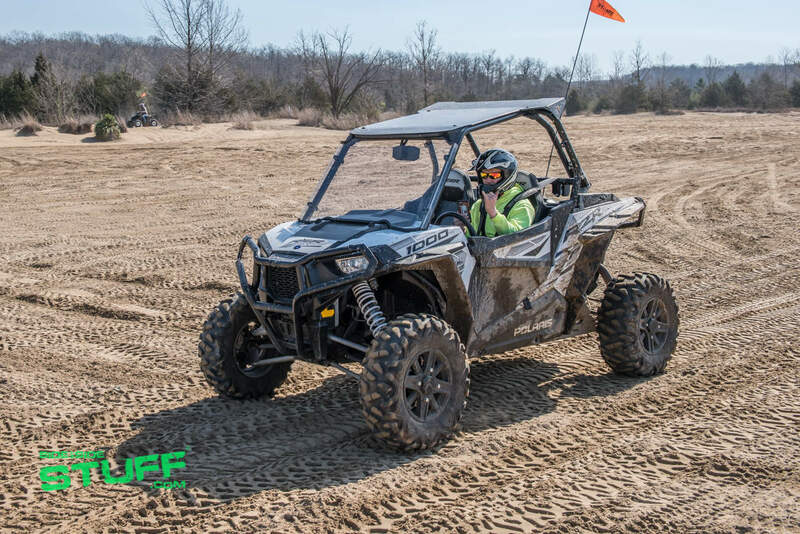 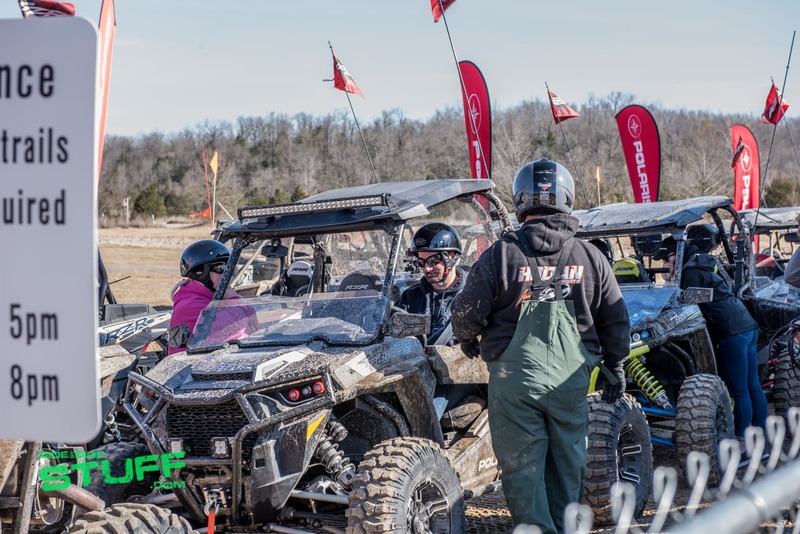 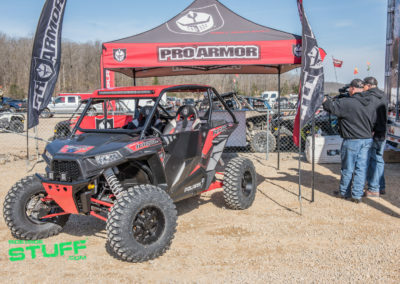 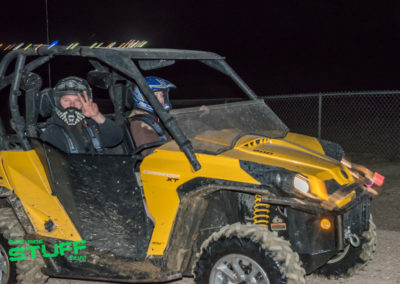 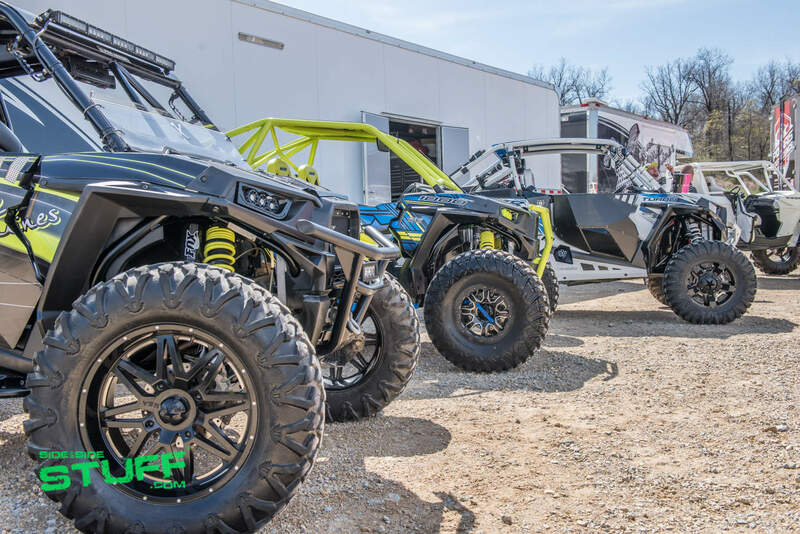 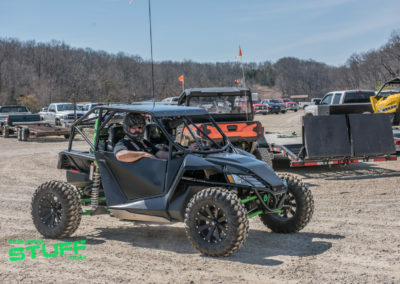 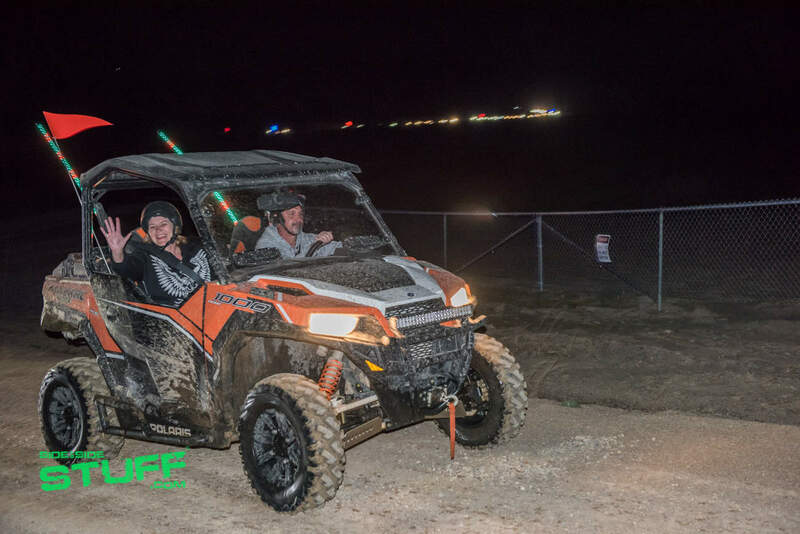 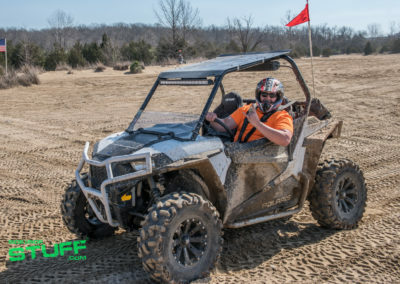 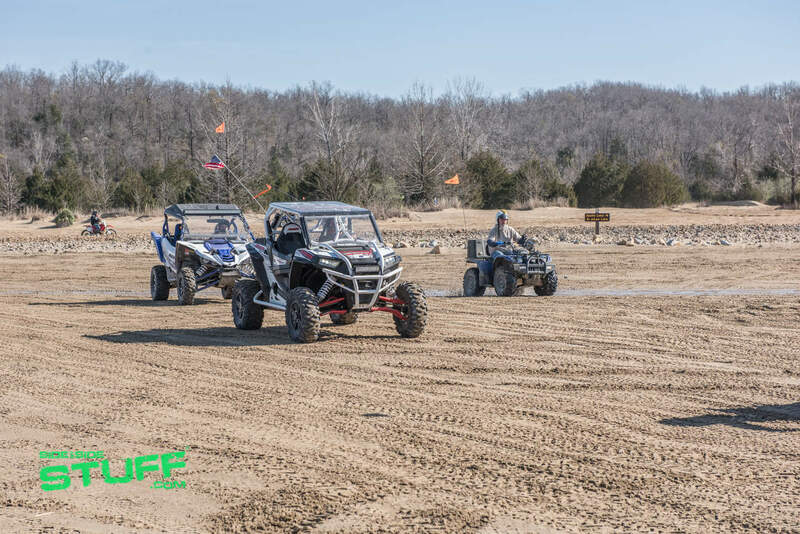 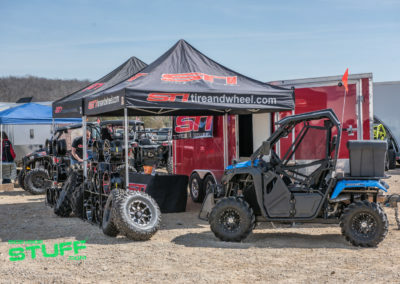 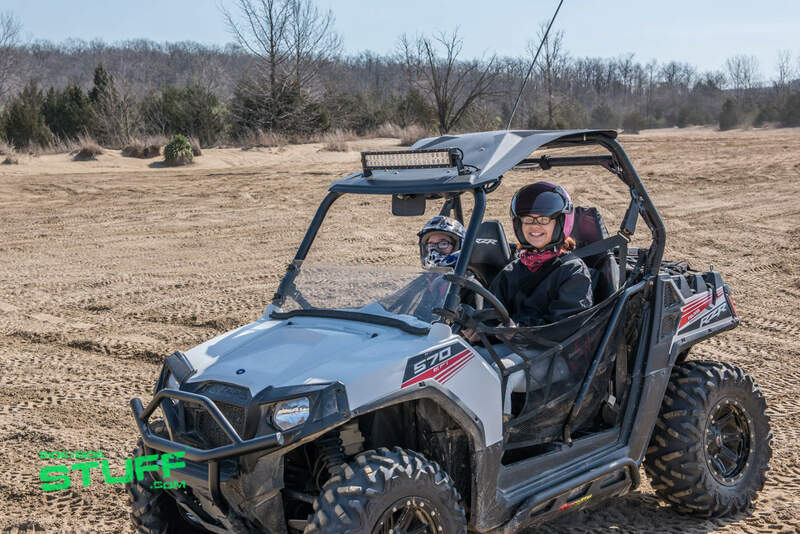 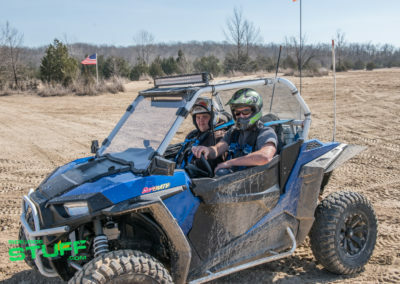 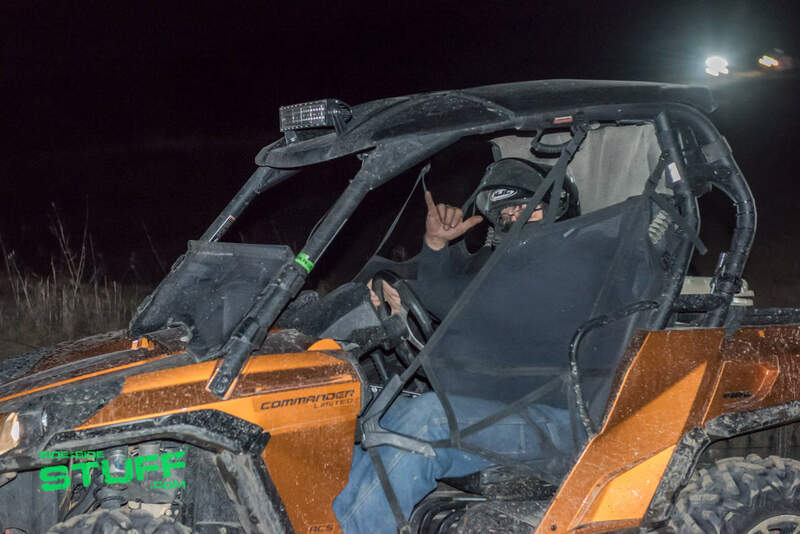 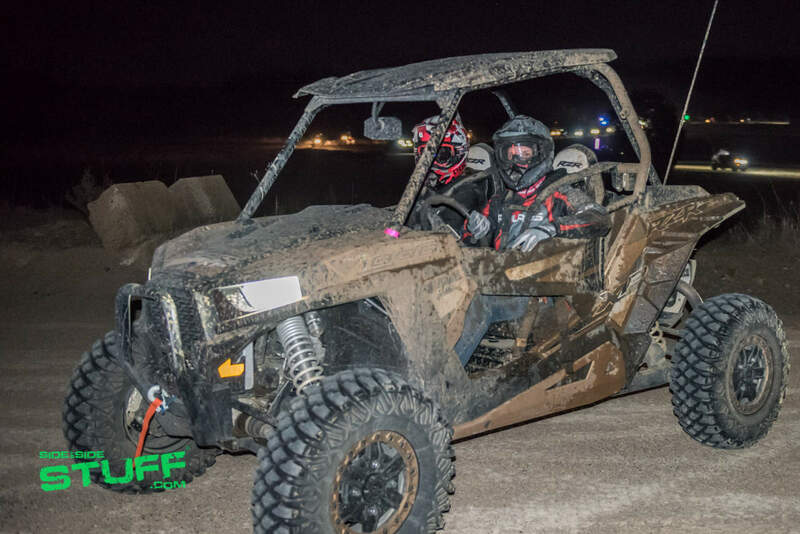 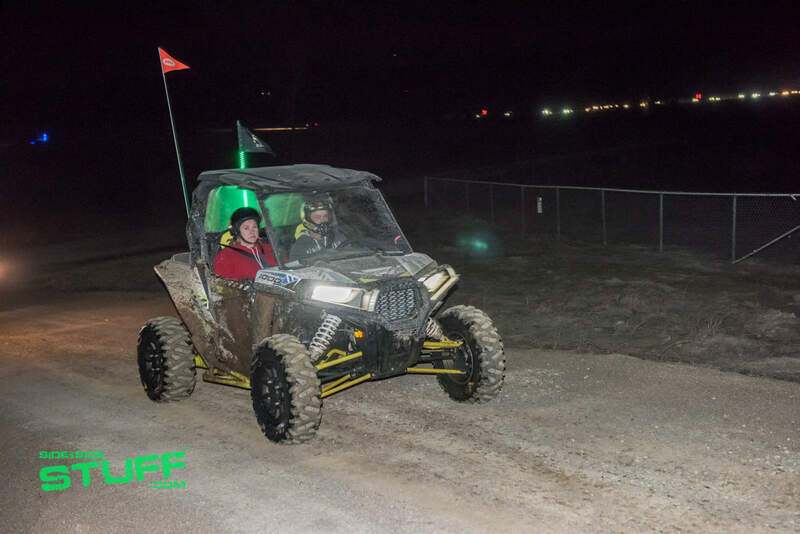 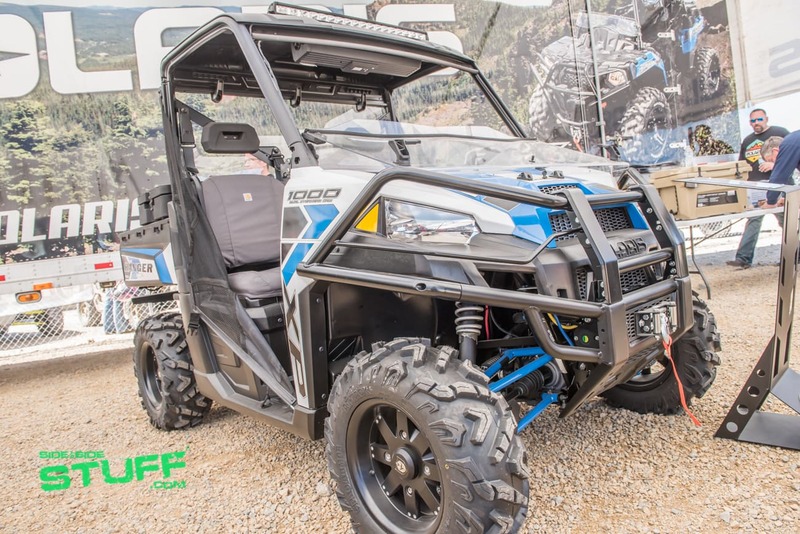 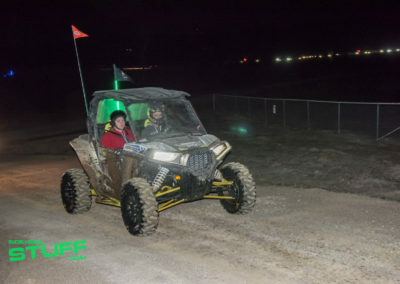 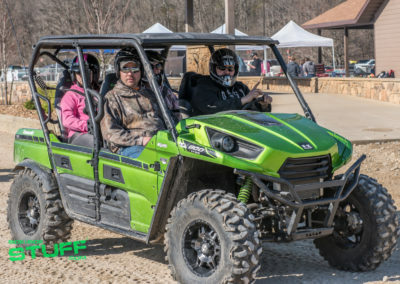 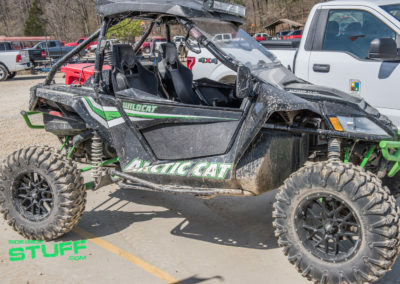 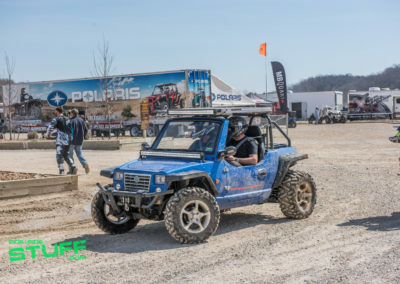 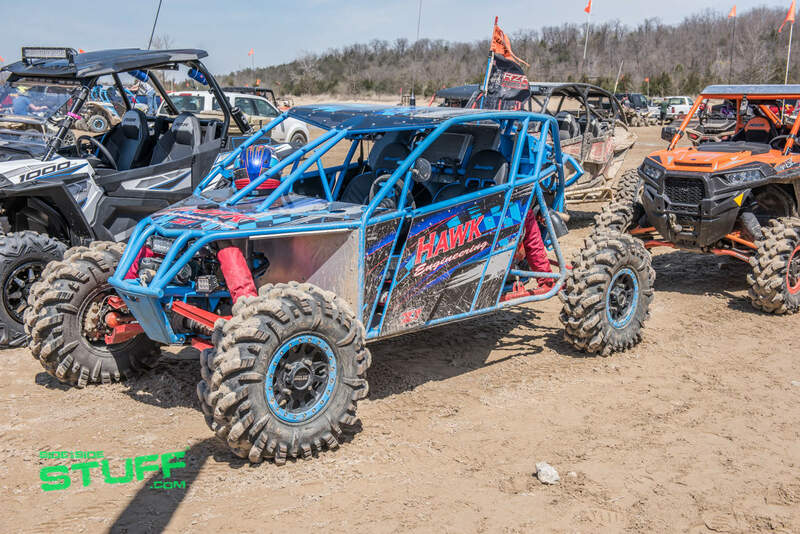 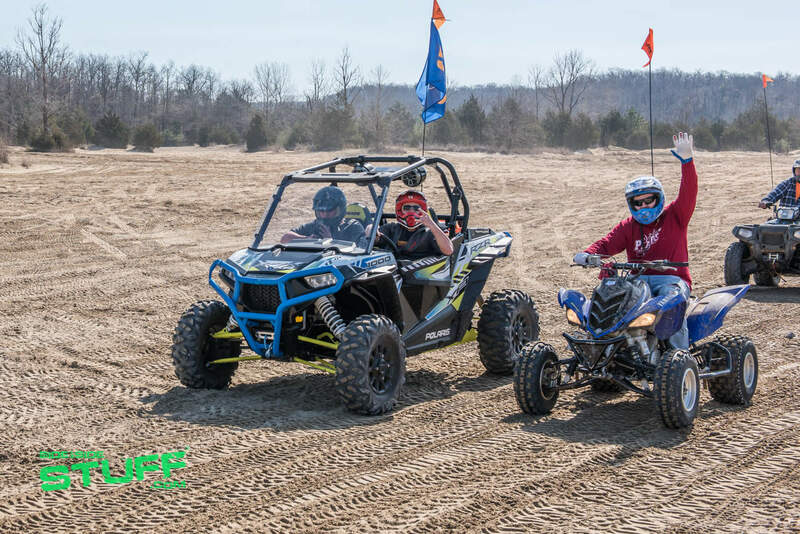 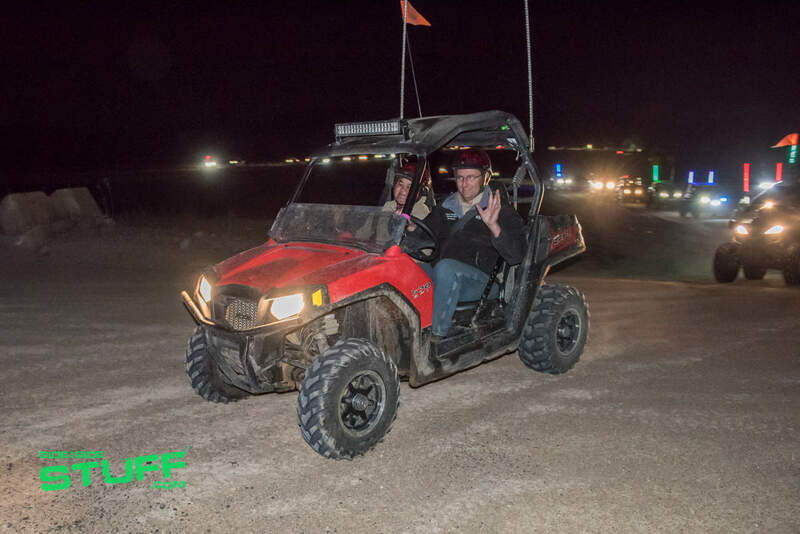 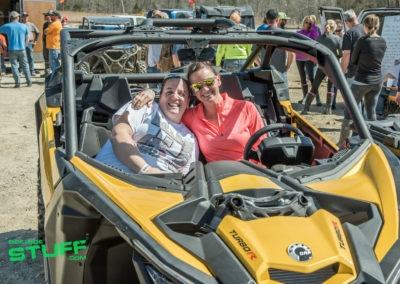 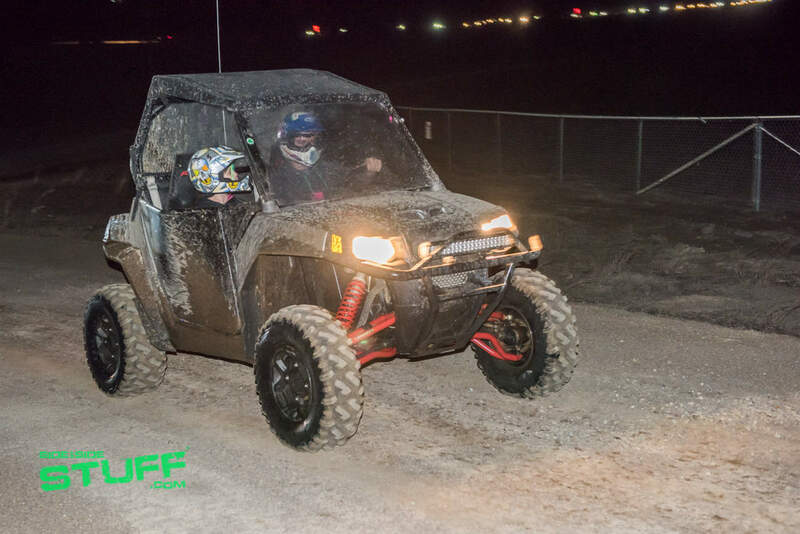 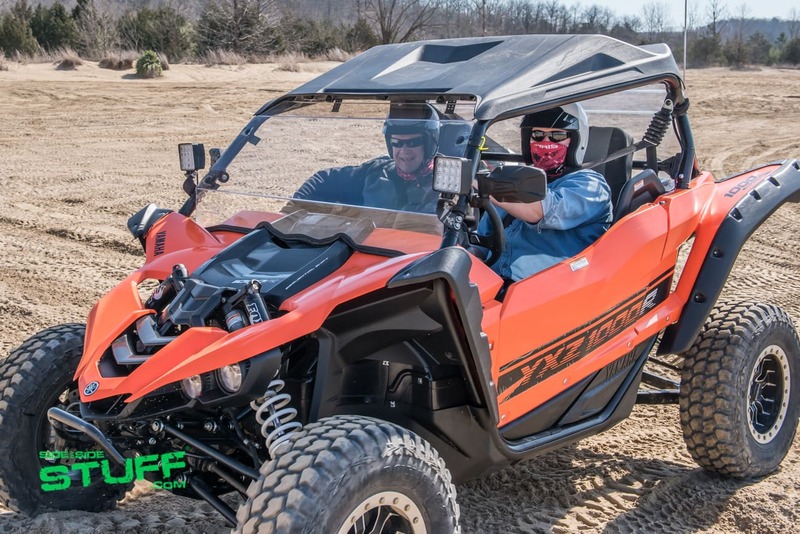 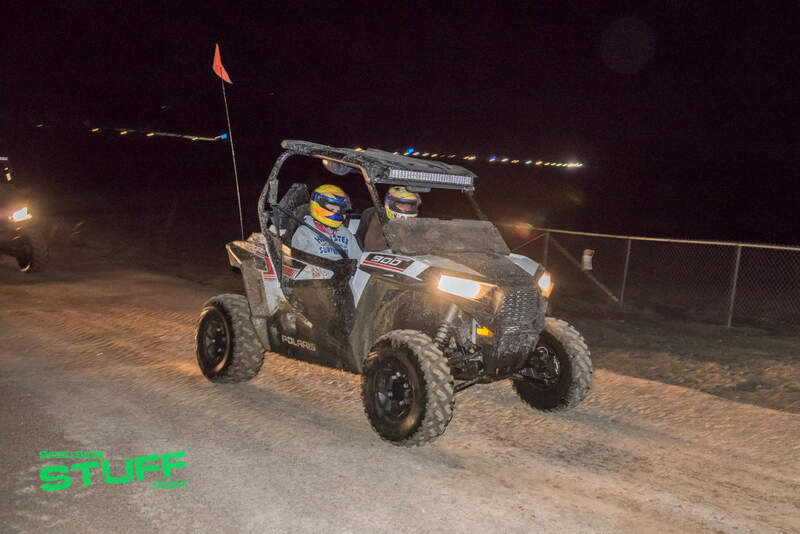 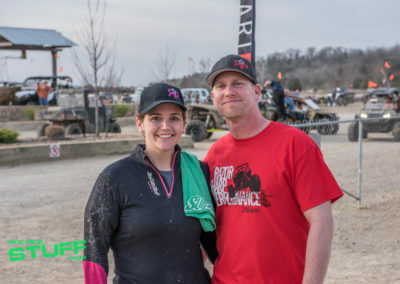 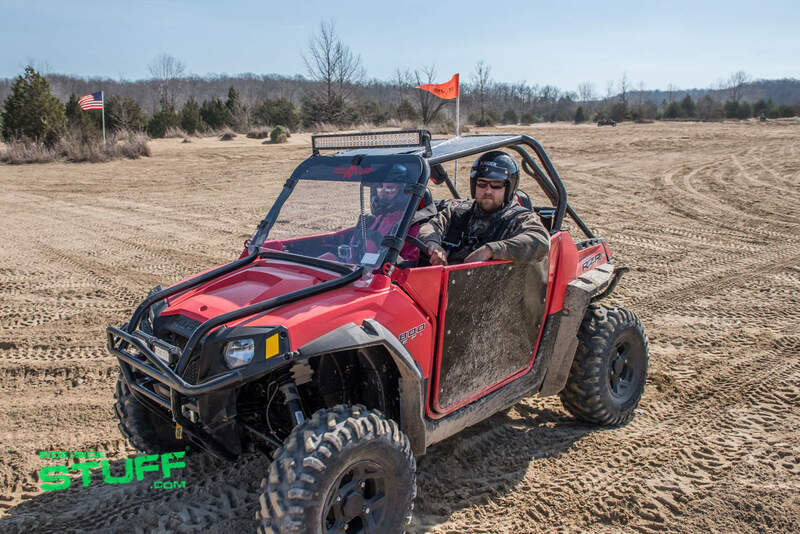 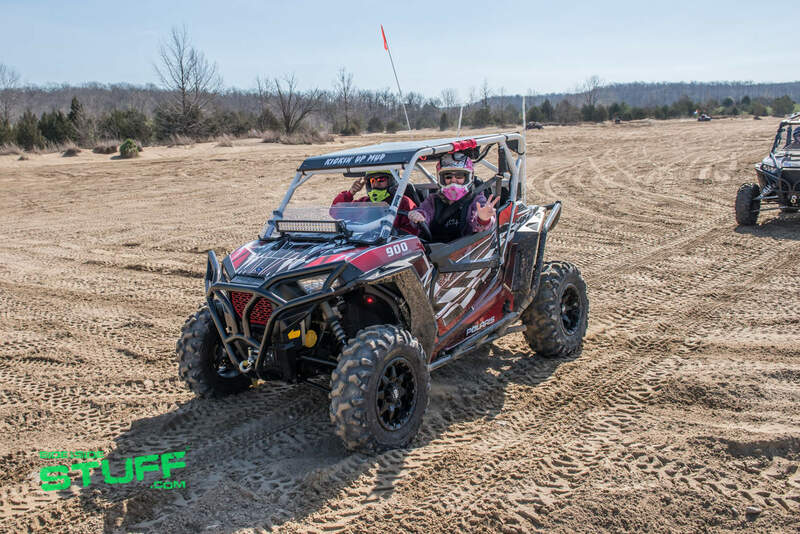 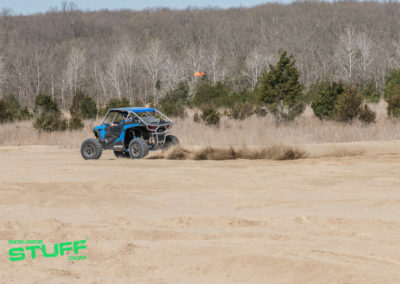 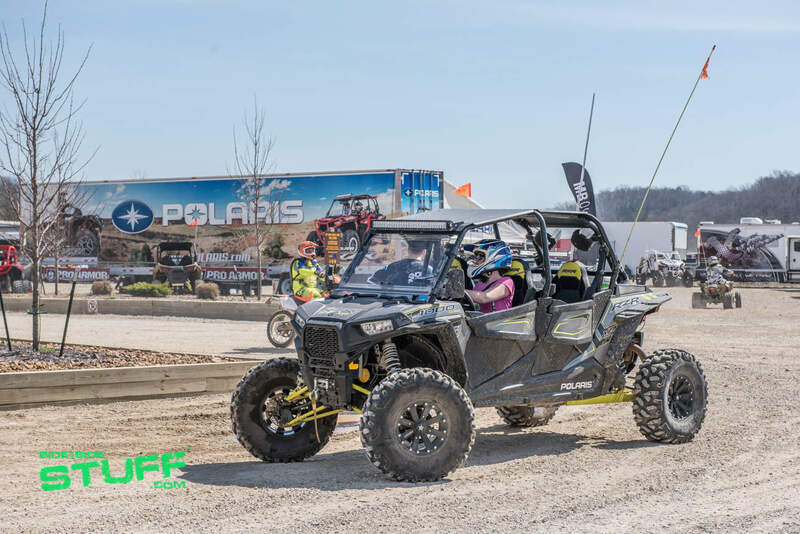 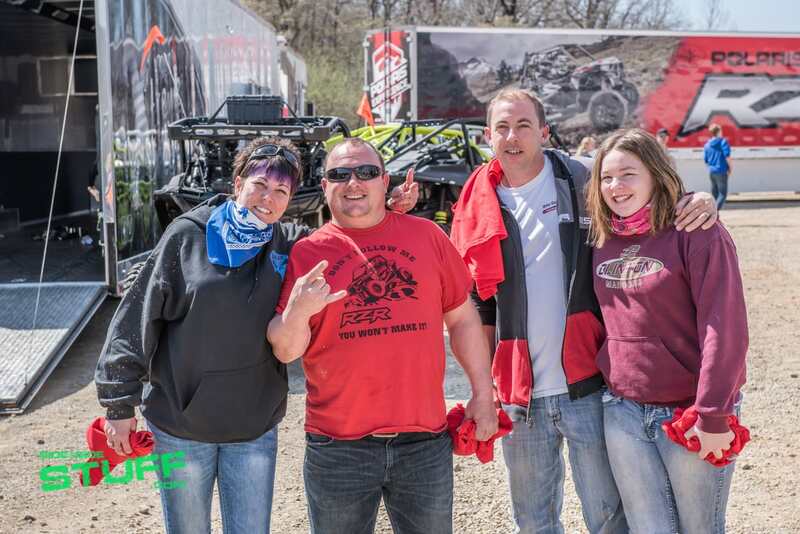 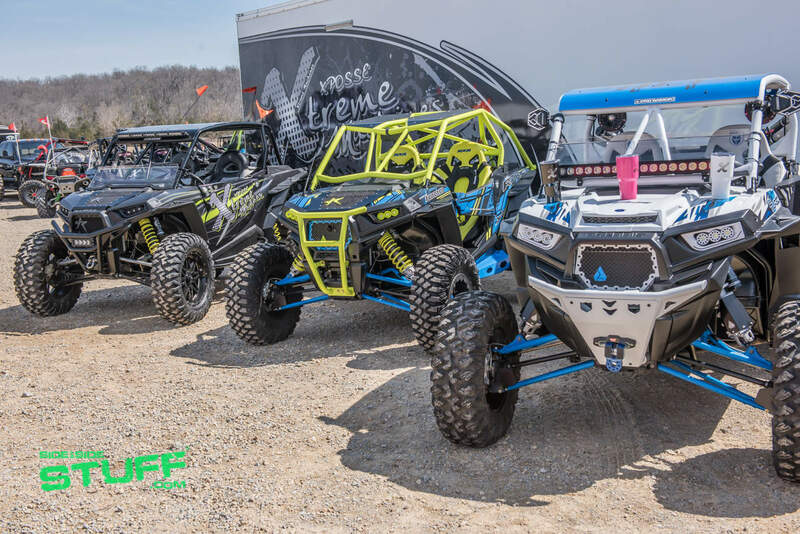 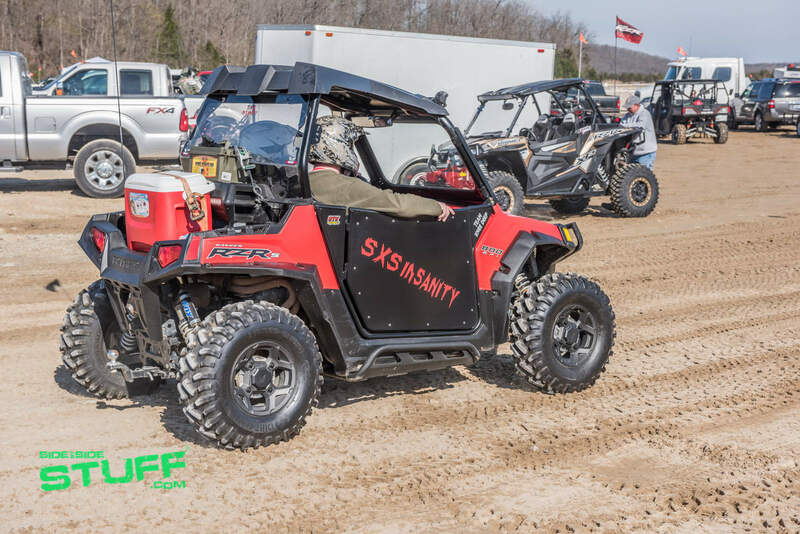 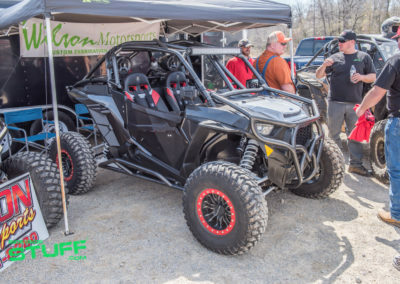 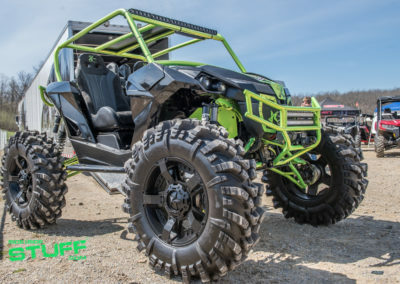 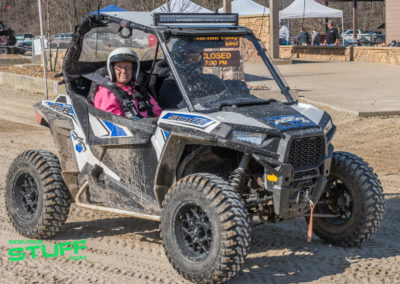 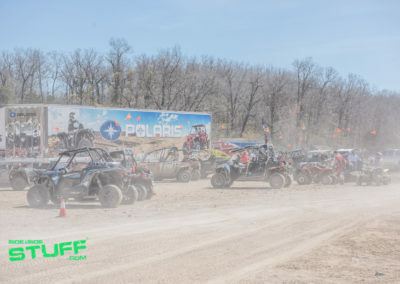 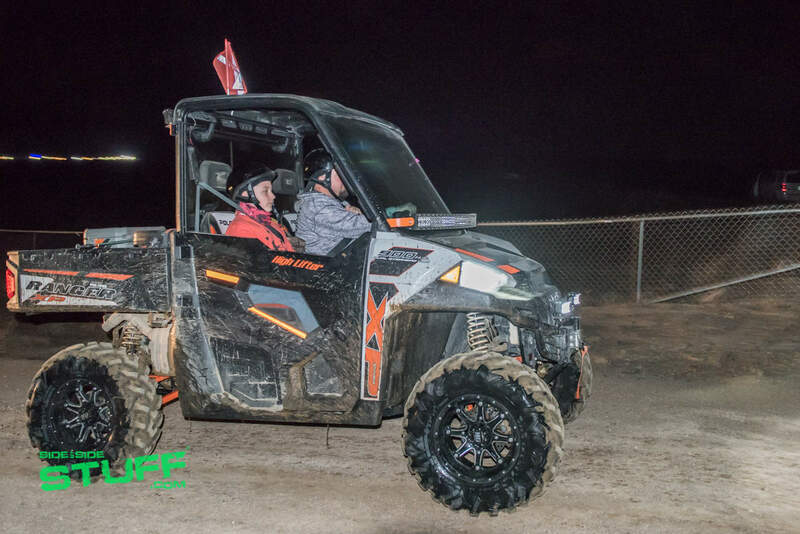 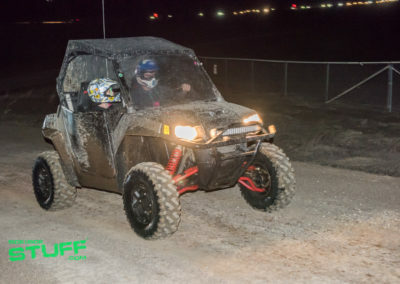 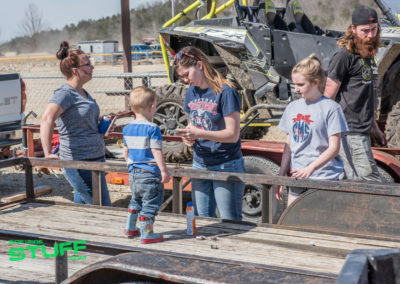 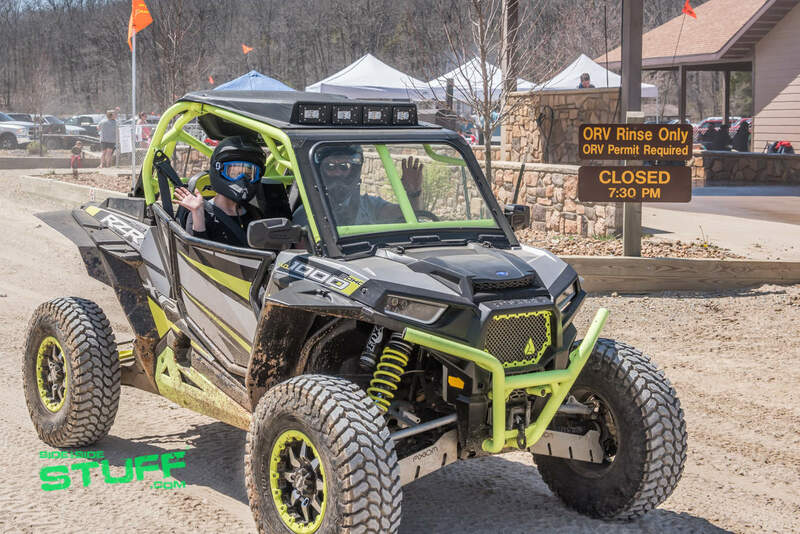 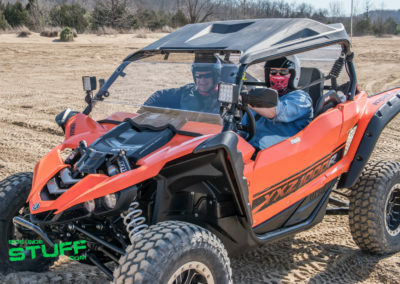 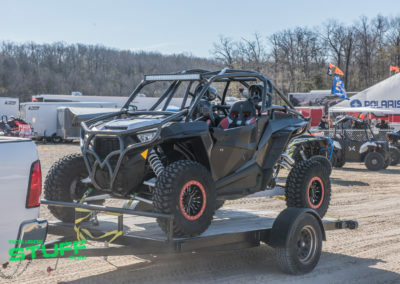 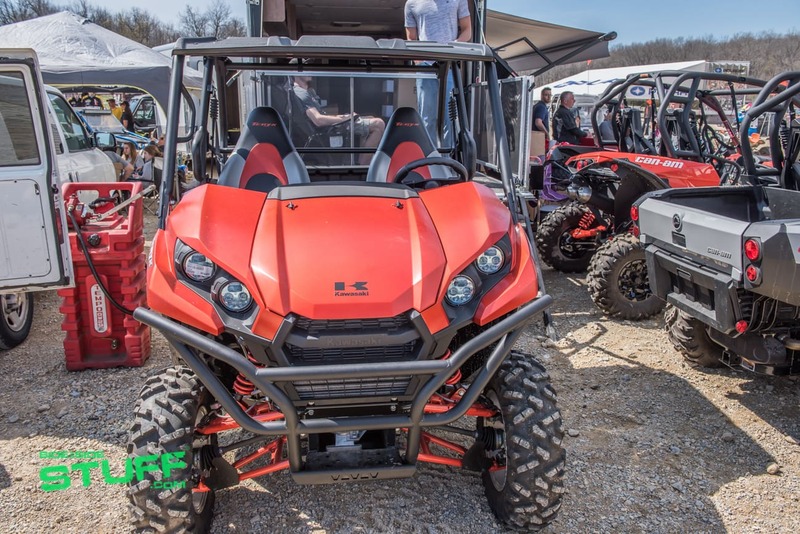 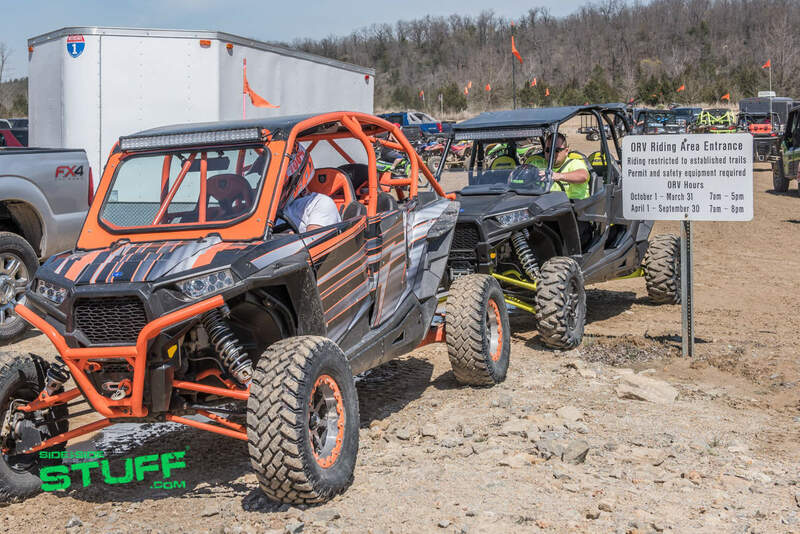 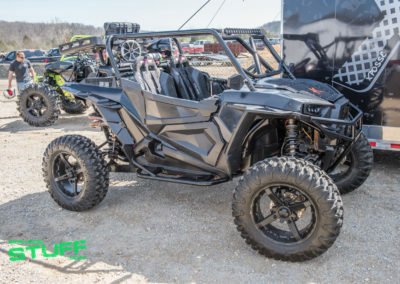 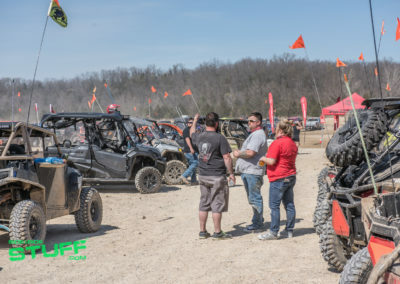 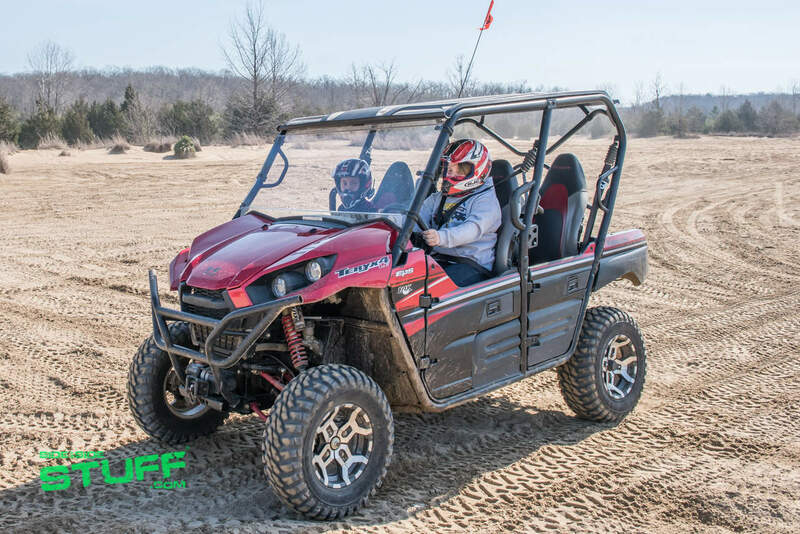 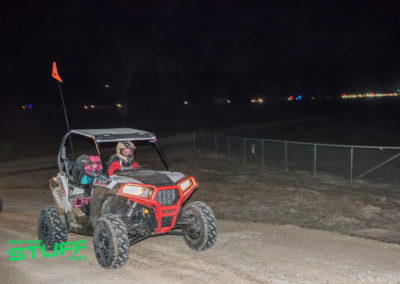 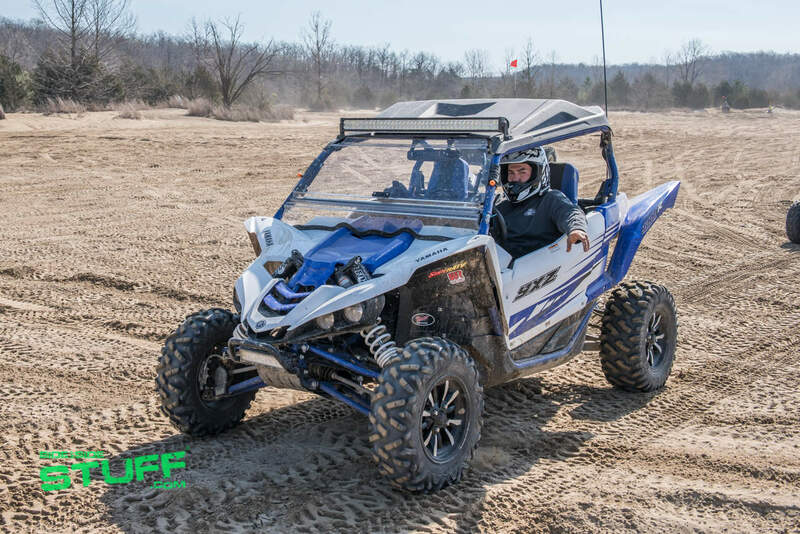 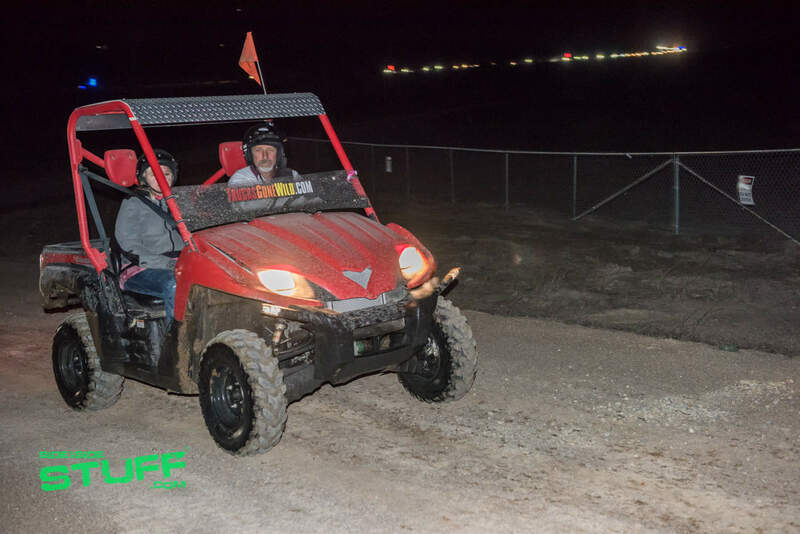 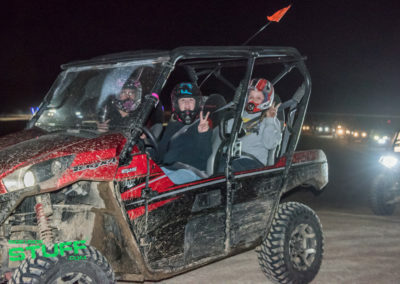 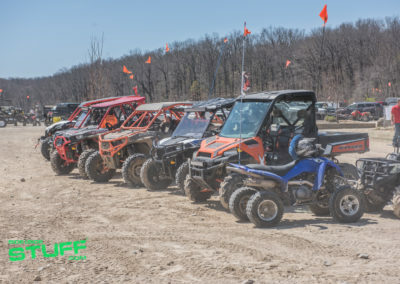 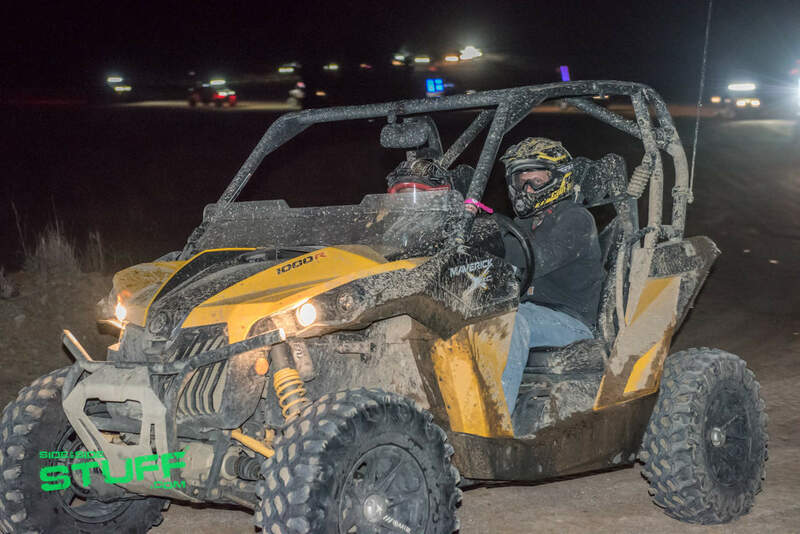 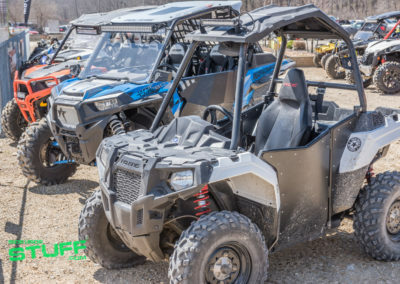 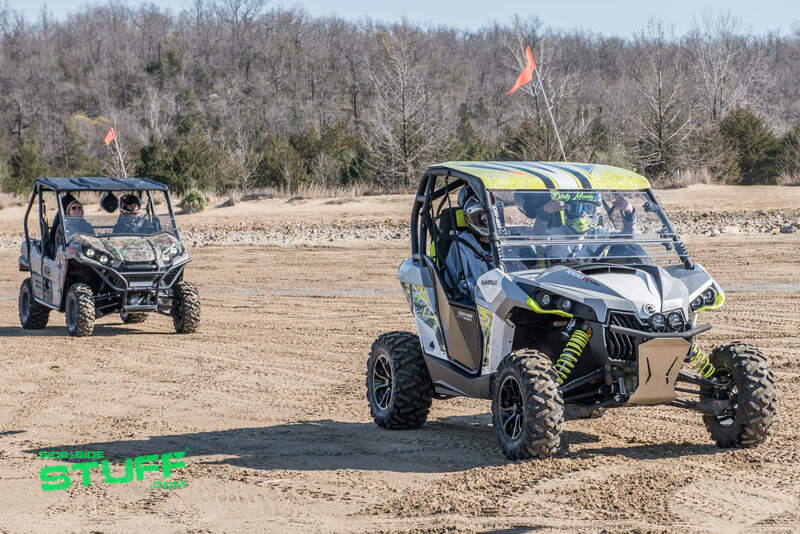 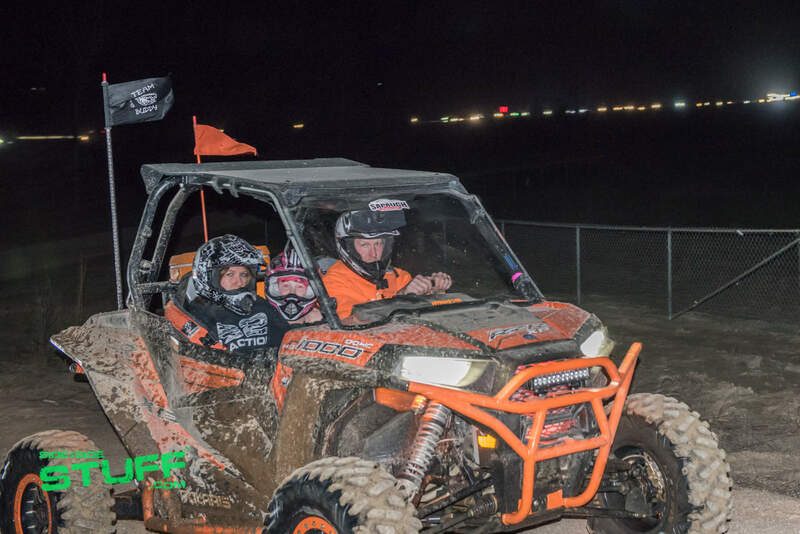 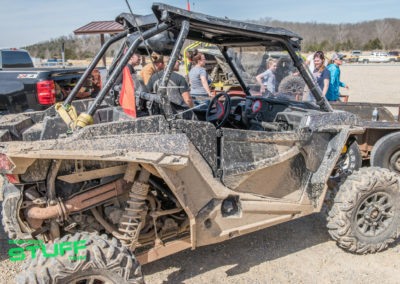 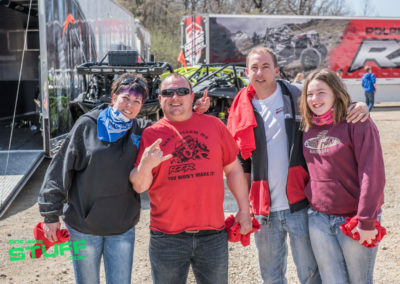 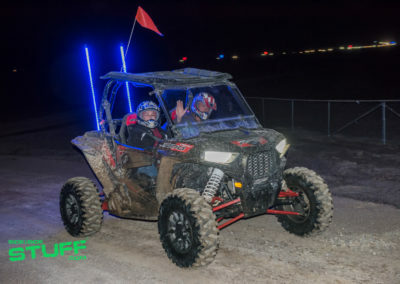 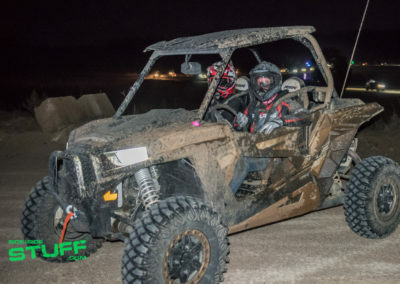 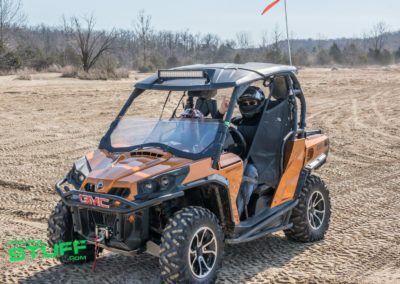 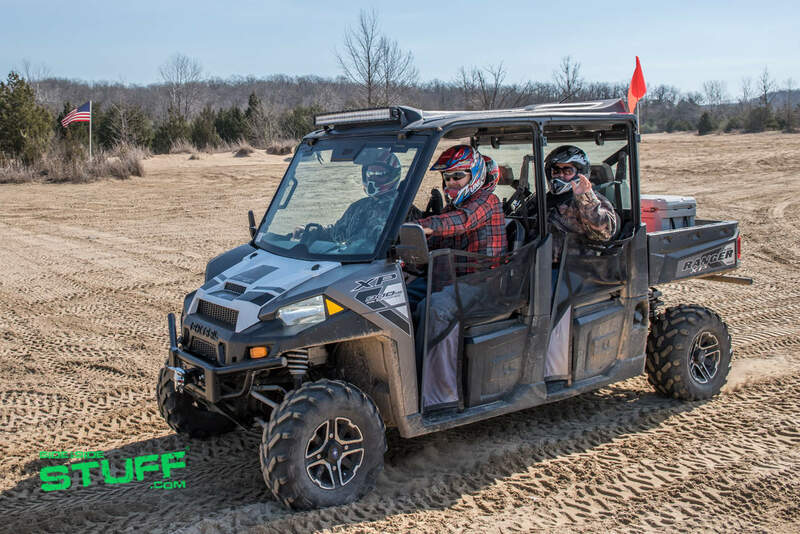 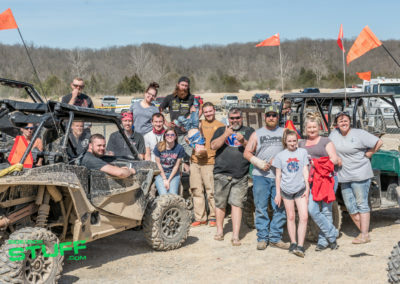 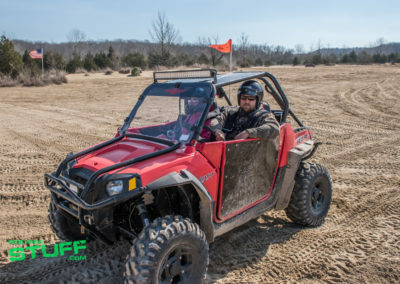 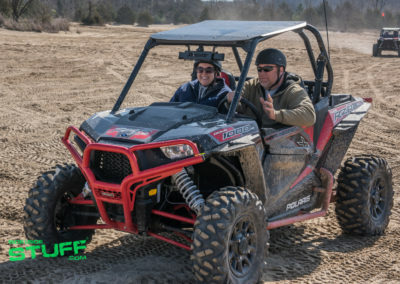 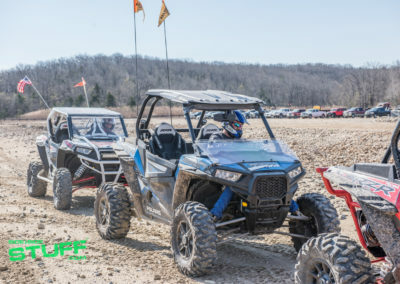 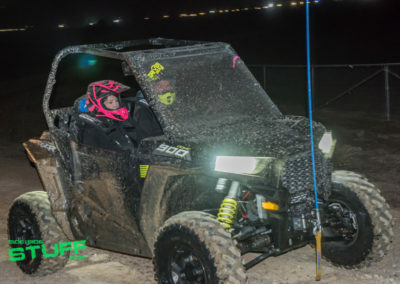 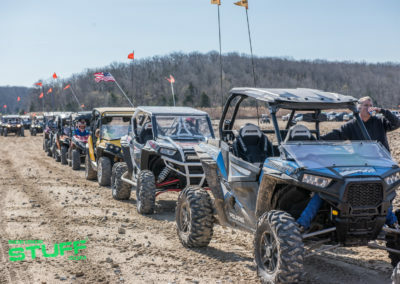 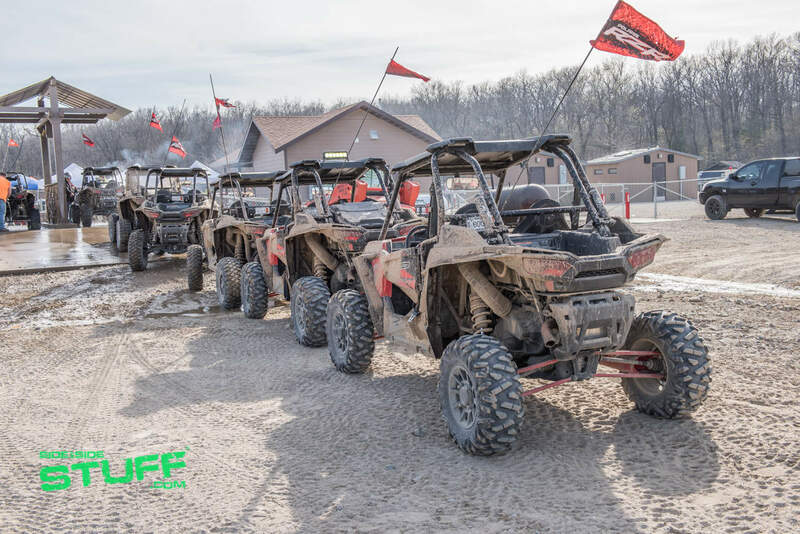 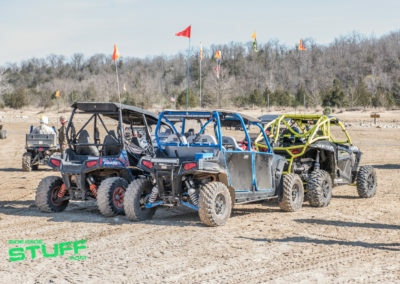 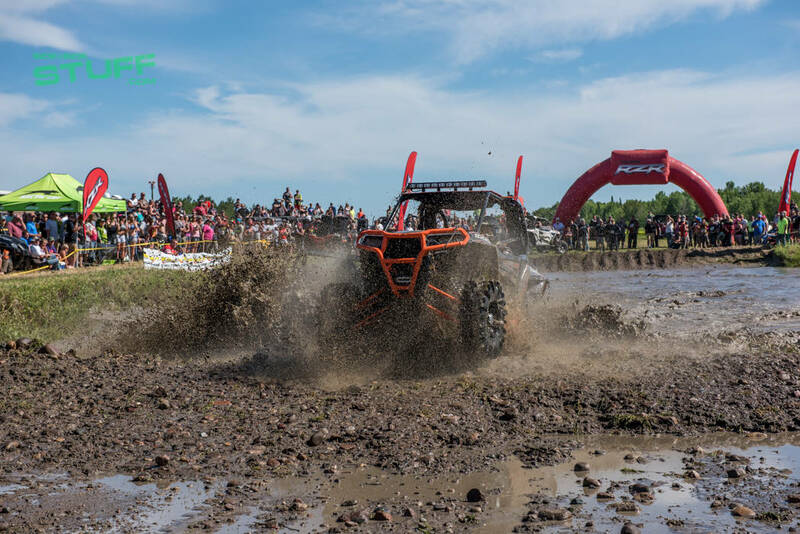 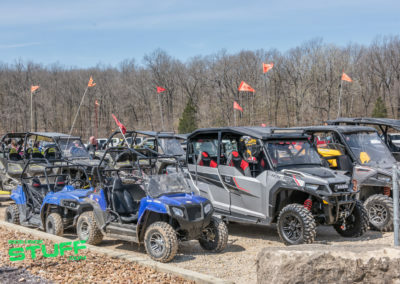 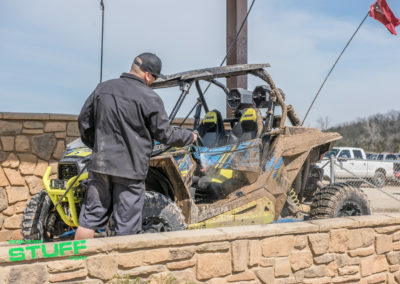 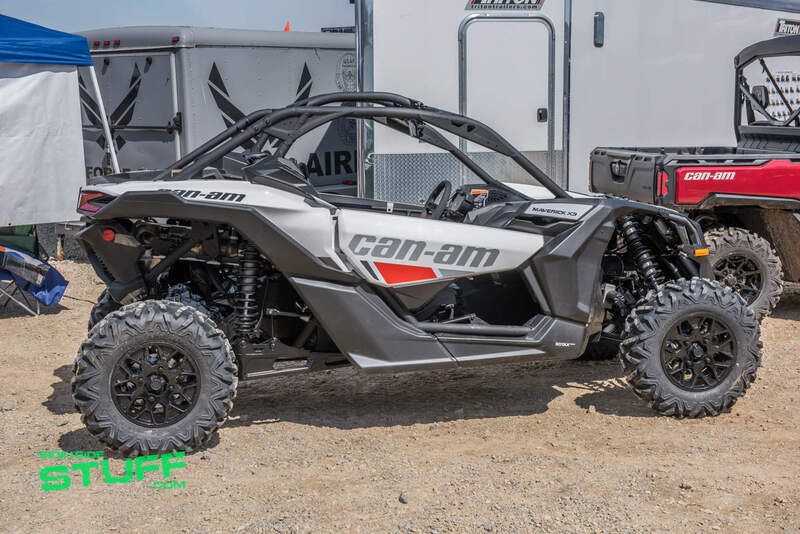 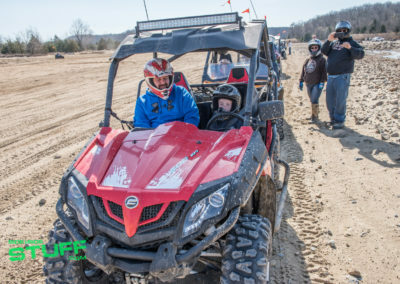 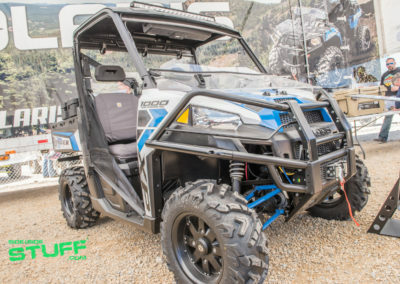 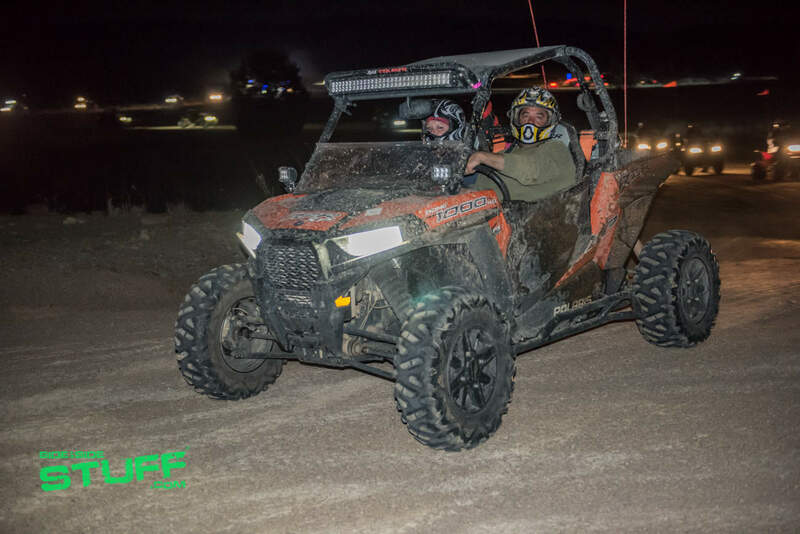 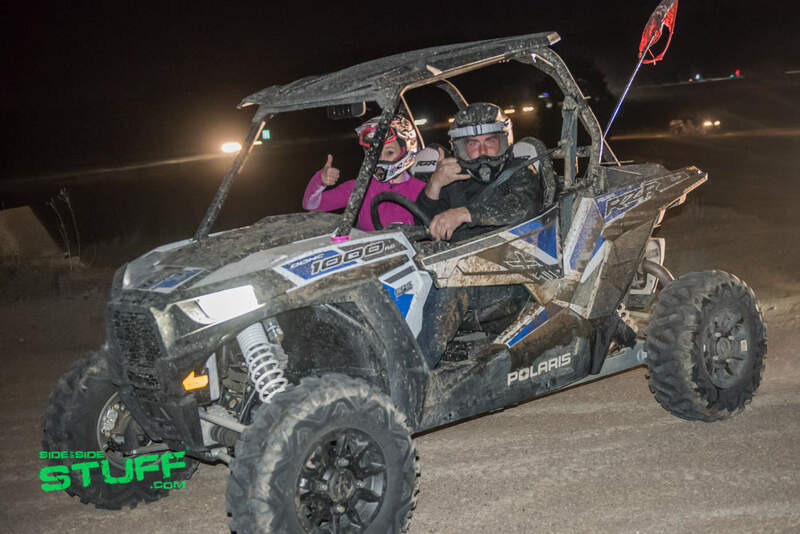 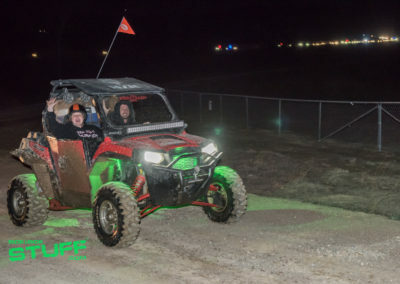 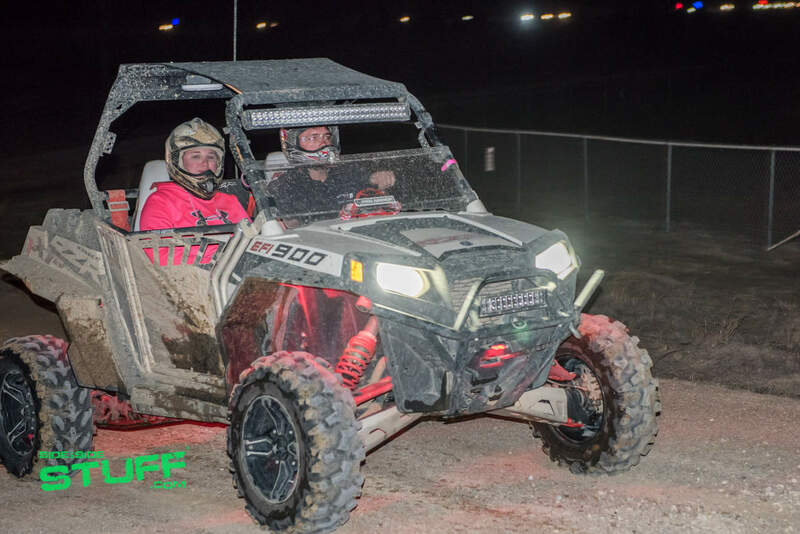 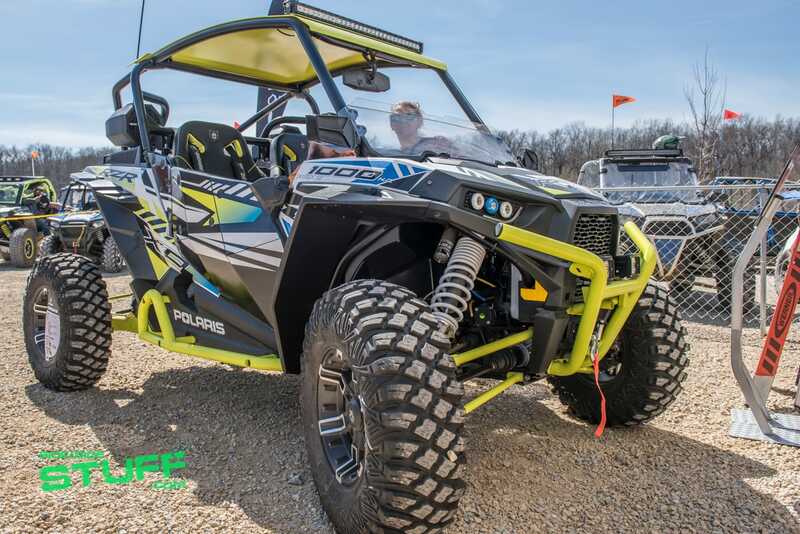 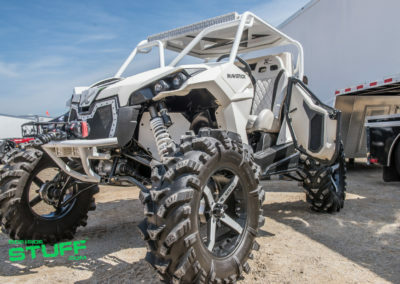 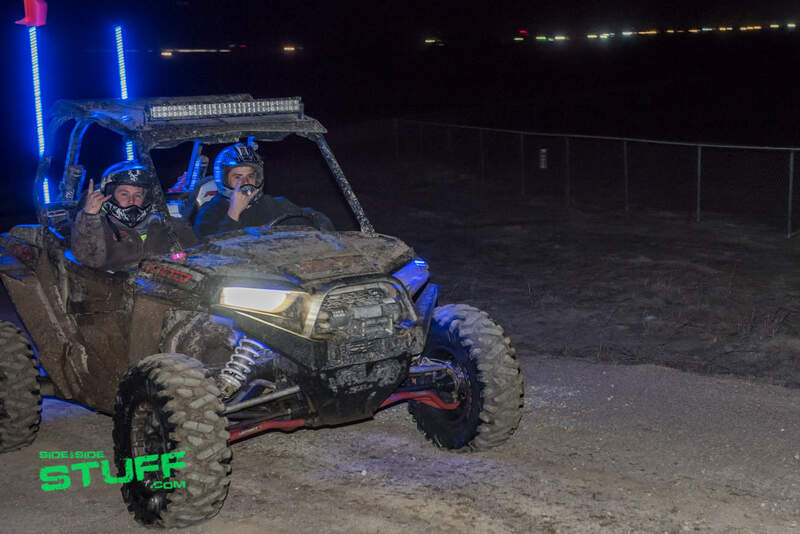 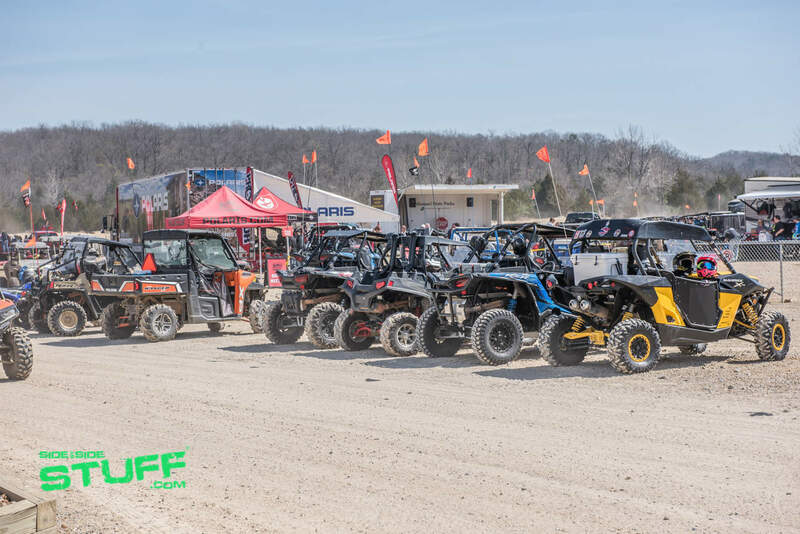 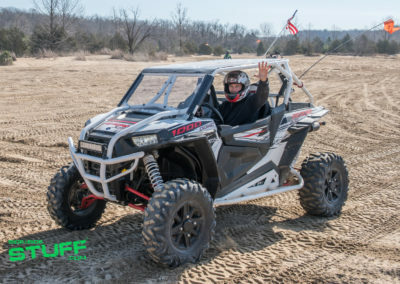 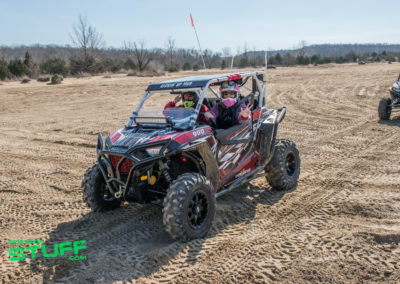 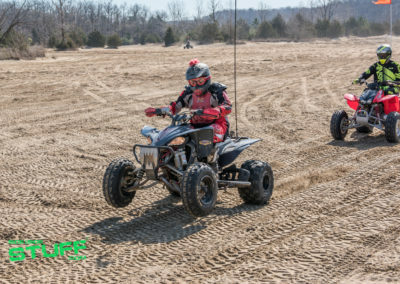 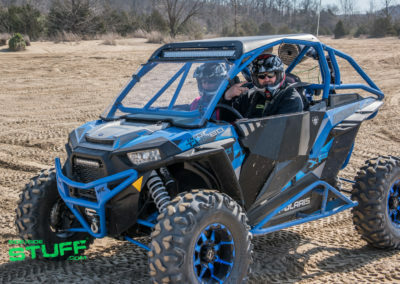 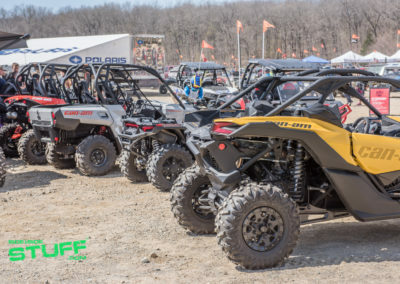 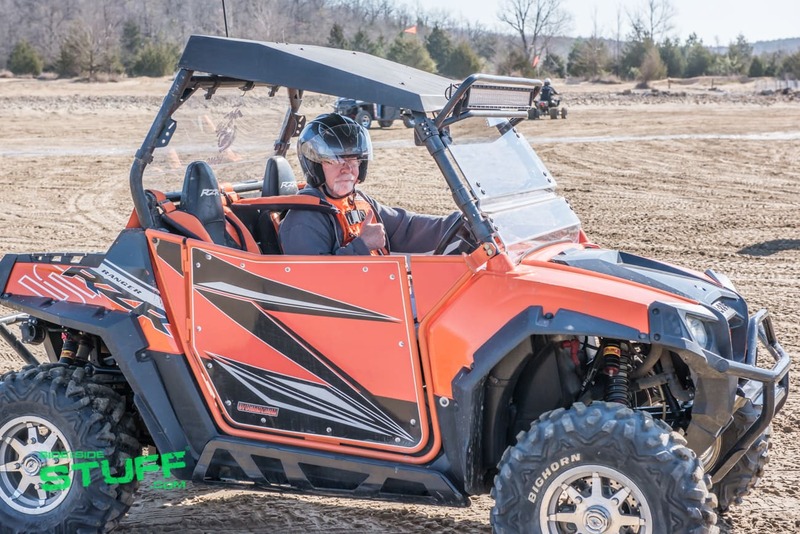 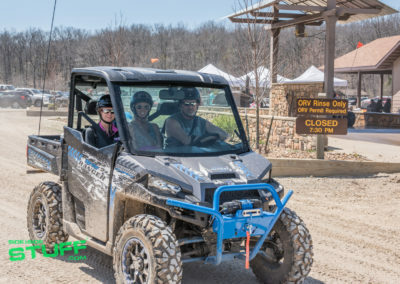 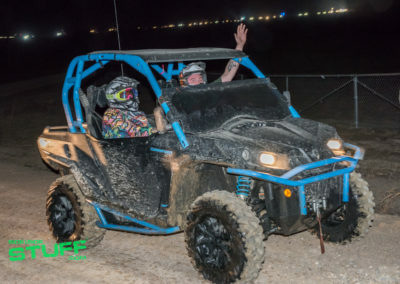 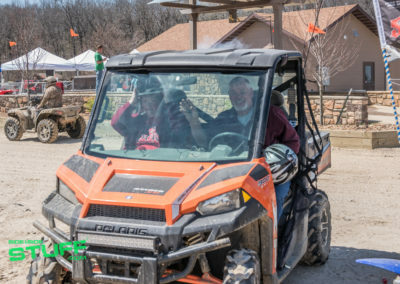 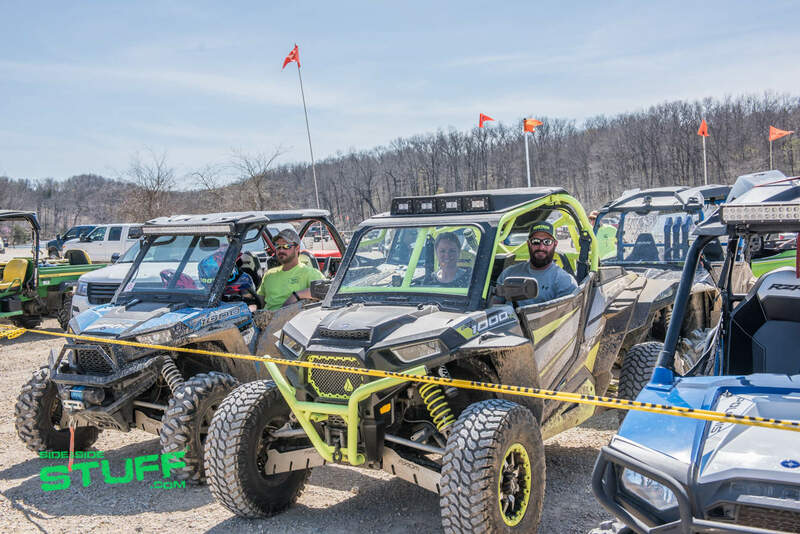 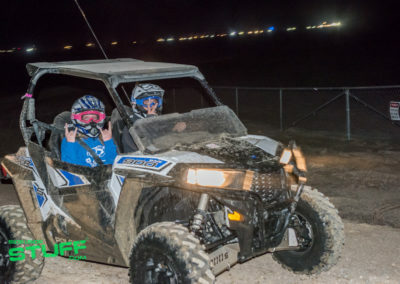 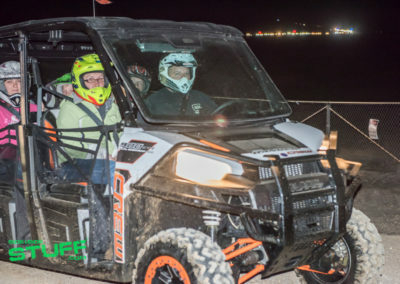 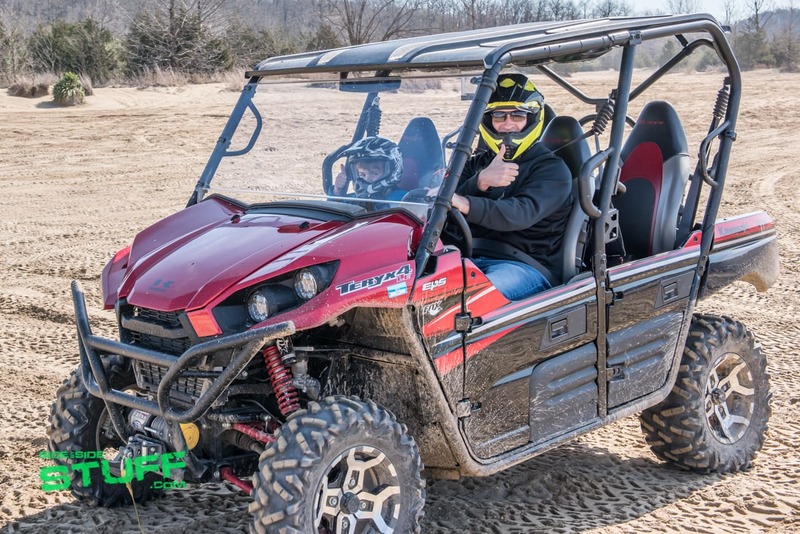 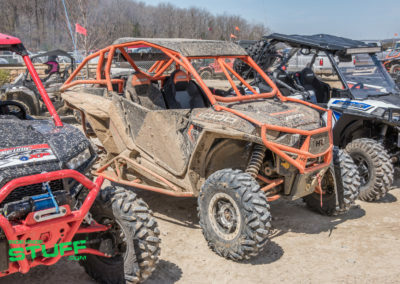 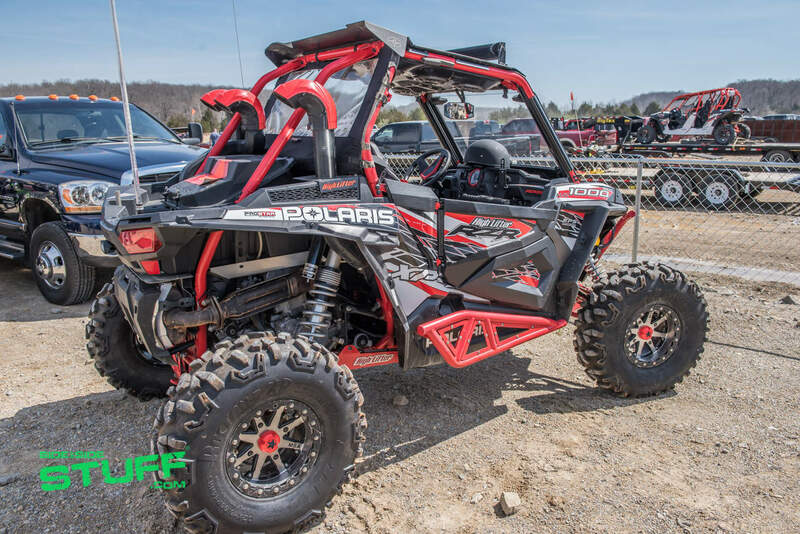 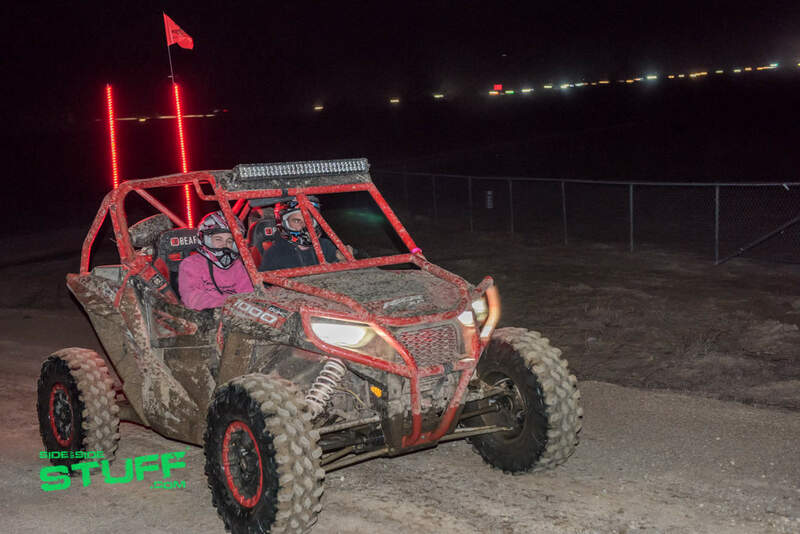 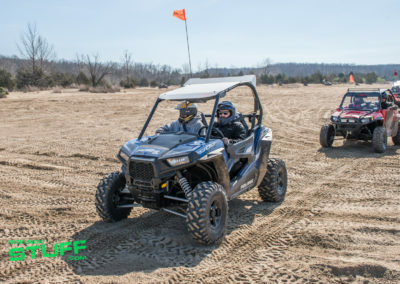 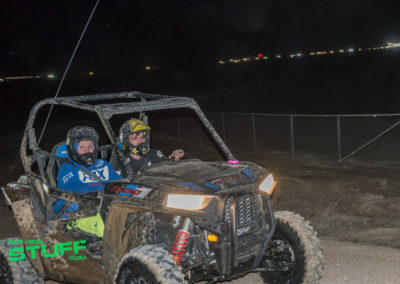 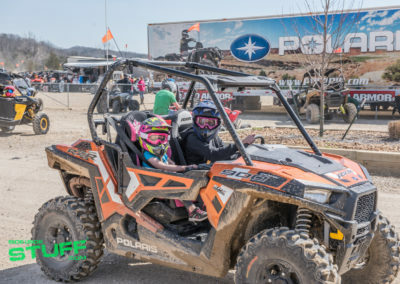 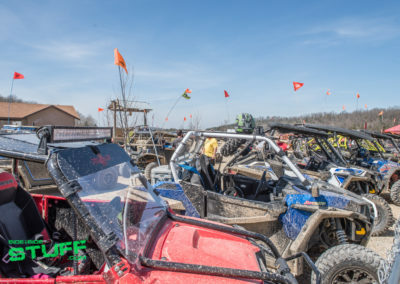 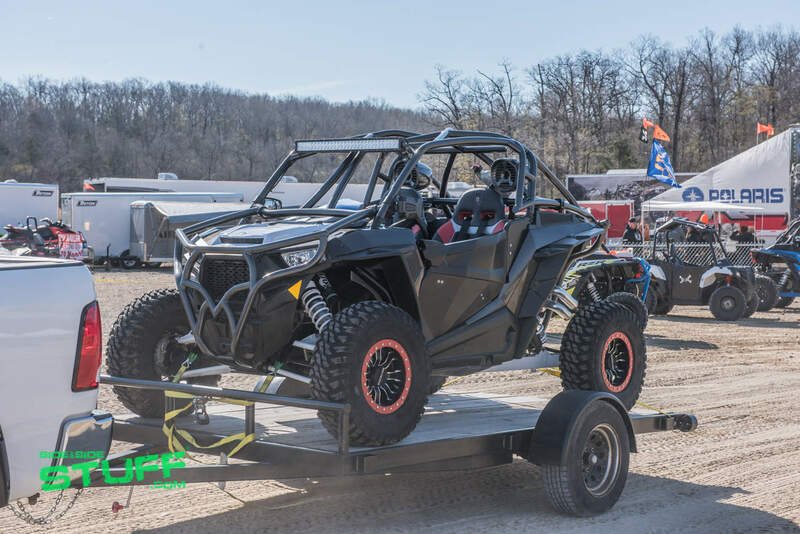 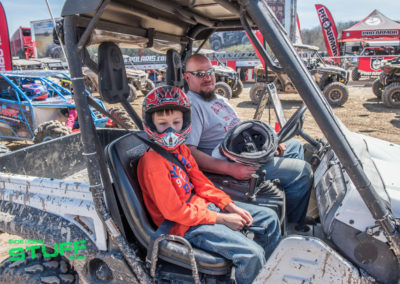 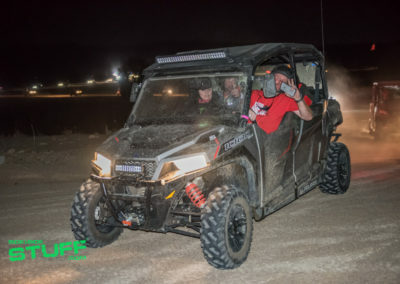 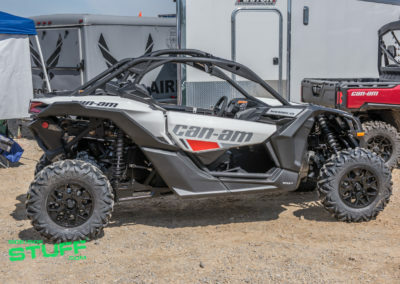 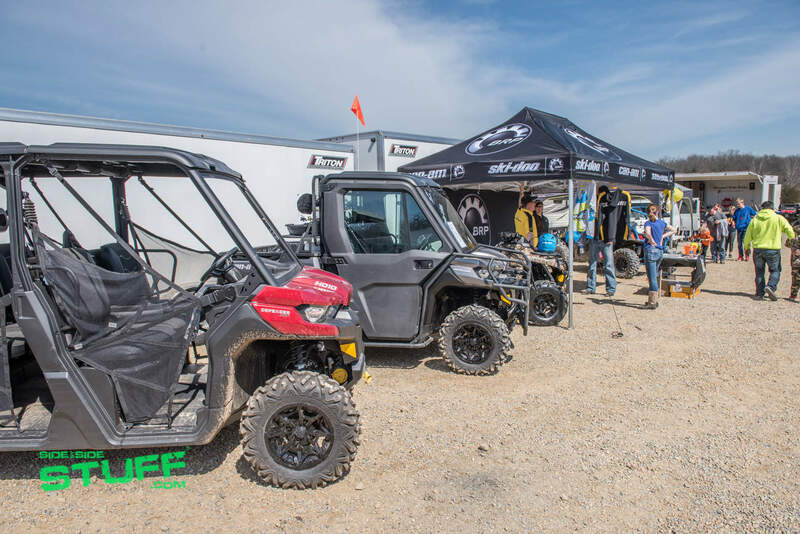 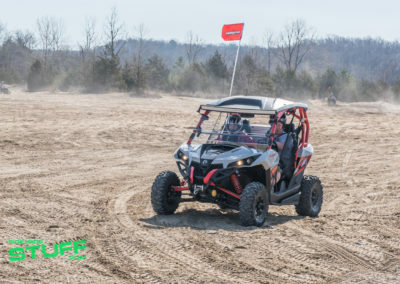 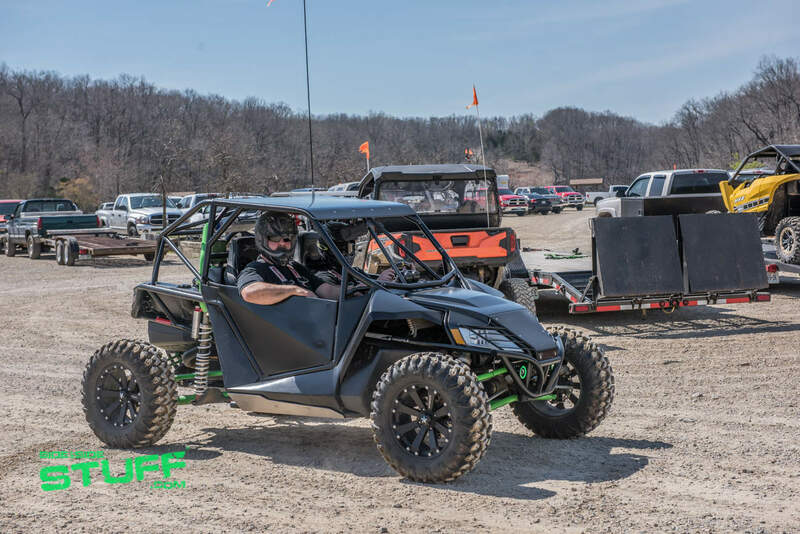 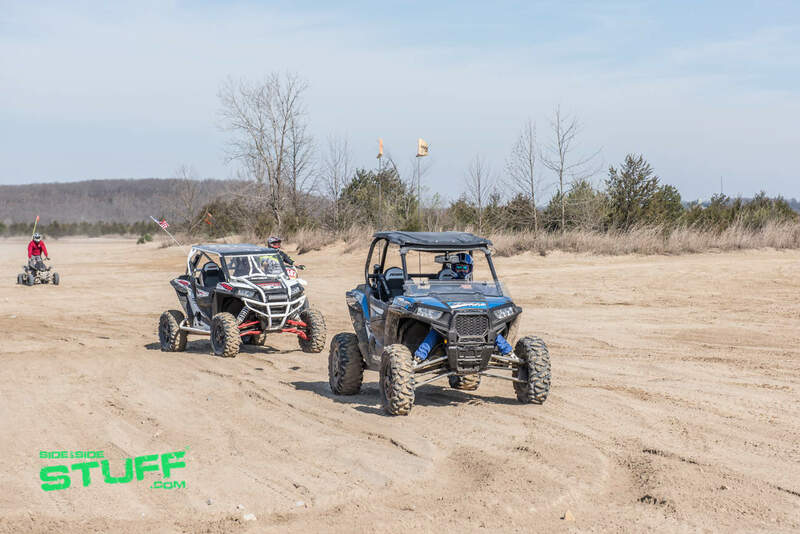 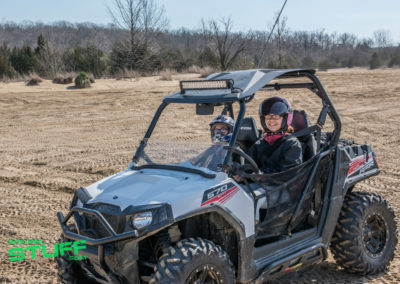 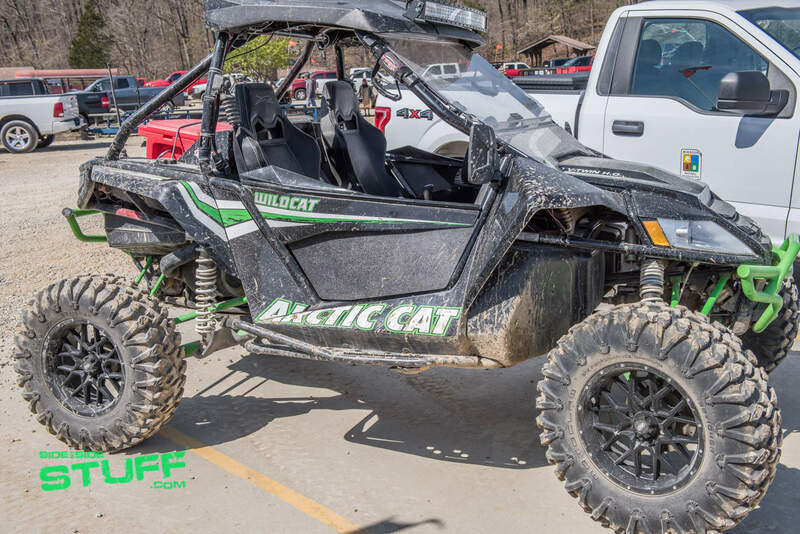 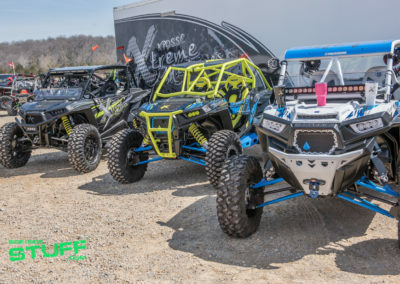 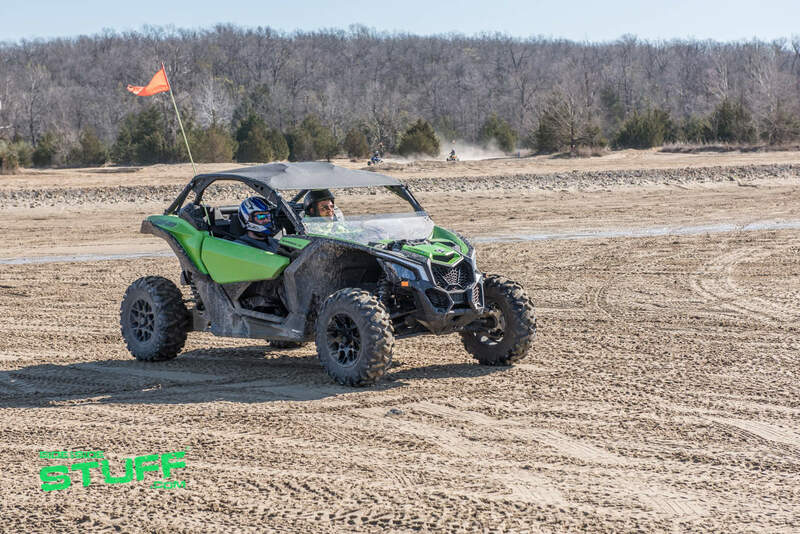 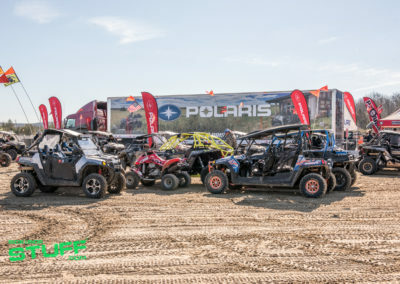 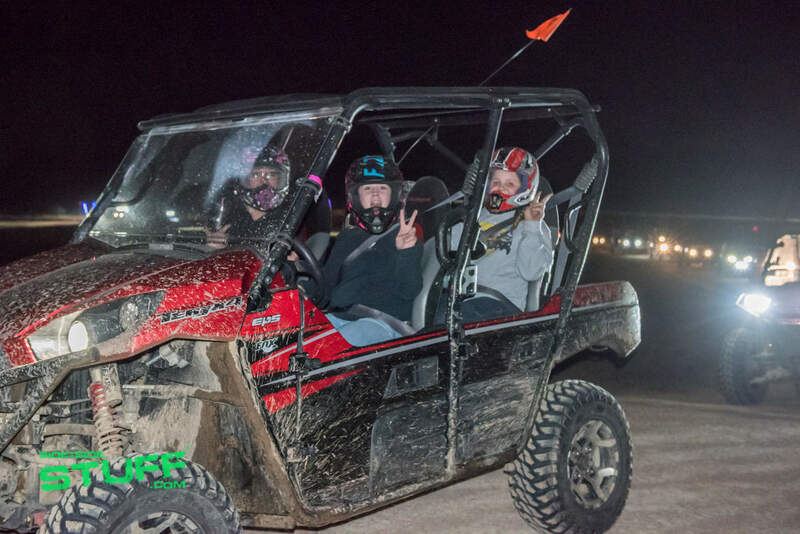 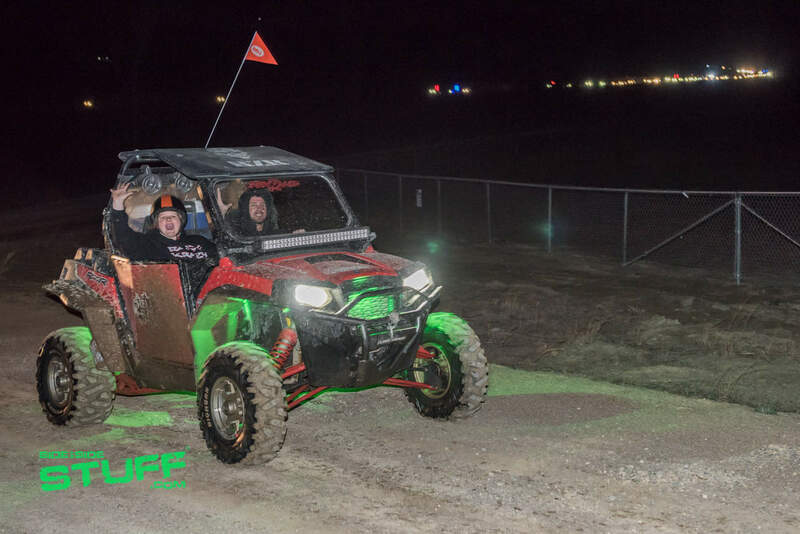 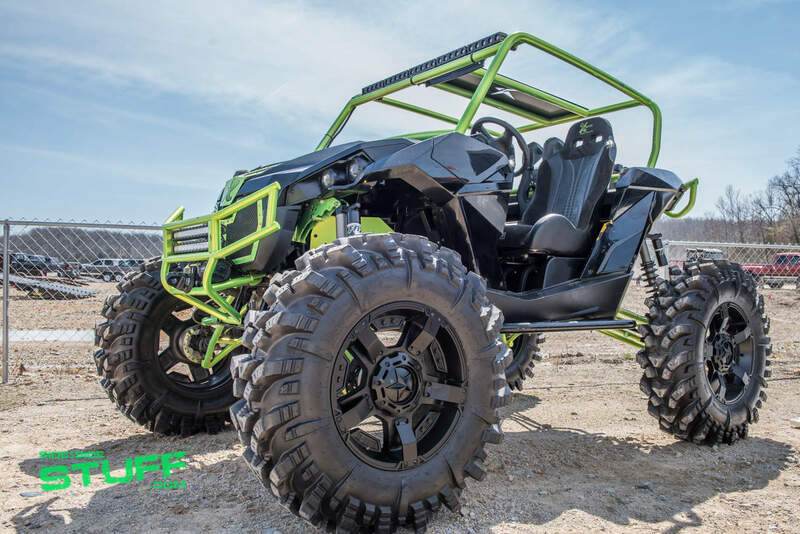 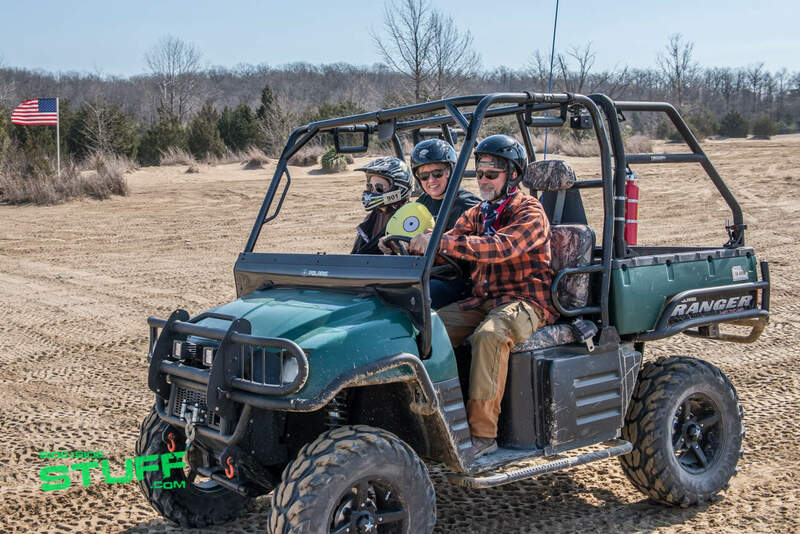 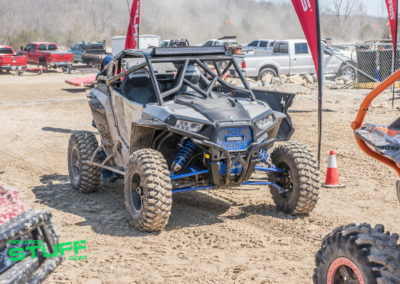 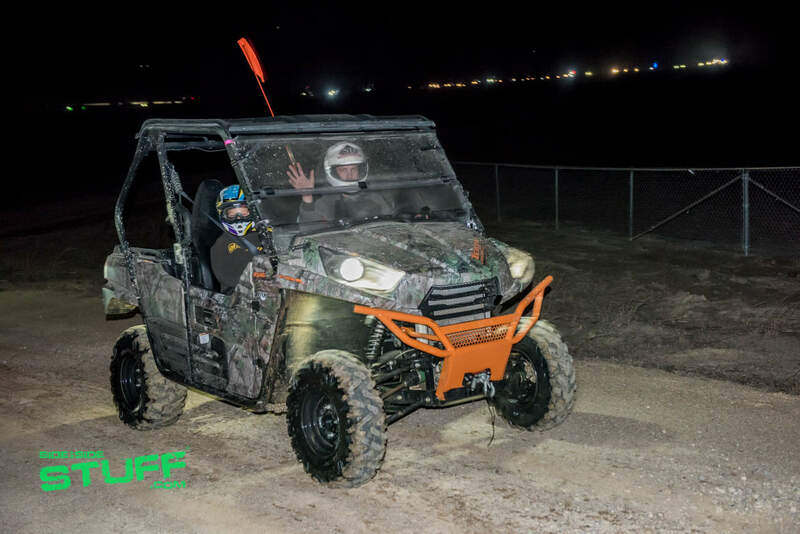 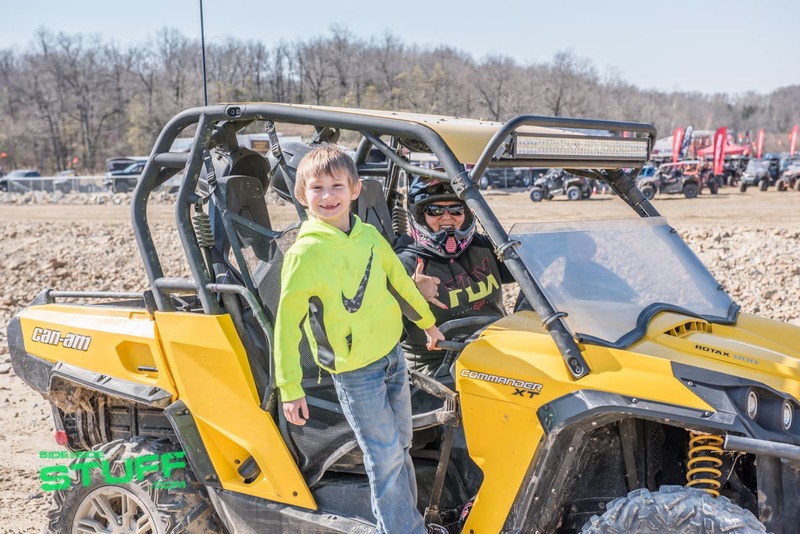 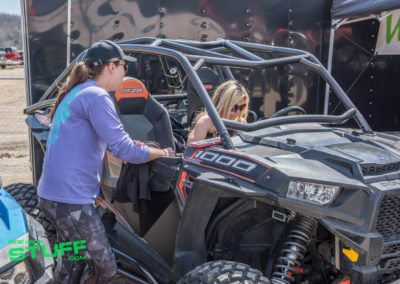 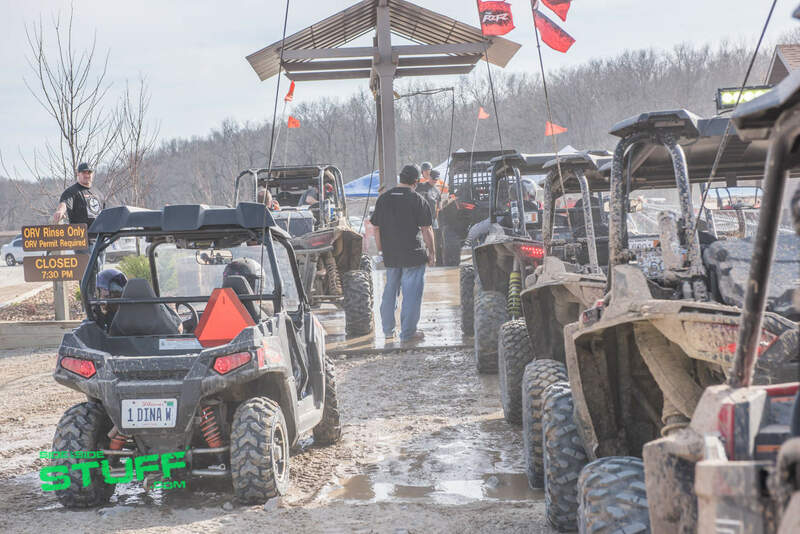 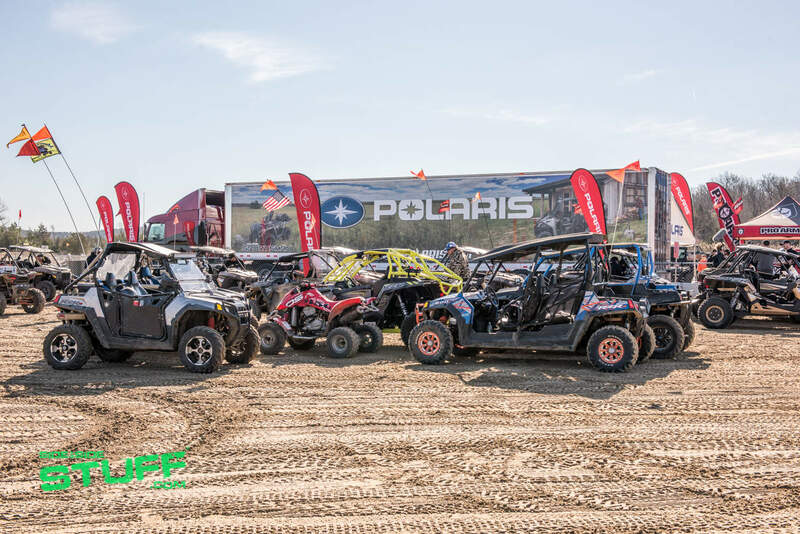 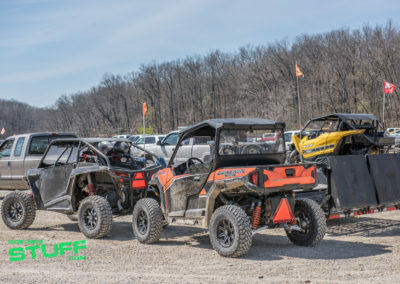 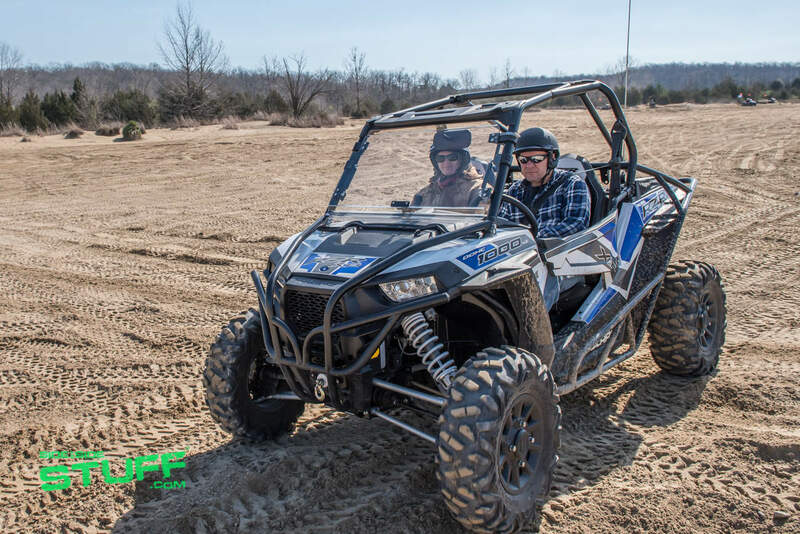 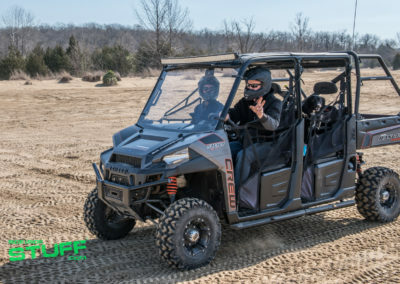 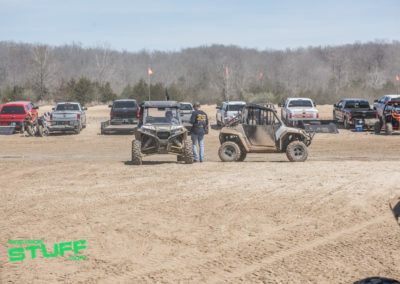 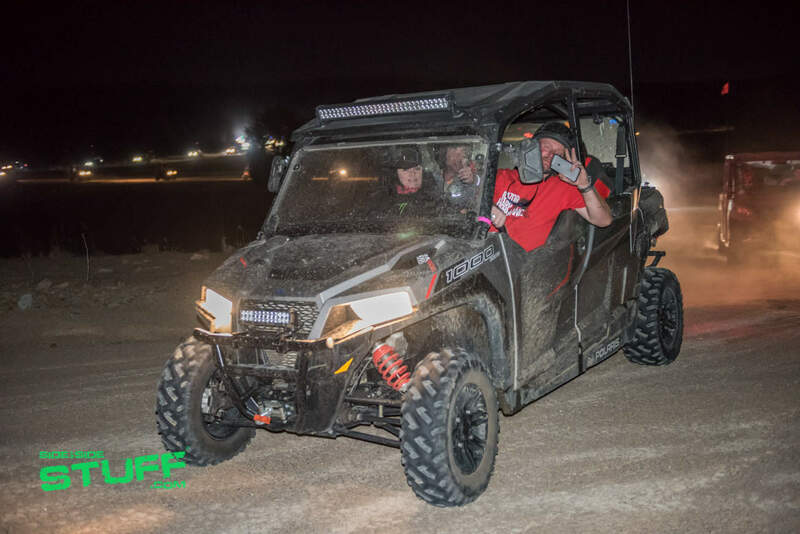 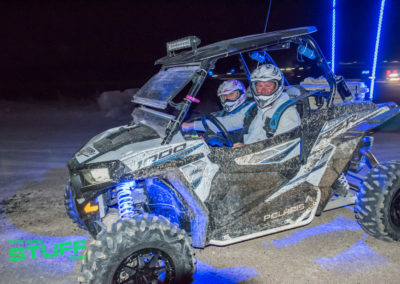 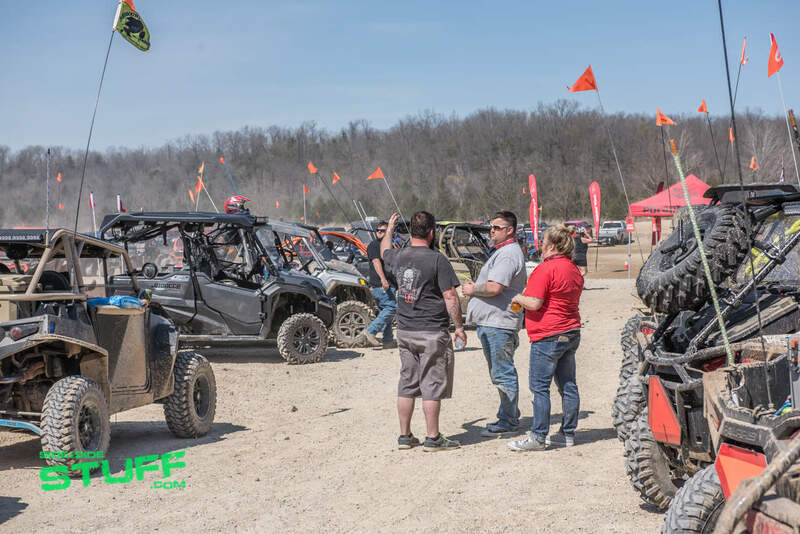 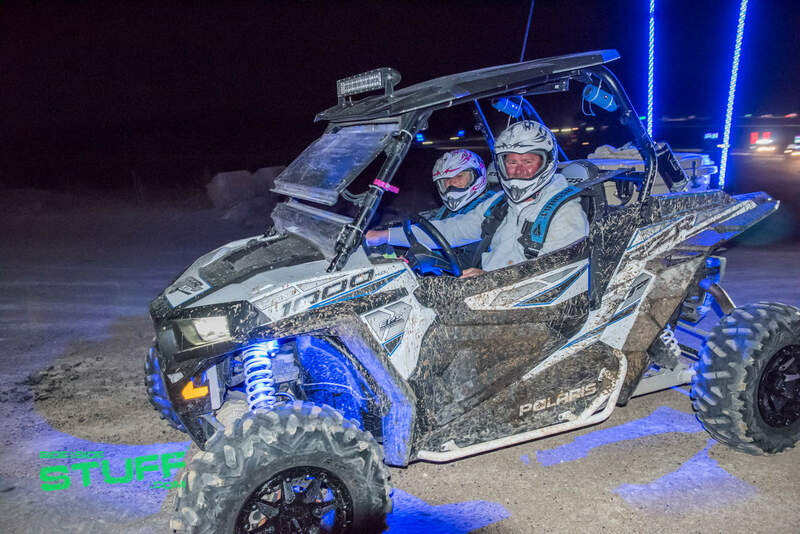 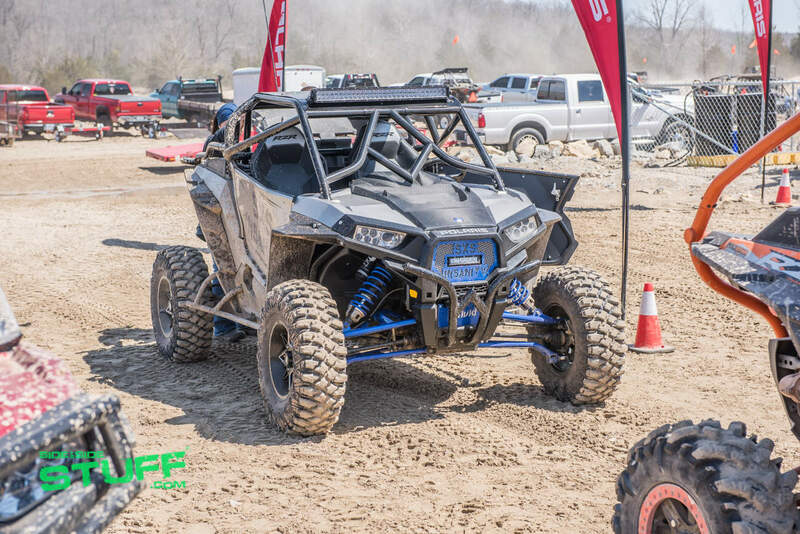 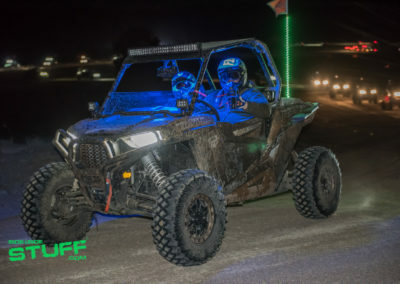 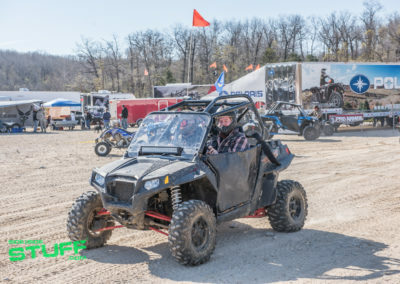 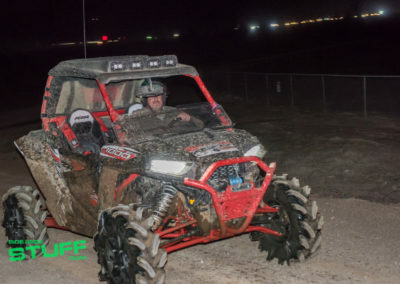 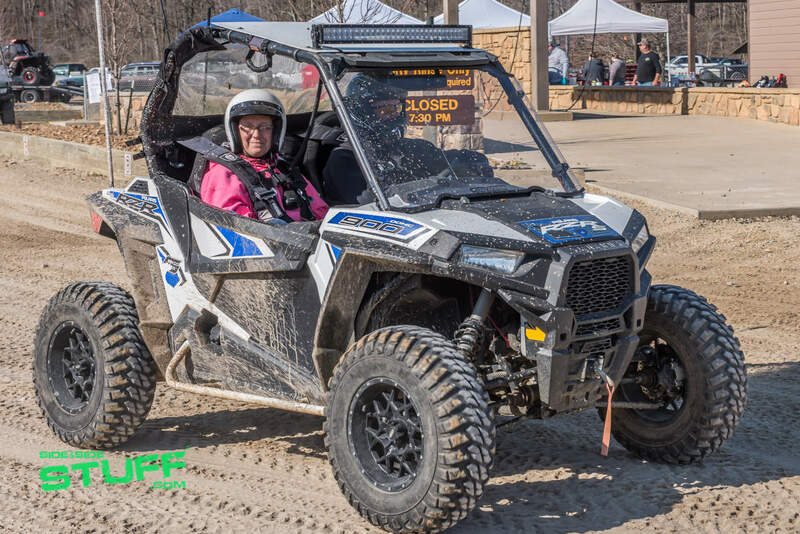 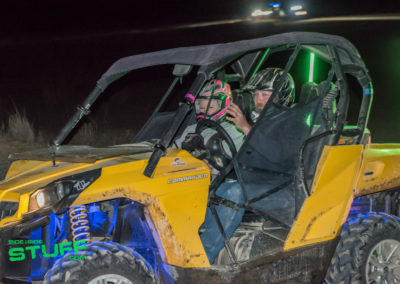 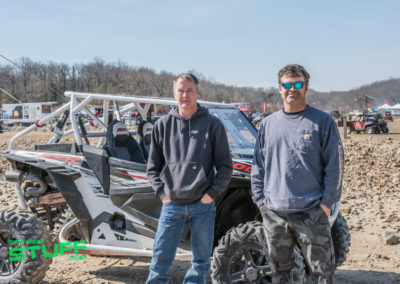 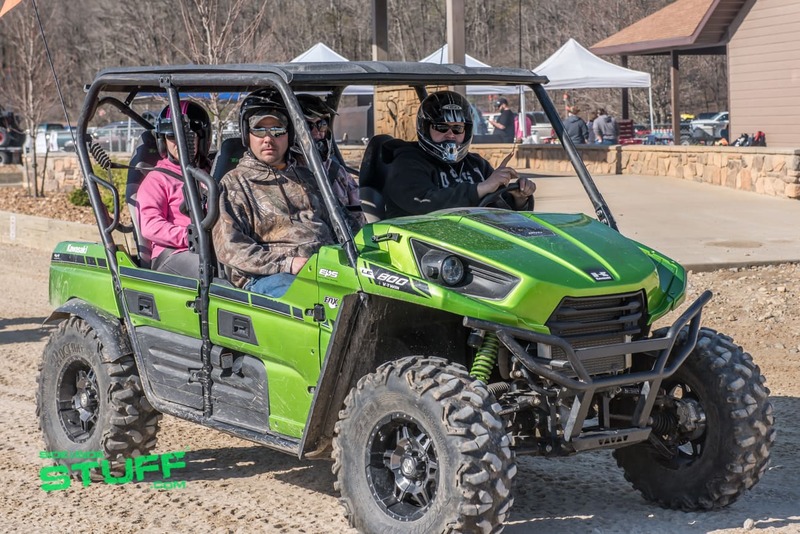 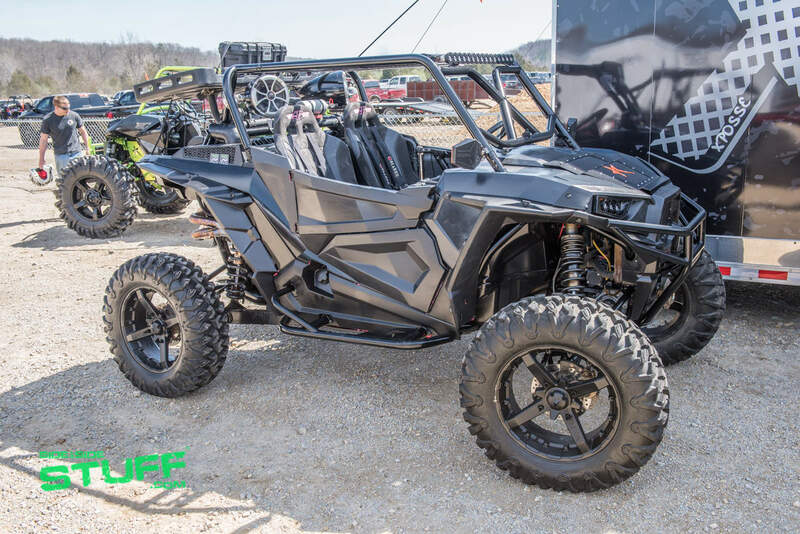 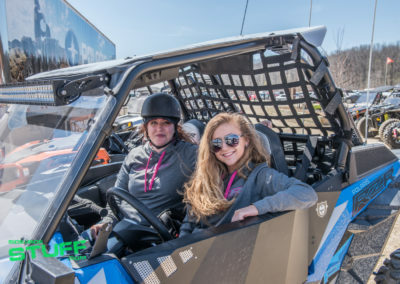 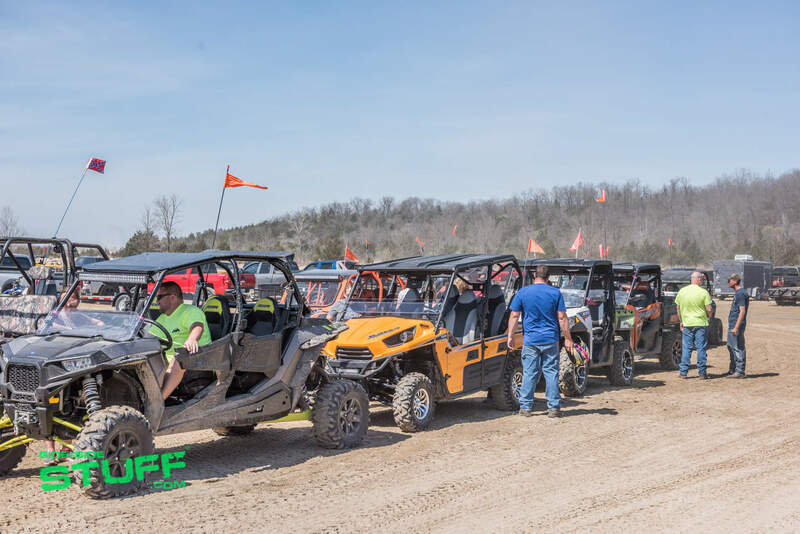 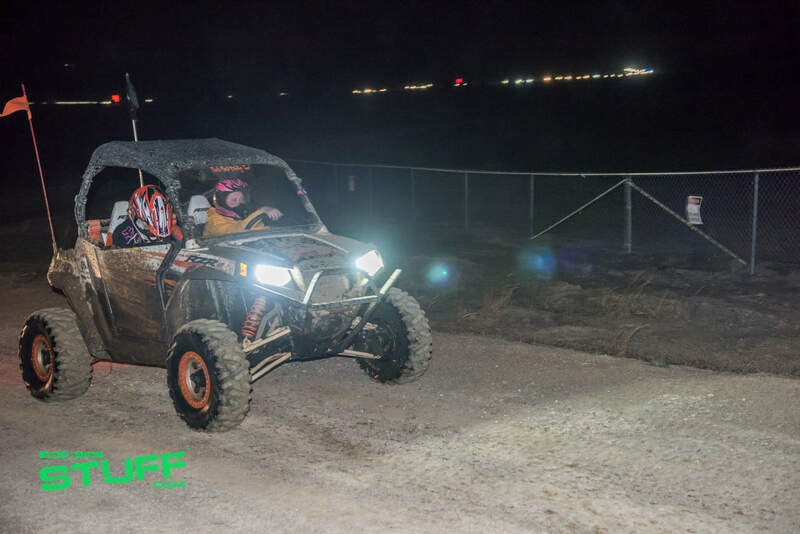 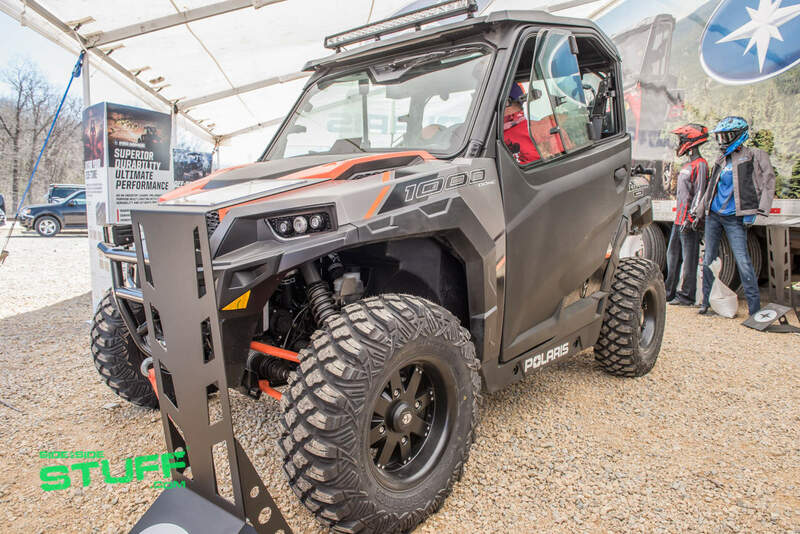 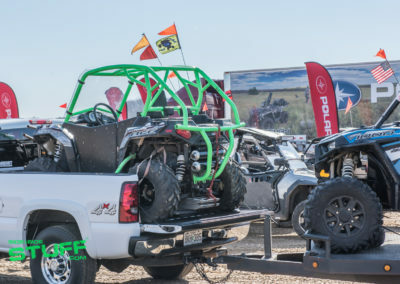 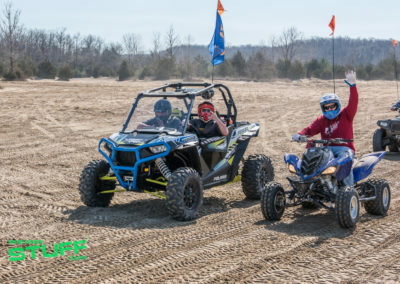 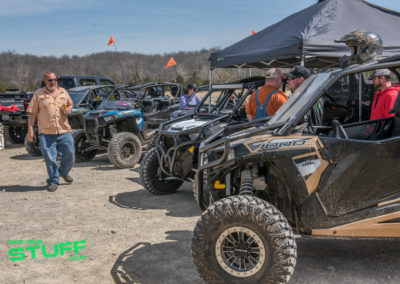 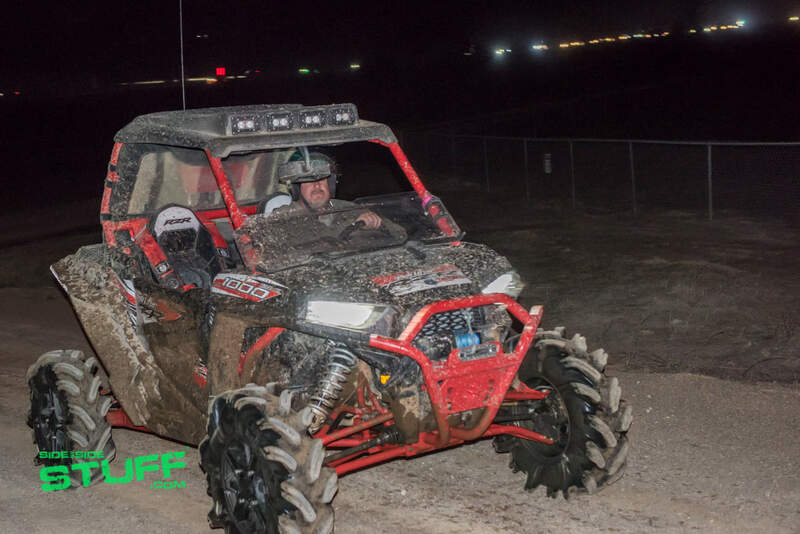 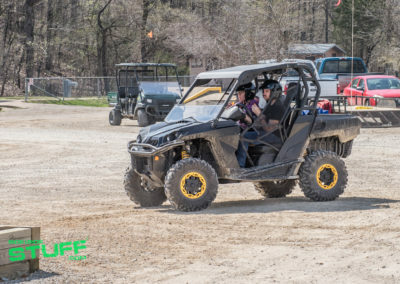 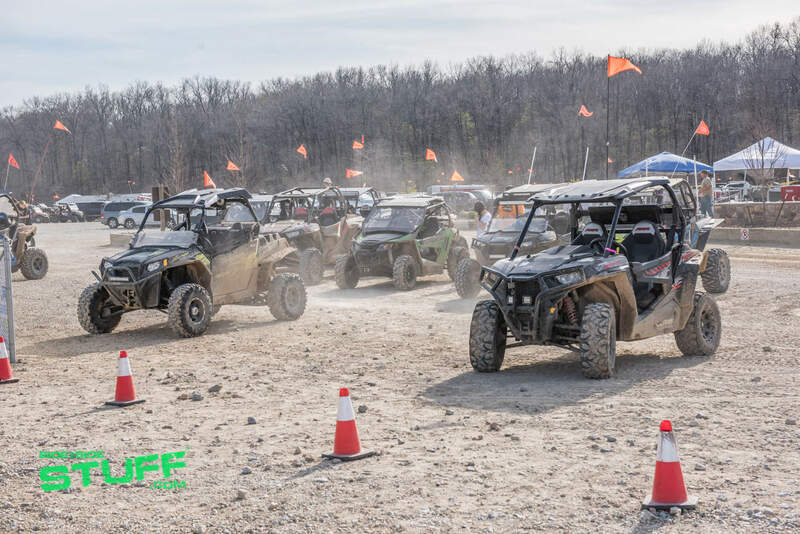 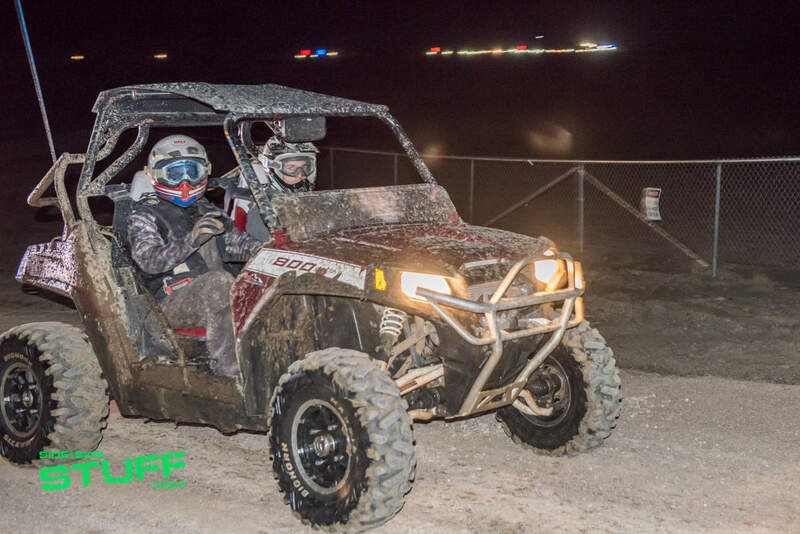 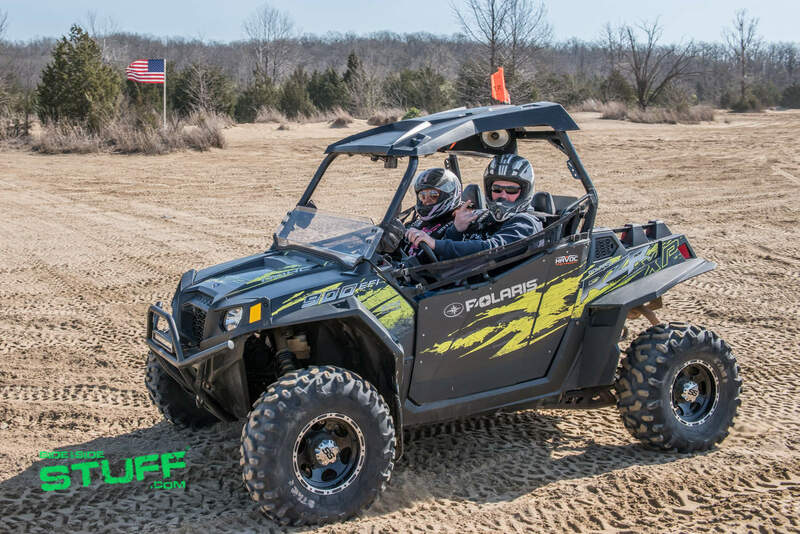 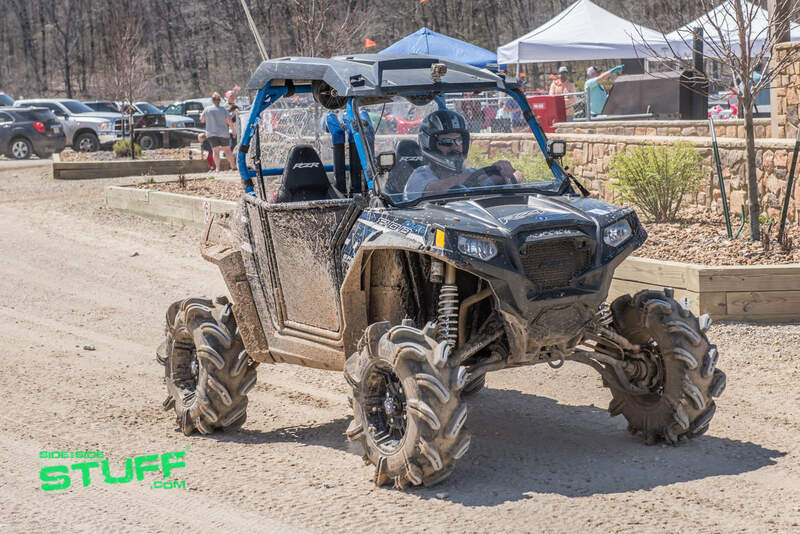 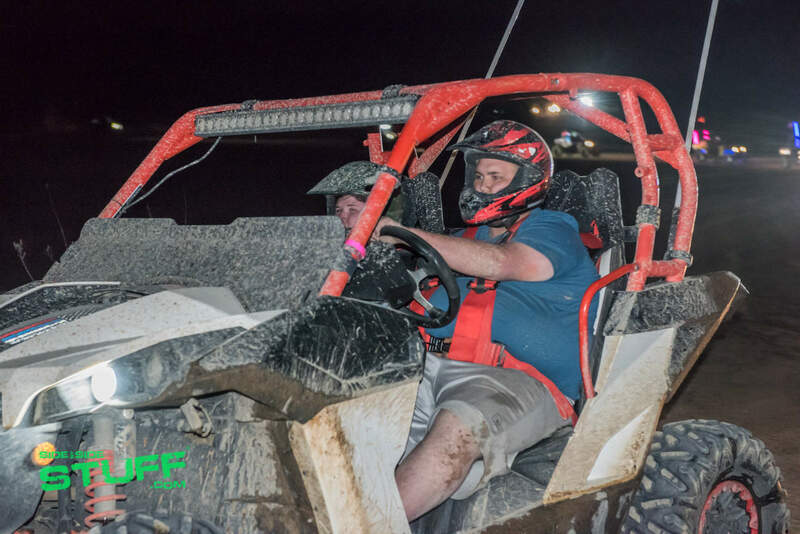 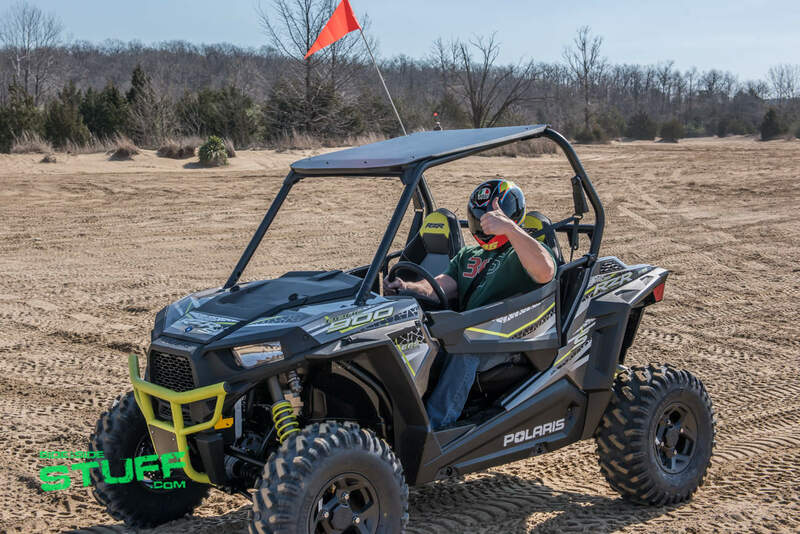 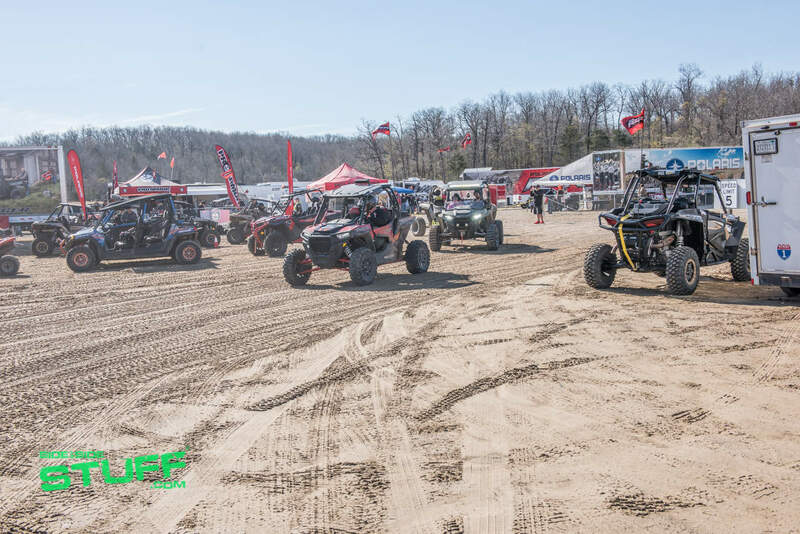 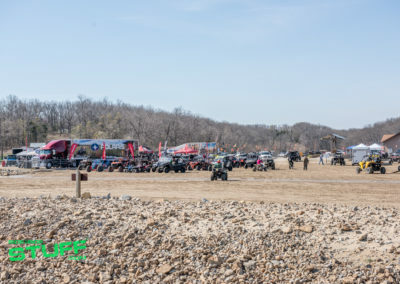 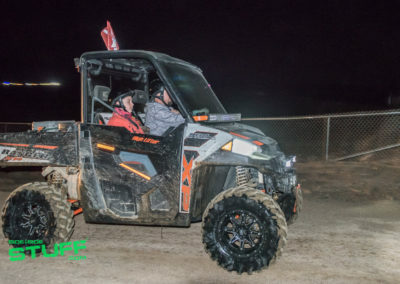 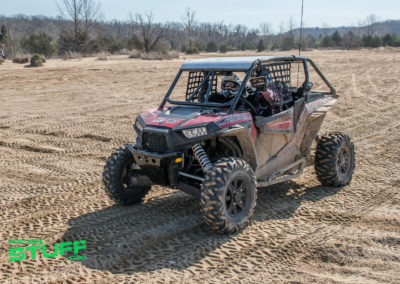 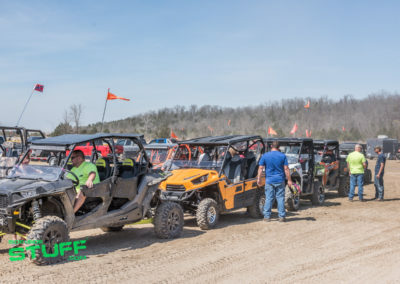 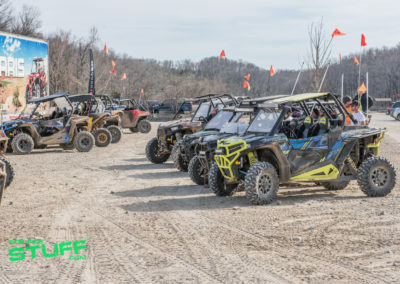 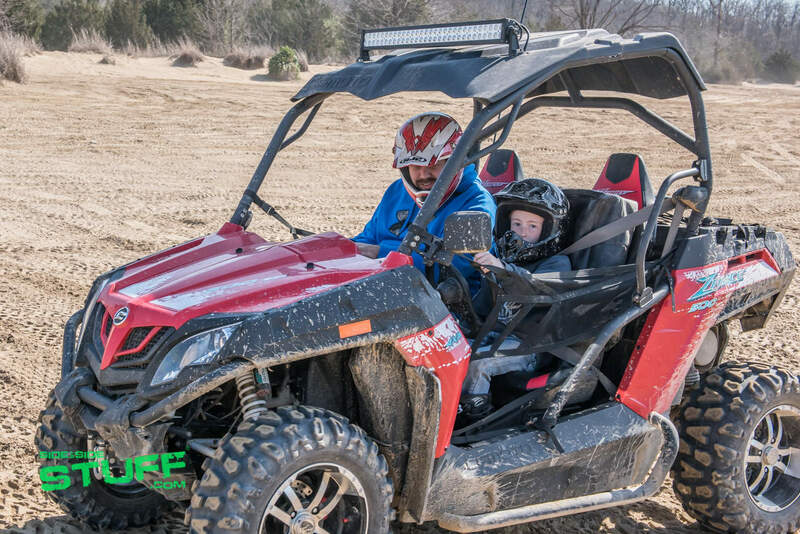 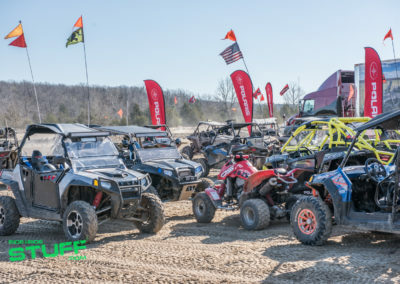 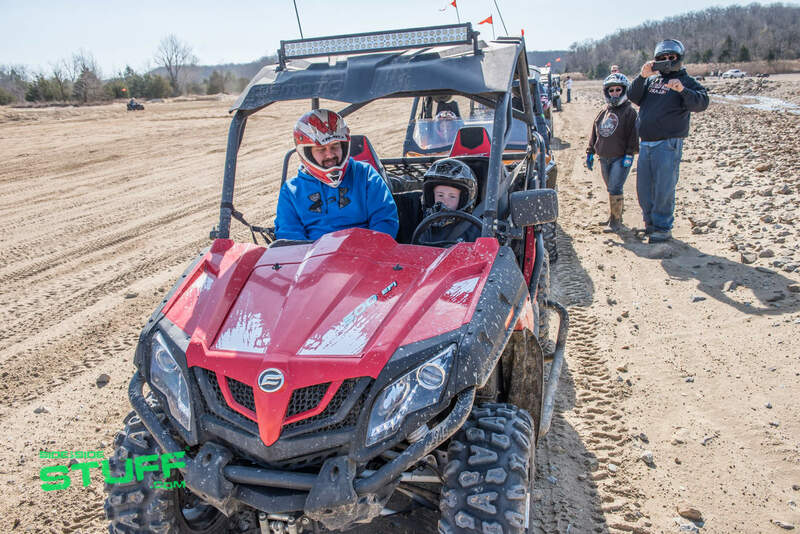 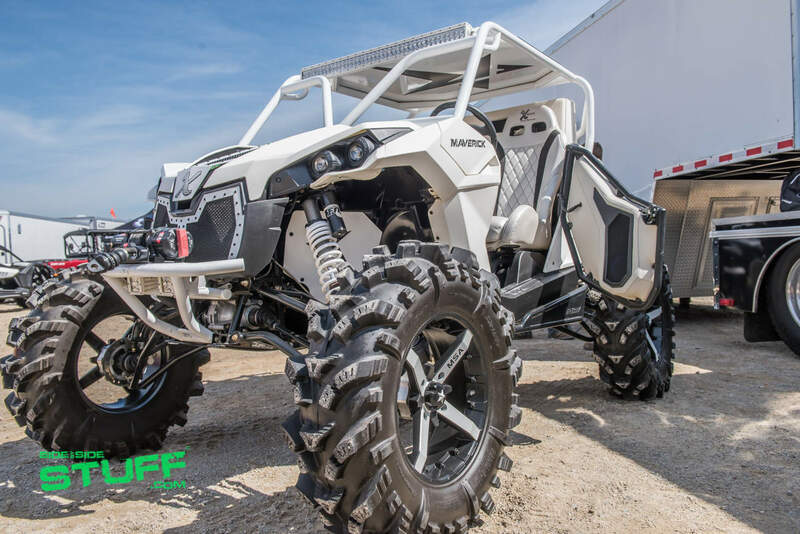 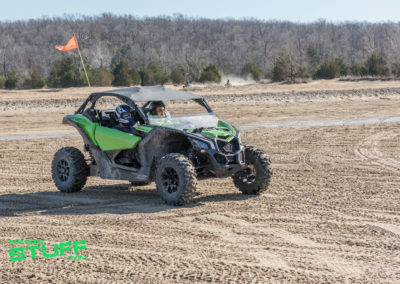 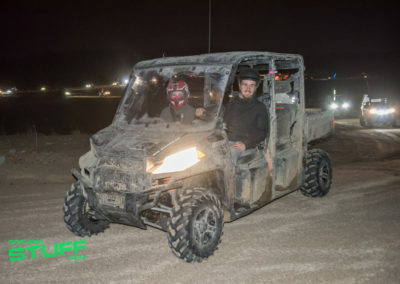 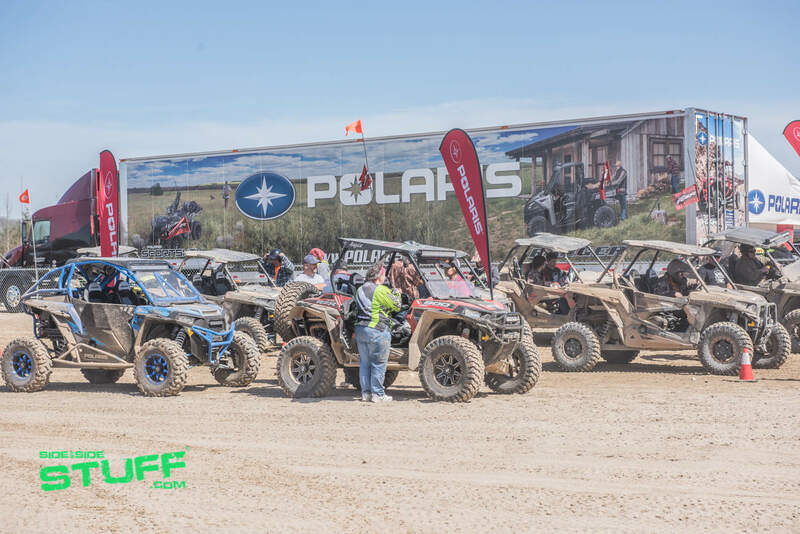 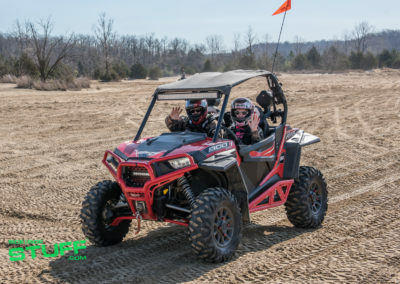 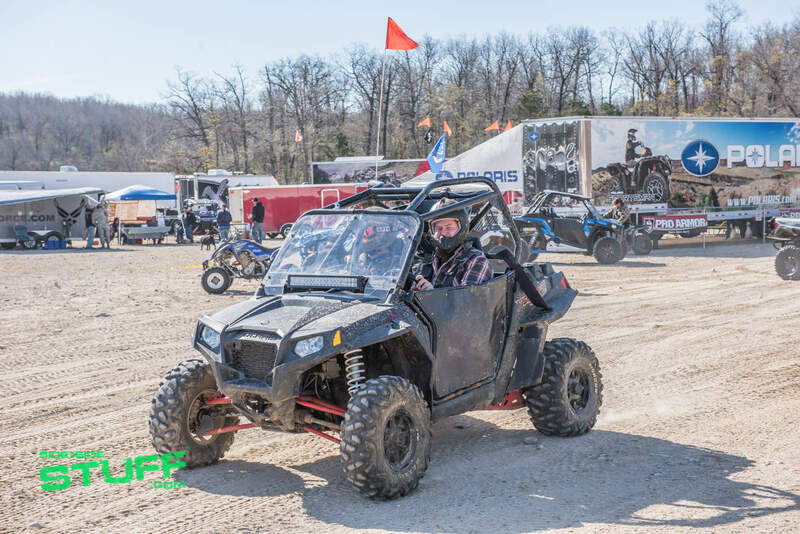 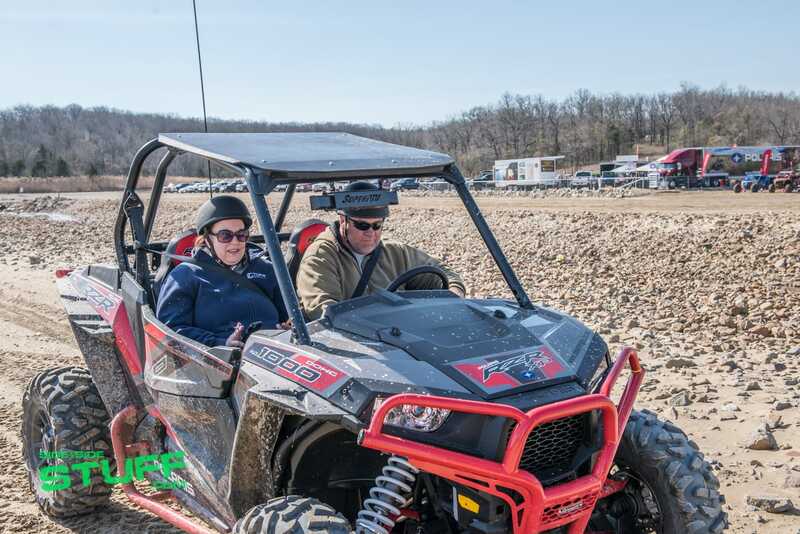 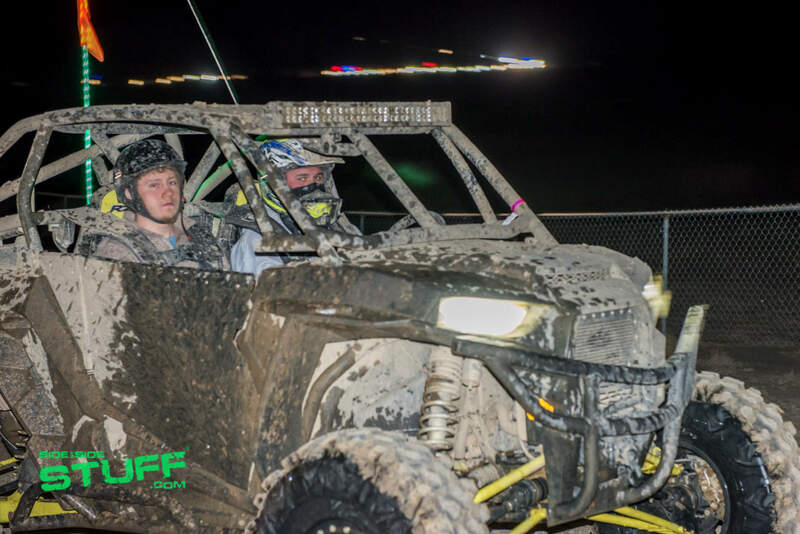 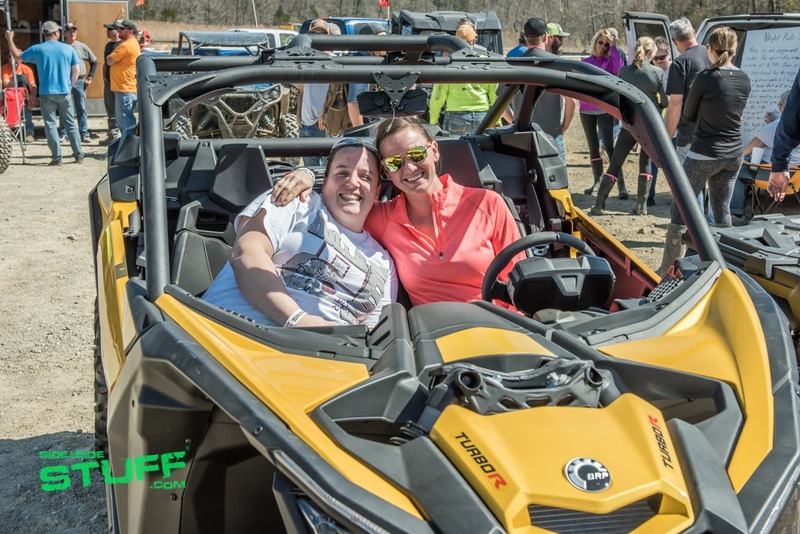 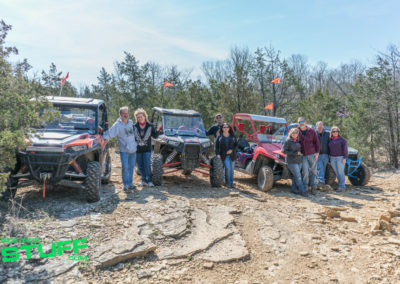 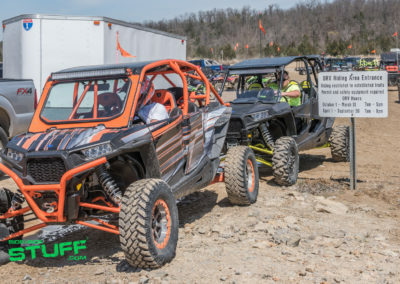 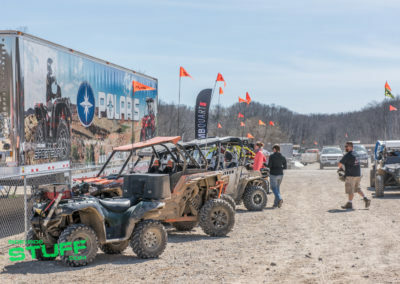 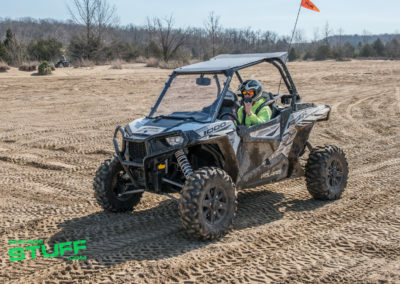 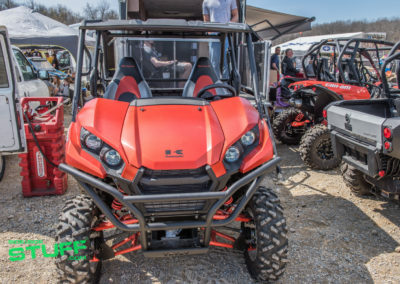 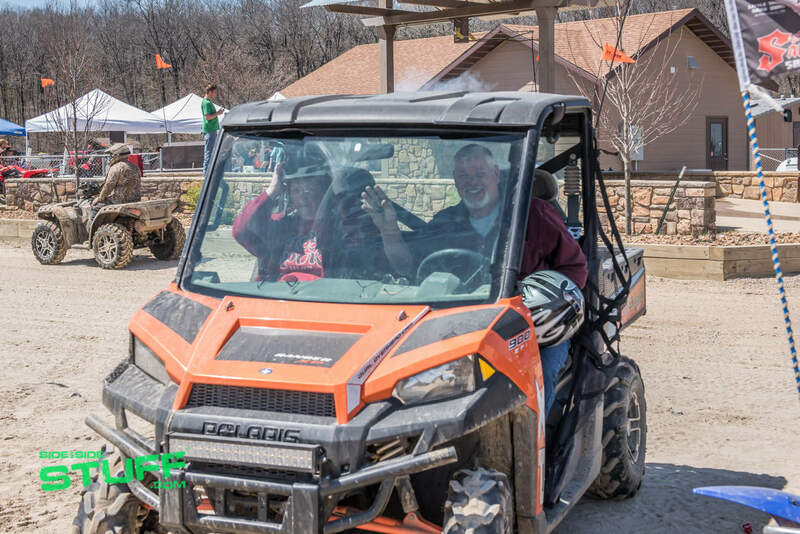 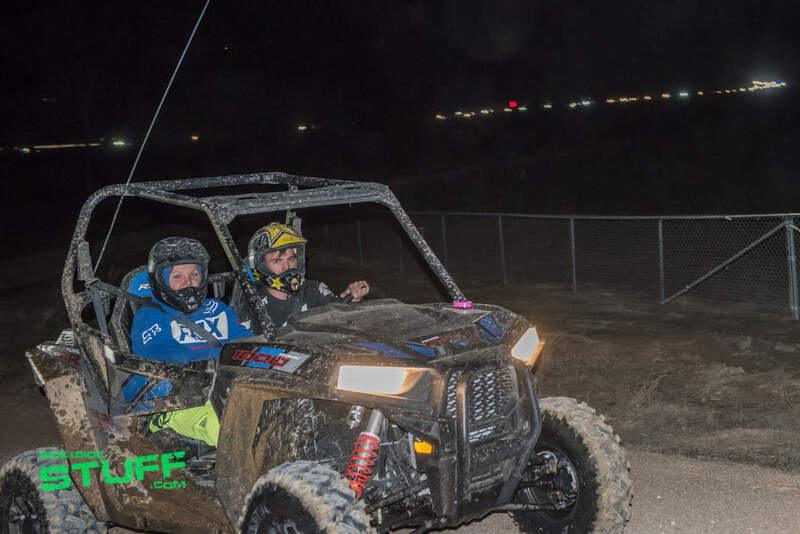 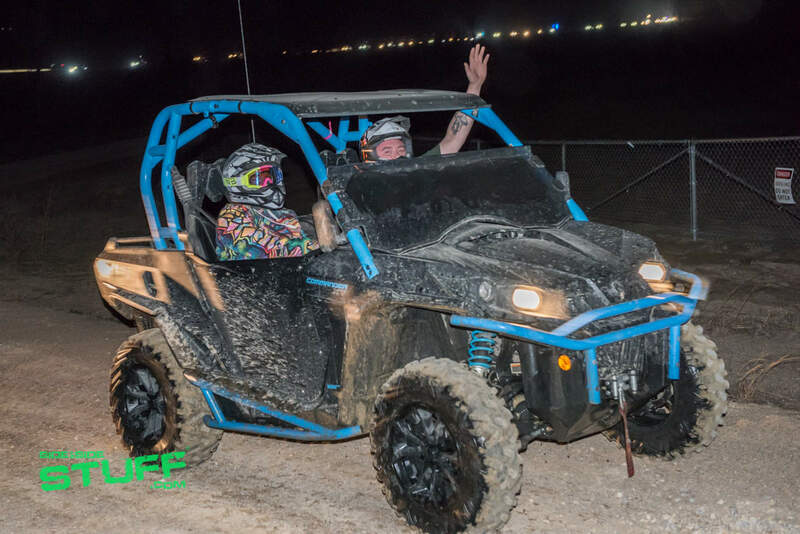 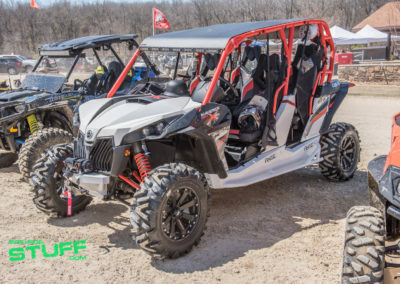 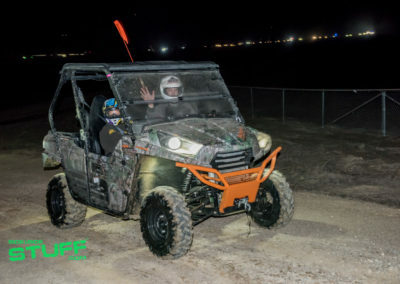 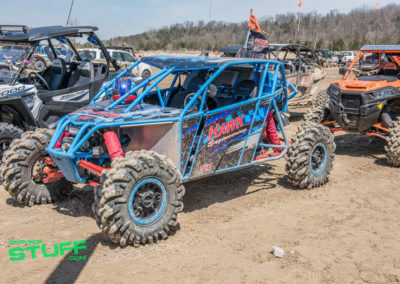 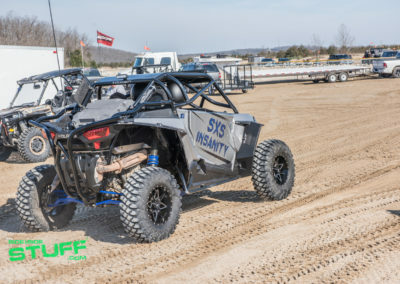 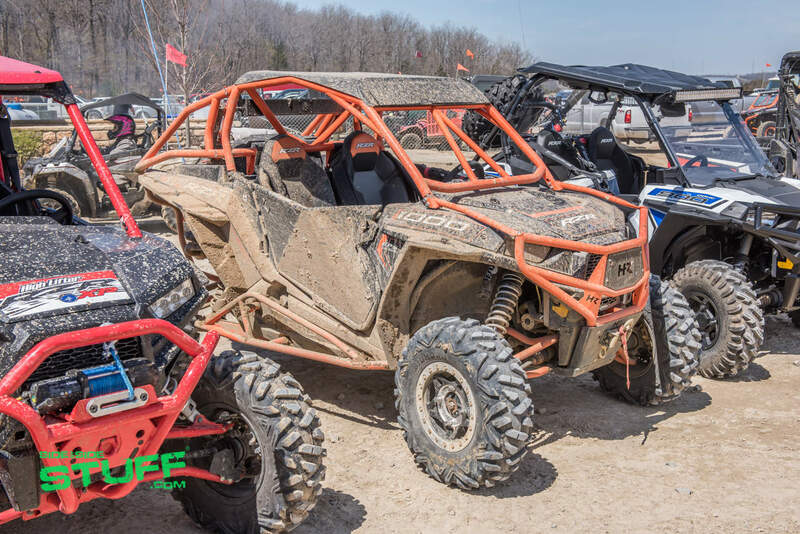 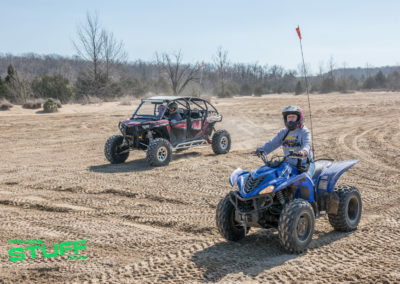 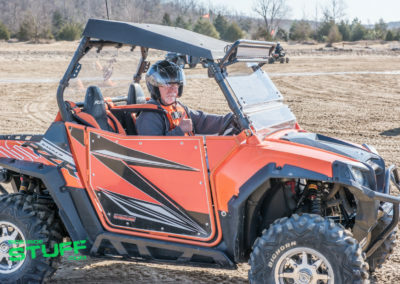 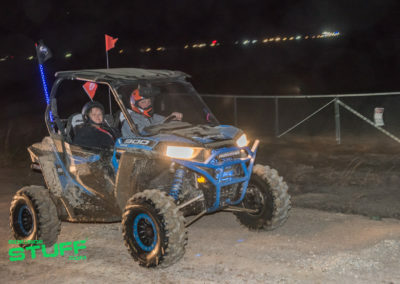 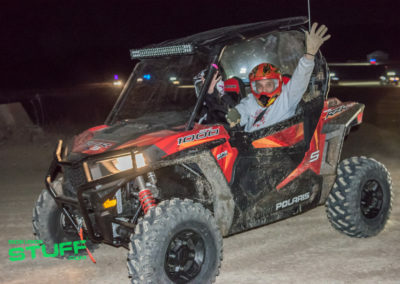 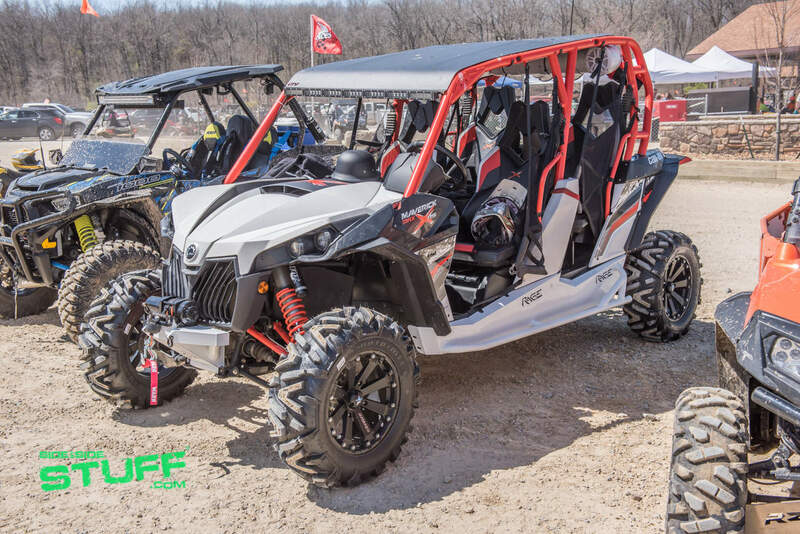 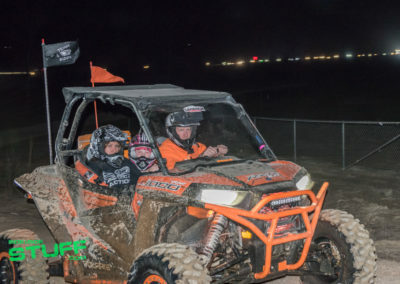 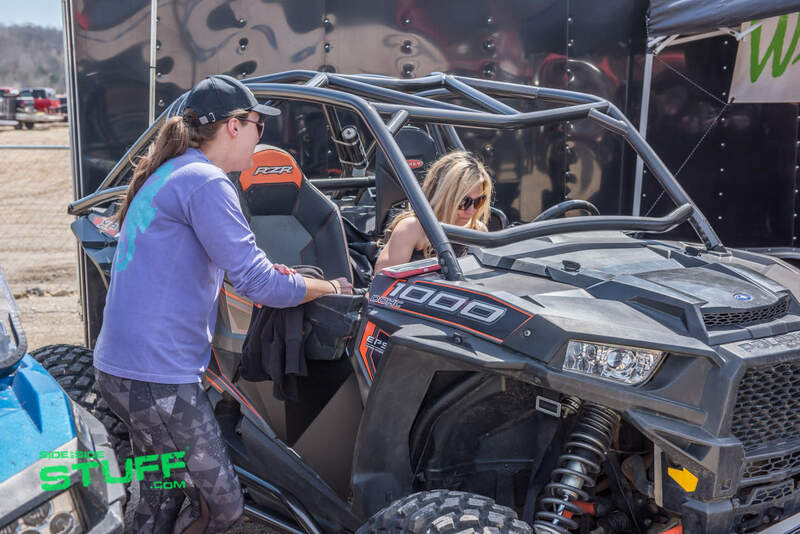 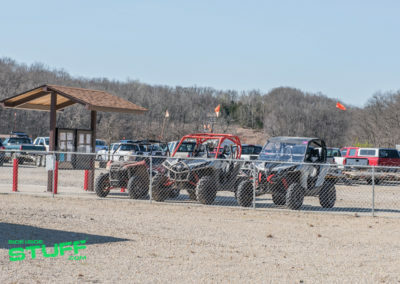 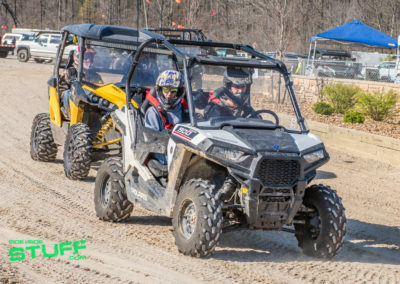 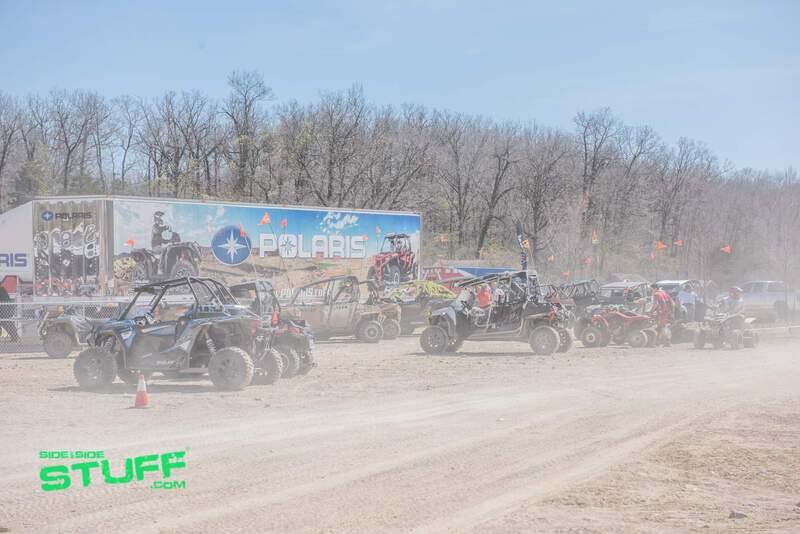 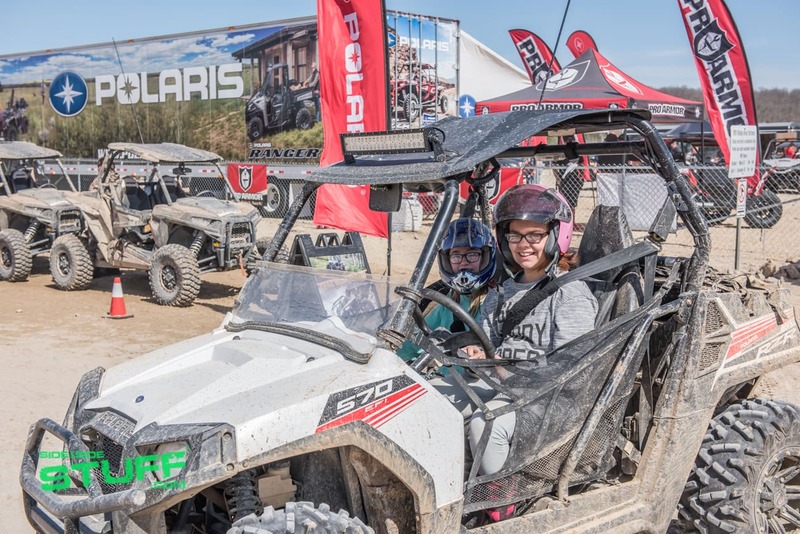 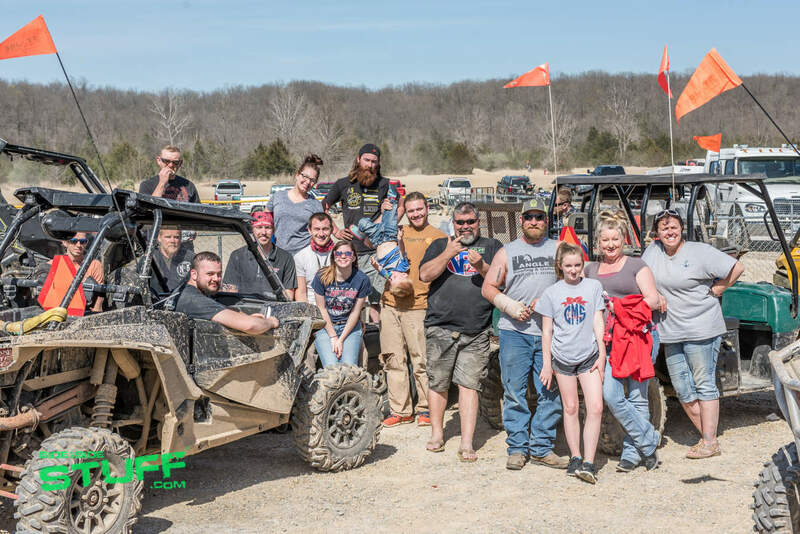 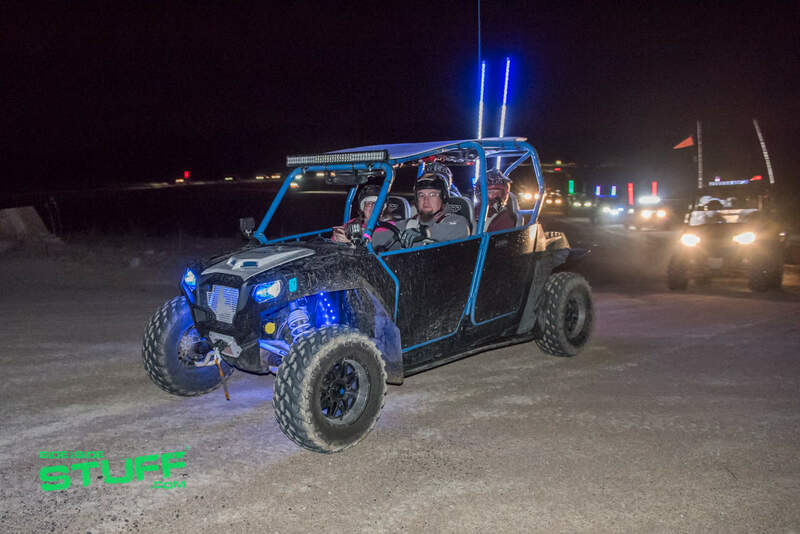 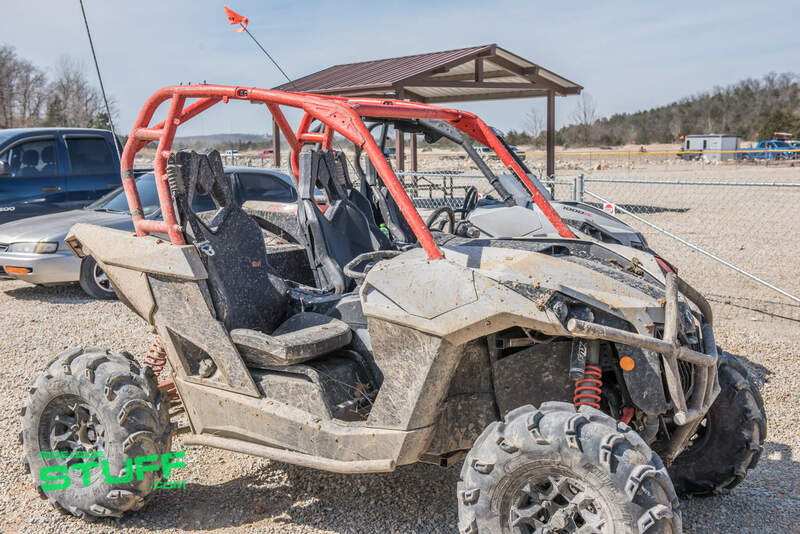 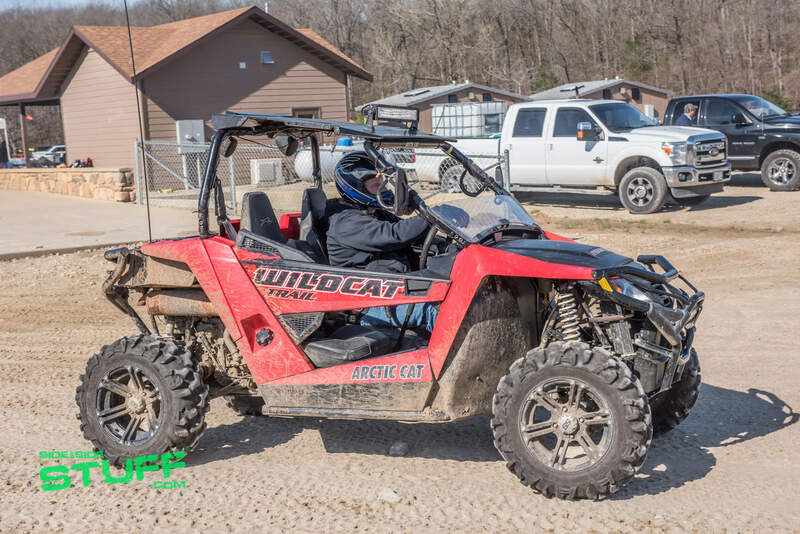 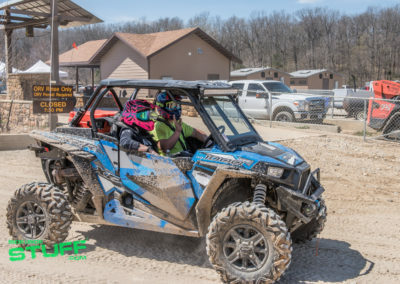 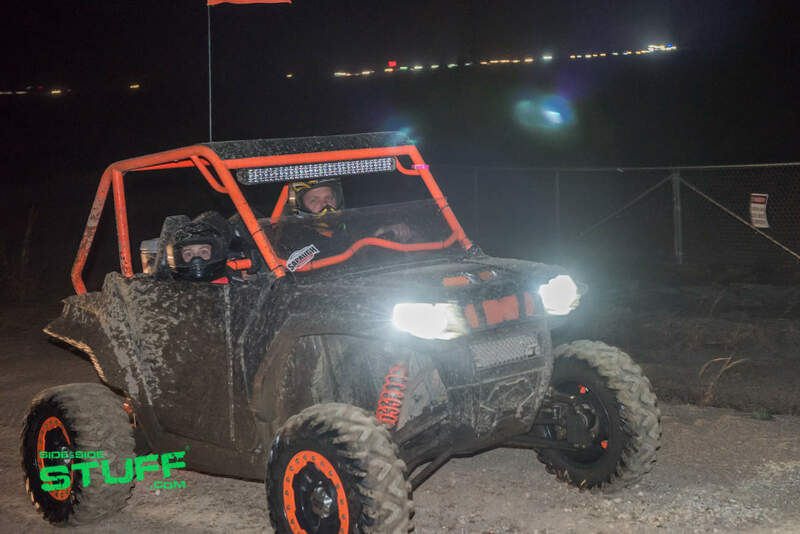 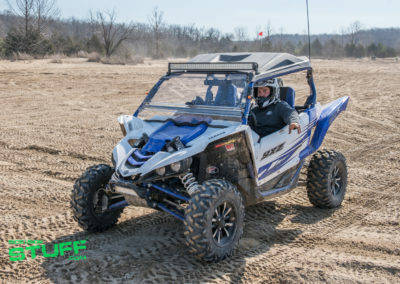 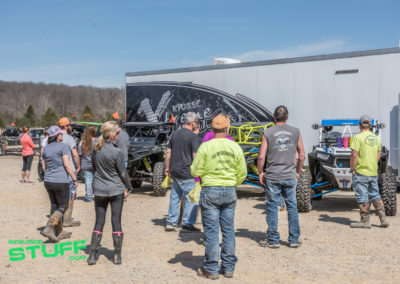 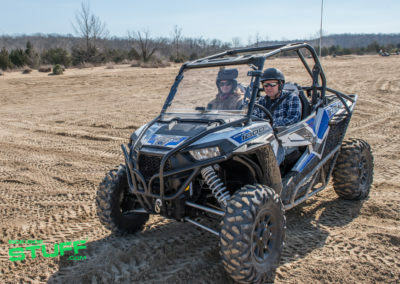 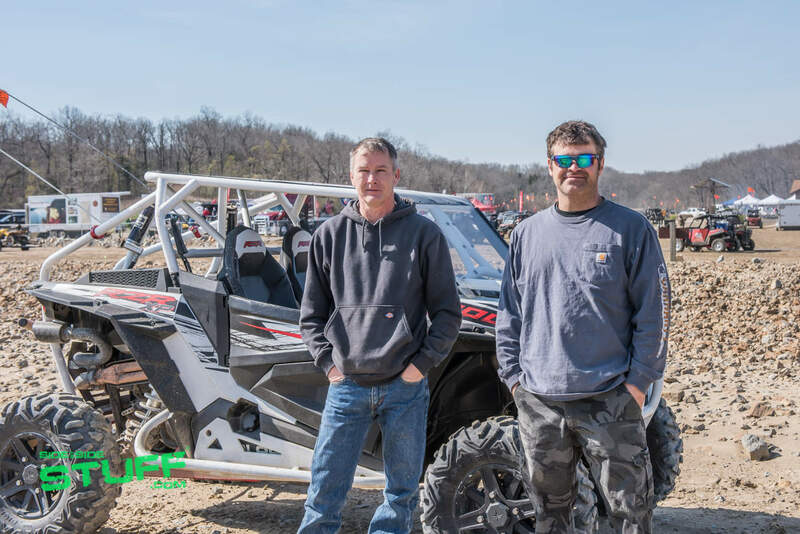 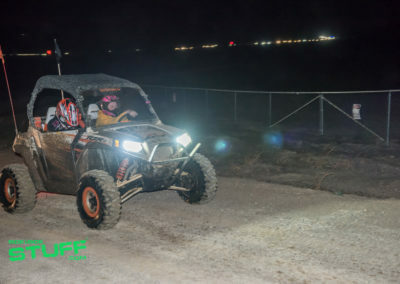 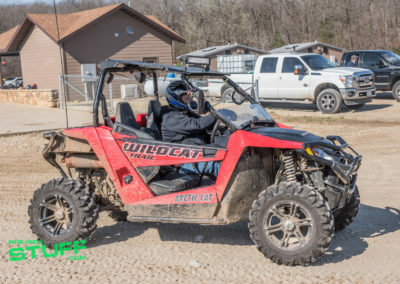 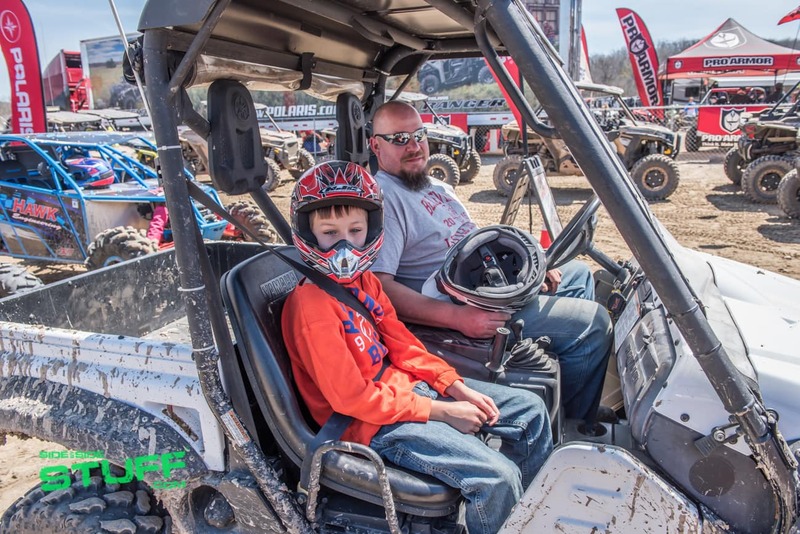 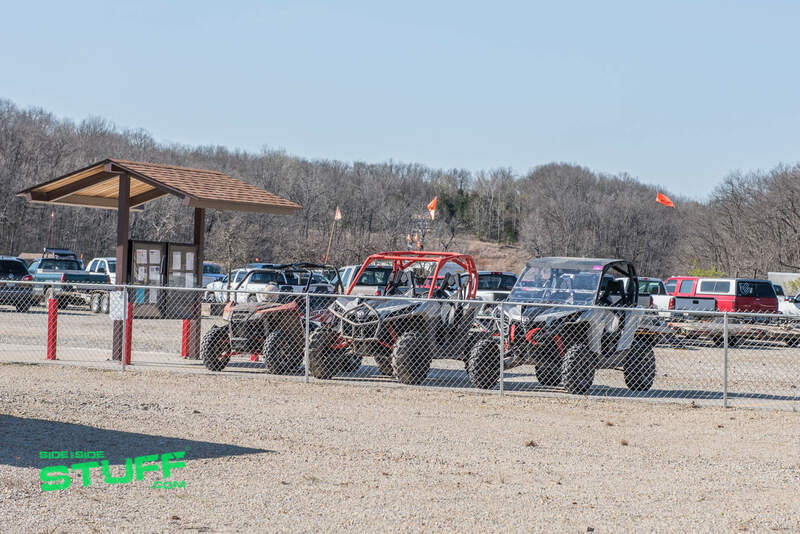 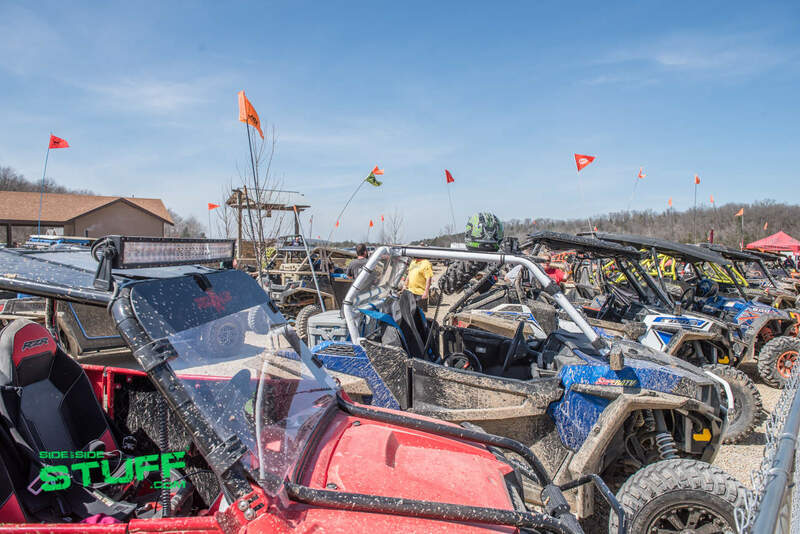 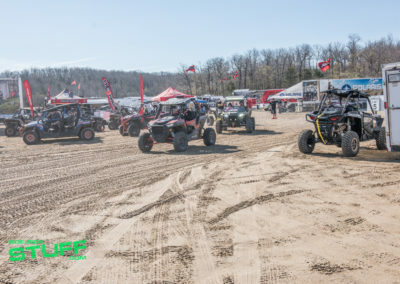 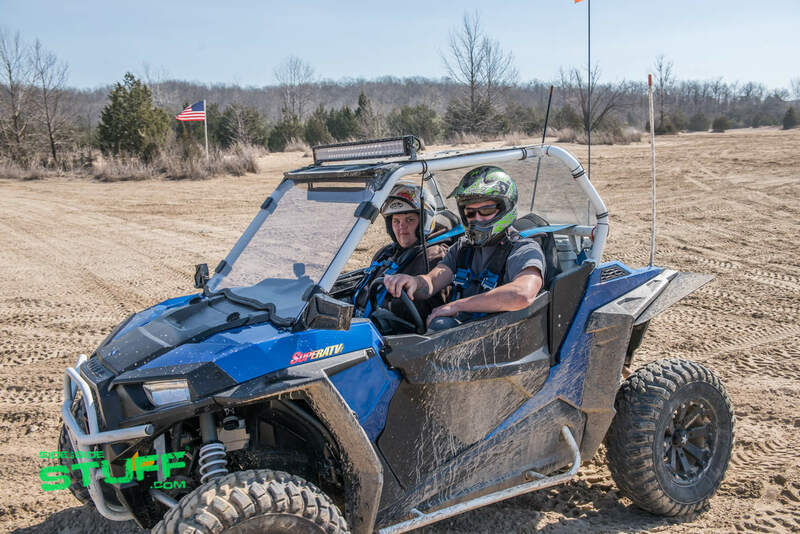 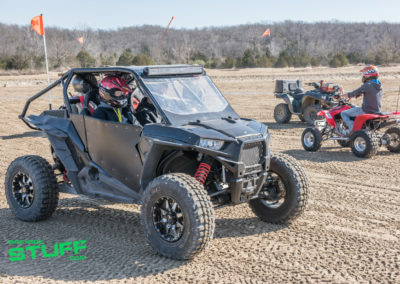 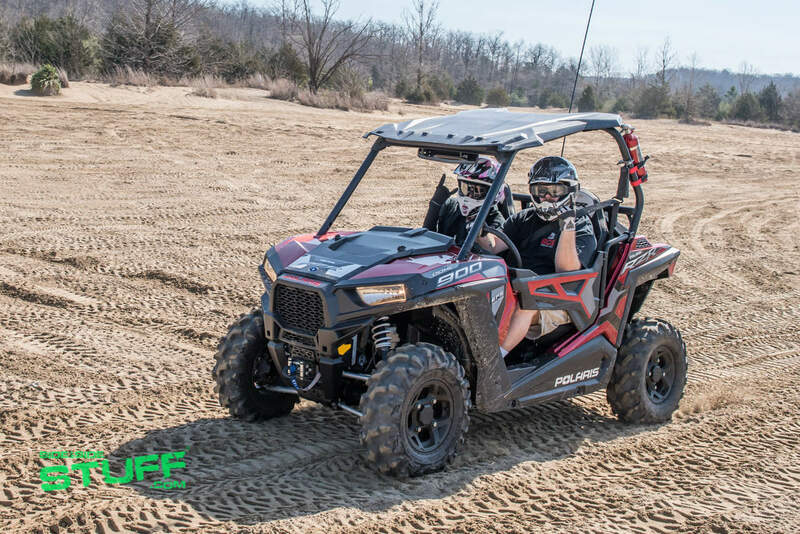 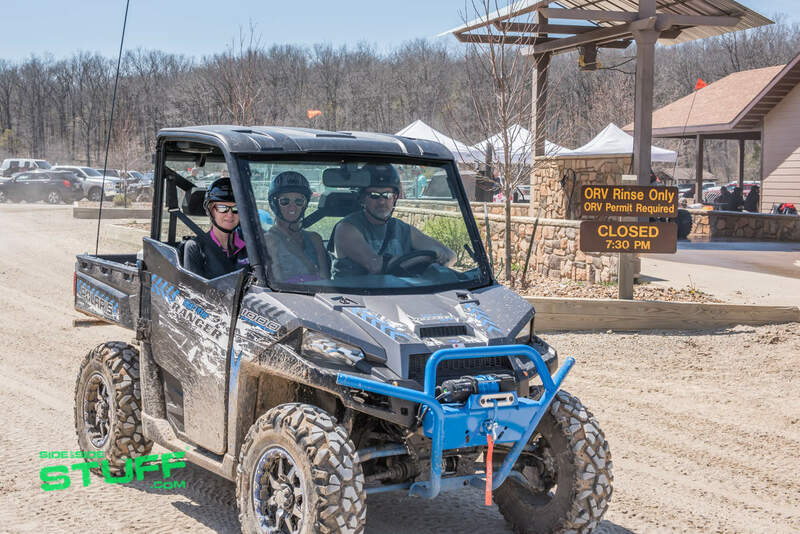 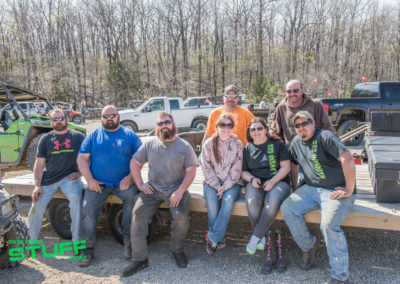 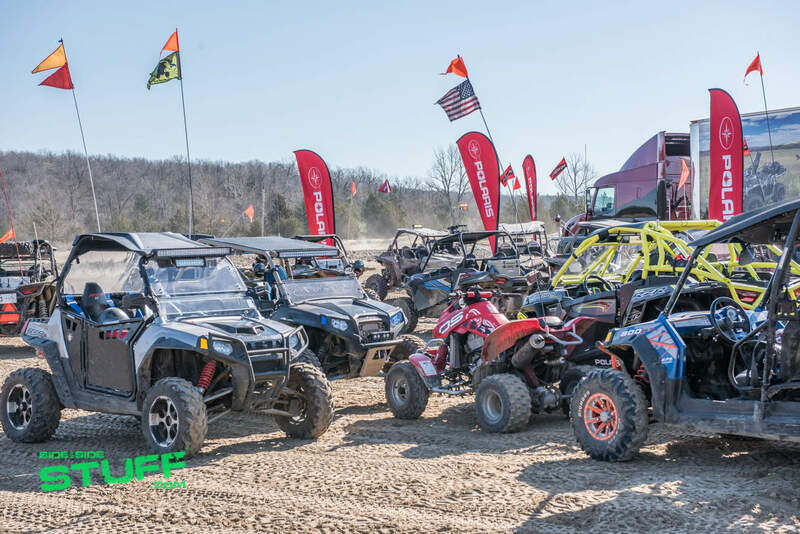 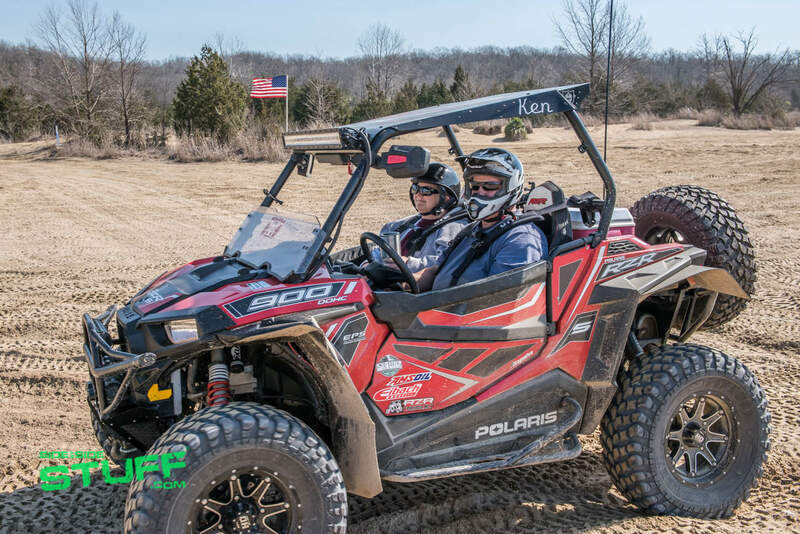 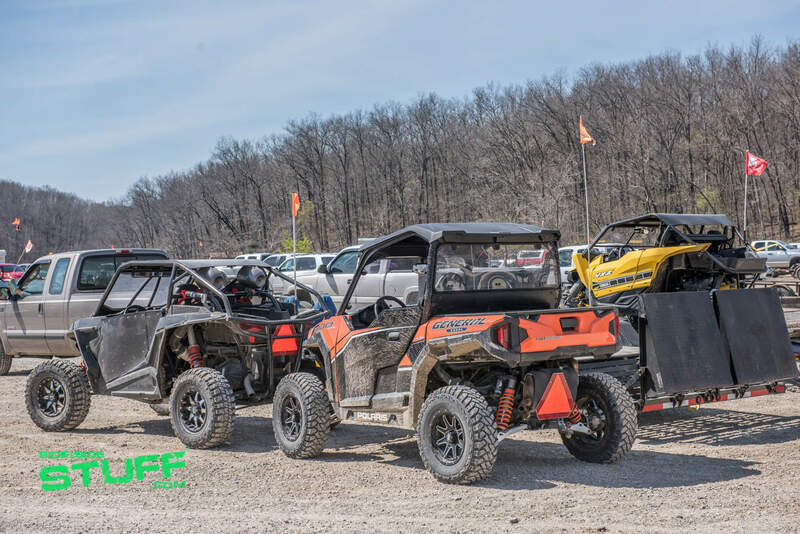 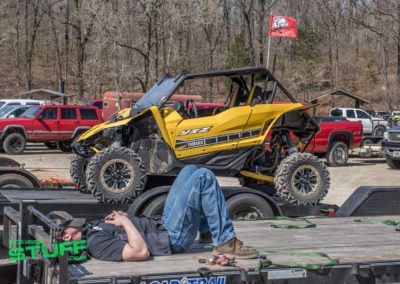 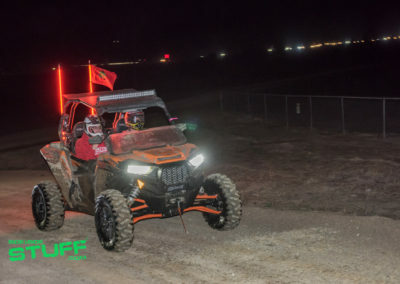 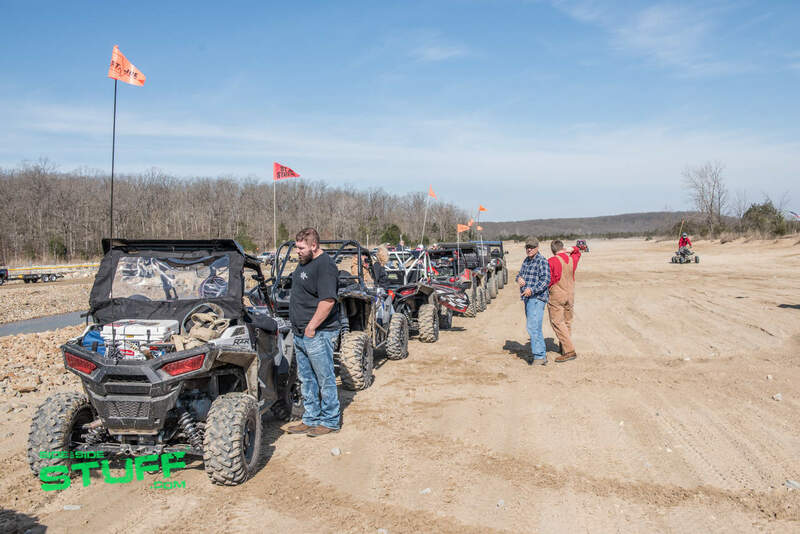 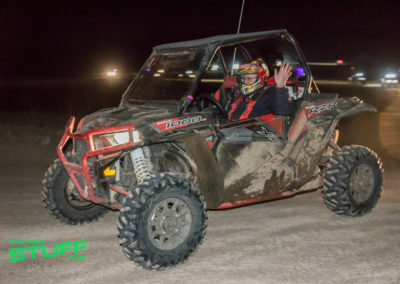 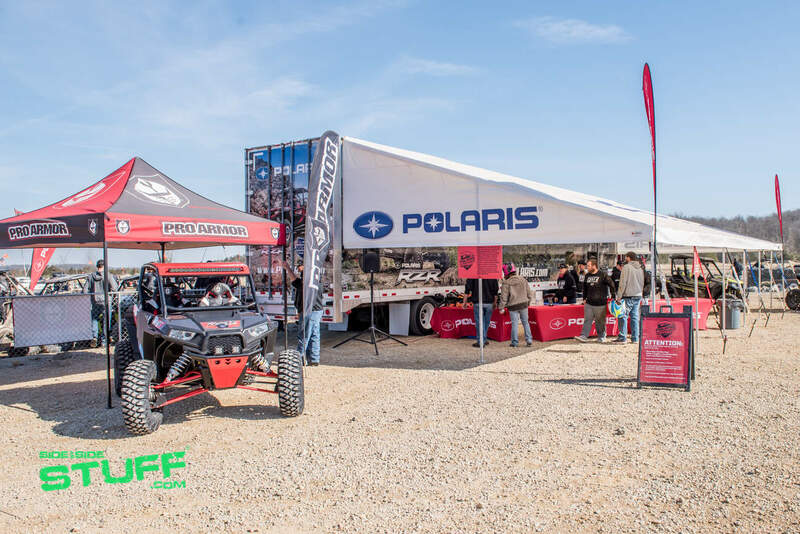 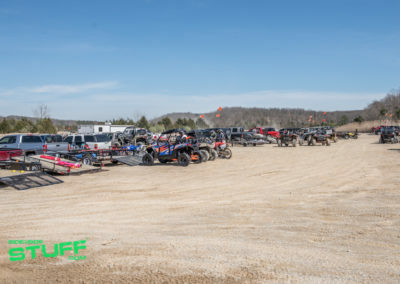 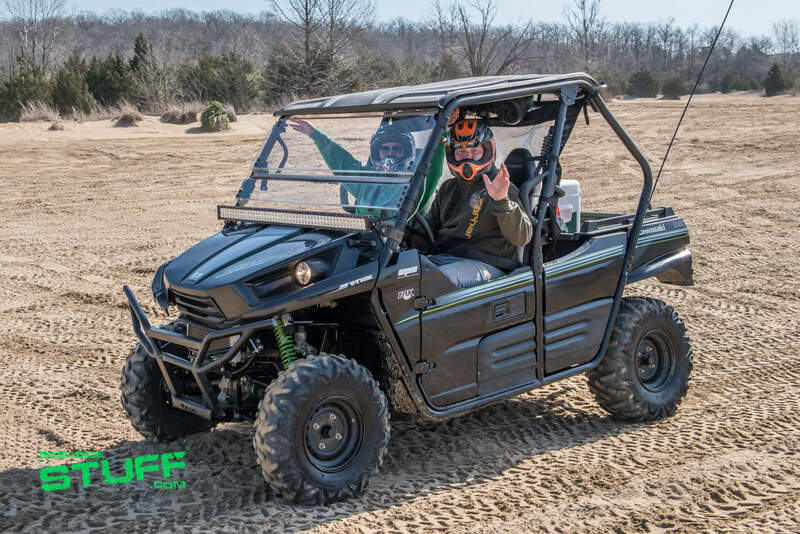 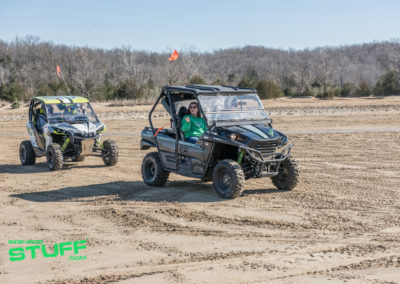 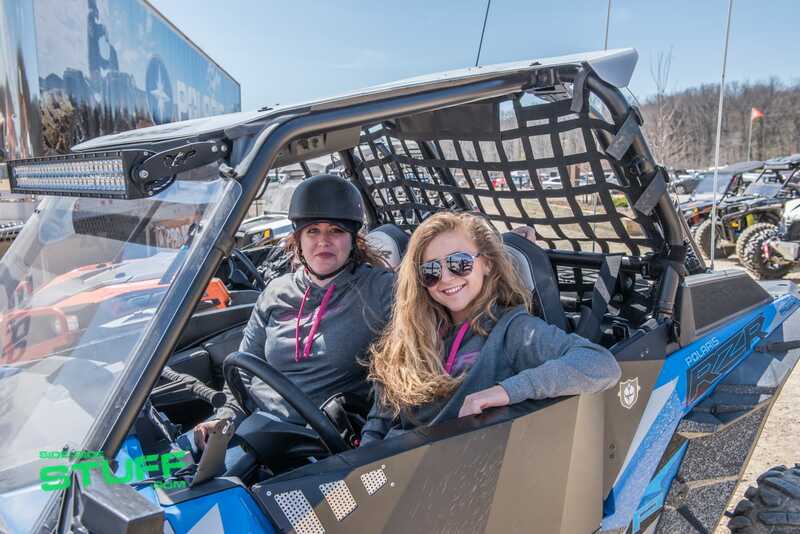 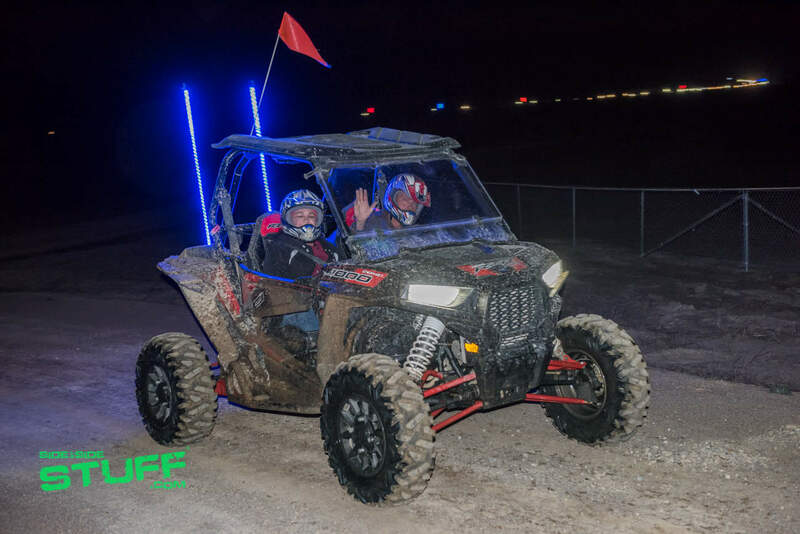 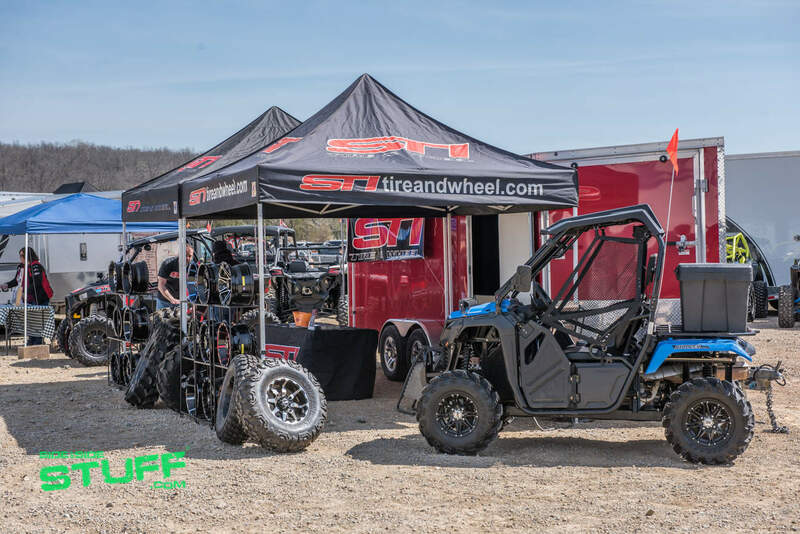 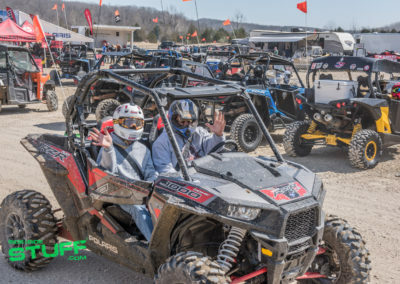 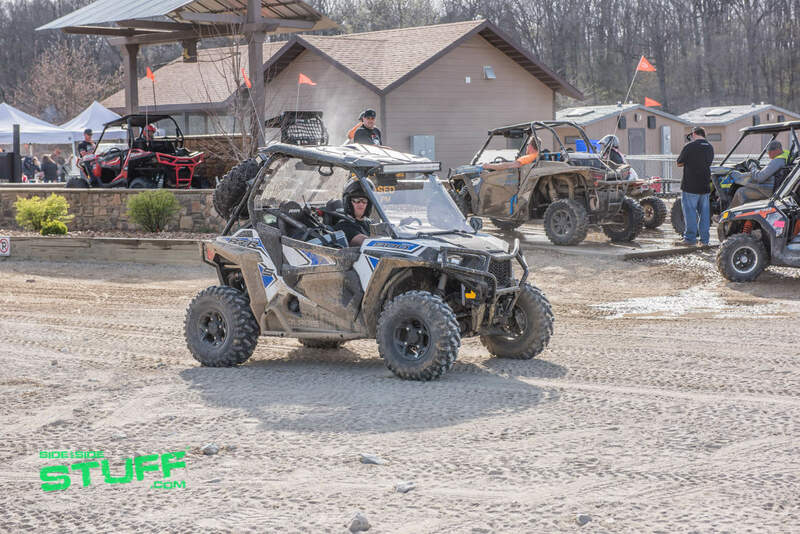 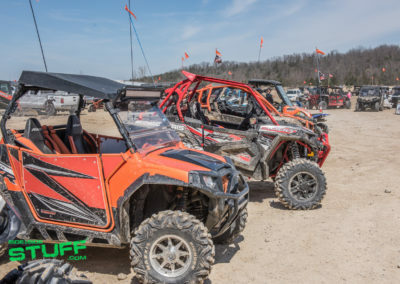 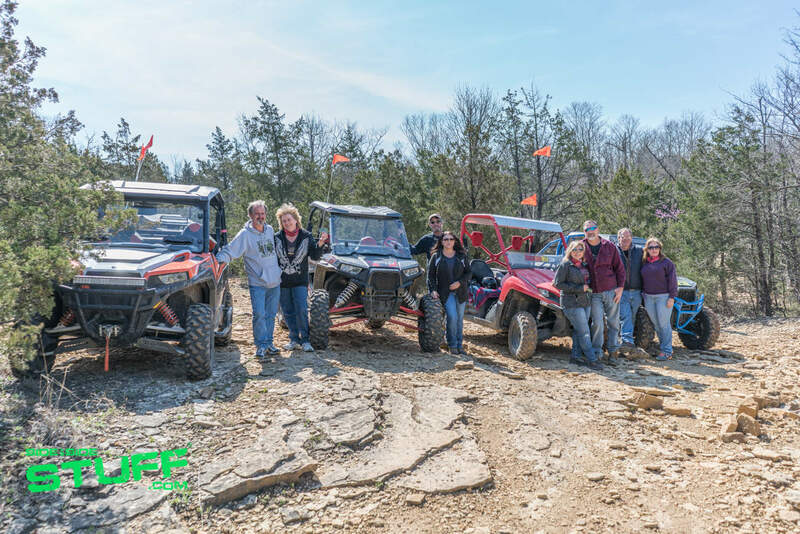 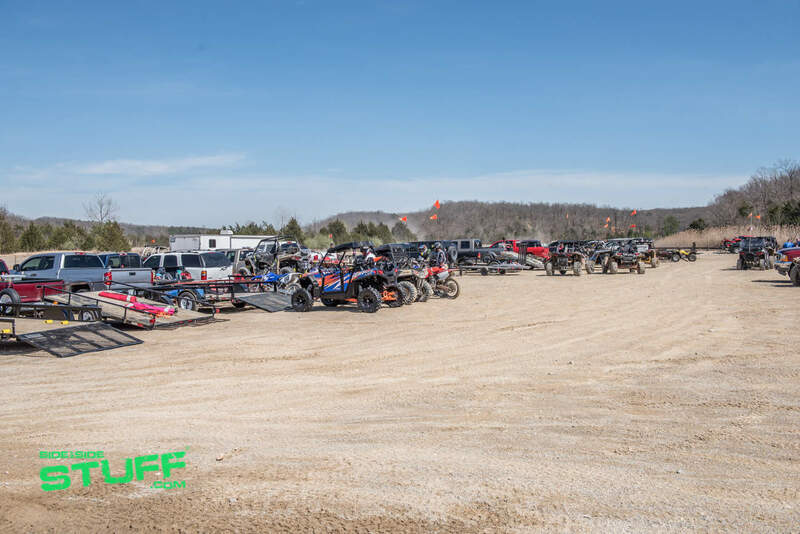 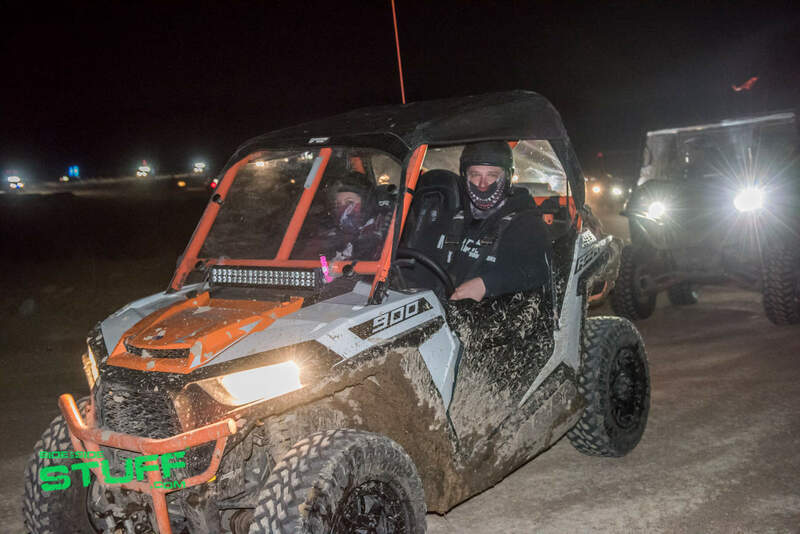 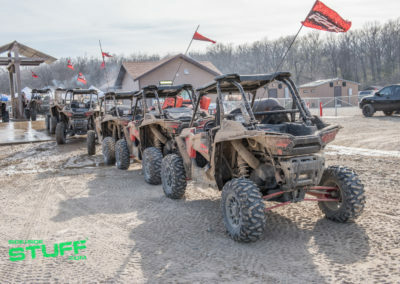 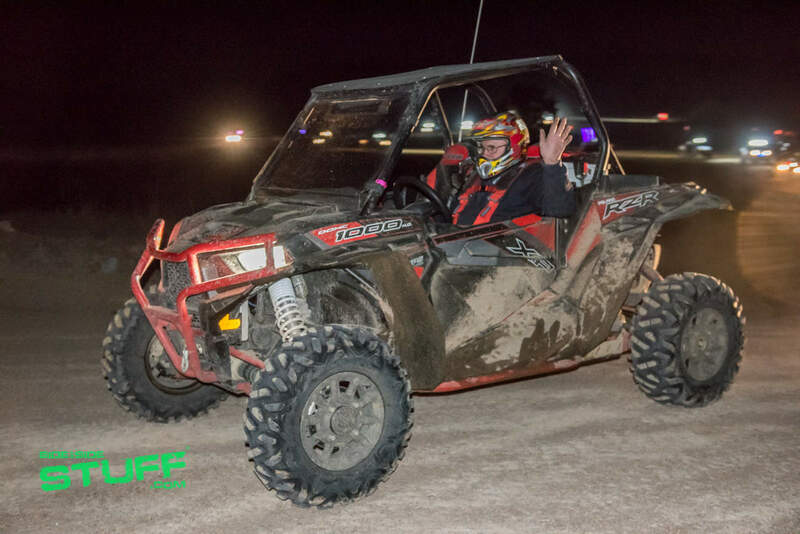 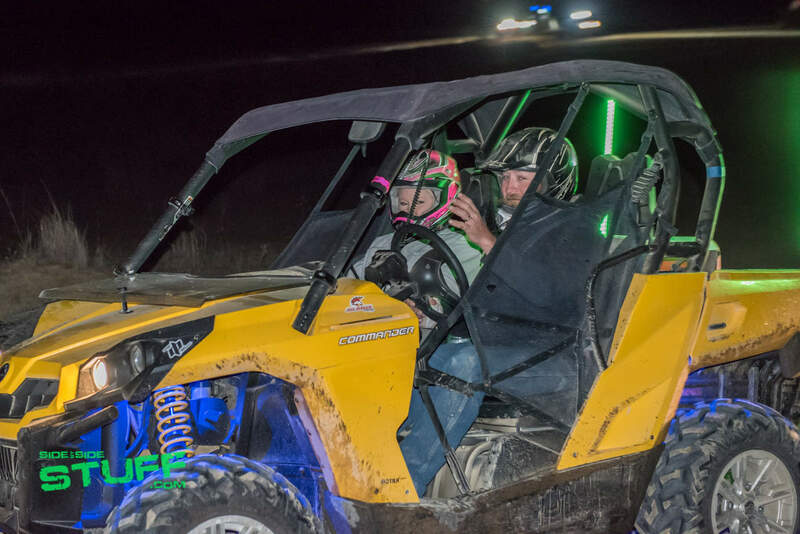 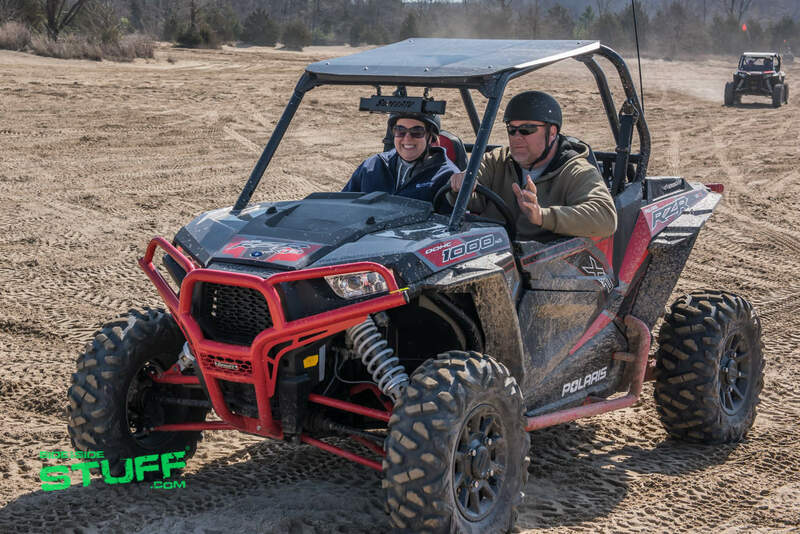 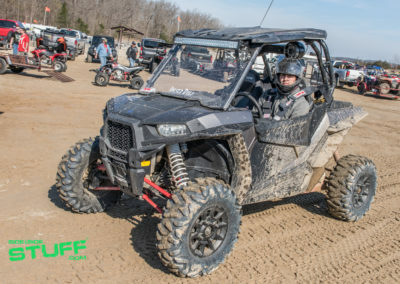 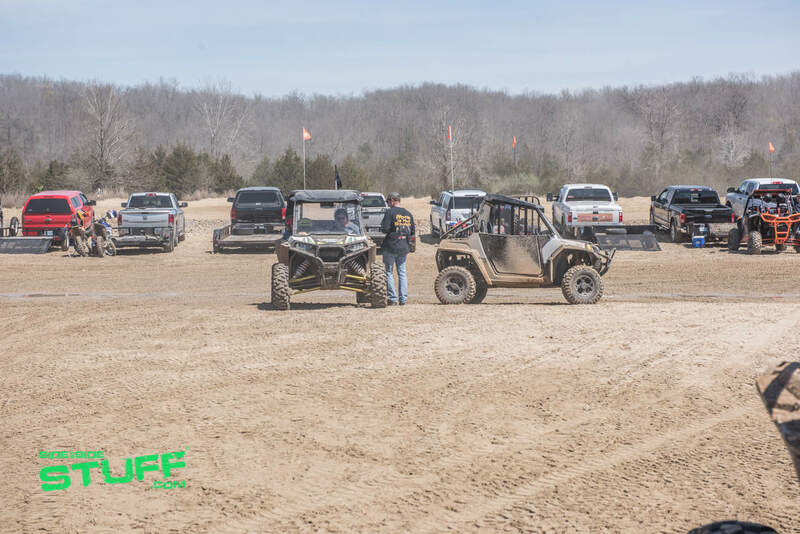 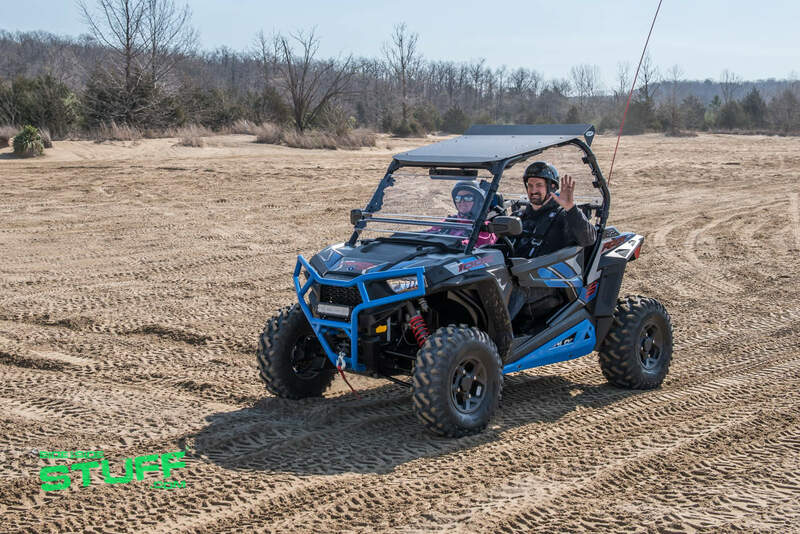 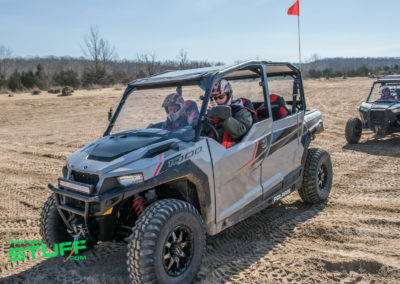 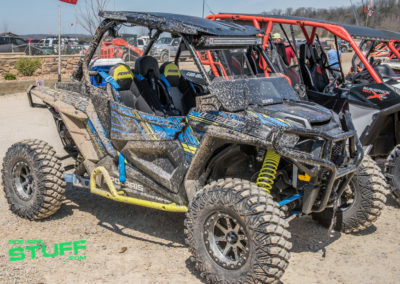 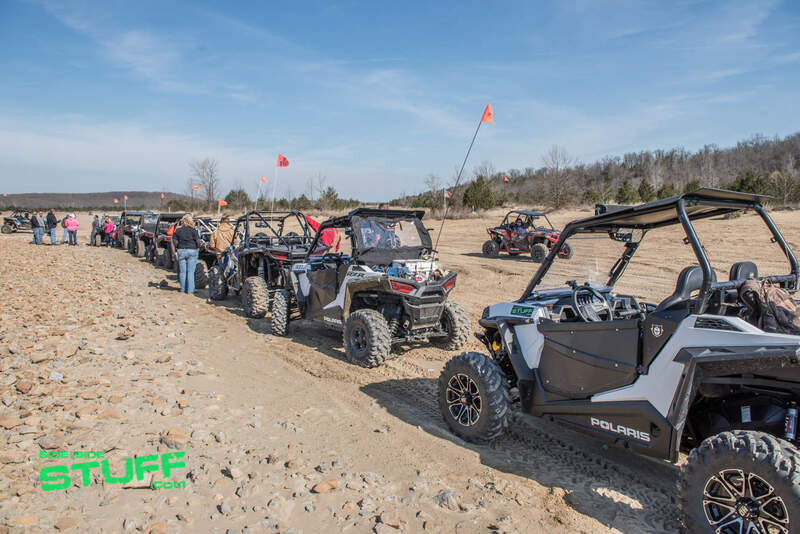 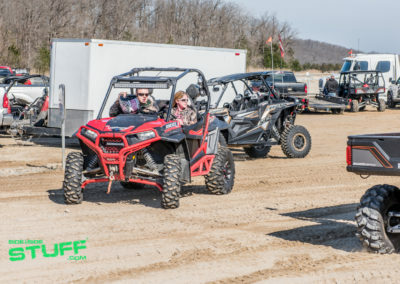 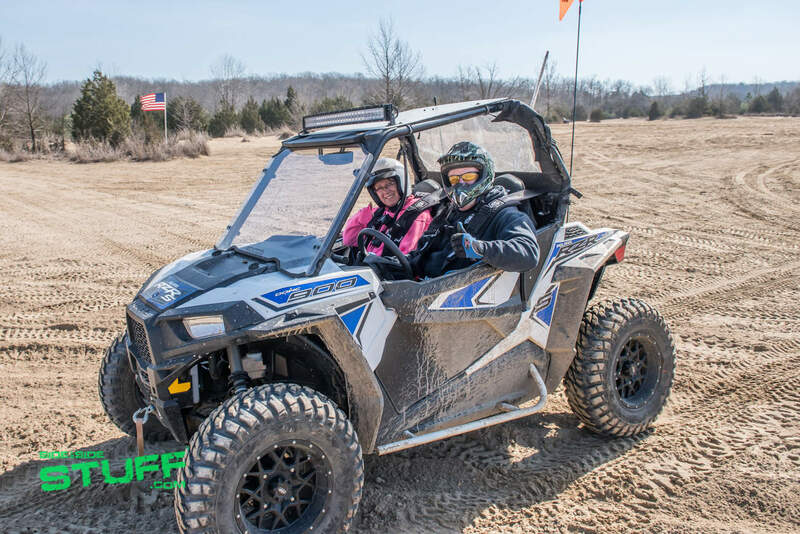 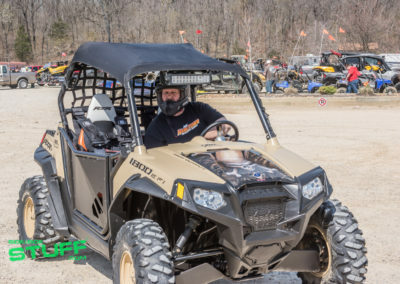 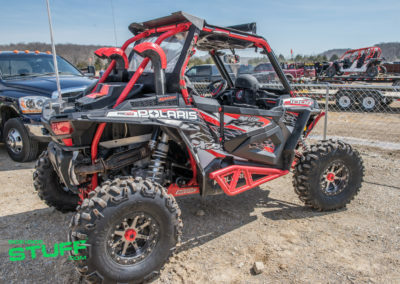 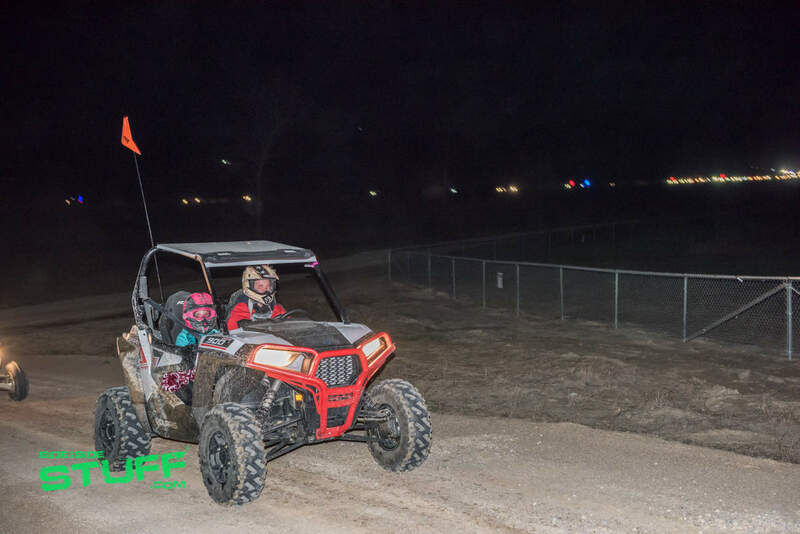 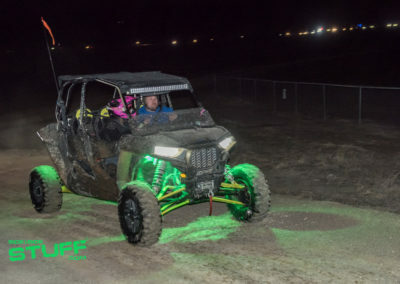 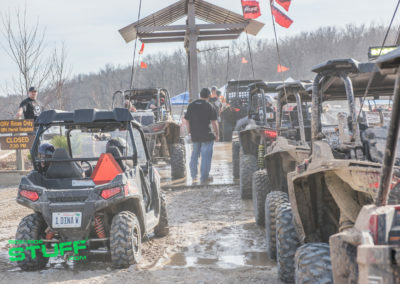 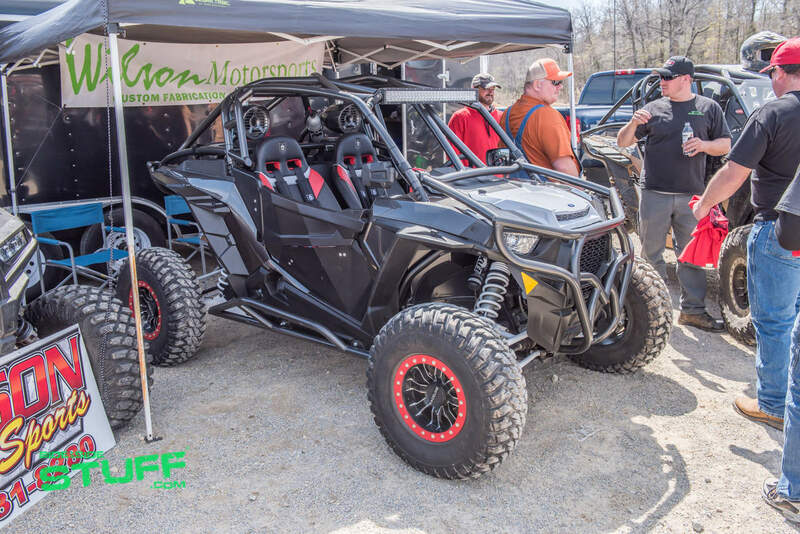 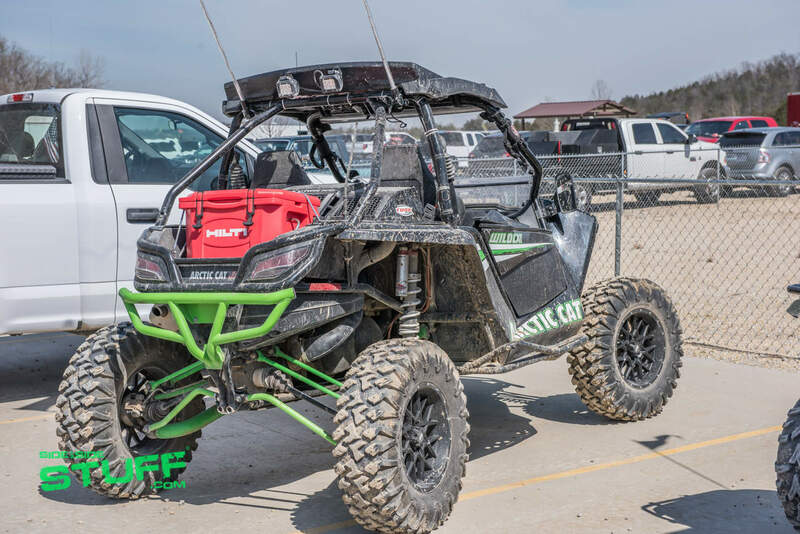 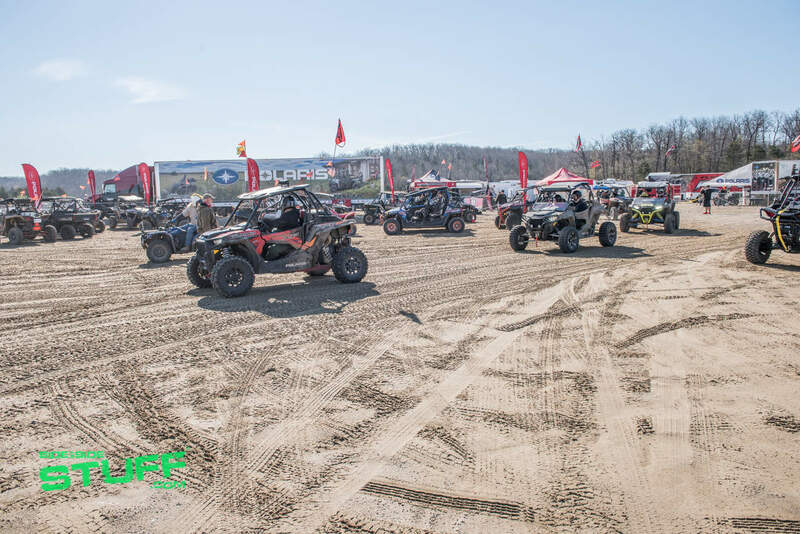 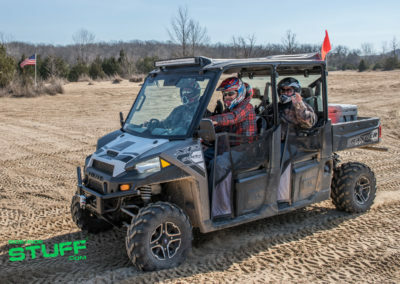 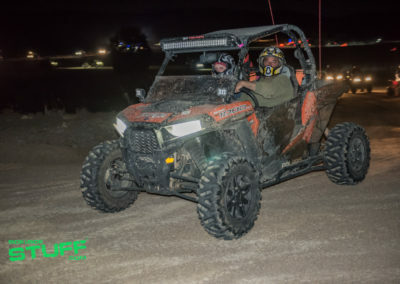 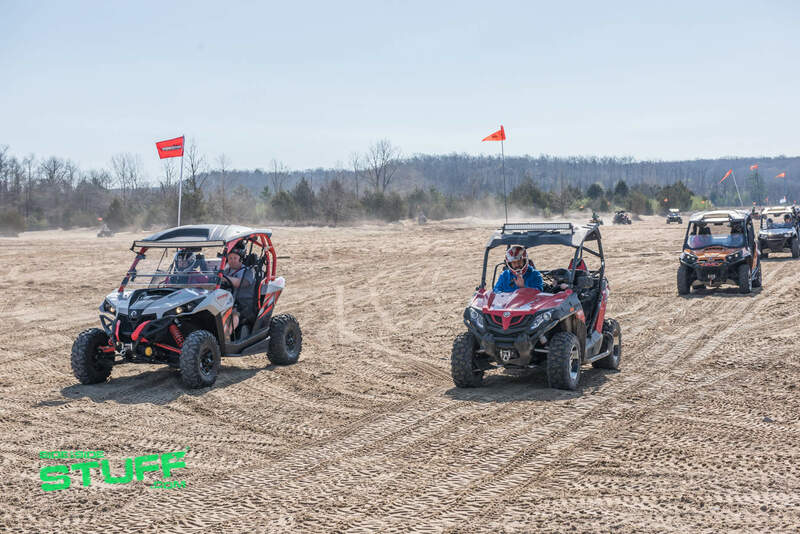 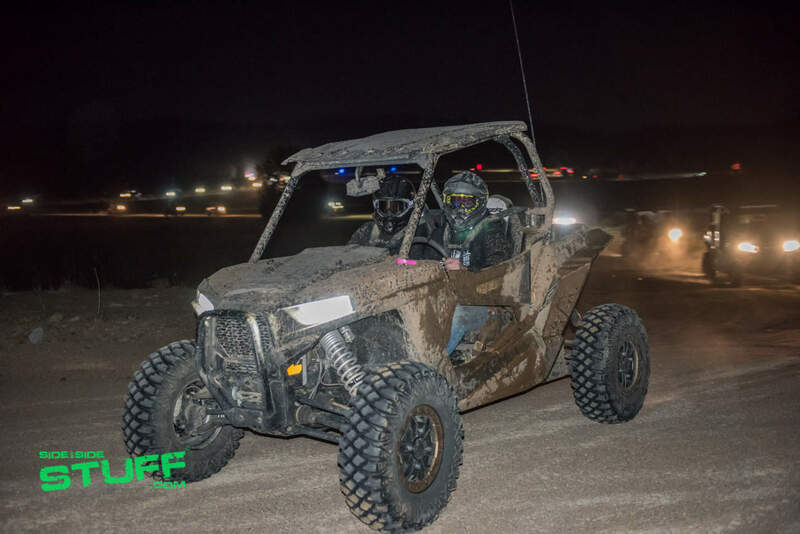 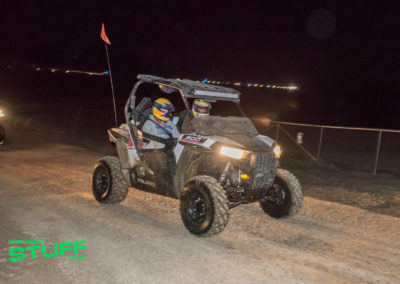 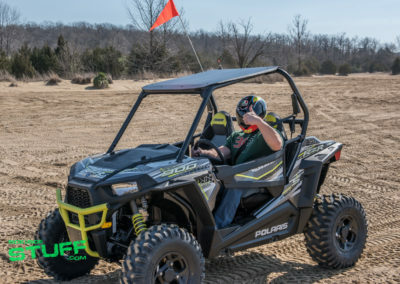 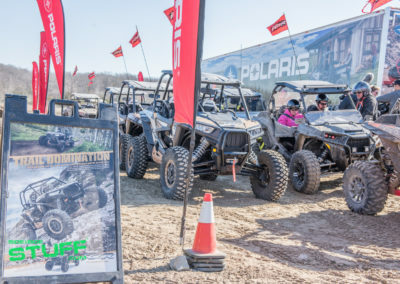 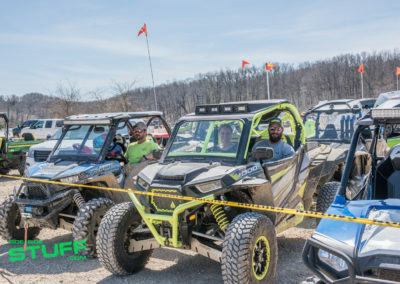 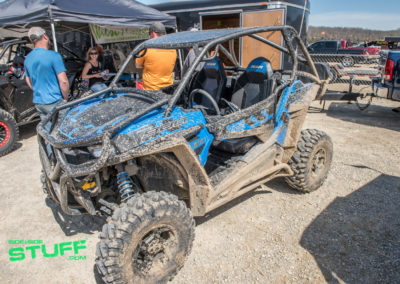 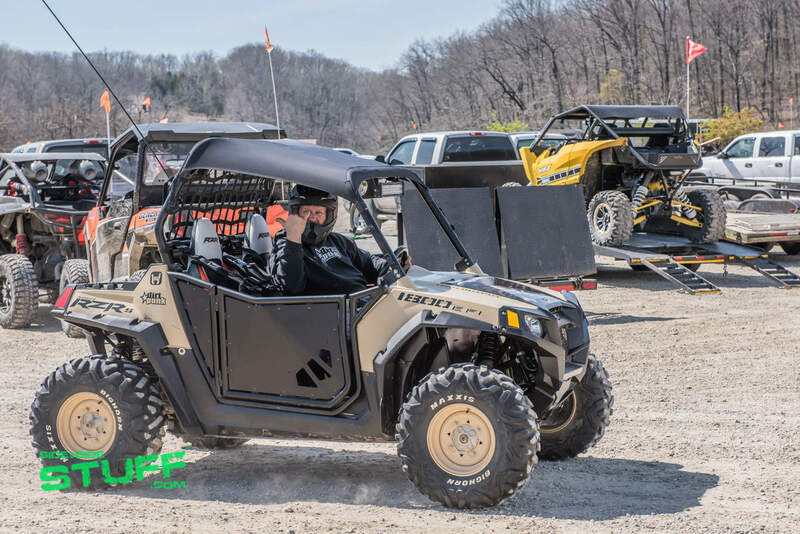 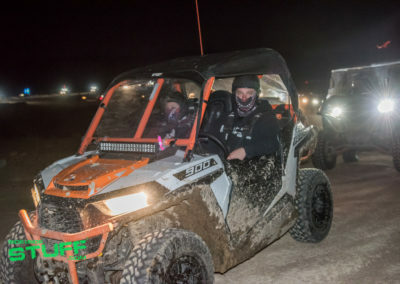 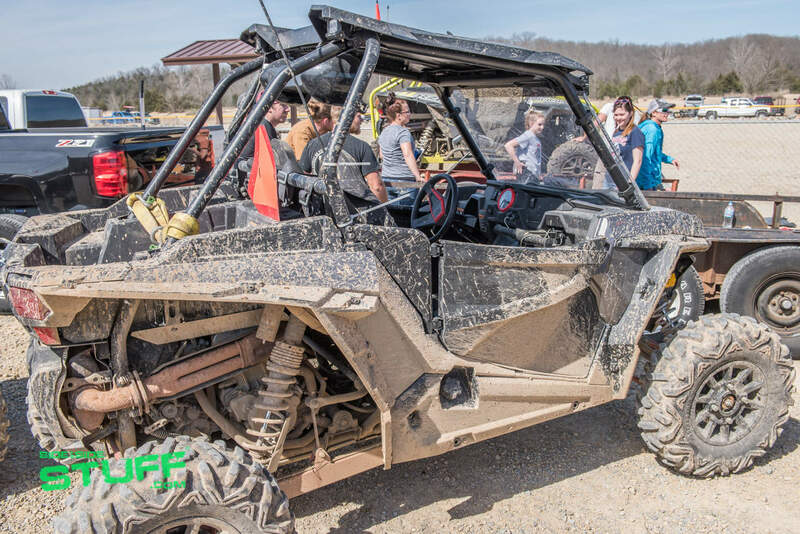 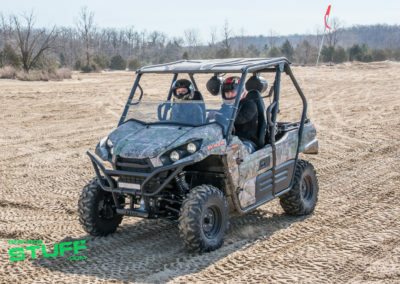 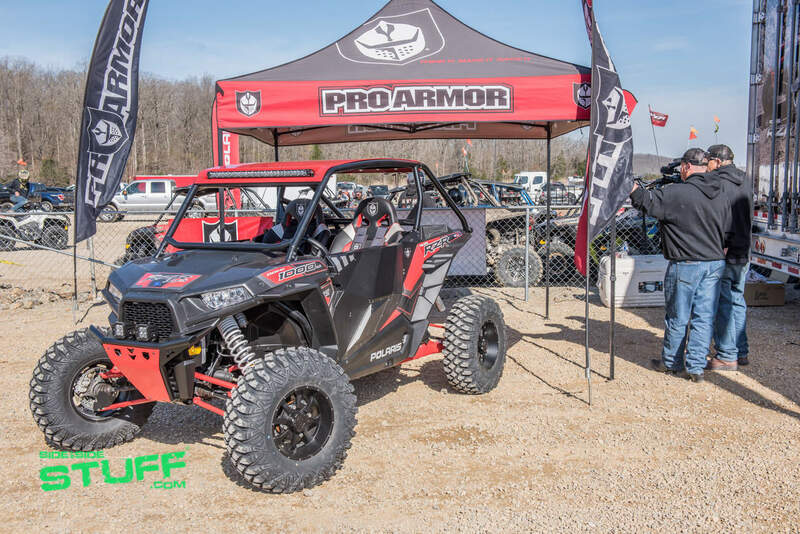 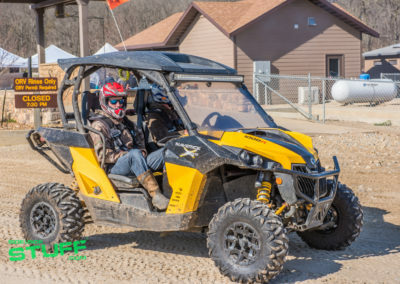 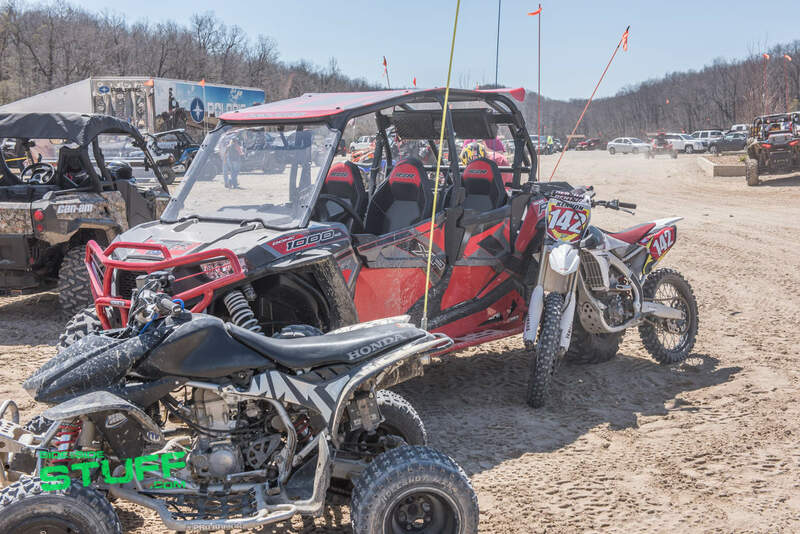 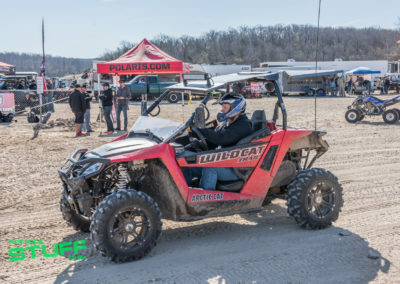 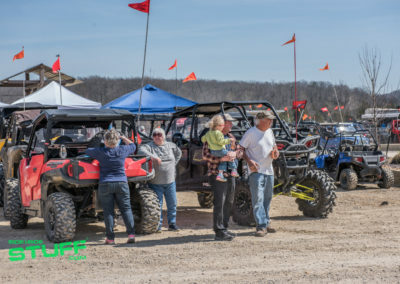 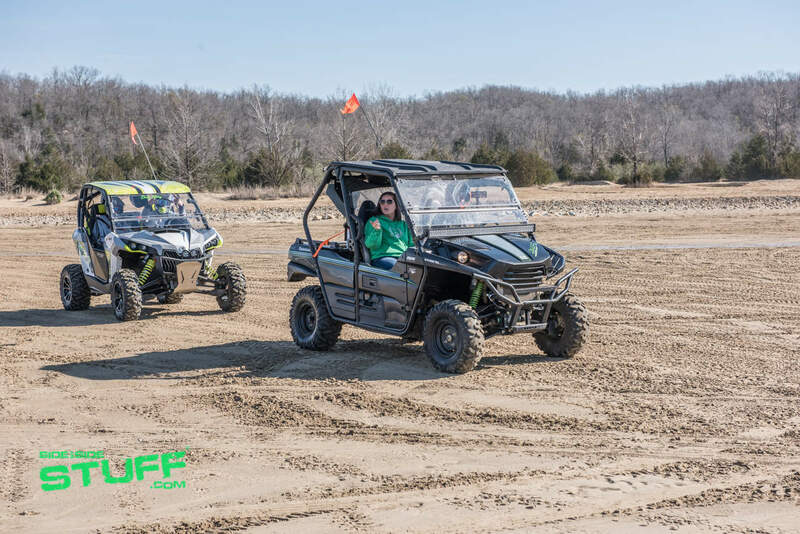 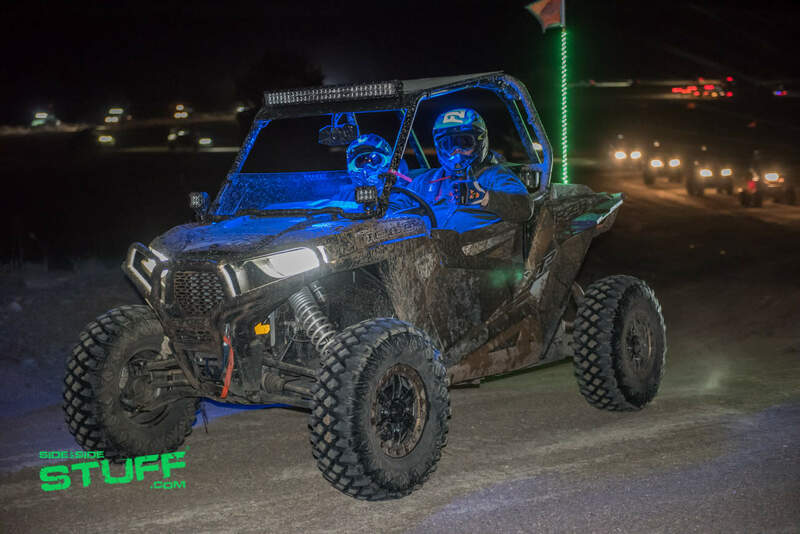 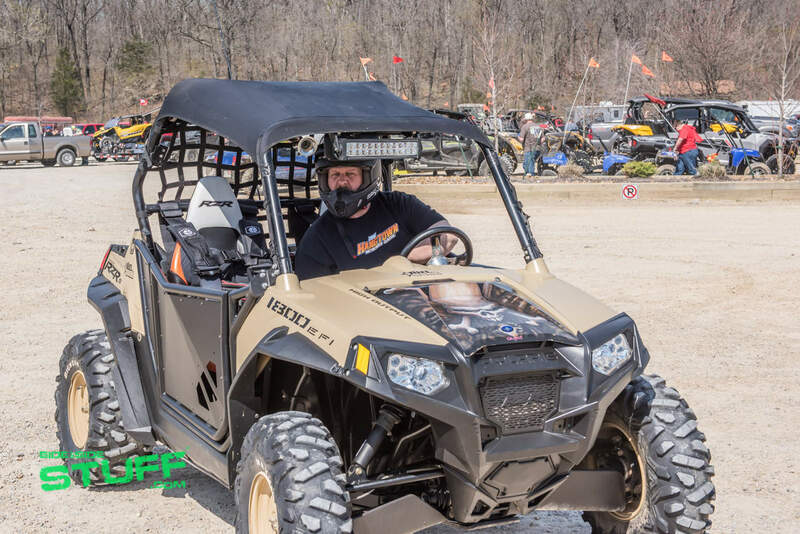 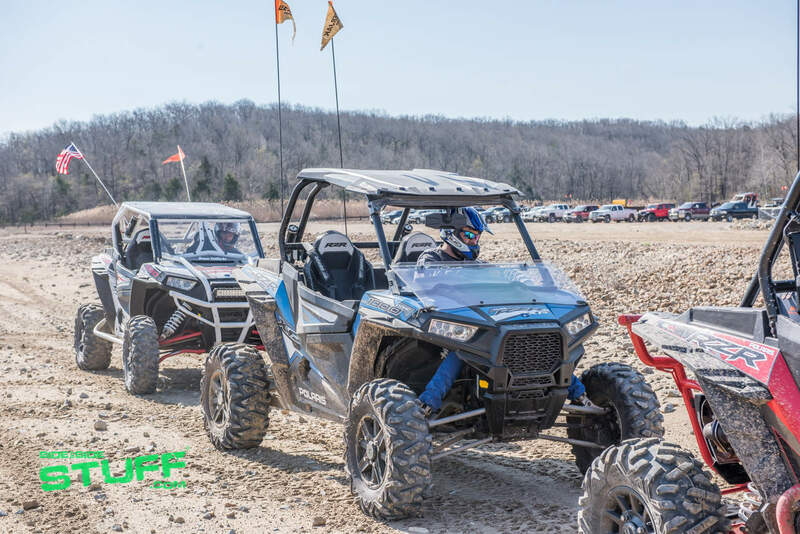 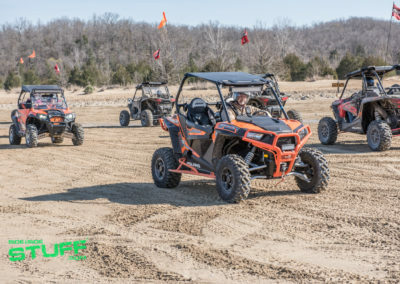 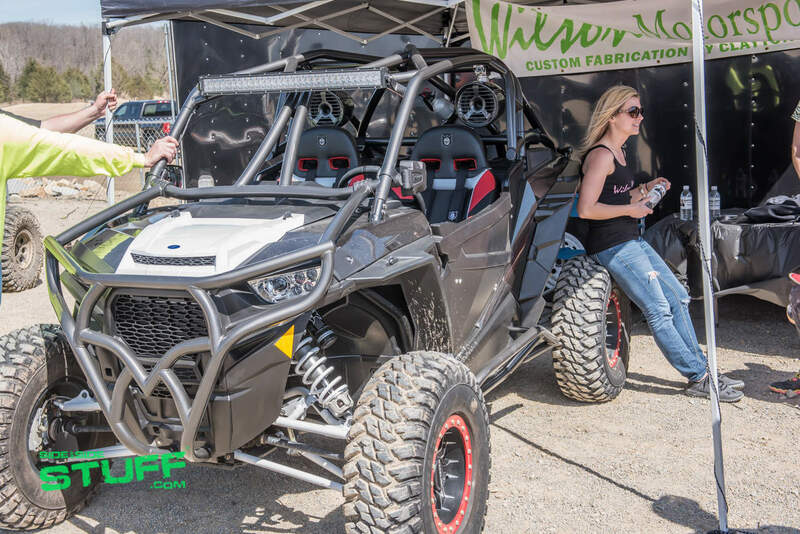 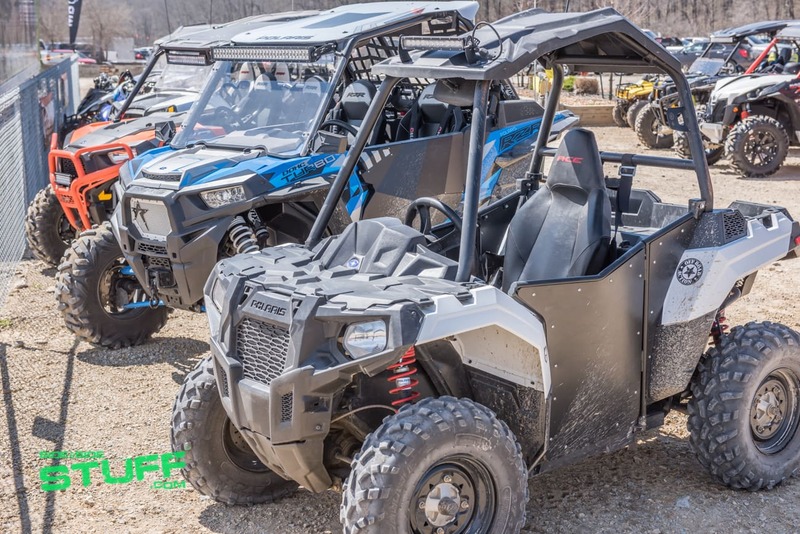 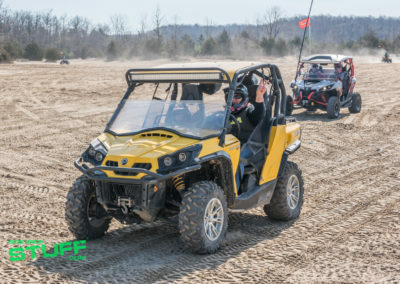 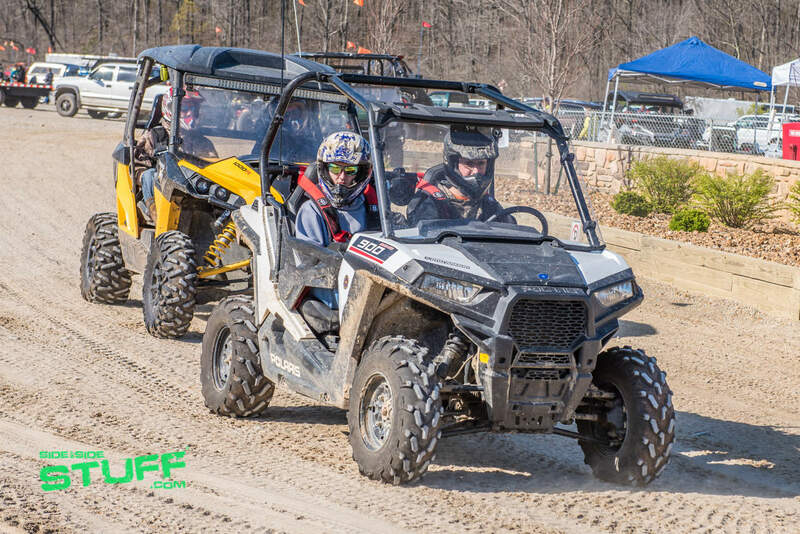 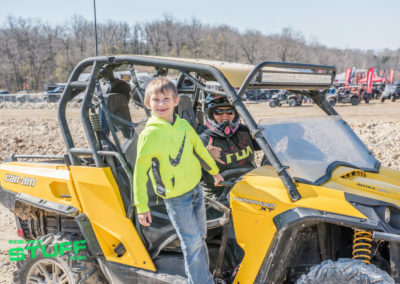 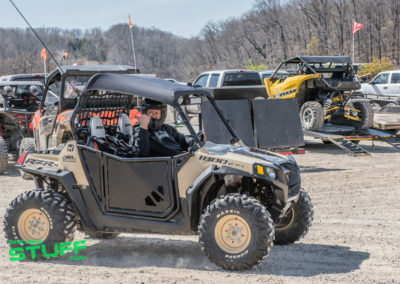 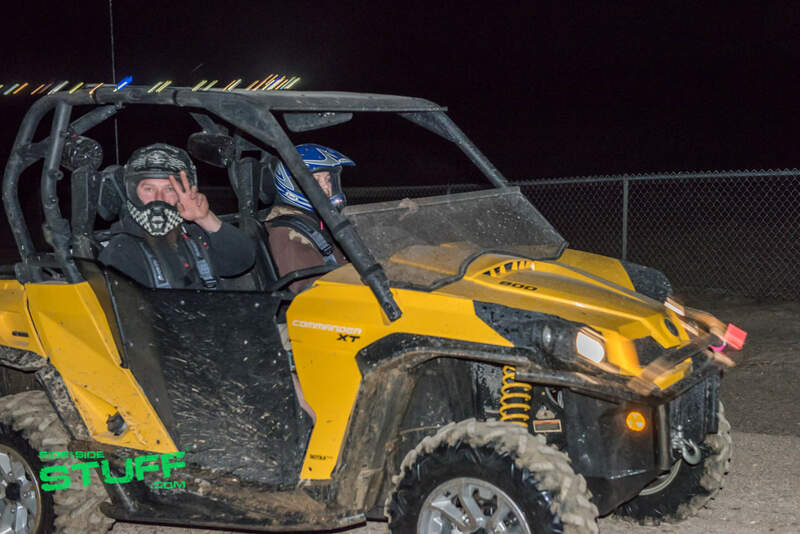 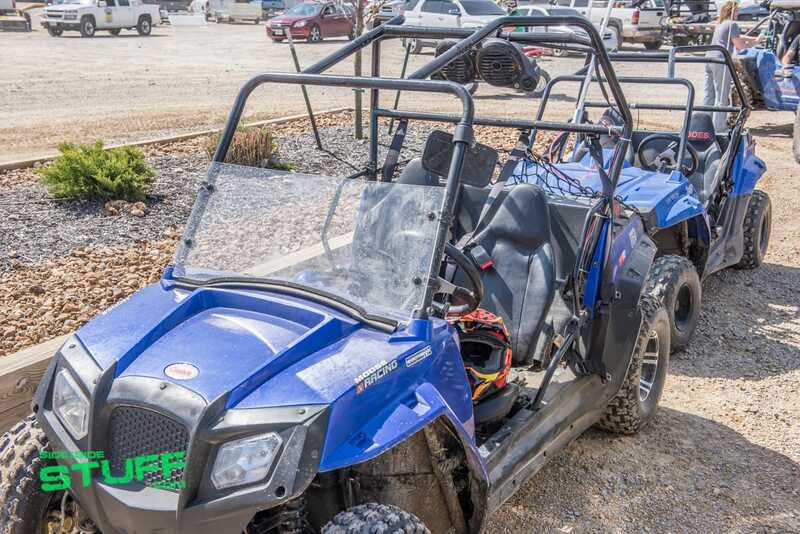 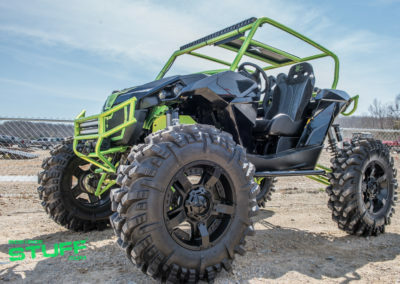 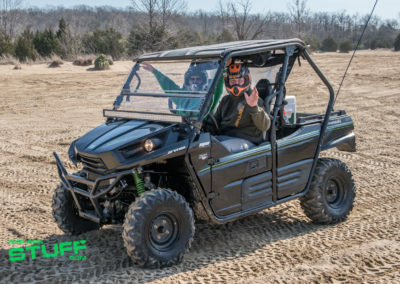 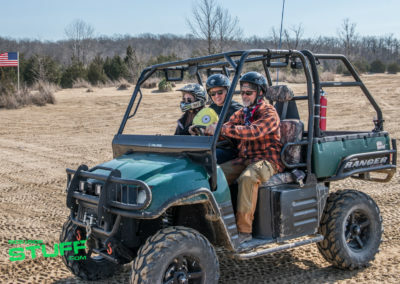 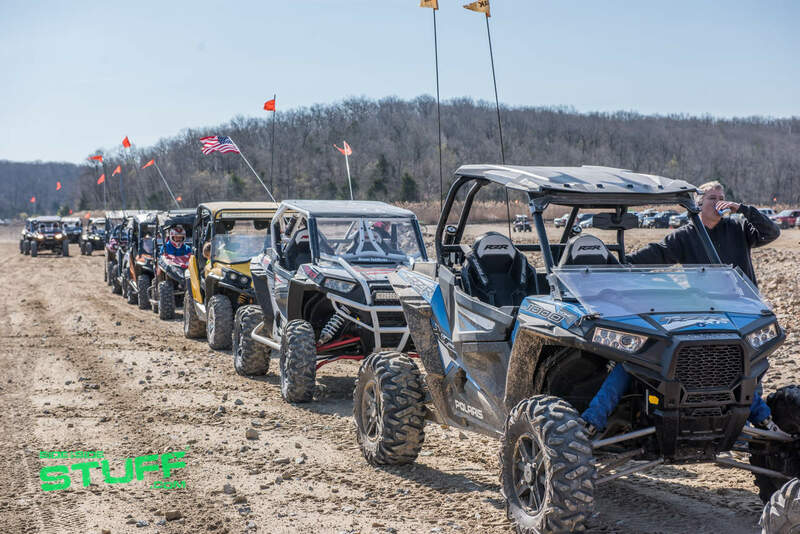 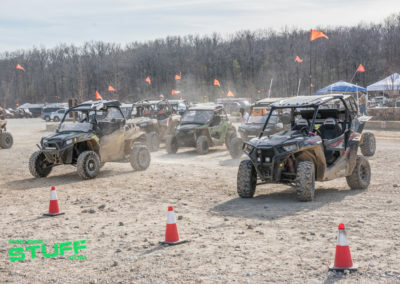 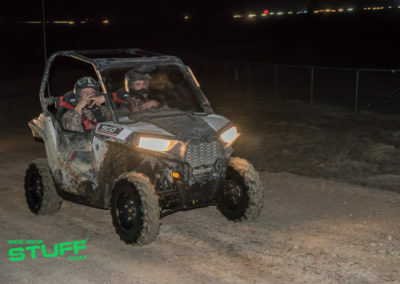 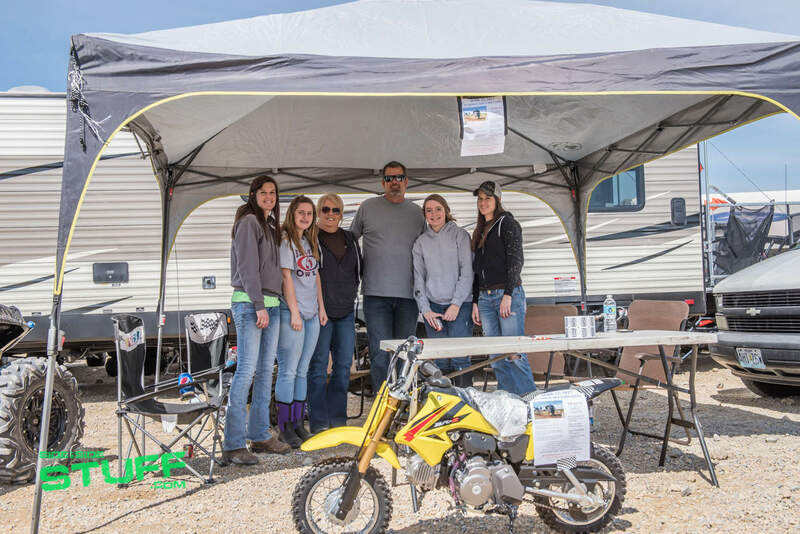 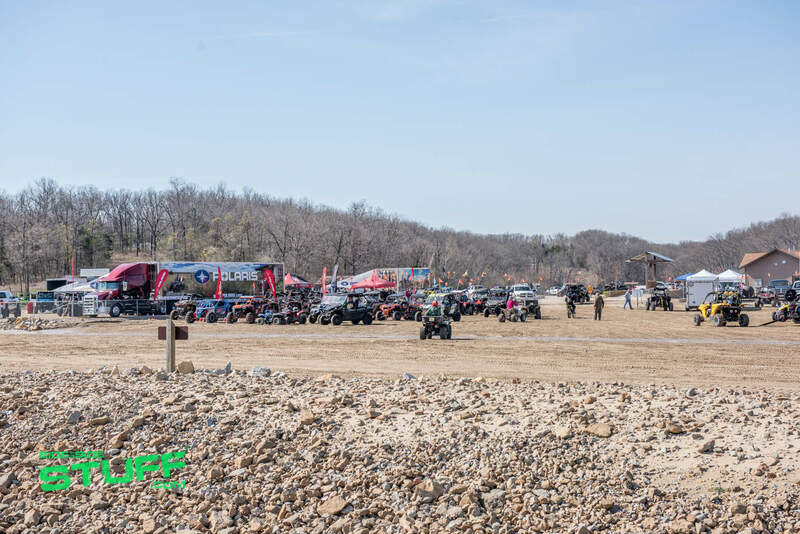 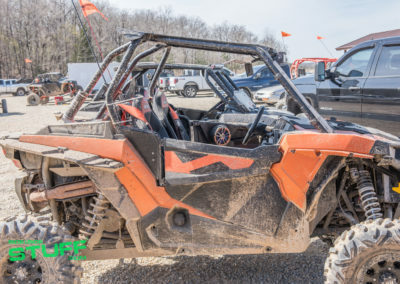 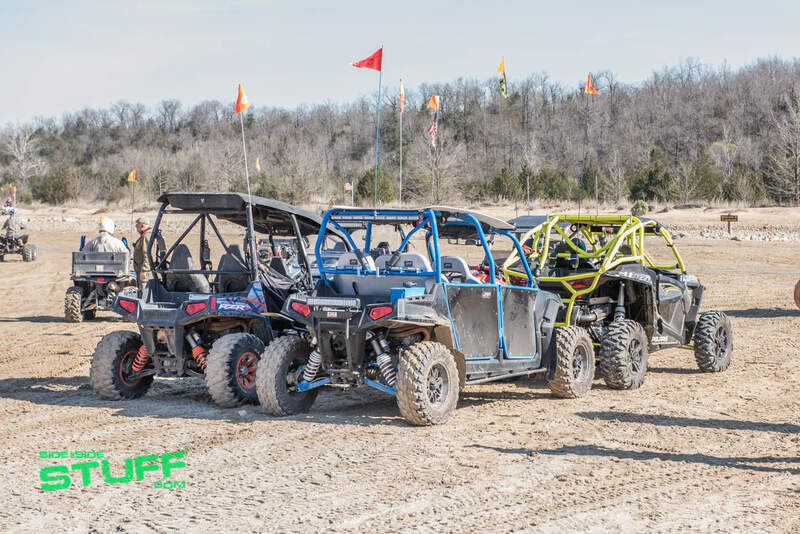 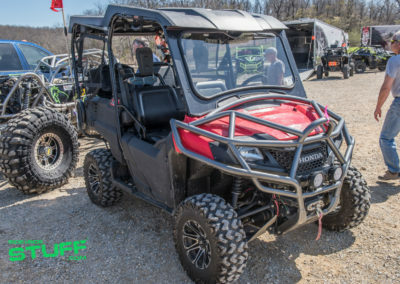 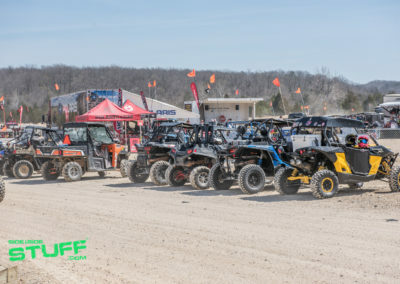 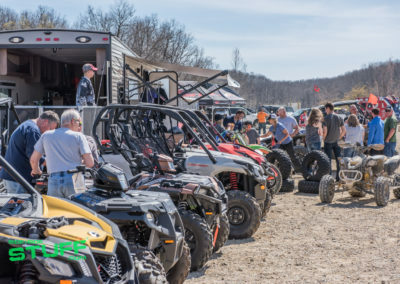 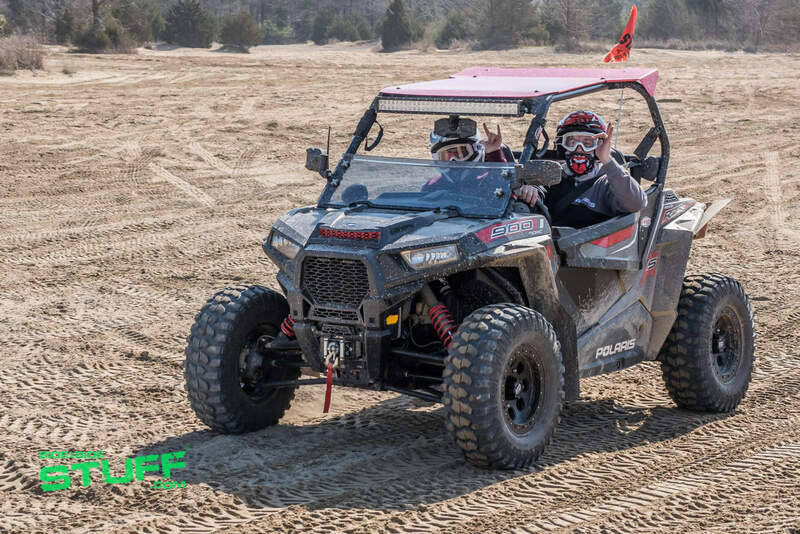 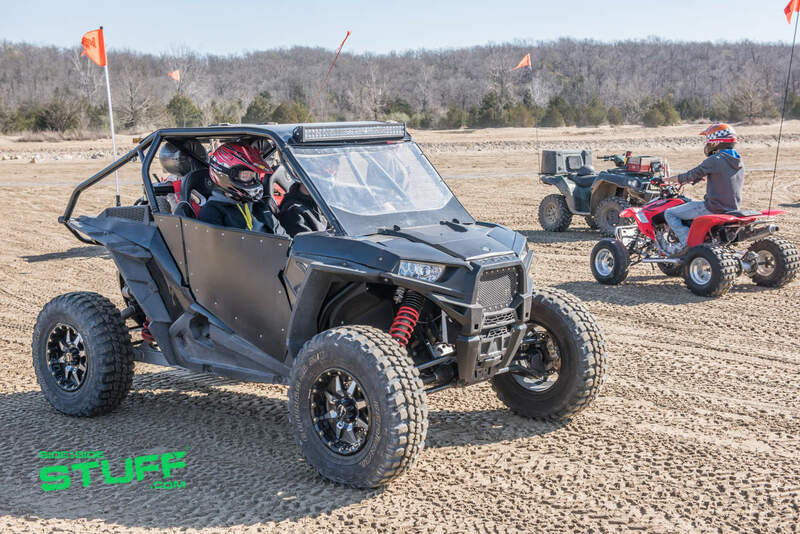 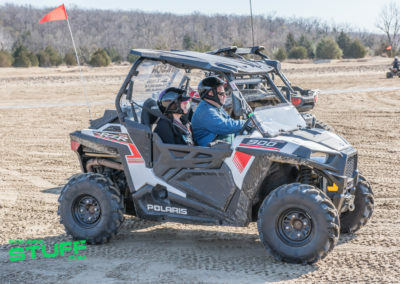 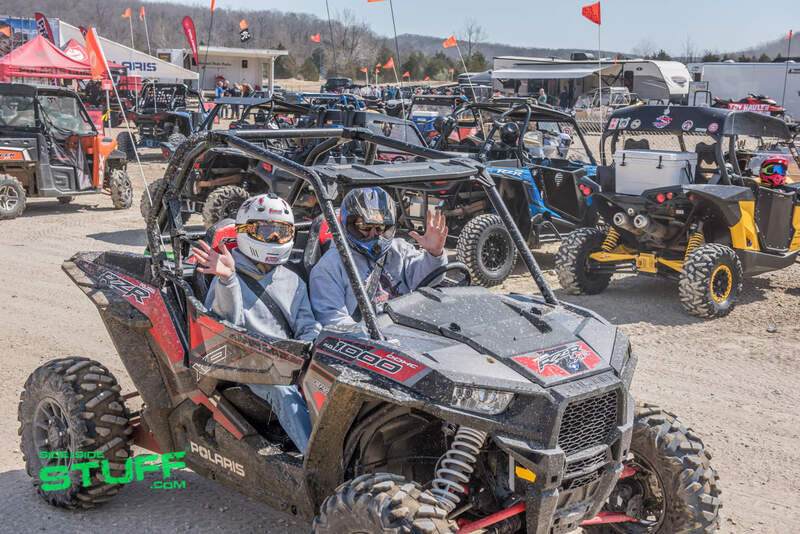 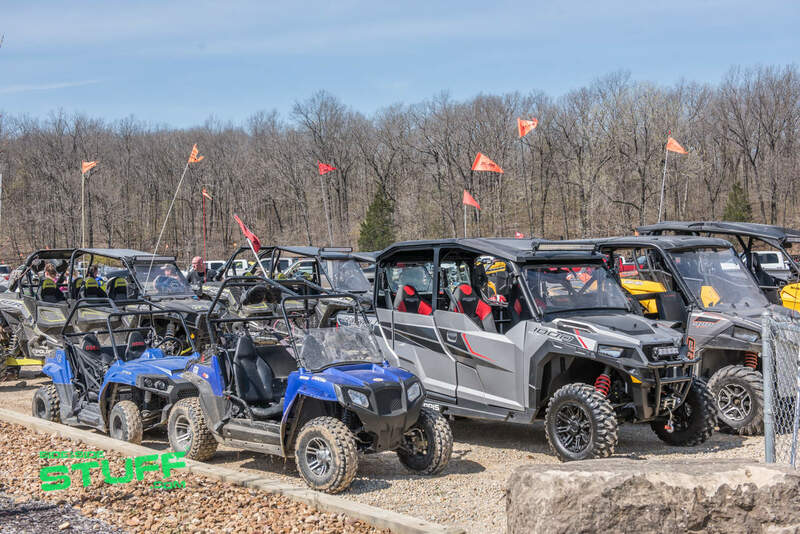 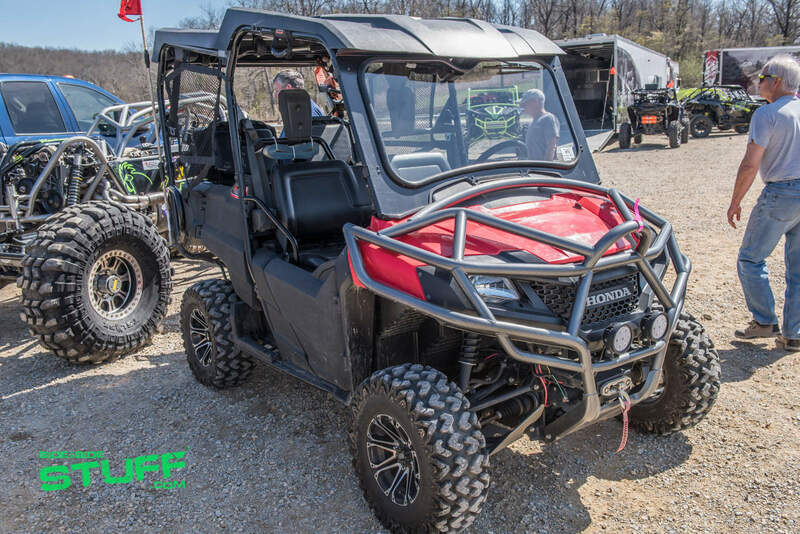 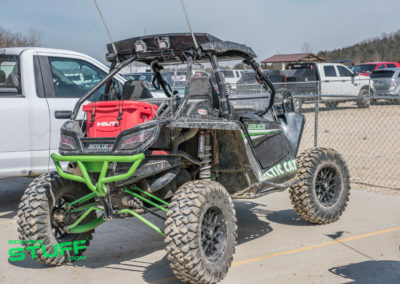 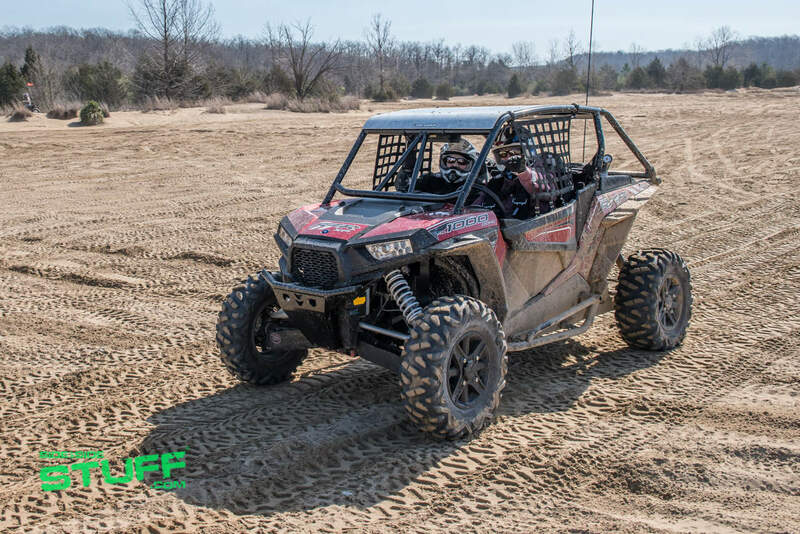 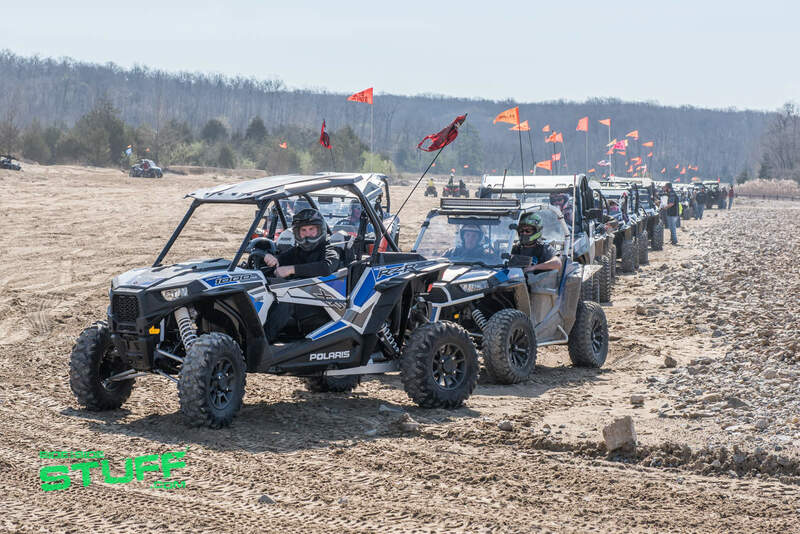 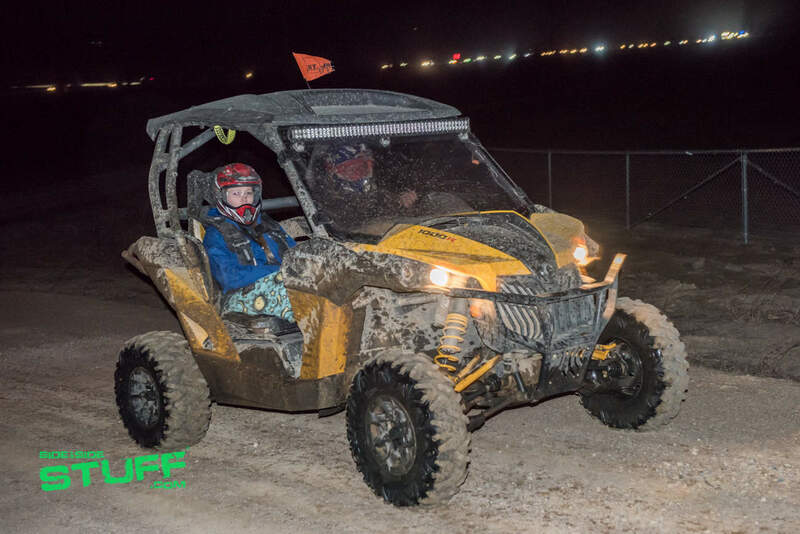 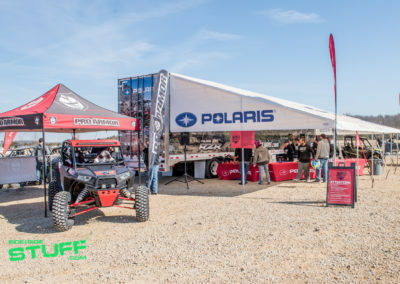 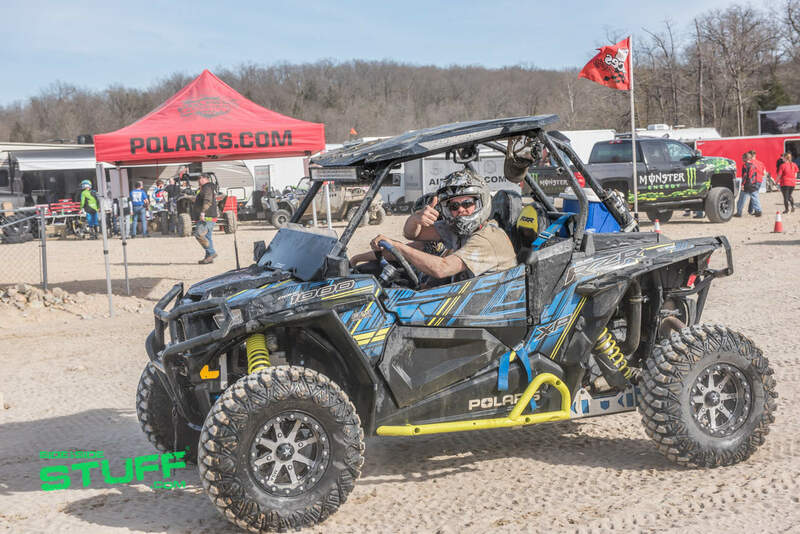 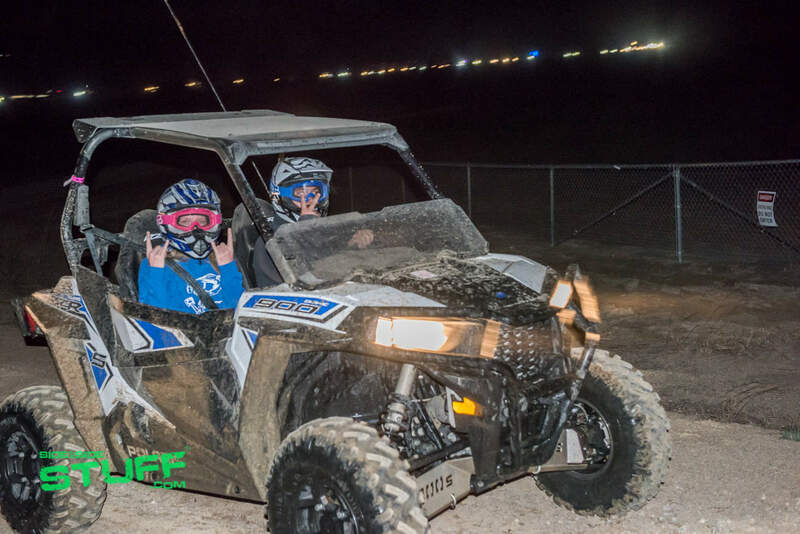 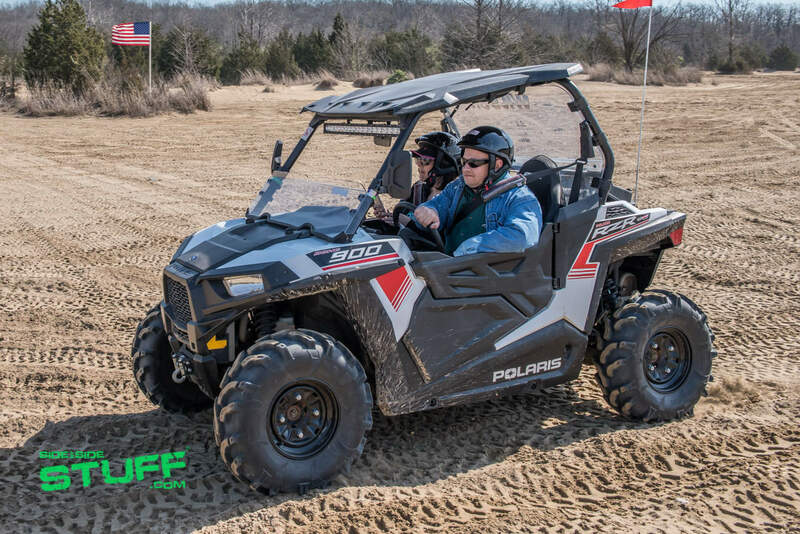 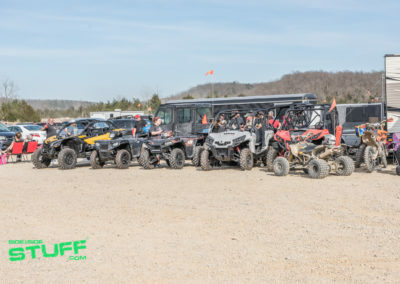 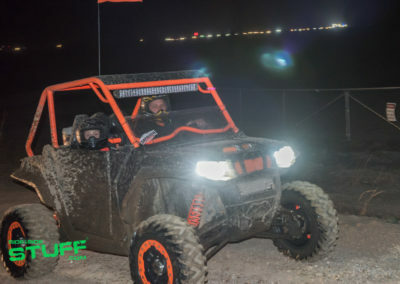 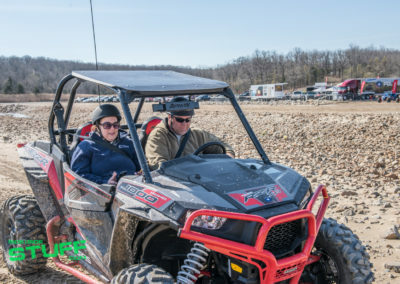 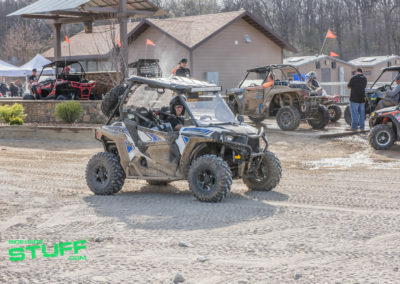 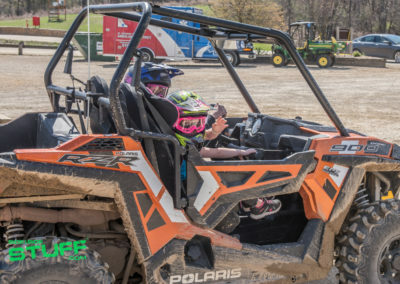 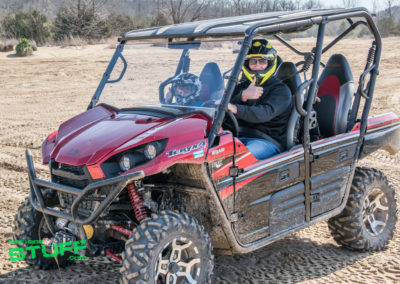 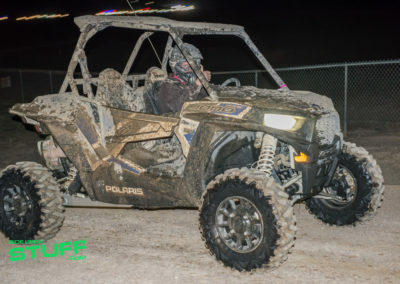 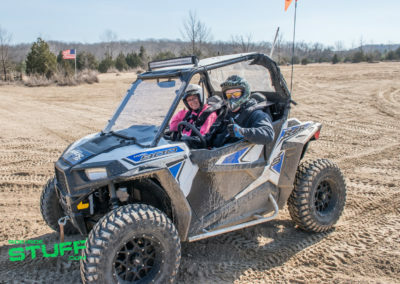 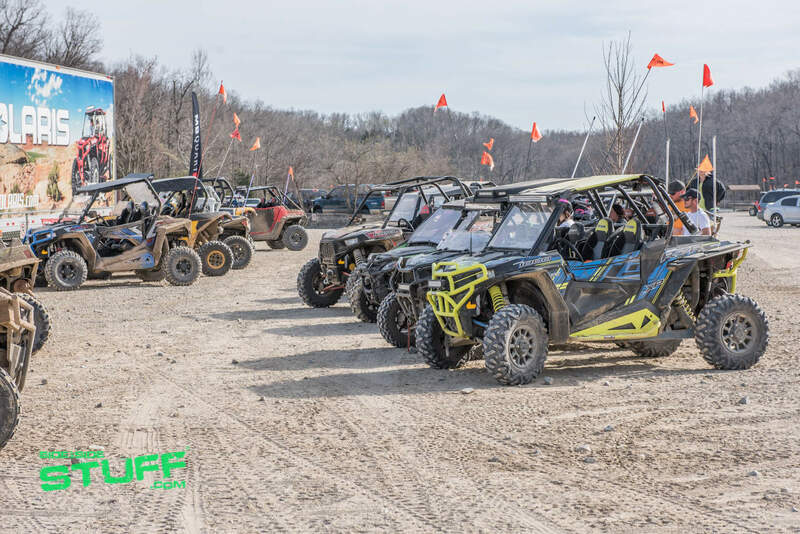 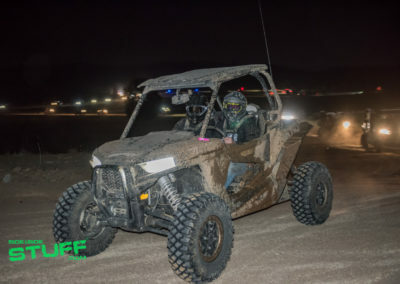 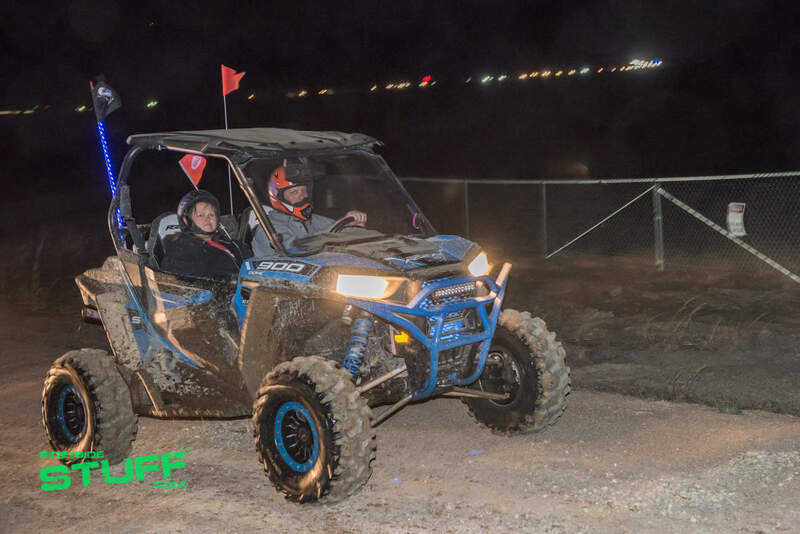 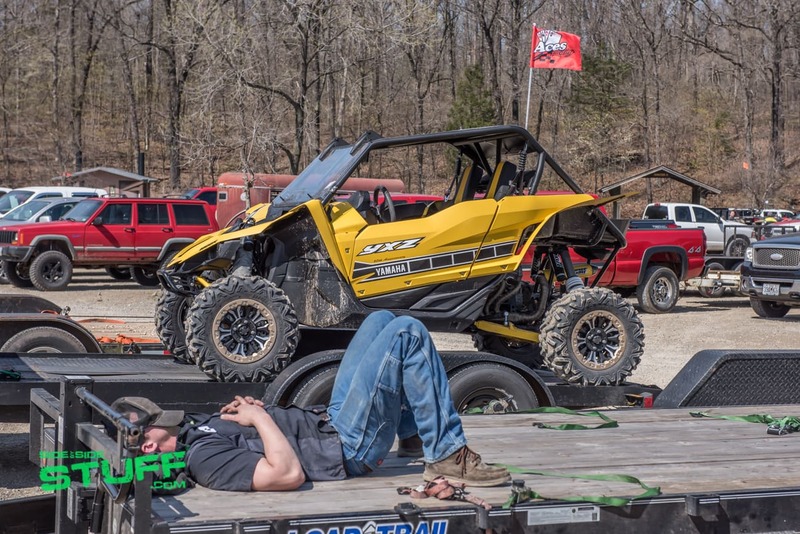 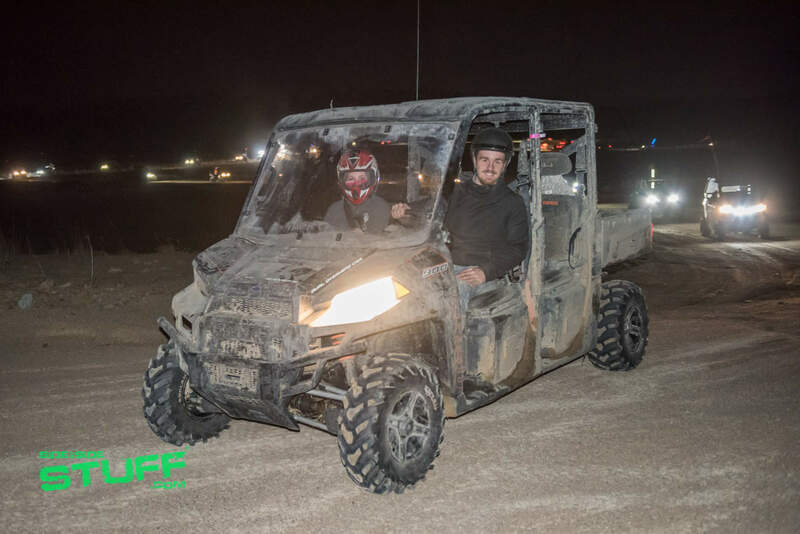 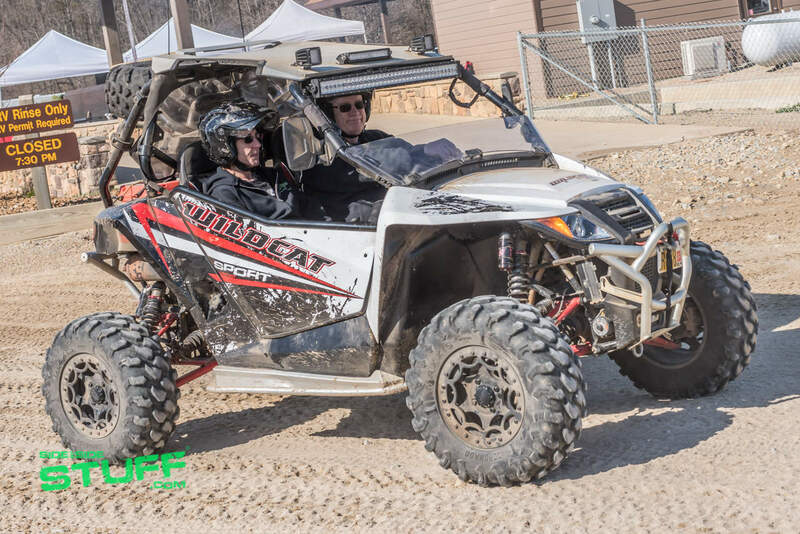 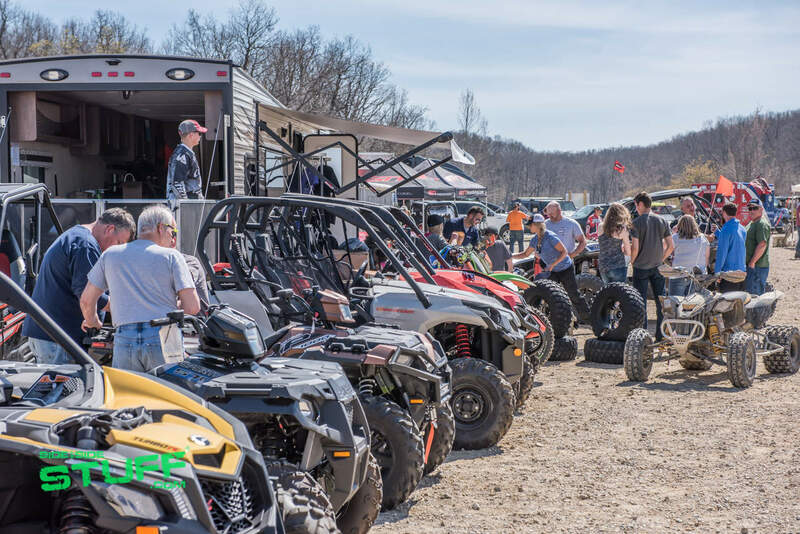 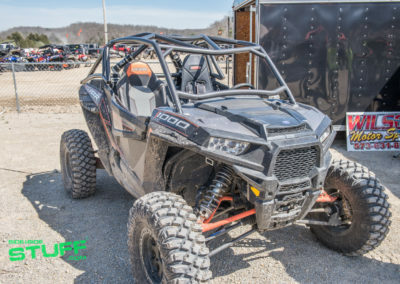 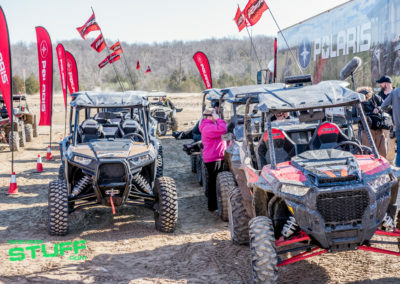 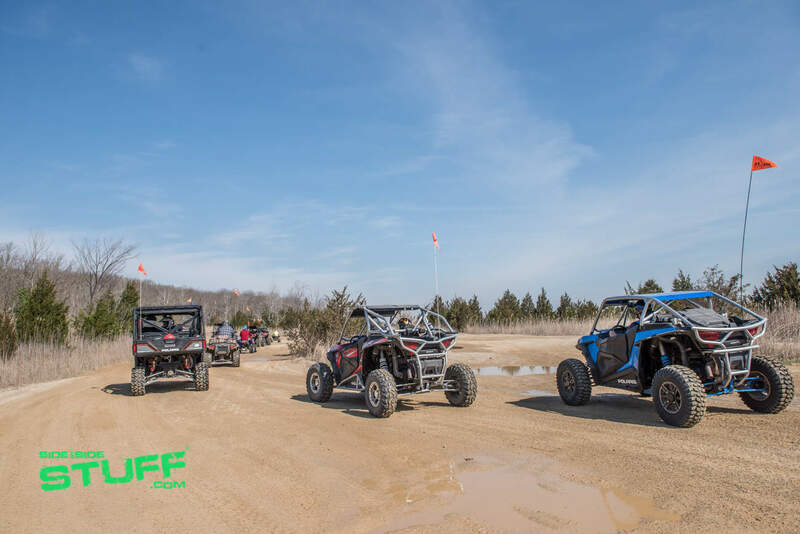 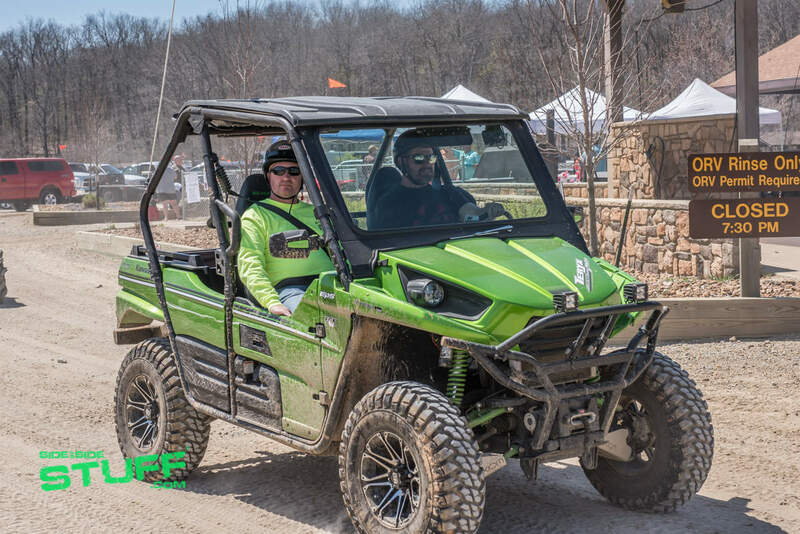 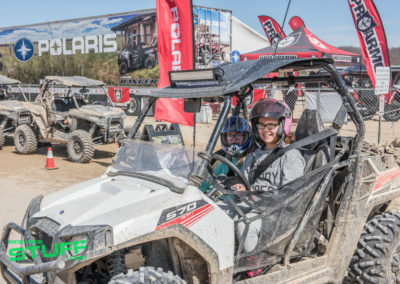 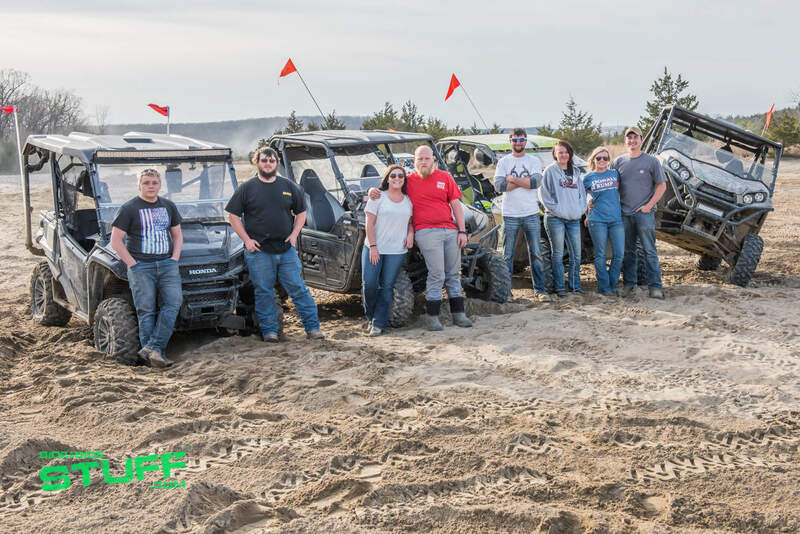 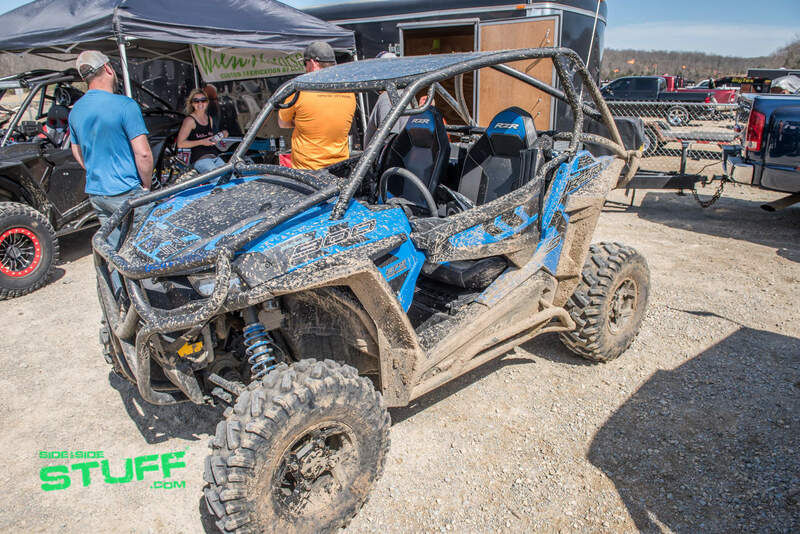 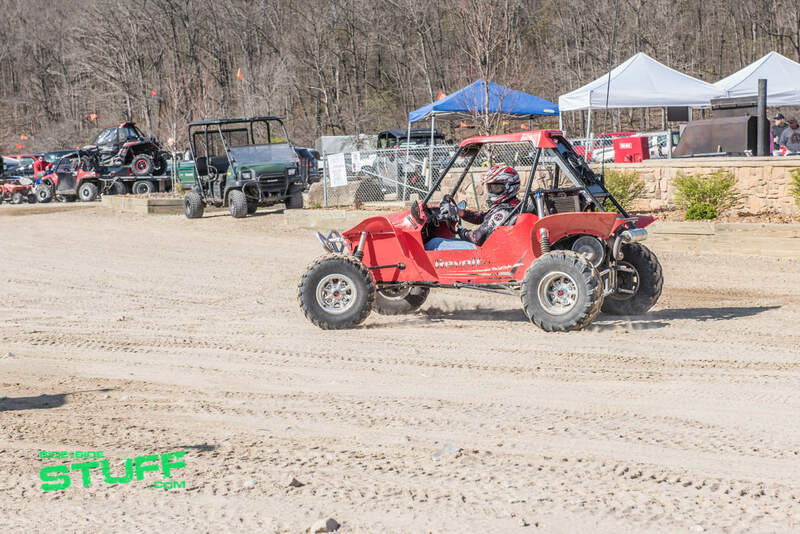 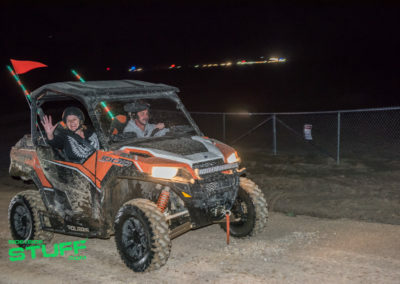 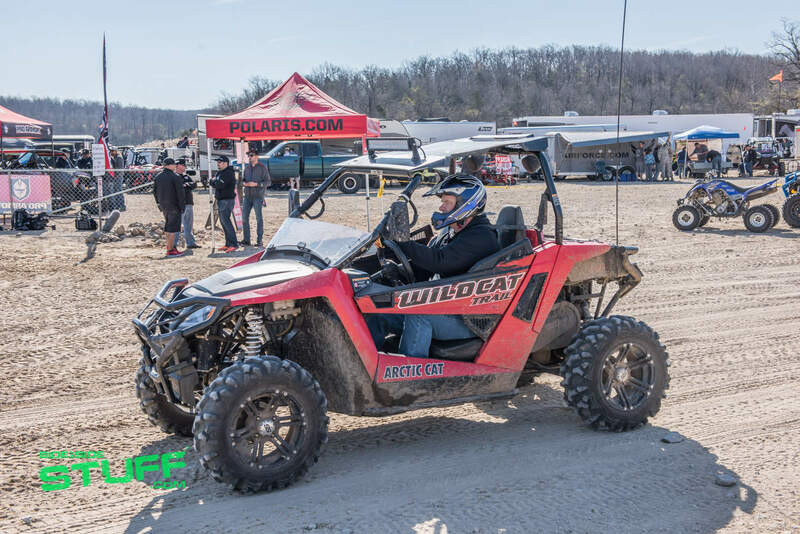 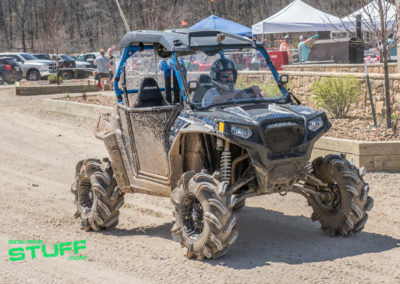 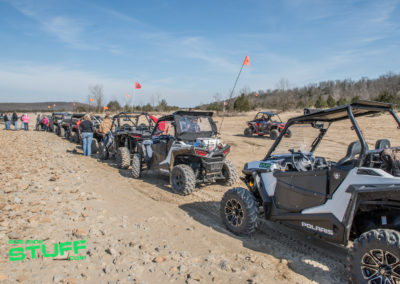 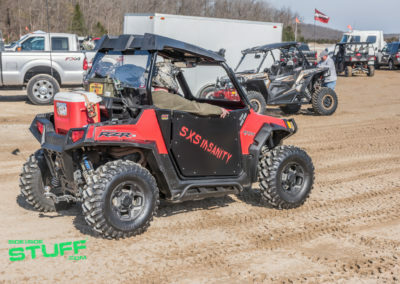 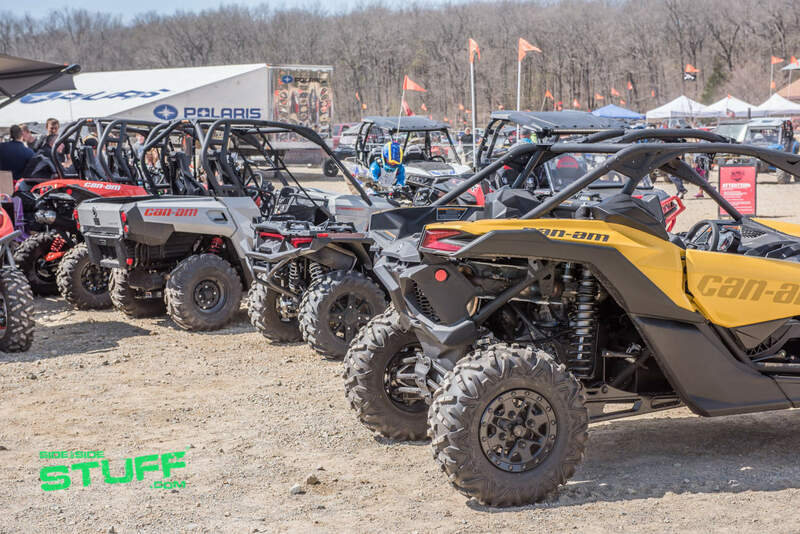 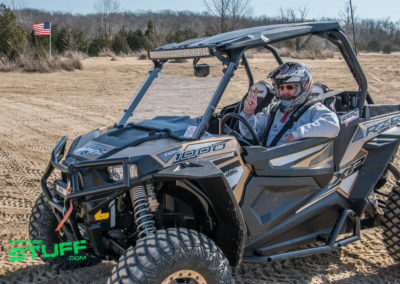 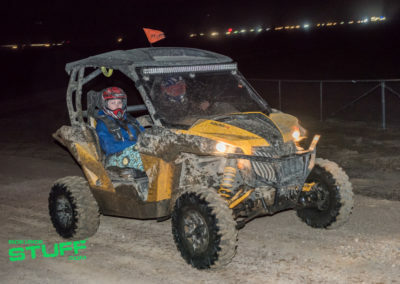 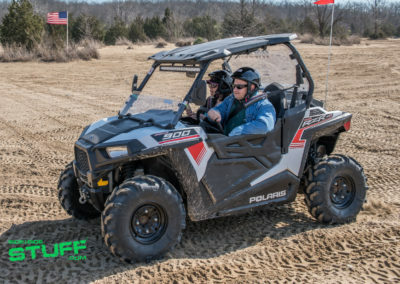 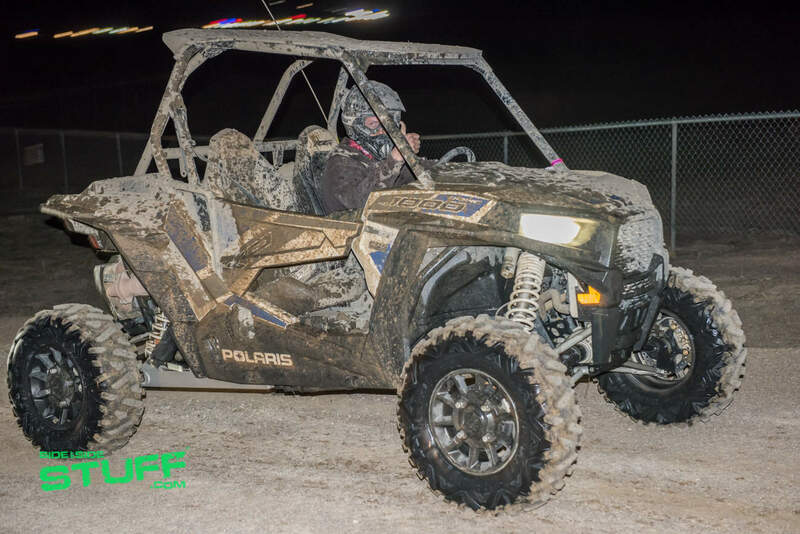 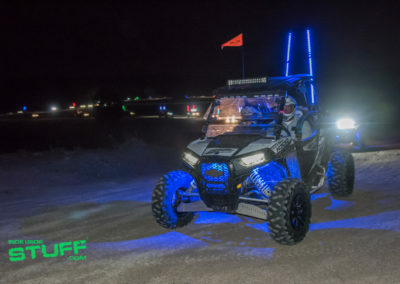 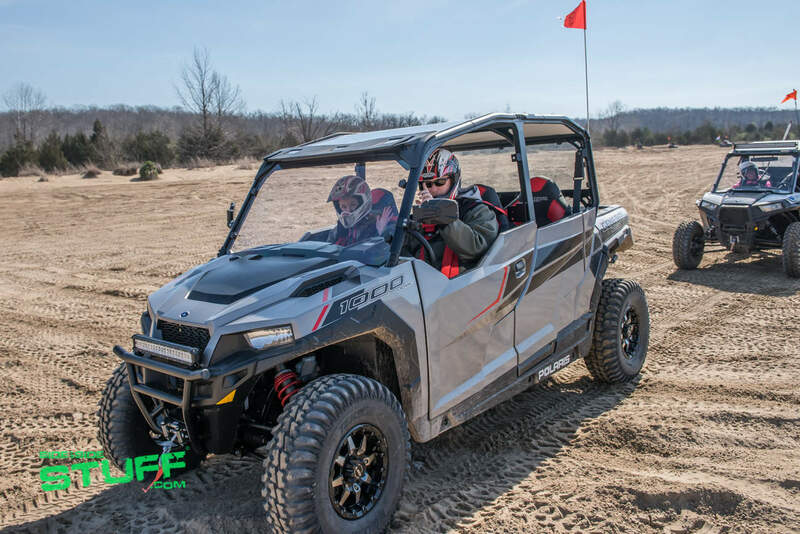 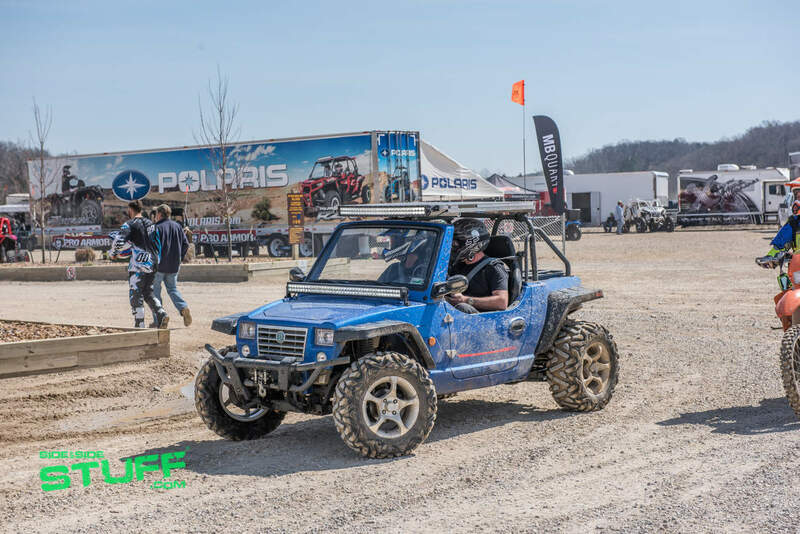 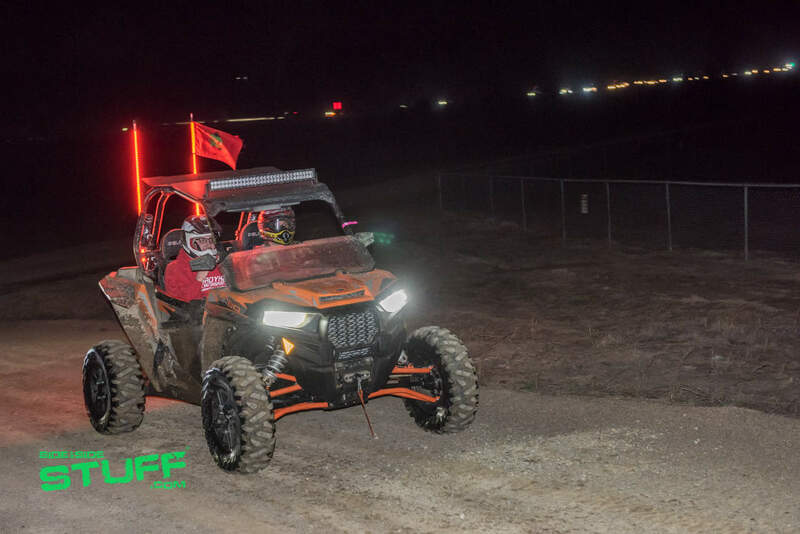 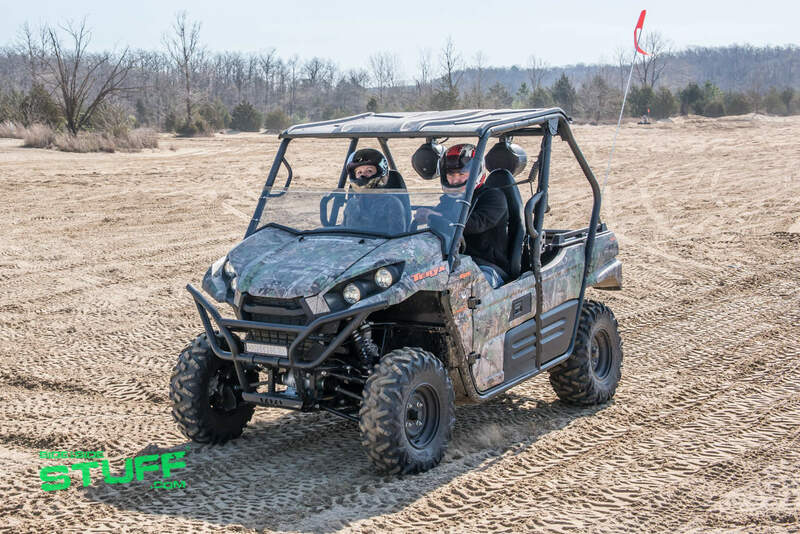 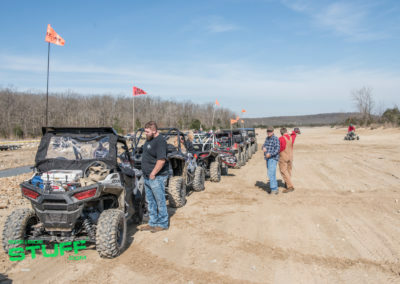 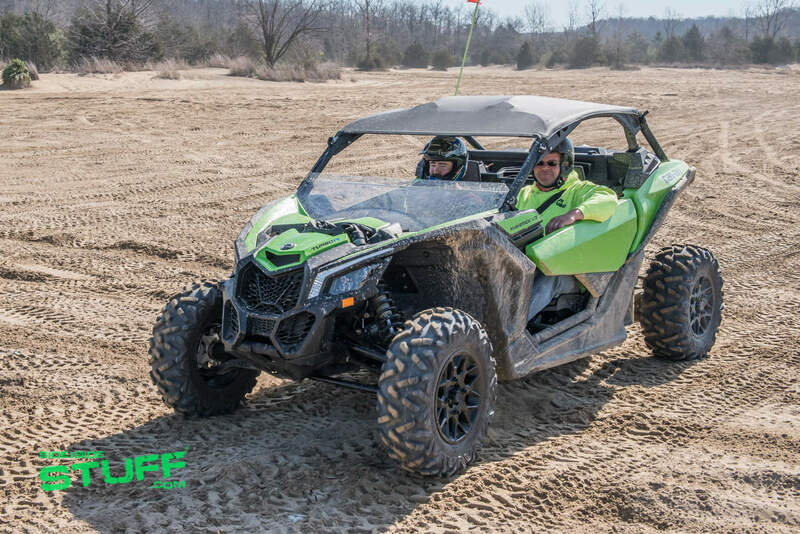 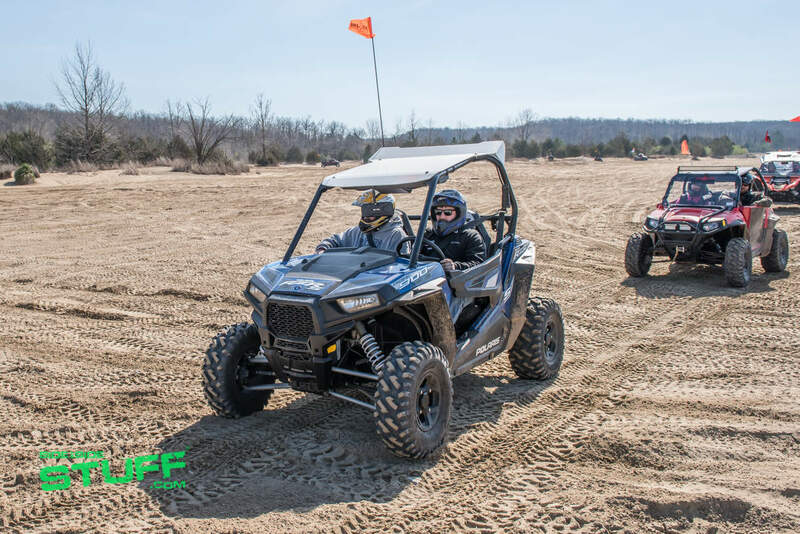 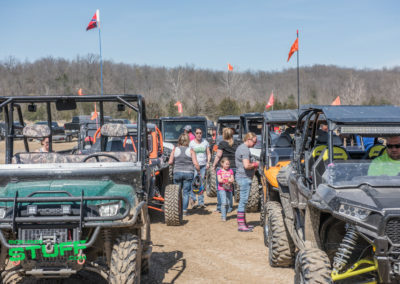 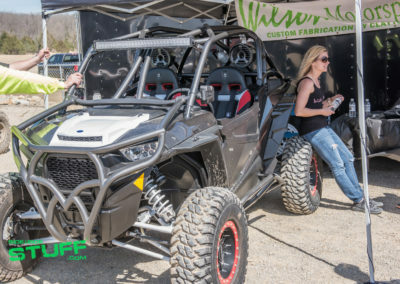 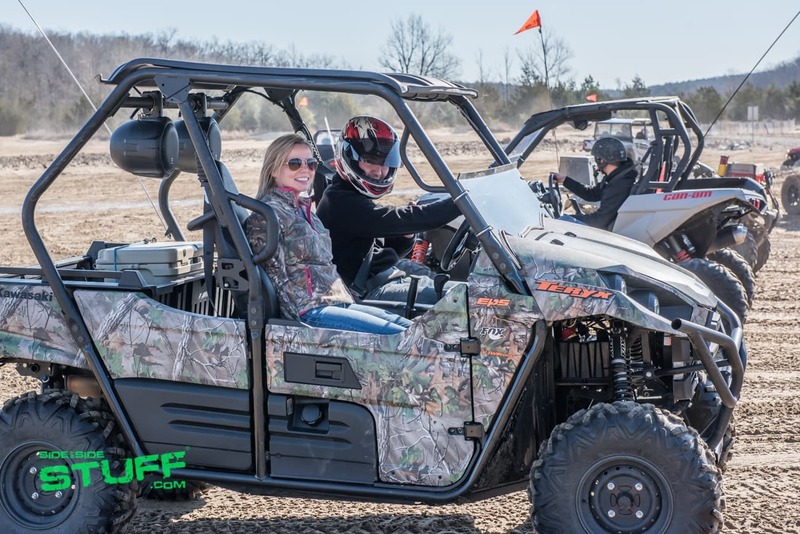 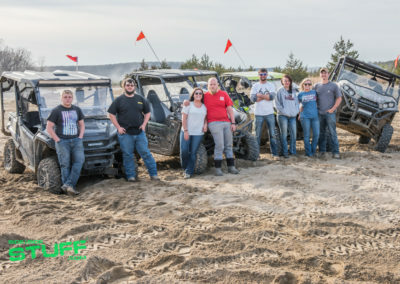 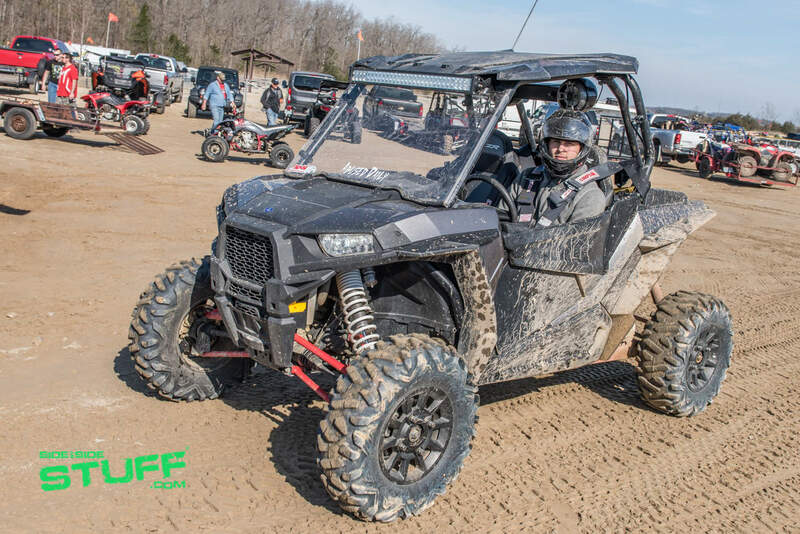 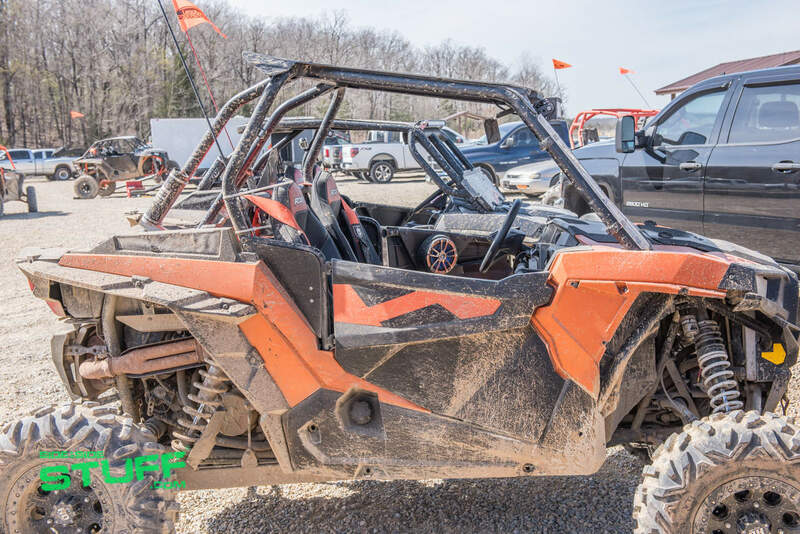 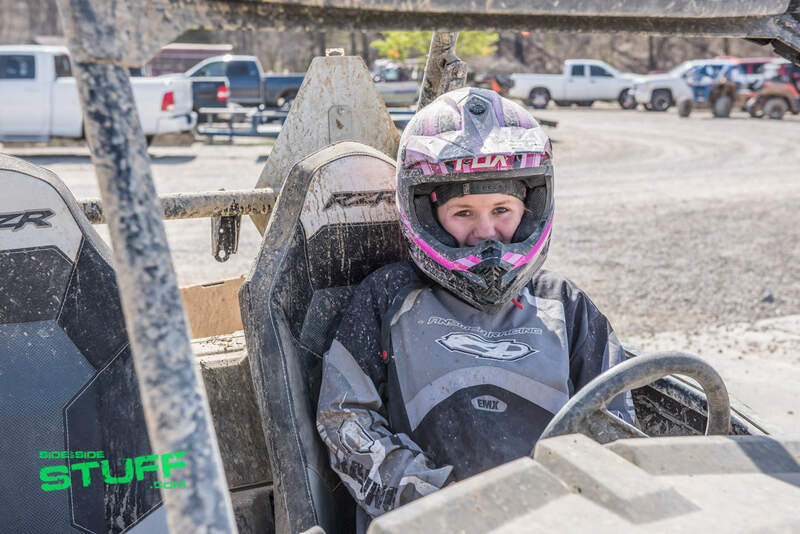 The two day event, hosted by Midwest Sports Center in Farmington, Missouri, had a jam-packed schedule of activates including group rides, live music, a poker run and Polaris RZR factory demo rides. 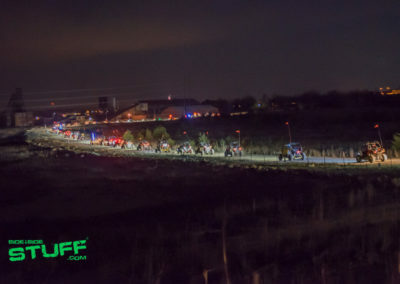 “Great event! 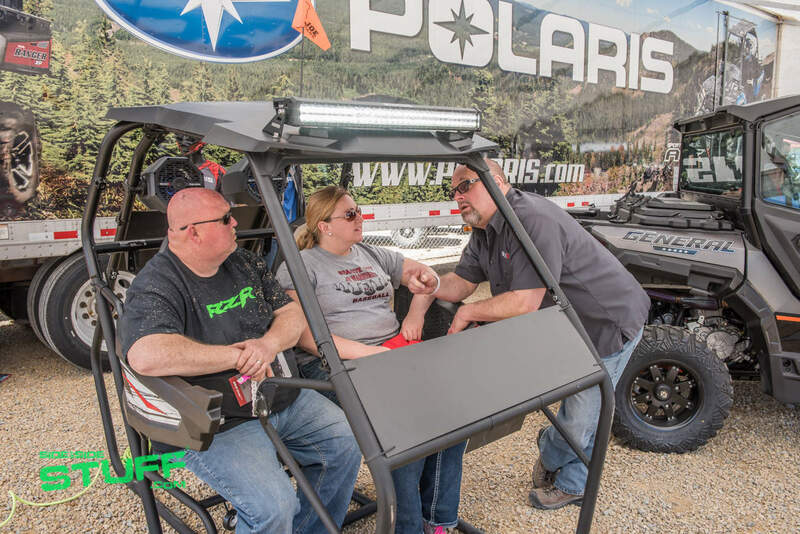 Huge turn out with Polaris, The Experience Tour came out, their parts and accessories team and a bunch of vendors. 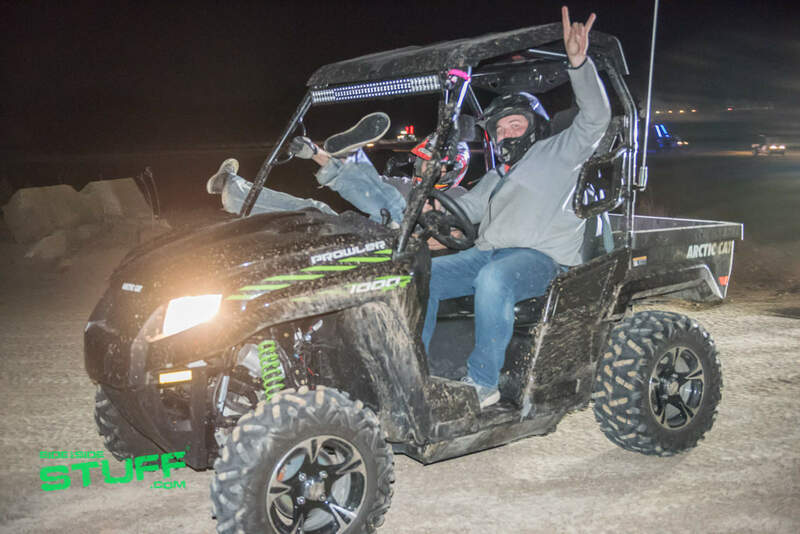 We put this event together to have fun with our customers!” – Kegan Gravett, event founder / organizer and internet manager / sales representative for Midwest Sports Center. 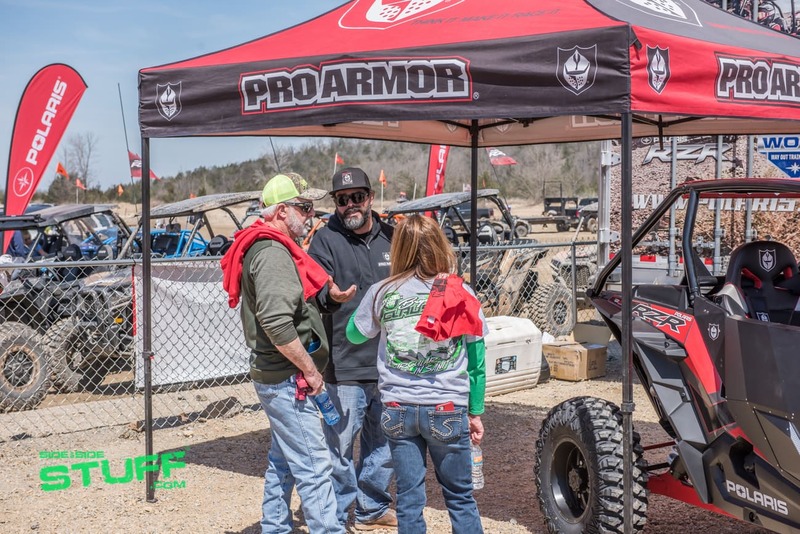 Attendees had lots of opportunities to win prizes throughout the weekend. 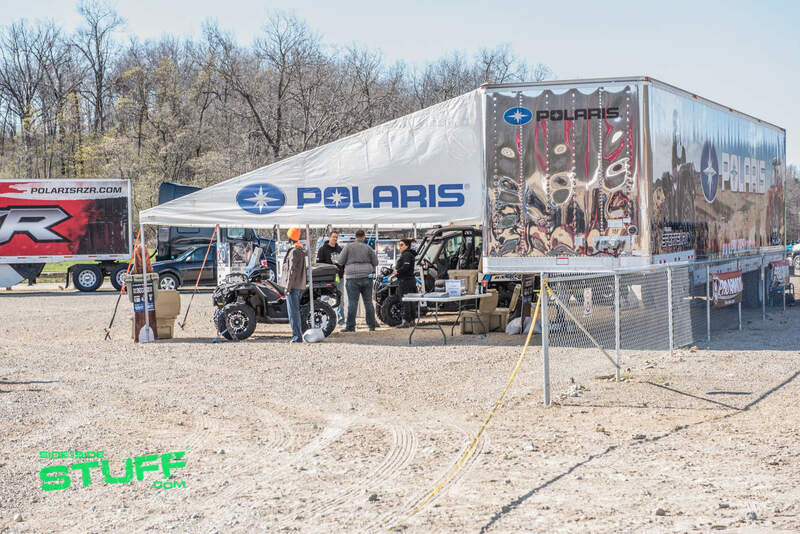 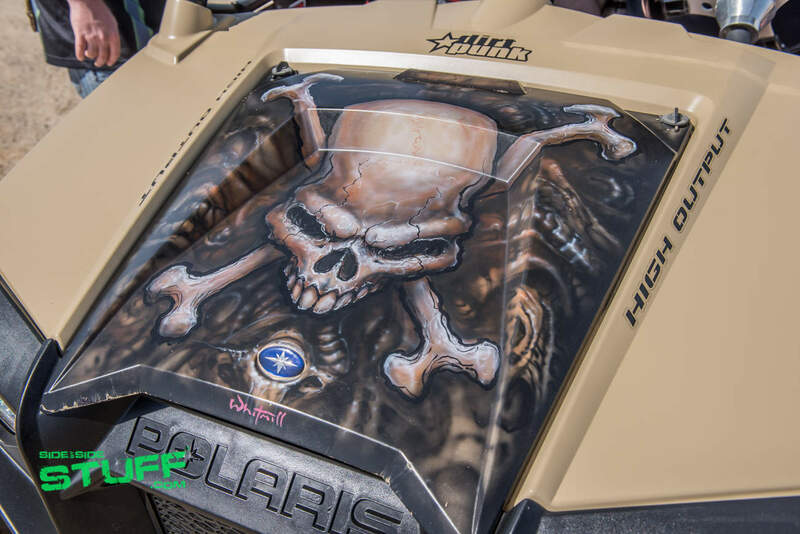 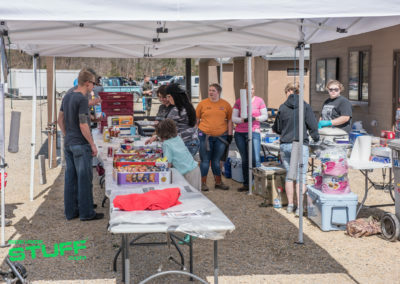 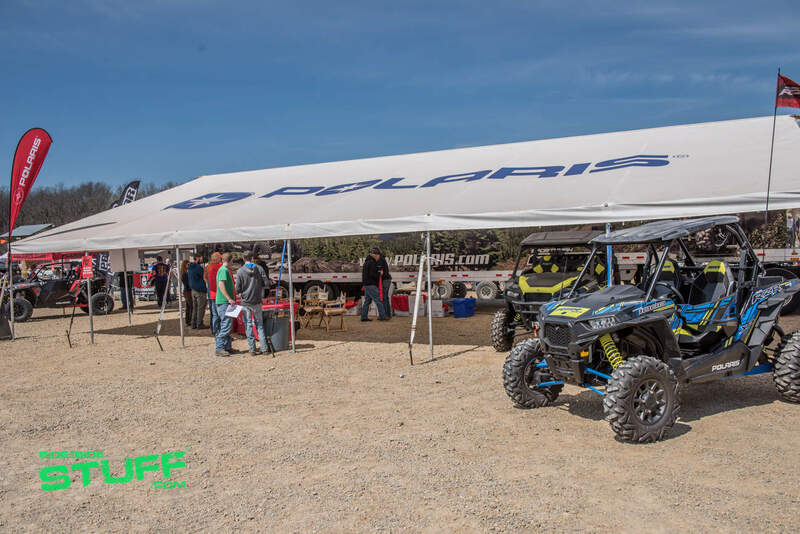 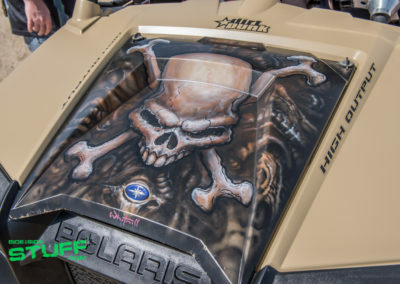 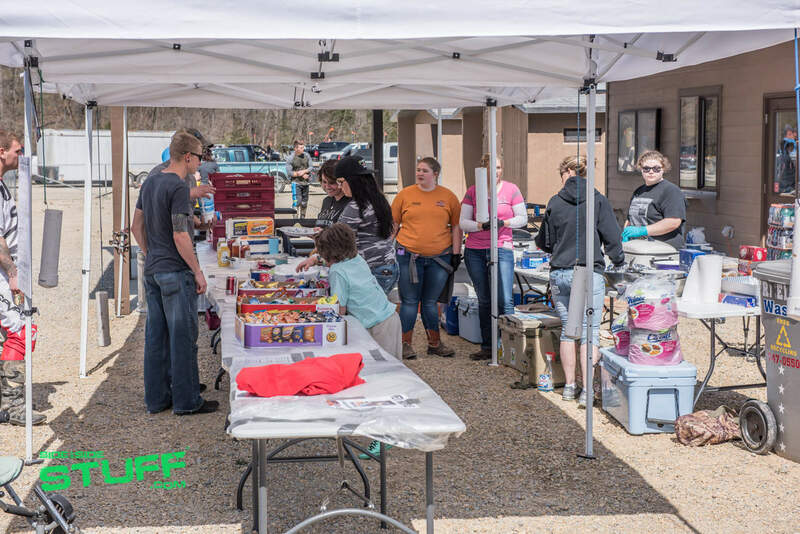 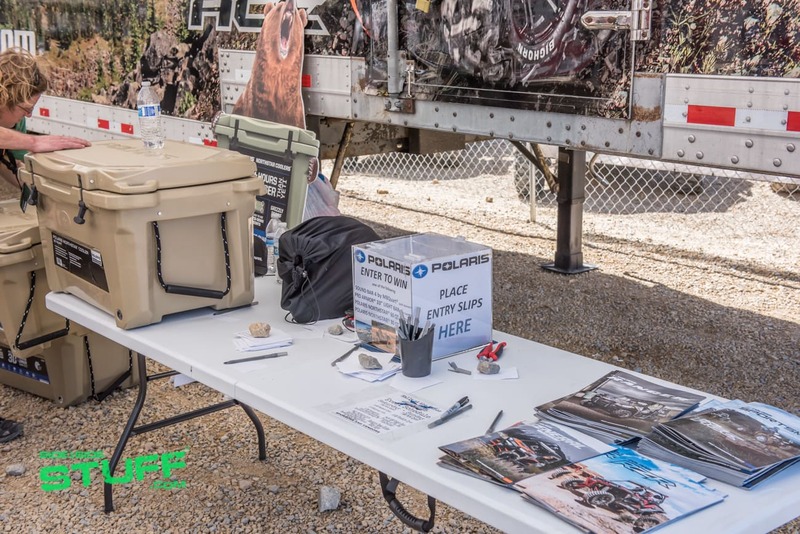 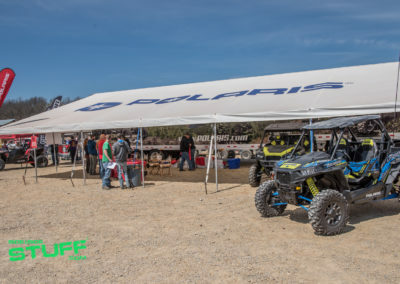 Not only was Polaris handing out goodies but several charity raffles took place at the event as well. 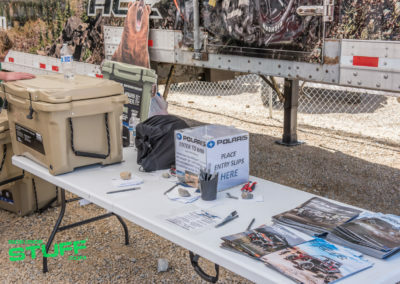 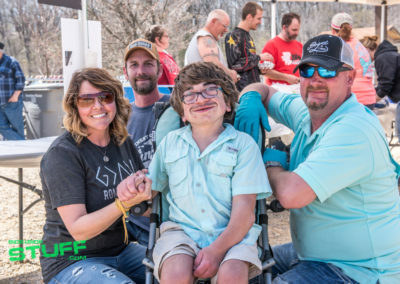 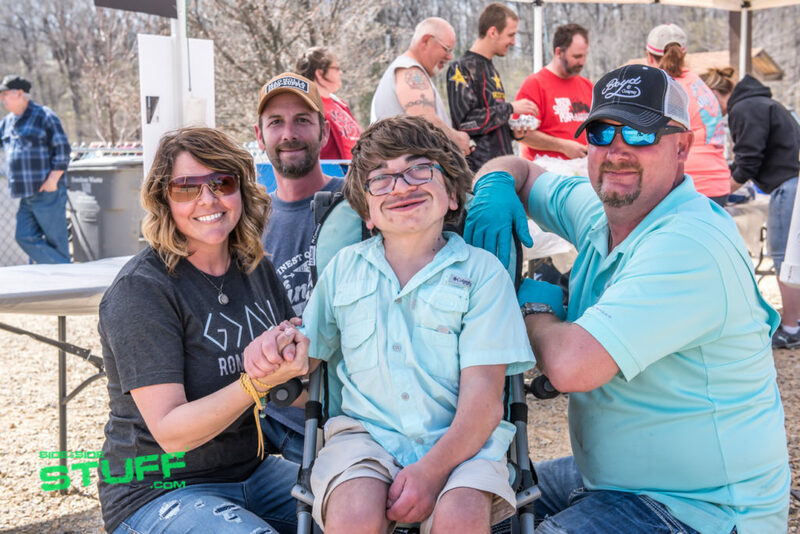 A Yeti prize package where the proceeds combined with proceeds from the food vendor benefited the Regan Richardson Charity helping a young man with MSP1 Hurler Syndrome achieve his dream of getting a service dog. 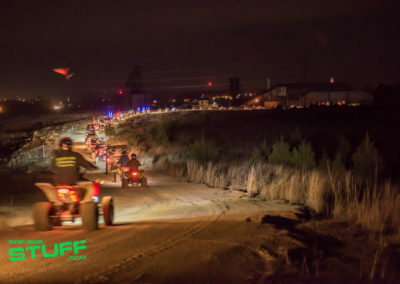 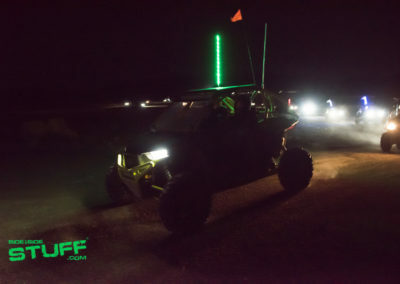 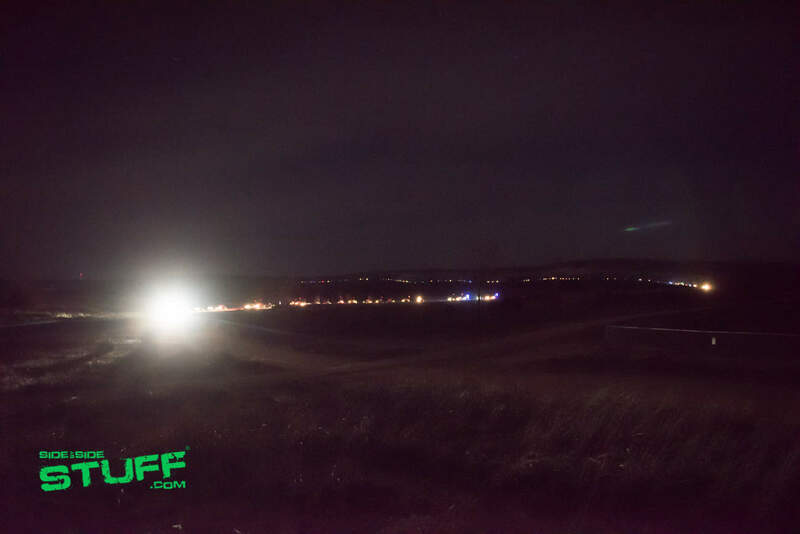 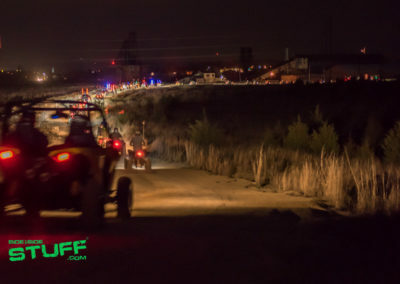 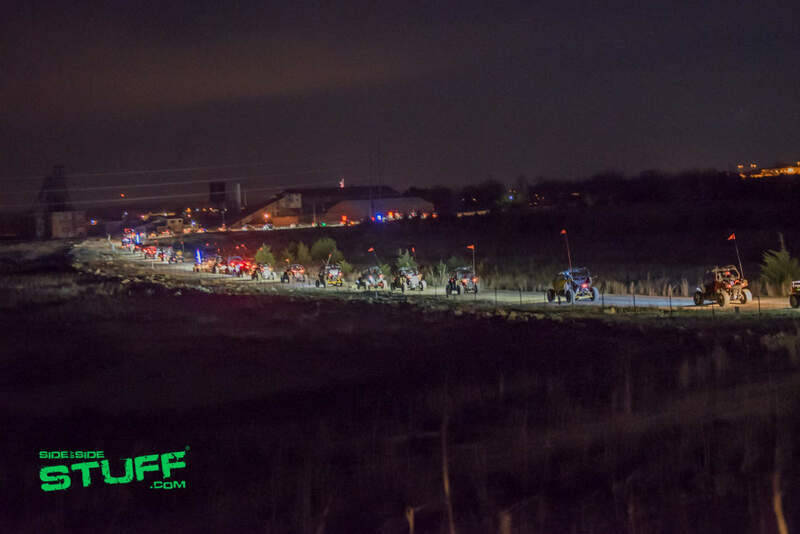 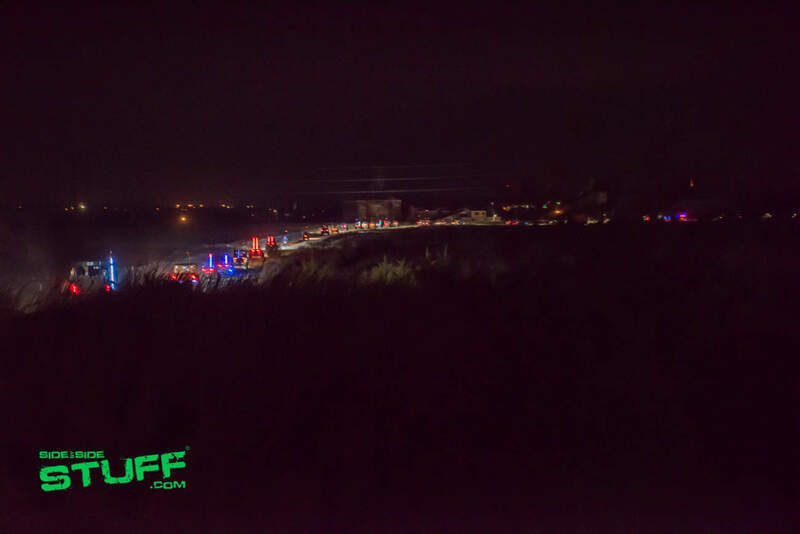 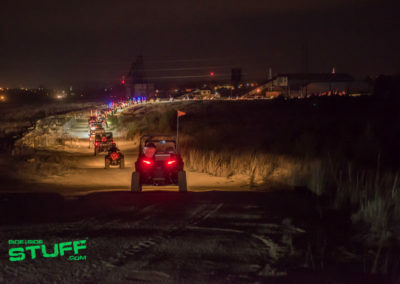 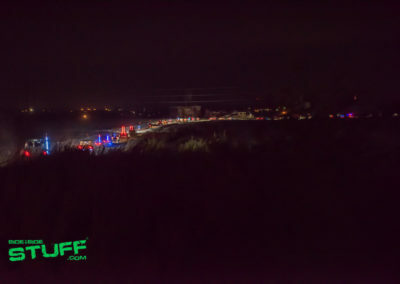 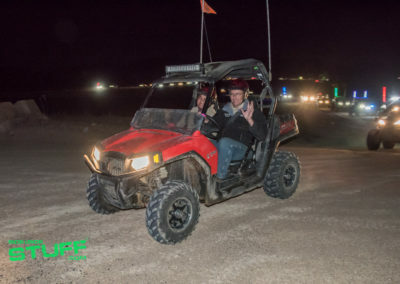 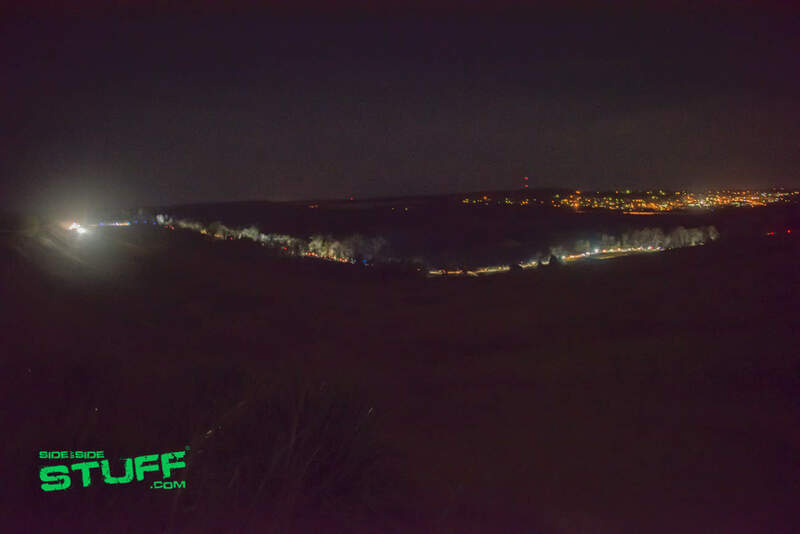 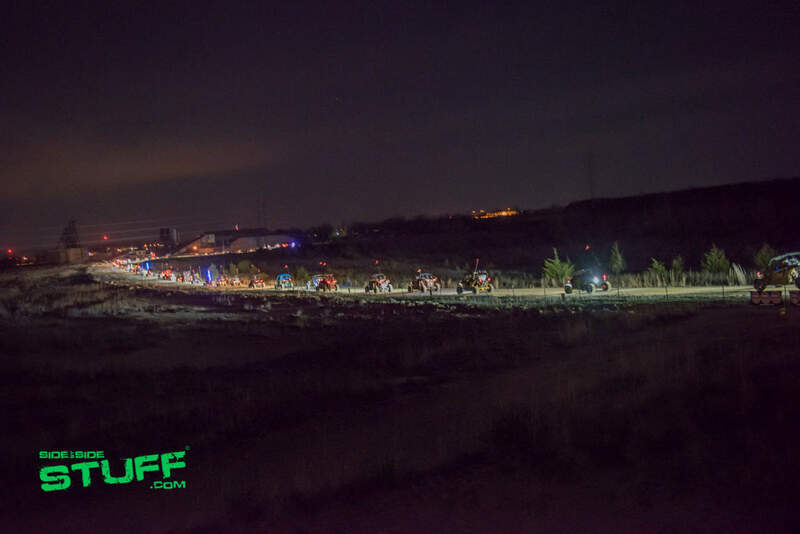 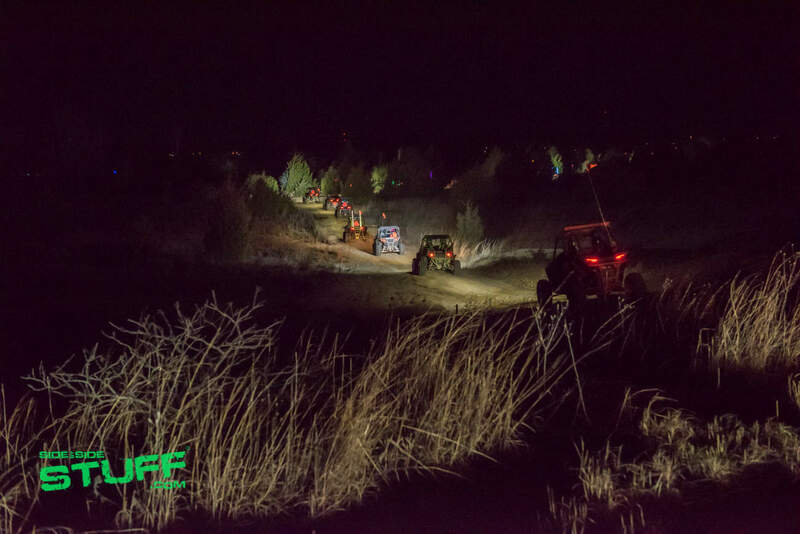 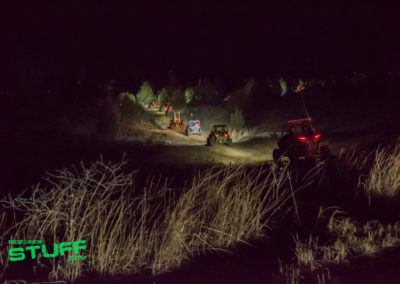 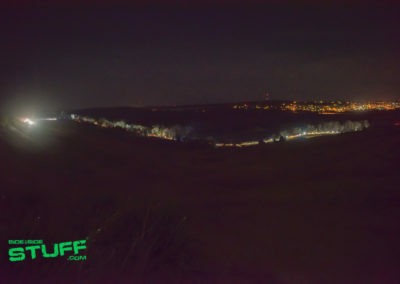 In fact, almost all of the event’s activities were held in behalf of charity, including a night ride food drive that had just under 300 machines in participant; truly an epic sight, you could see lights from the convoy of machines stretched out almost 2 miles long. 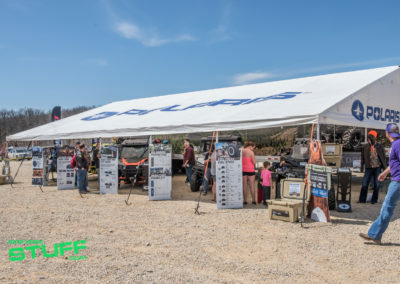 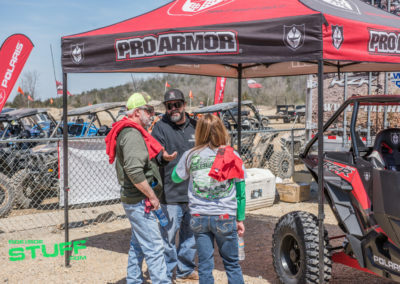 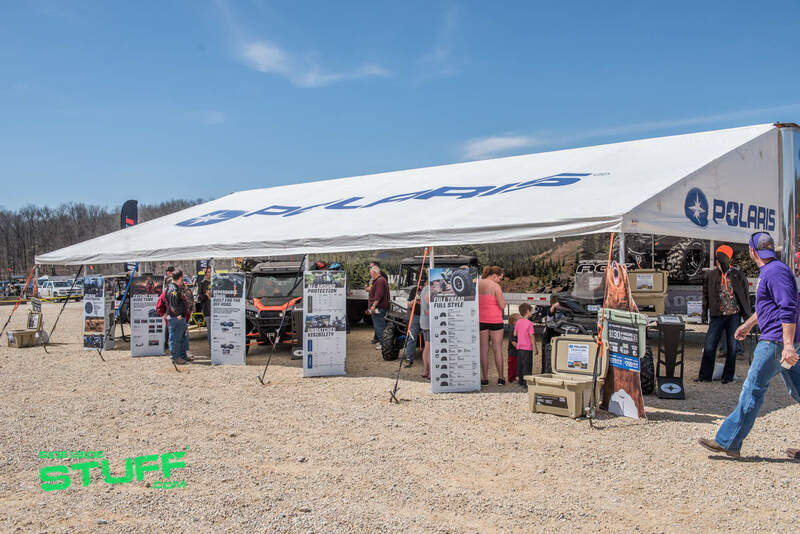 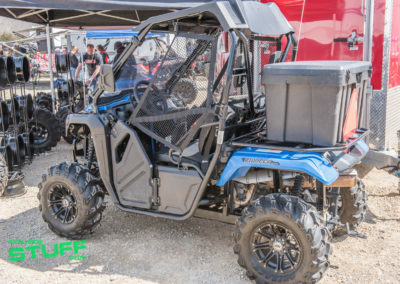 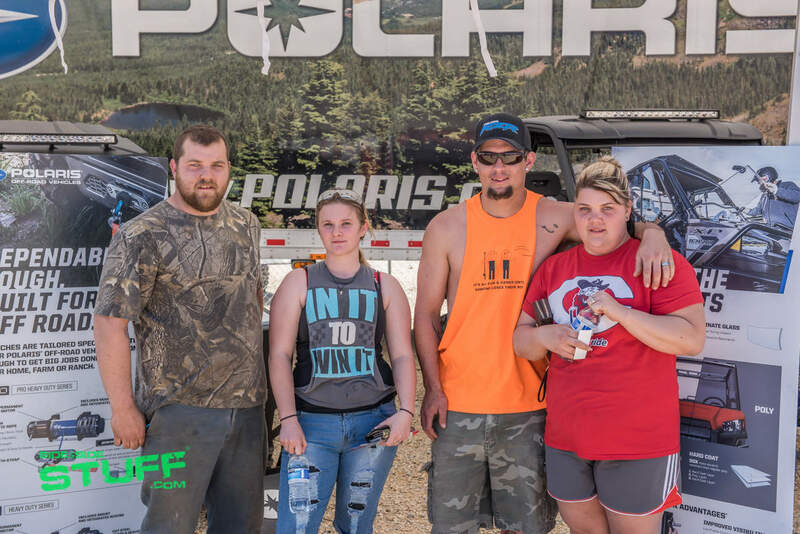 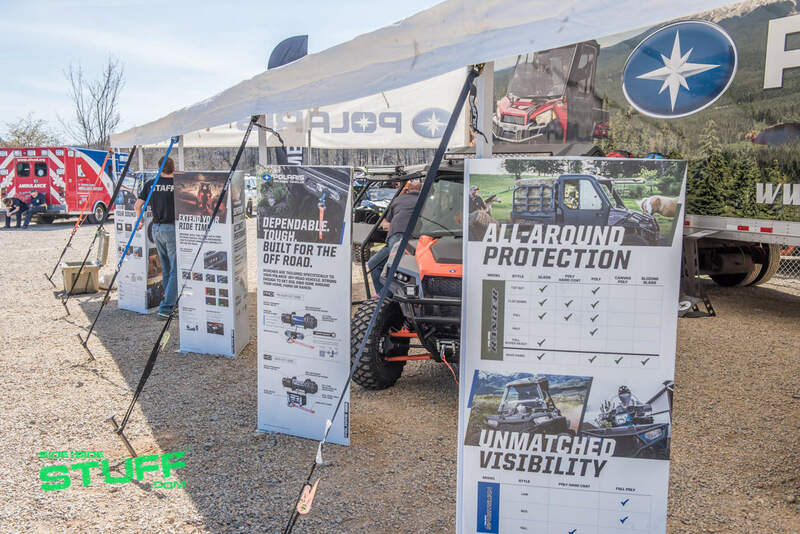 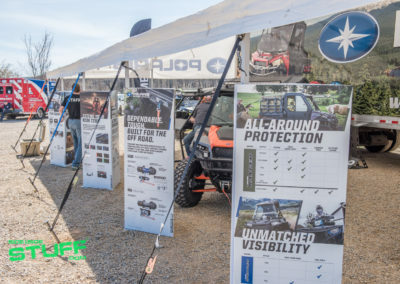 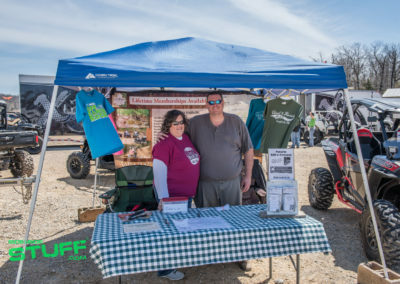 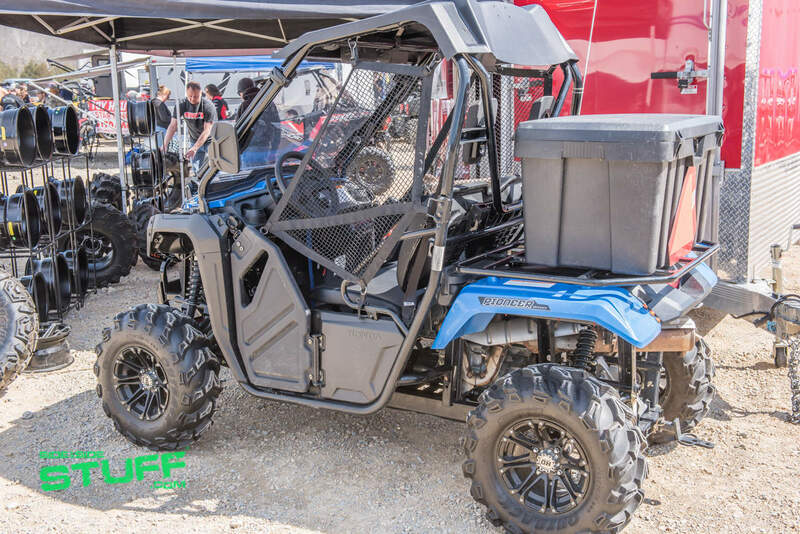 Within the main event area attendees had the opportunity to check out a variety of vendor booths from SxS builders like Xposse Xtreme Machines to UTV parks like Cloud 9 Ranch. 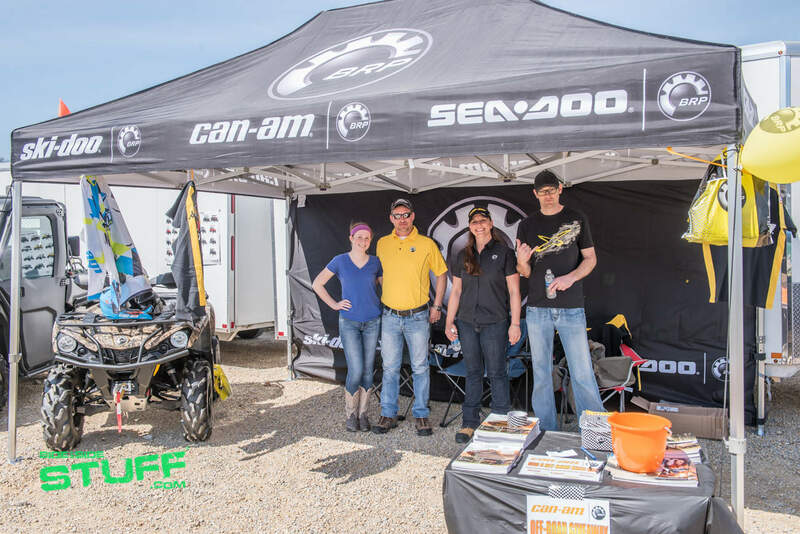 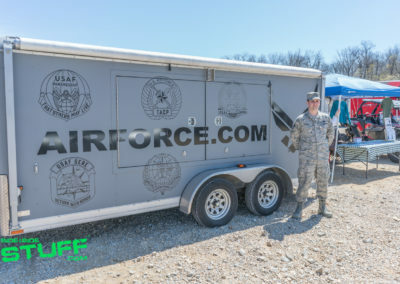 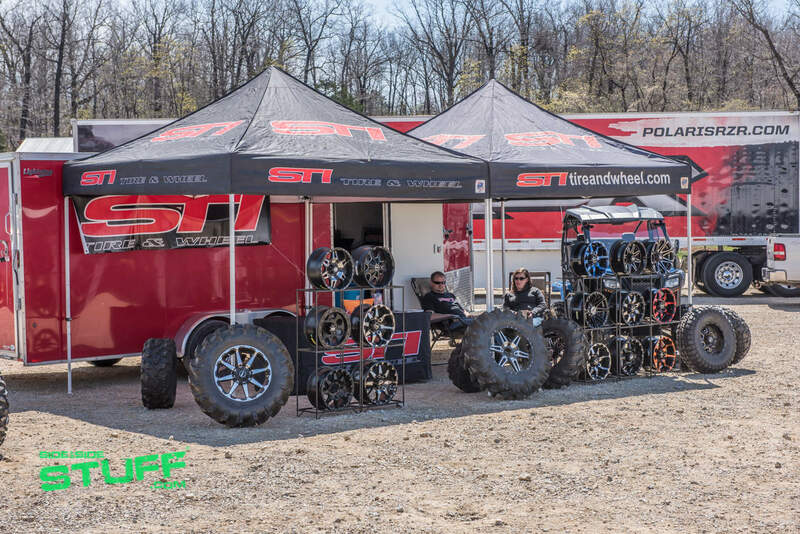 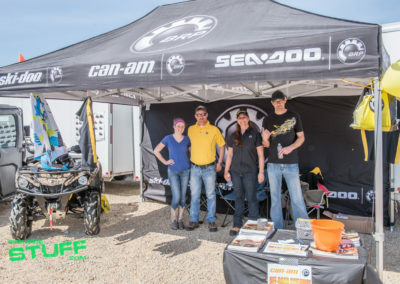 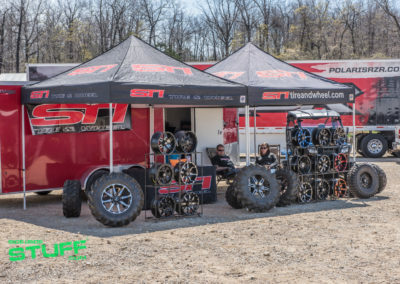 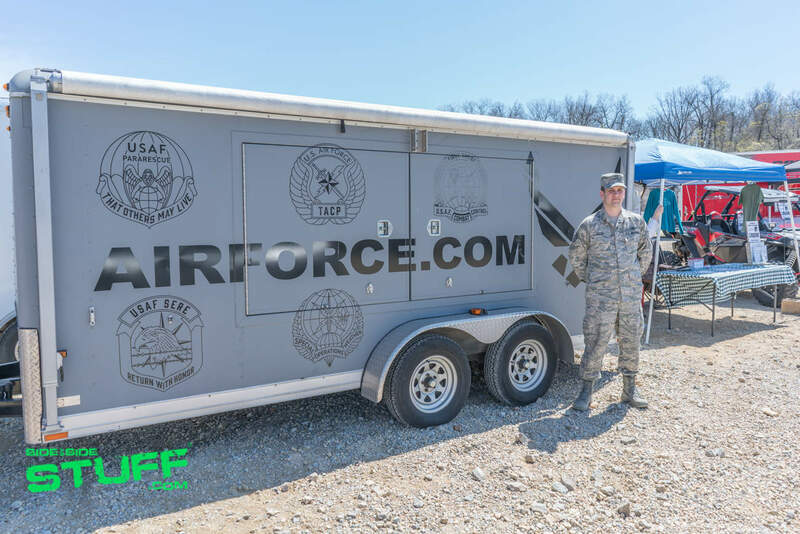 Local reps for Can Am were on hand as well as our United States Air Force; even some of our favorite aftermarket companies like STI Tire and Wheel, Pro Armor and MB Quart were present. 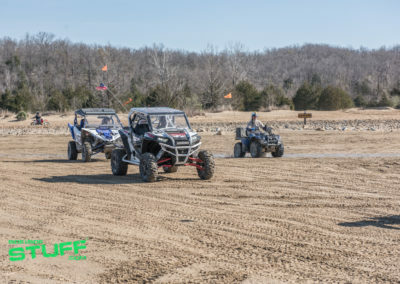 St. Joe State Park is about 70 miles south of St. Louis nested between the towns of Park Hills and Farmington. 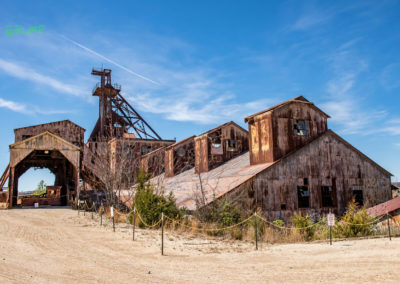 The 8,200 acre park is home to an old historic mine site, old mill buildings where they once processed lead ore still stand. 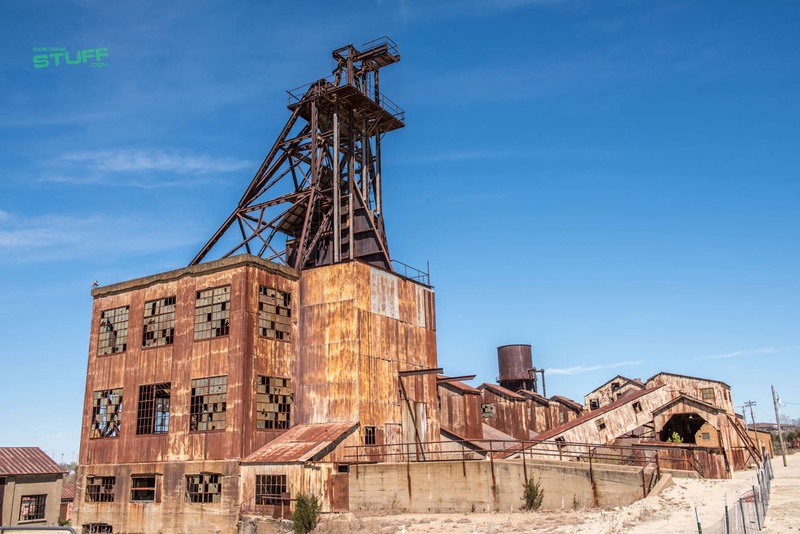 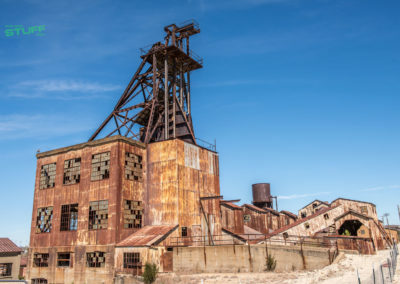 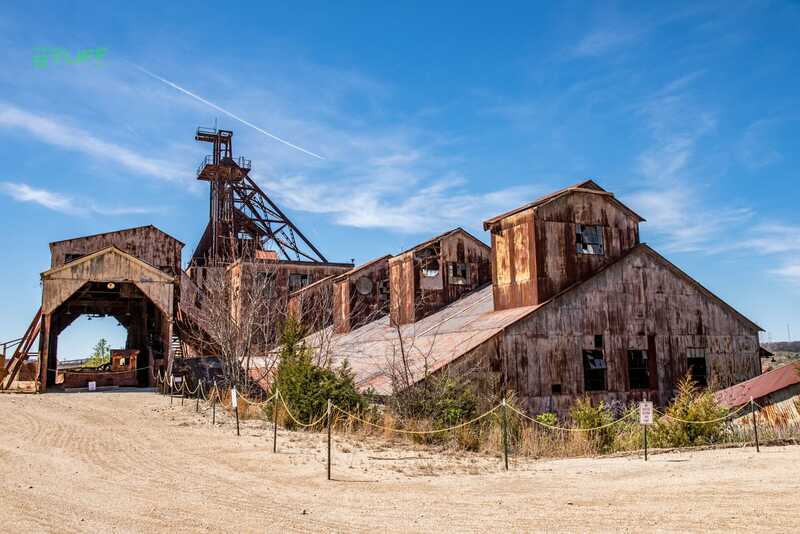 Designated as the Missouri Mines Historic Site, it is now a museum that houses a large collection of geological specimens and antique milling and mining equipment. 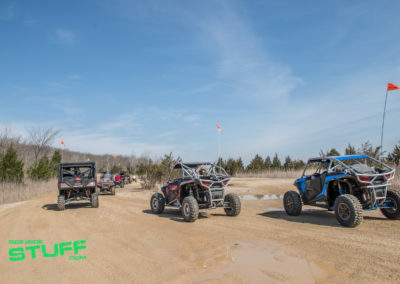 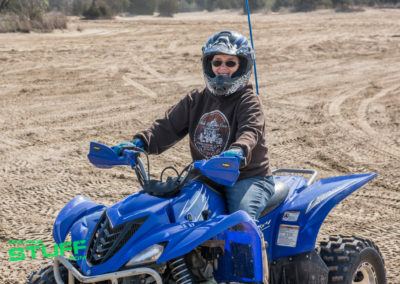 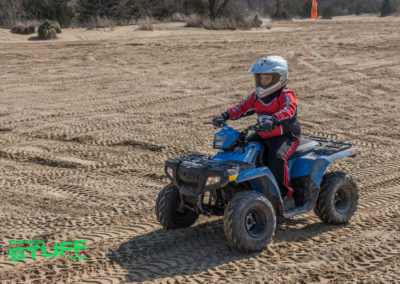 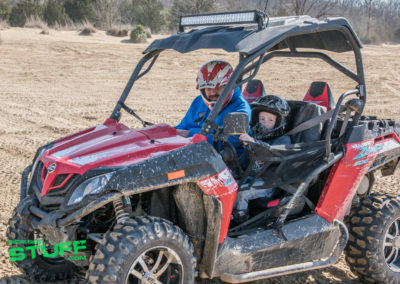 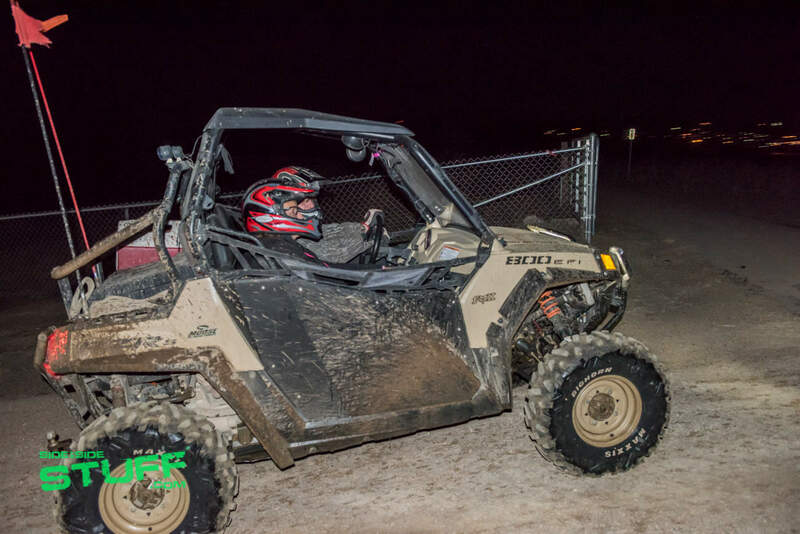 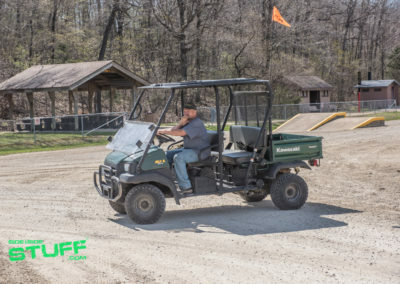 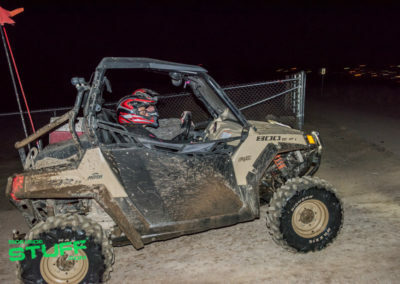 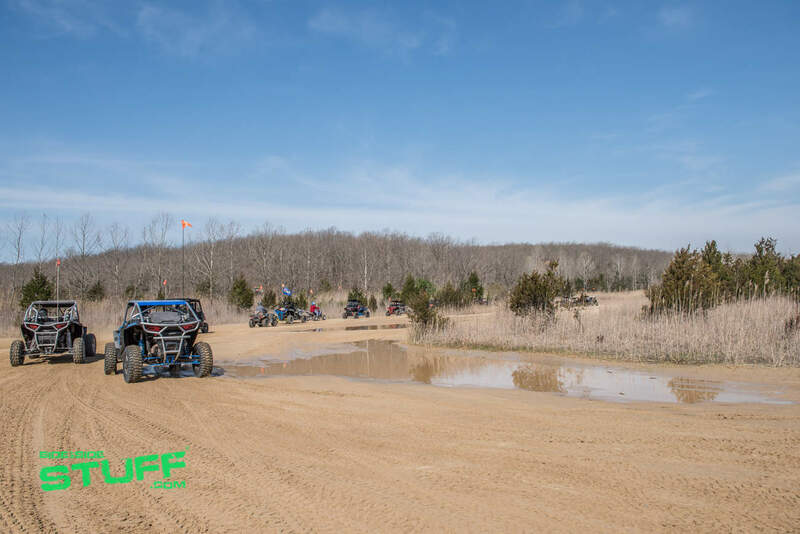 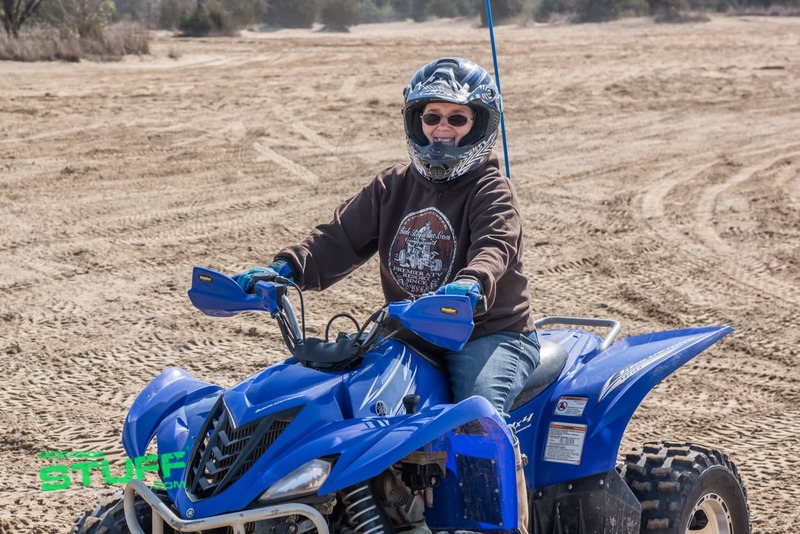 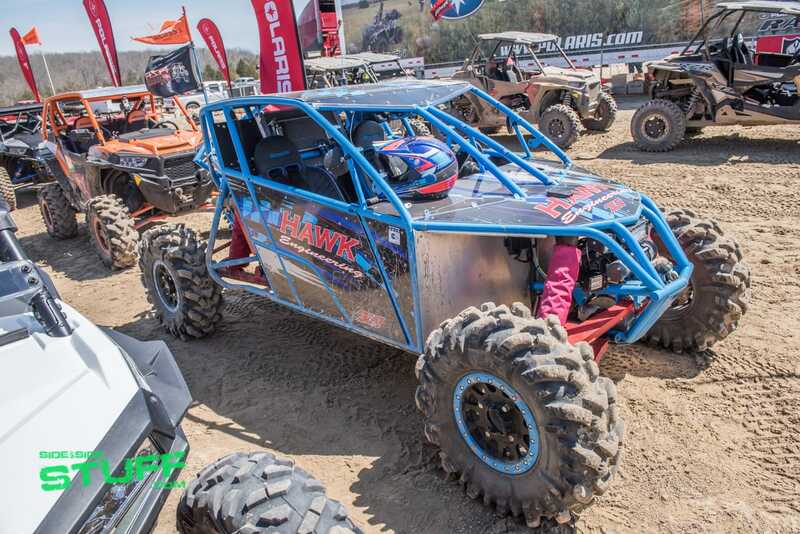 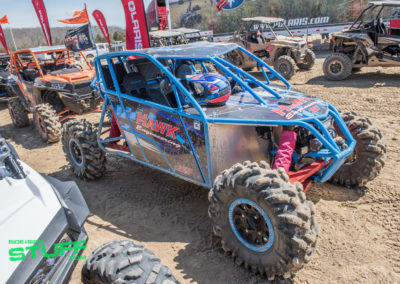 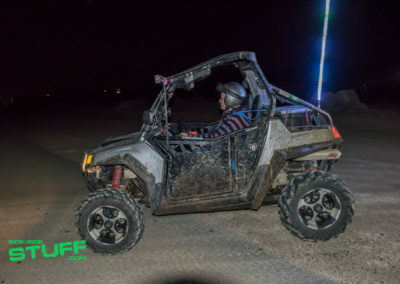 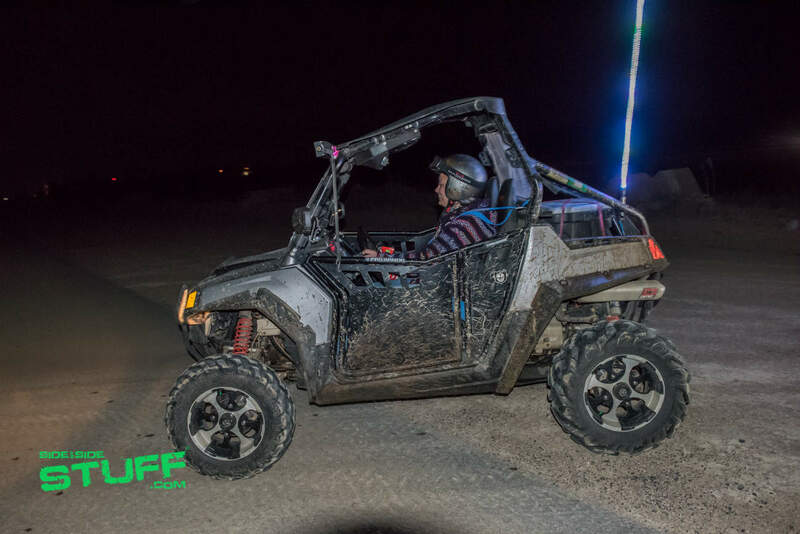 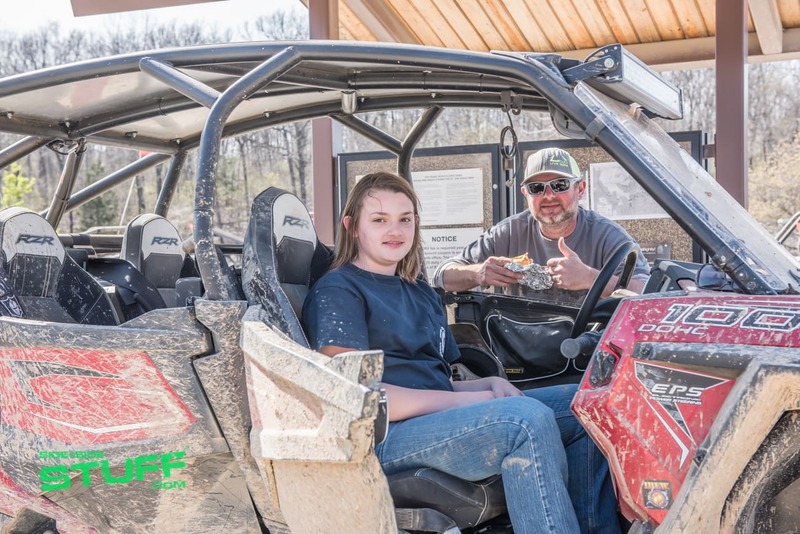 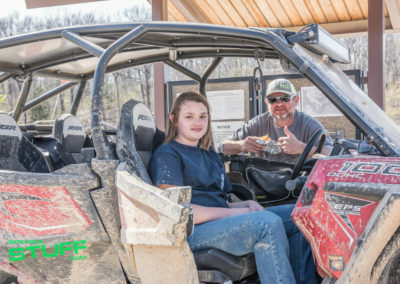 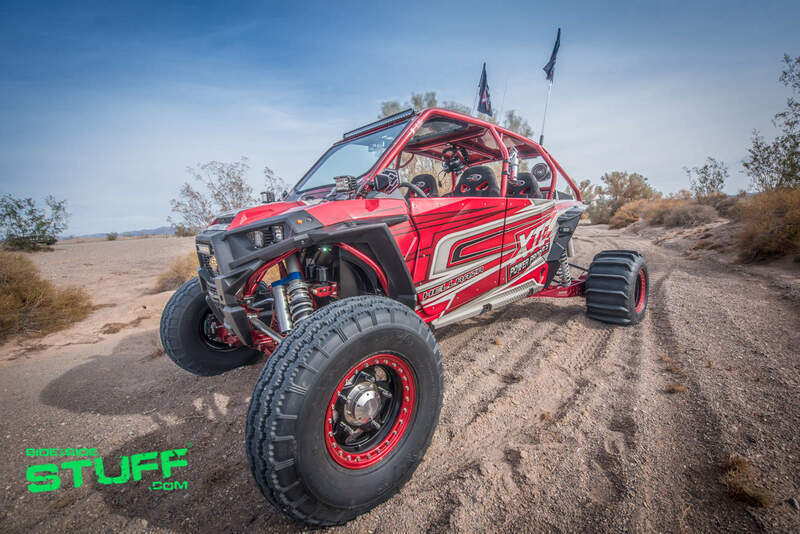 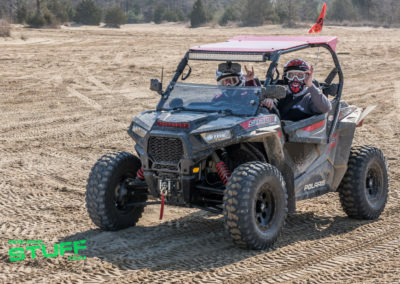 As for riding, the park offers 2,000 acres of ORV access which includes a variety of terrain, you can find just about anything from sand flats, heavily rocky areas, lake beds, creek crossings, hill climbs and an abundance of nicely groomed, winding trails. 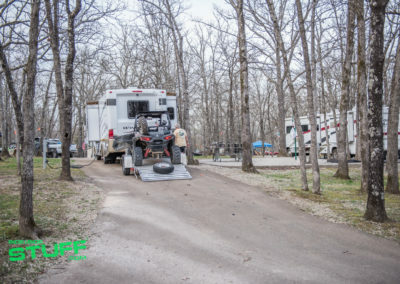 The park has nice campgrounds with electric hook ups, RV accommodations, shower houses, laundry facilities and a playground; there is even trail access right from the camp ground. 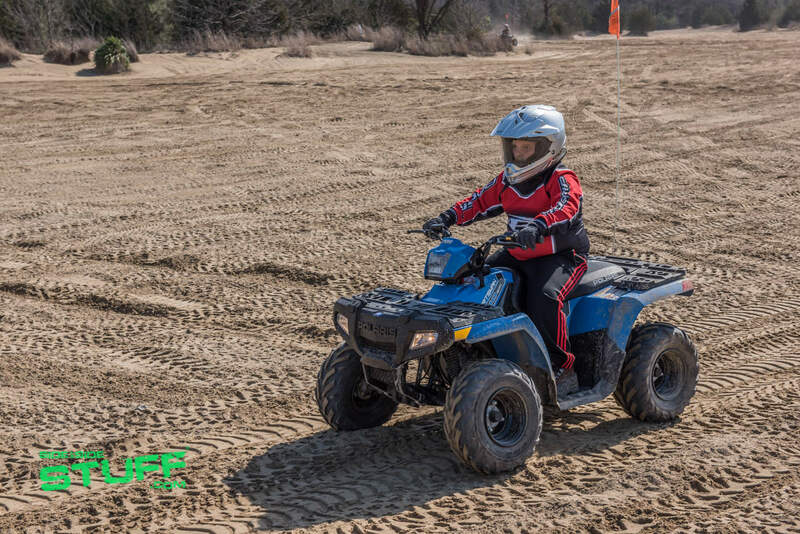 The park also boasts four lakes that are easily accessible and has excellent swimming beaches. 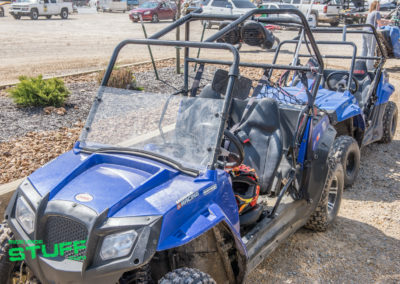 You’ll also find well maintained modern restrooms and several picnic areas. 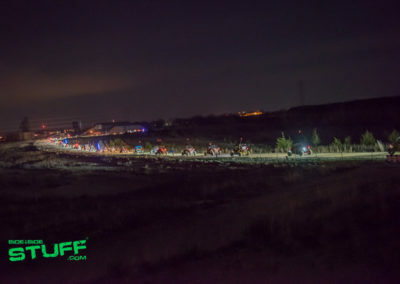 Rally at the Mines was definitely an amazing event, epic riding, great people and plenty of fun for the whole family. We highly recommend that you mark this event on your bucket list, tune in to the Rally at the Mines Facebook page for notifications about next year’s event. 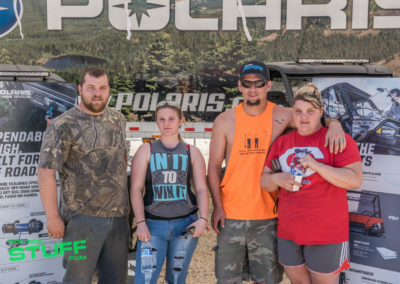 You should post a link to the charity to help the “young man” get his service dog. 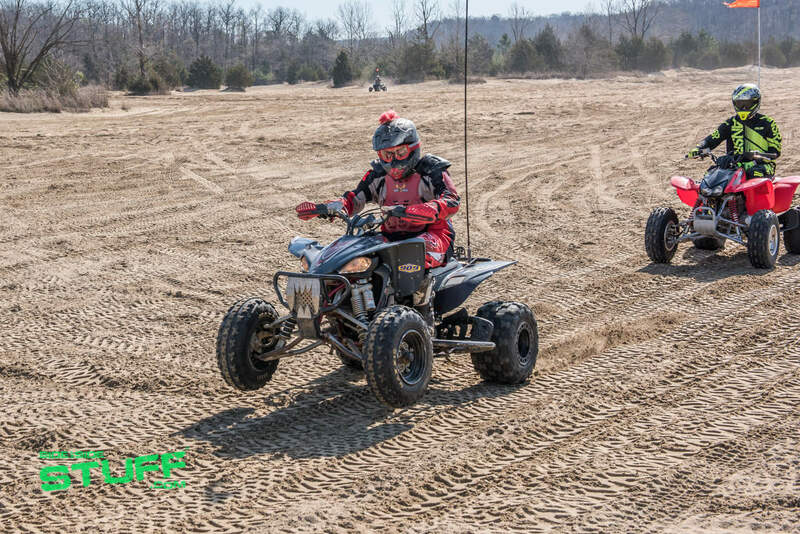 St.Joe is AMAZING! 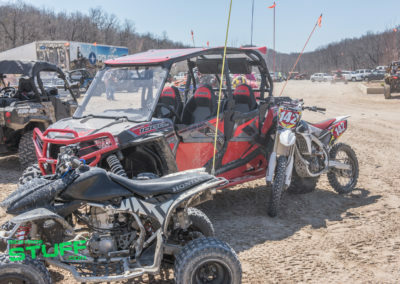 I road there back in the late late ’80s when the BIG high climb still existed.